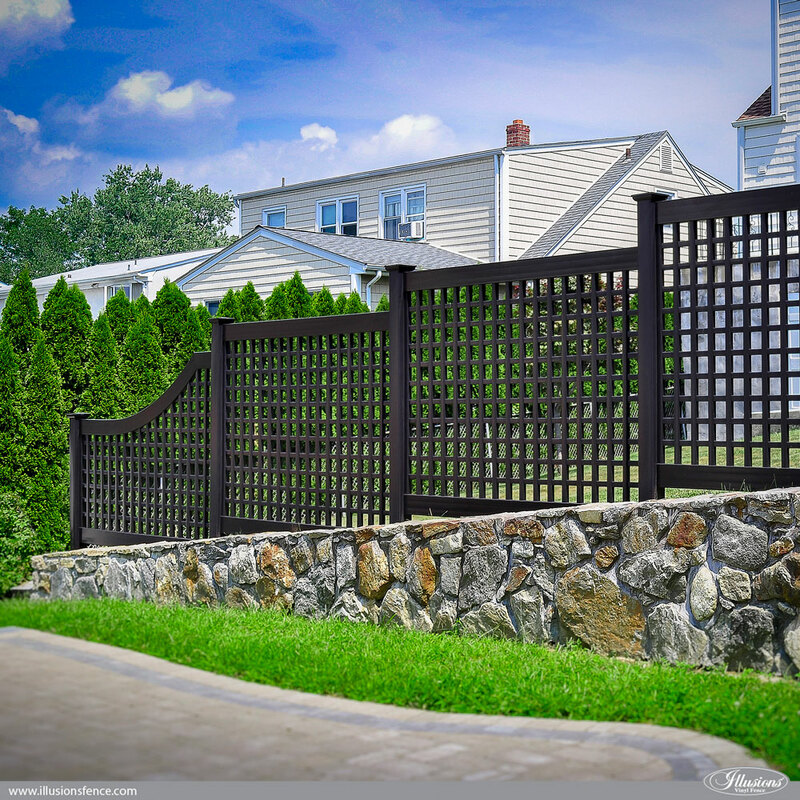 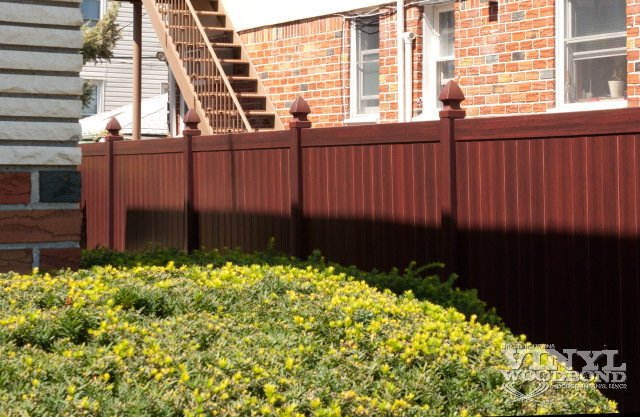 If you are looking to find some of the most amazing photos and images of PVC vinyl fence, you have come to the right place. 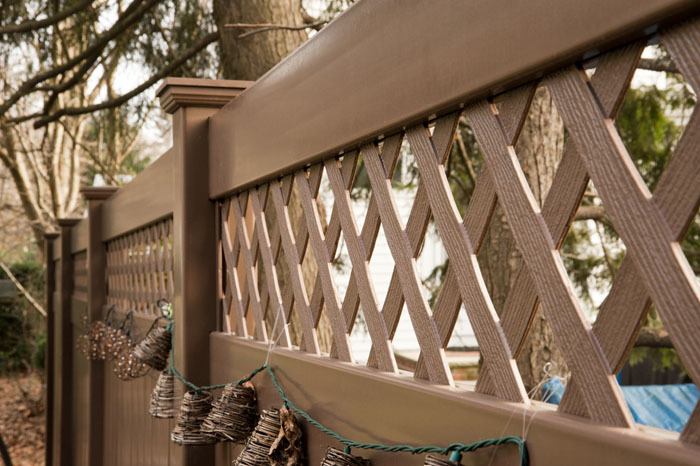 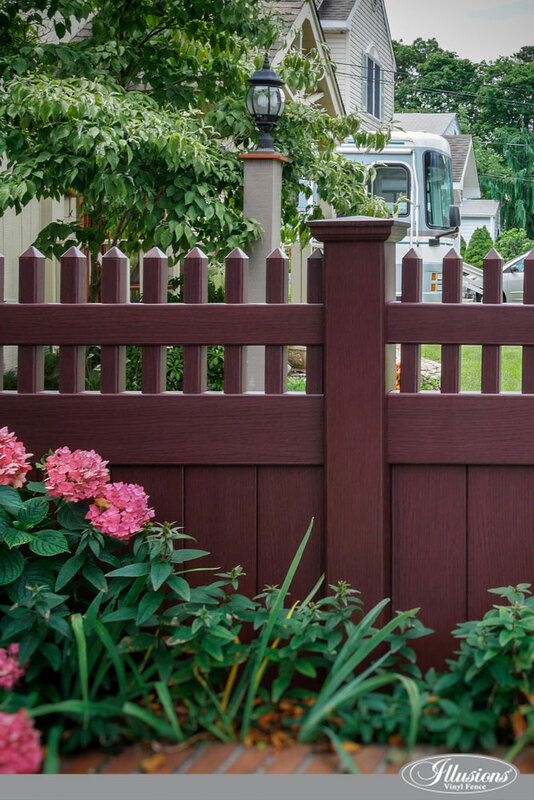 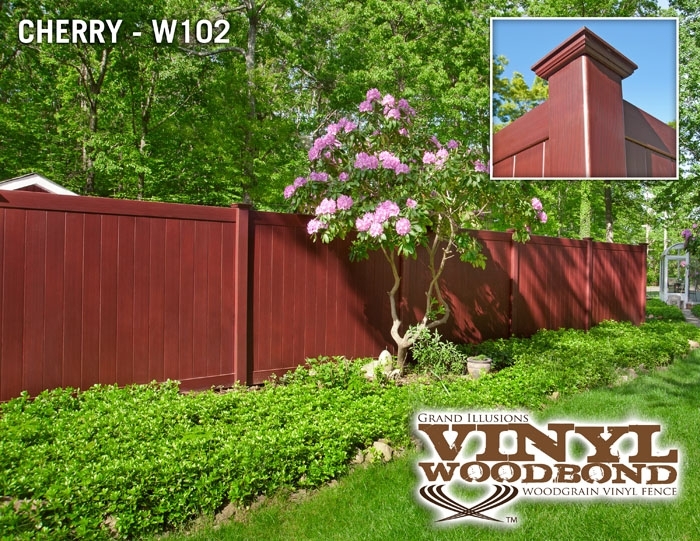 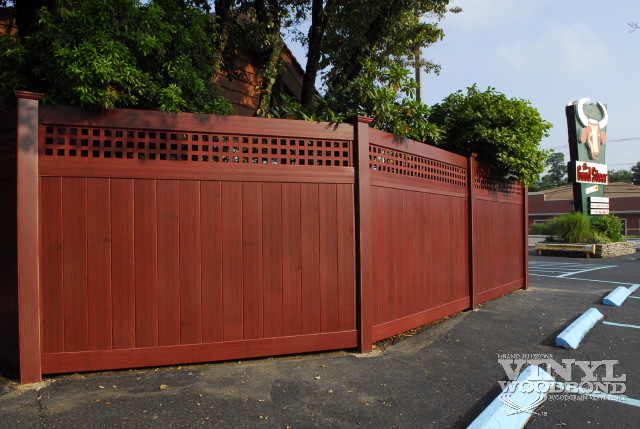 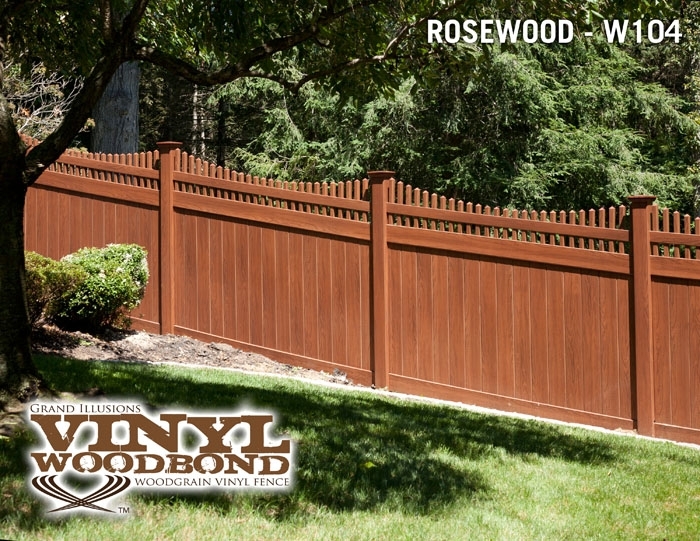 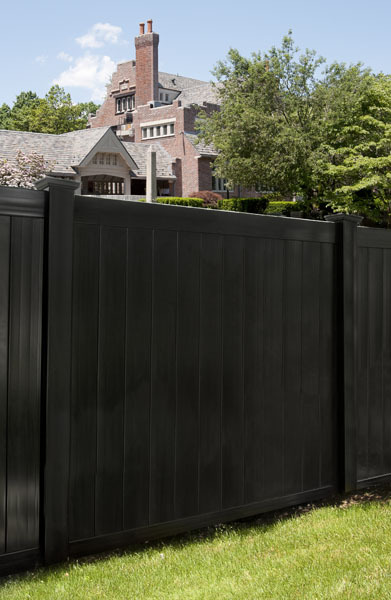 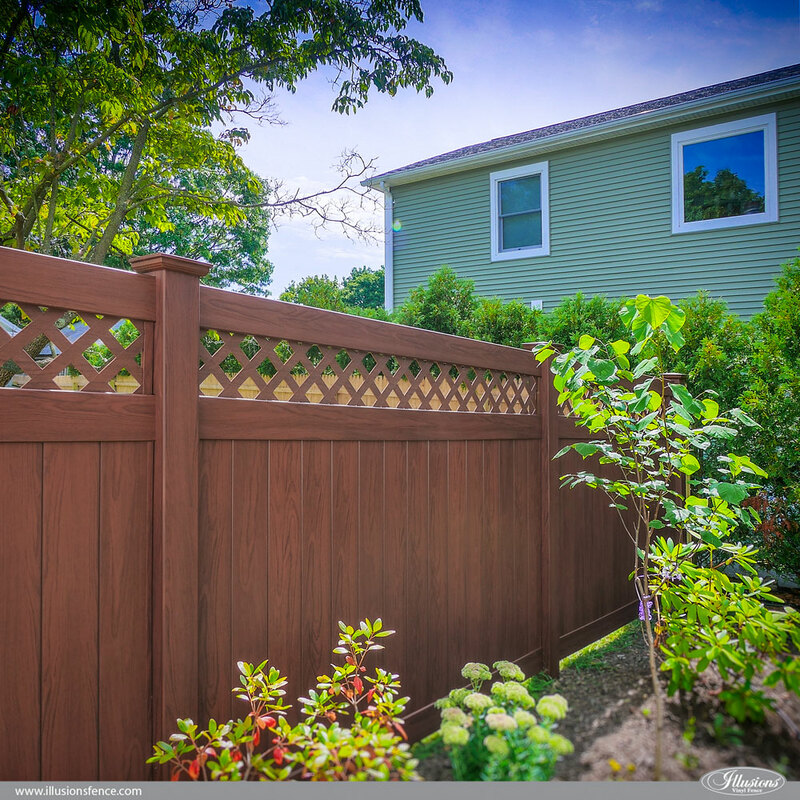 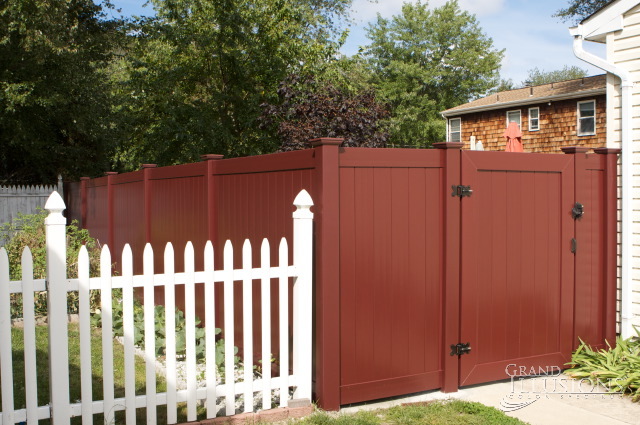 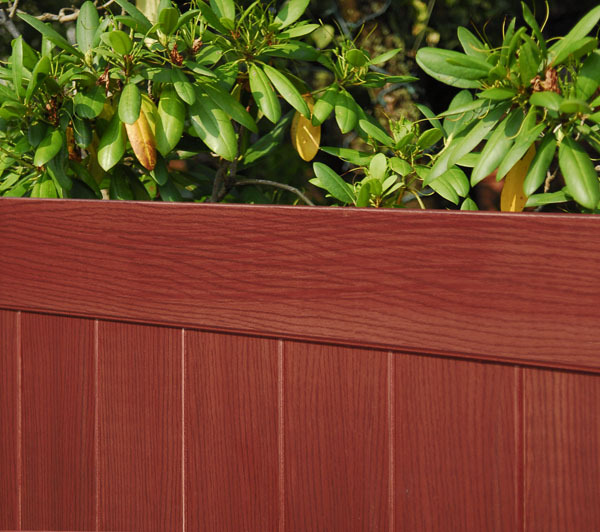 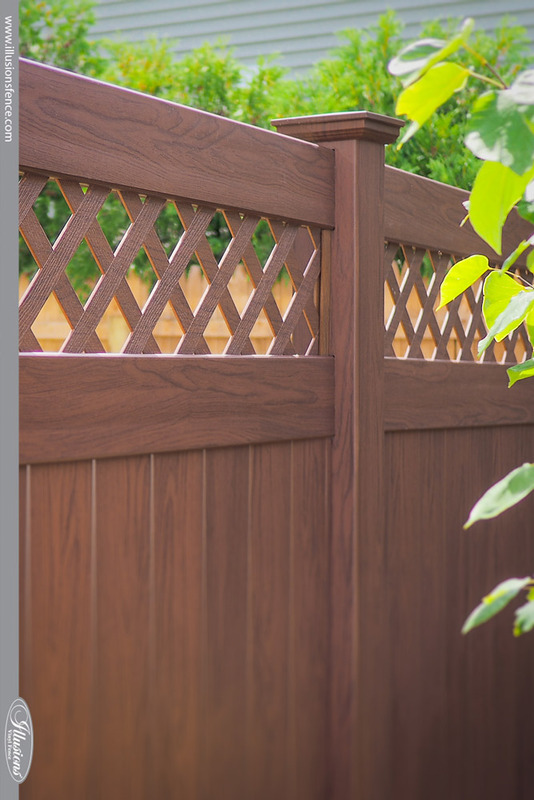 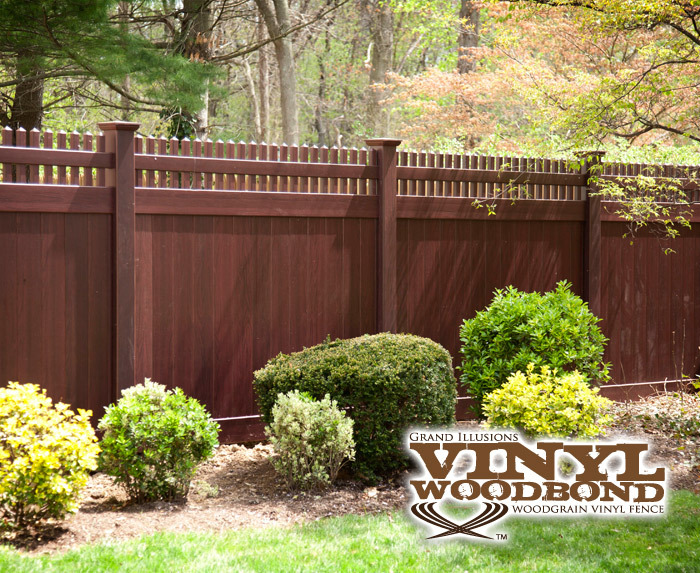 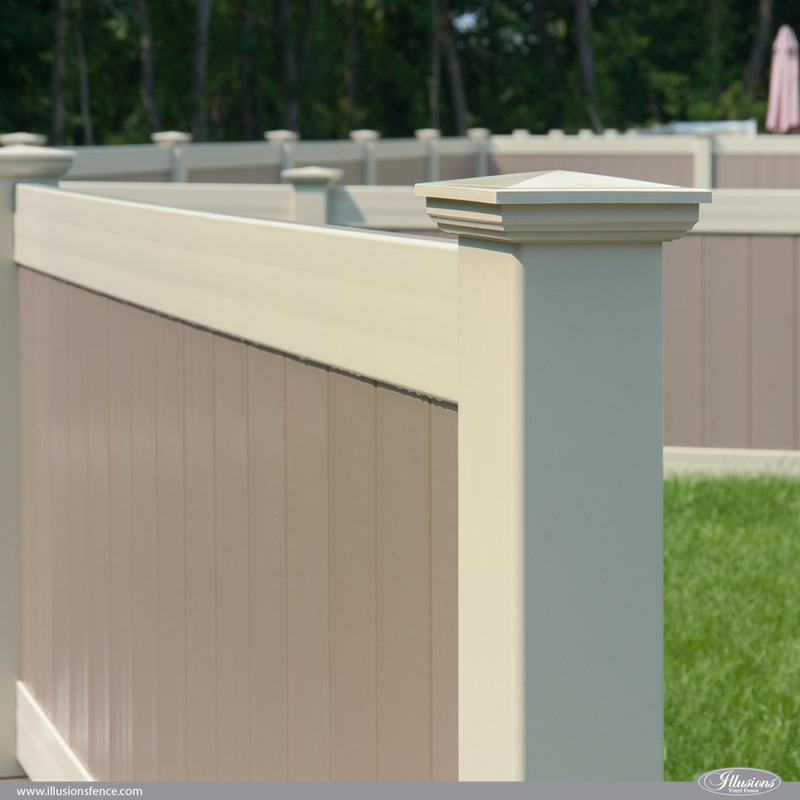 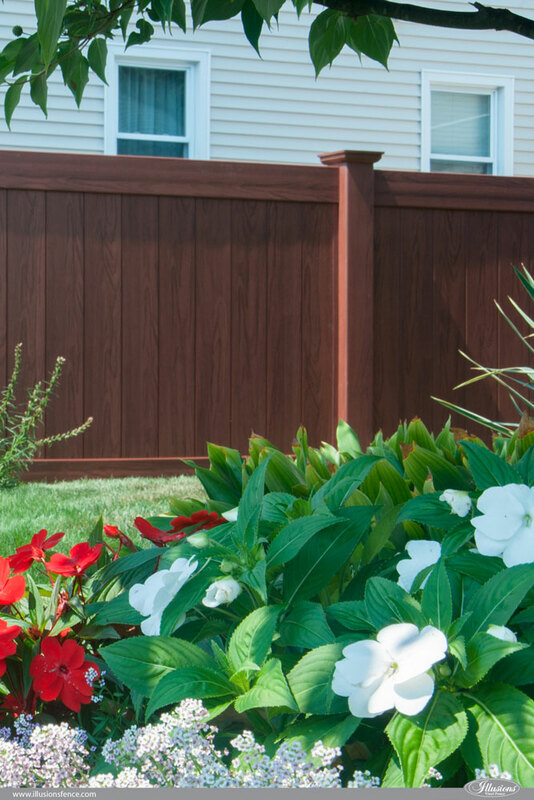 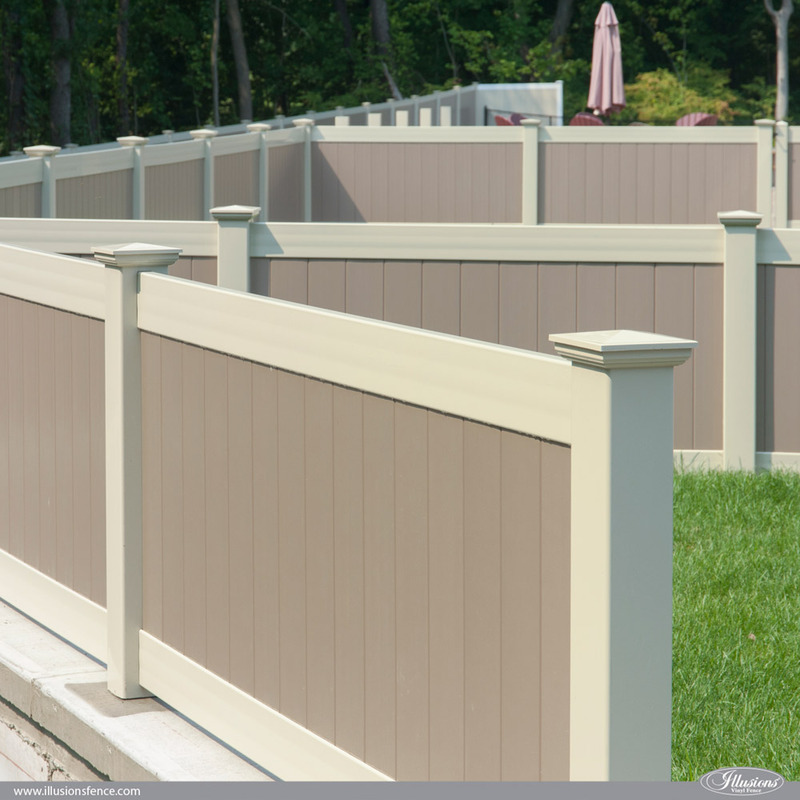 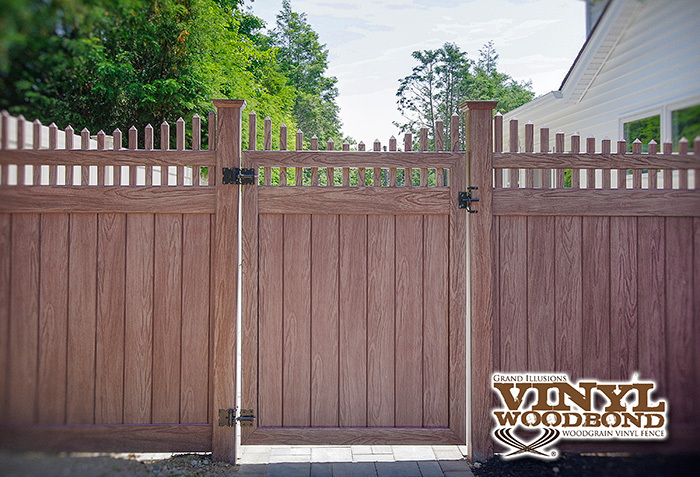 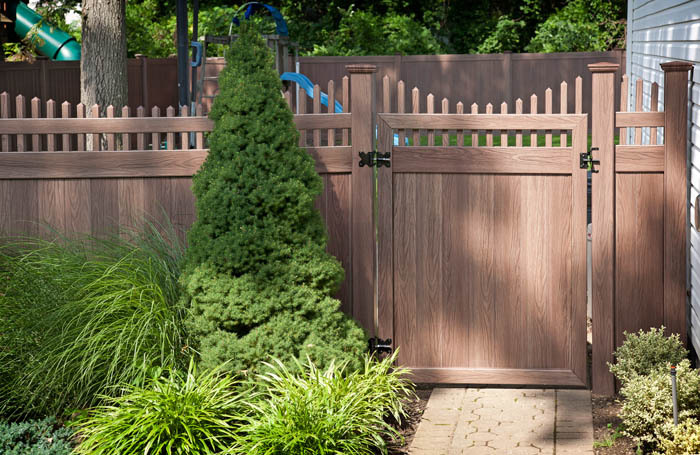 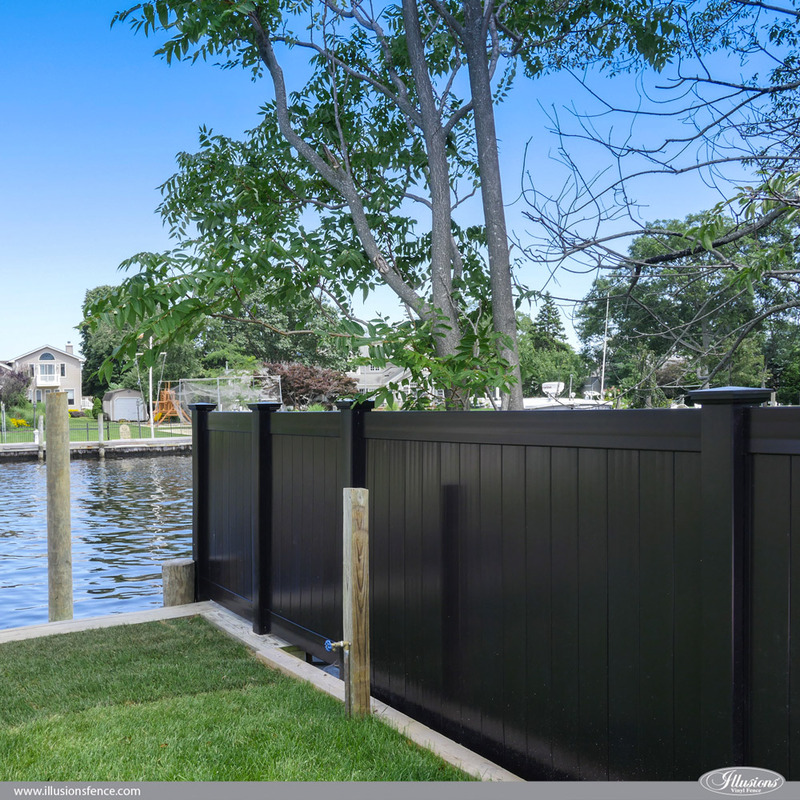 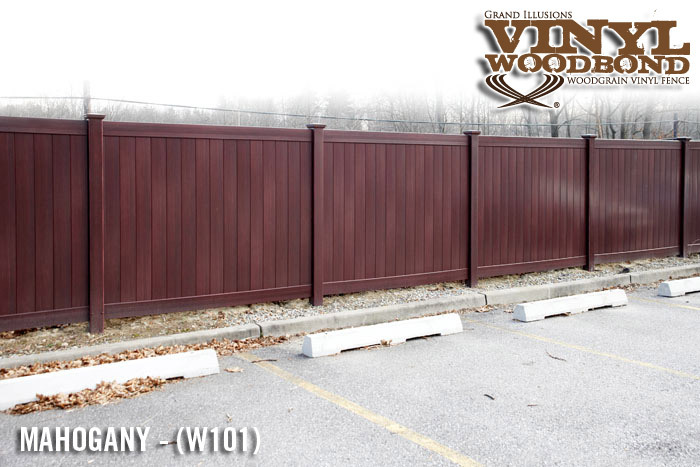 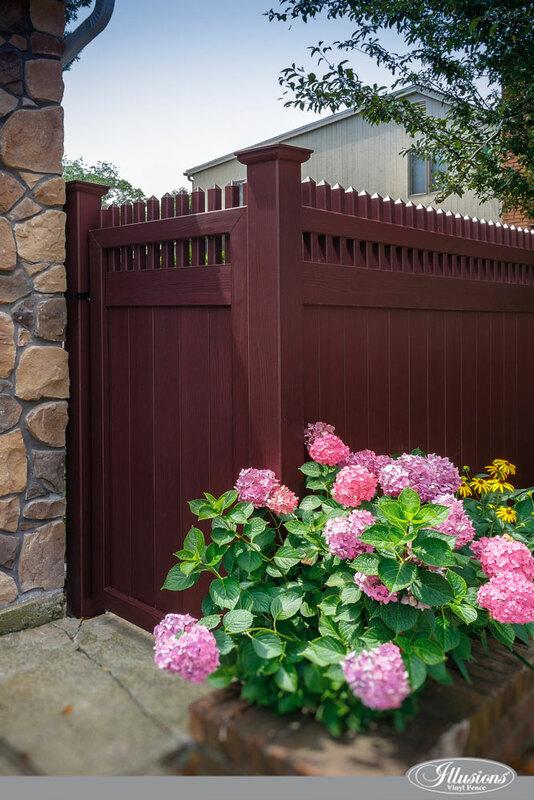 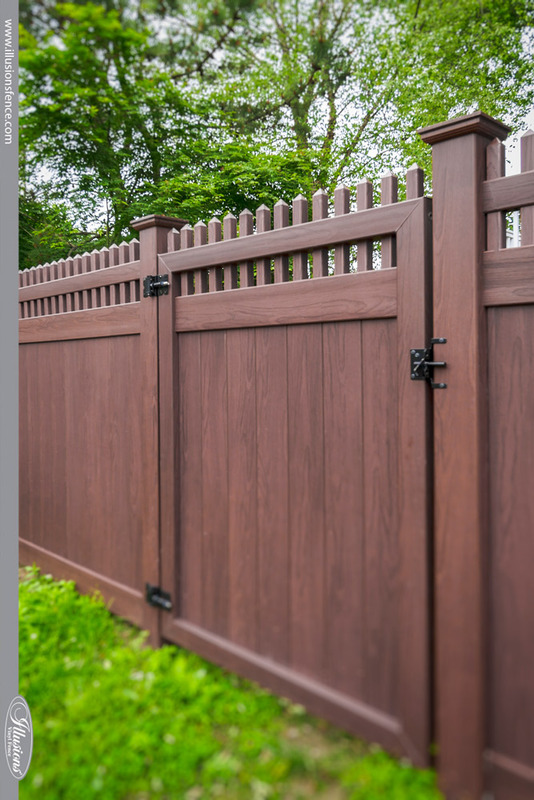 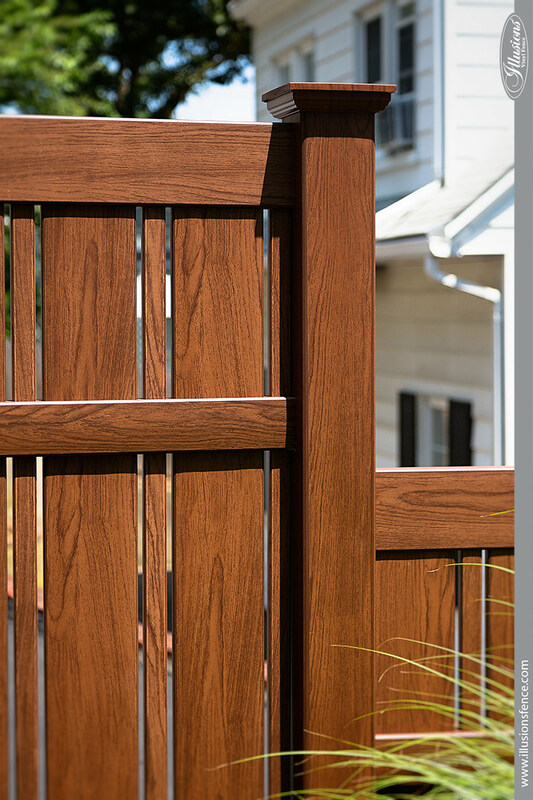 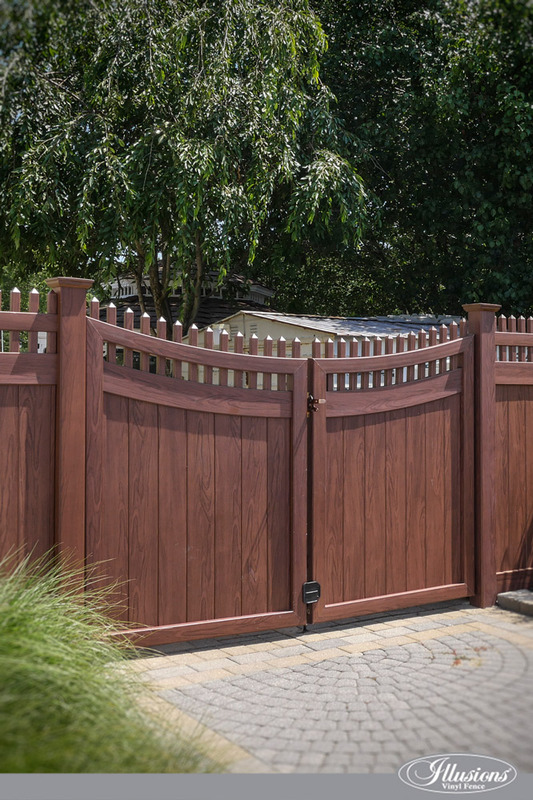 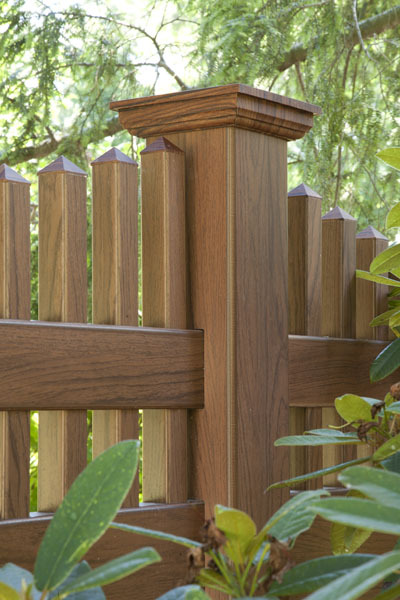 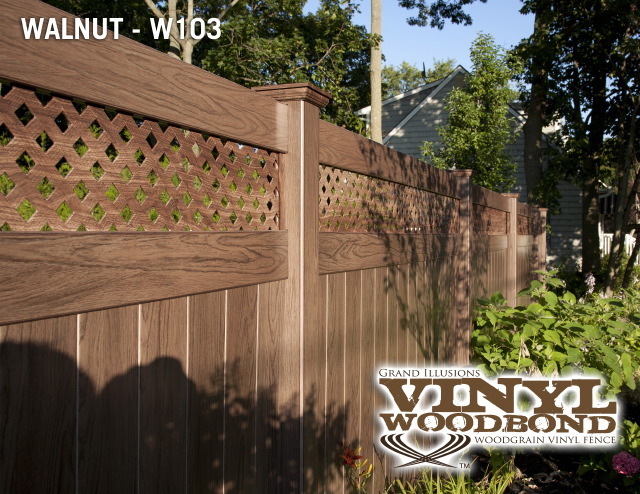 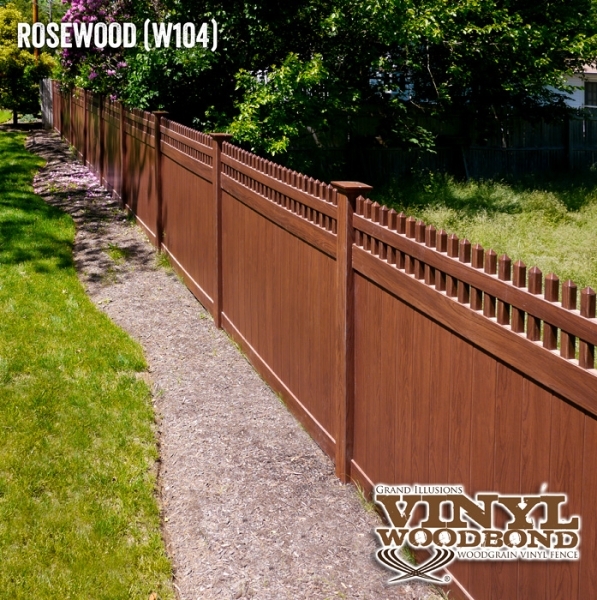 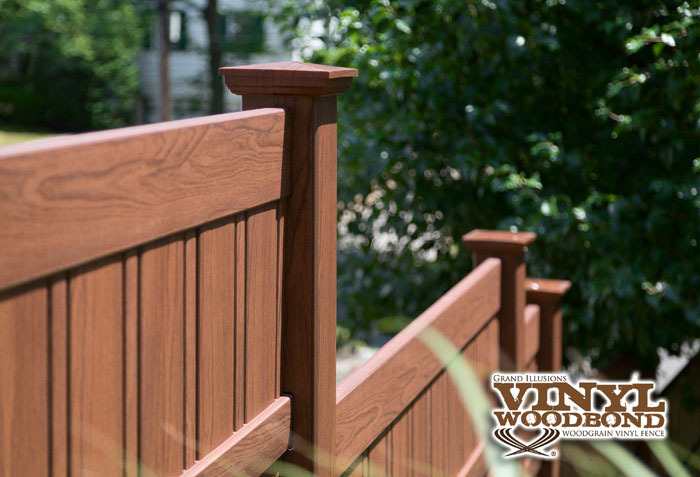 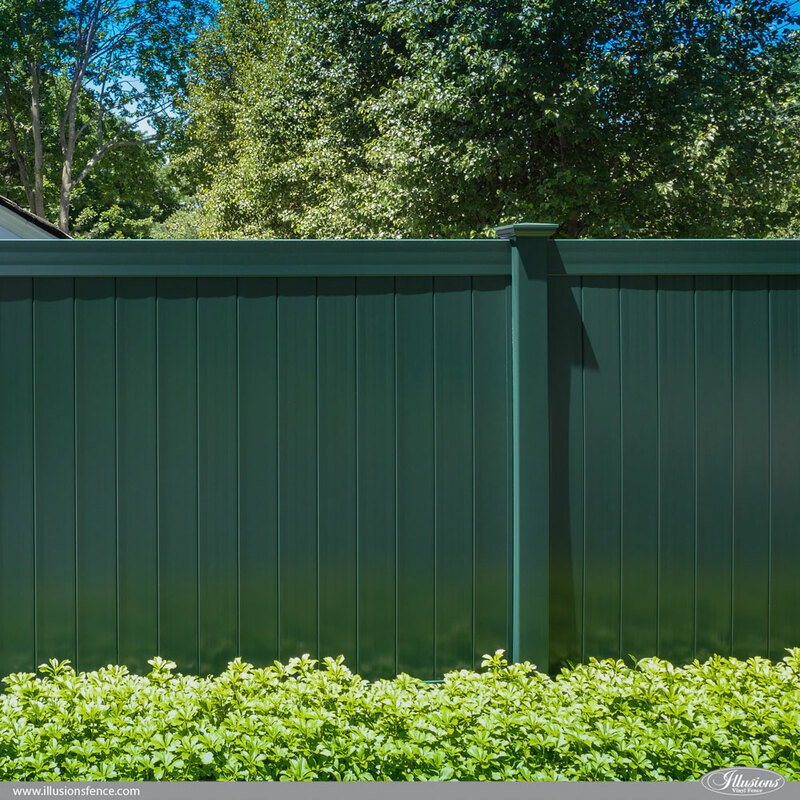 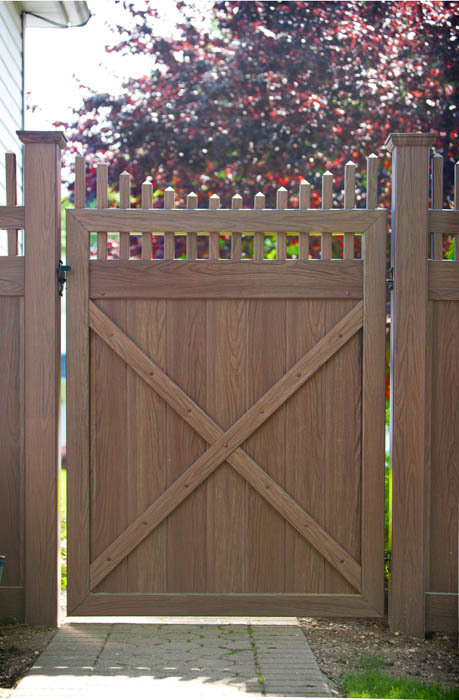 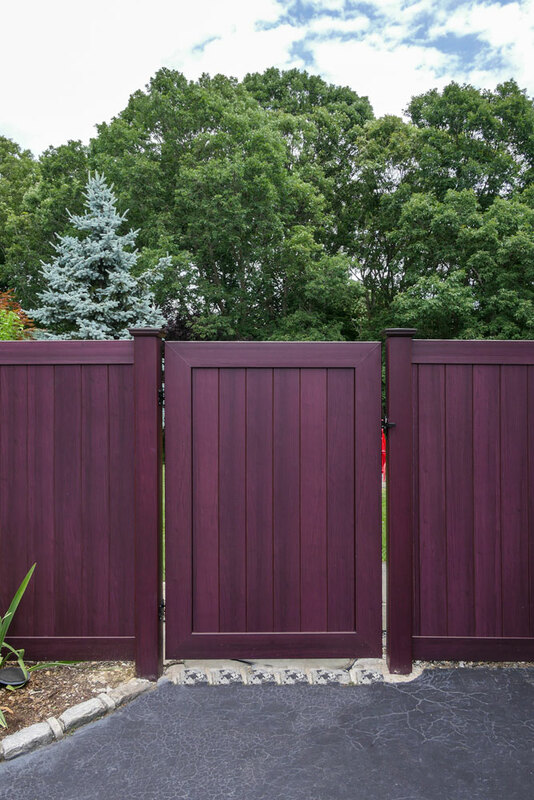 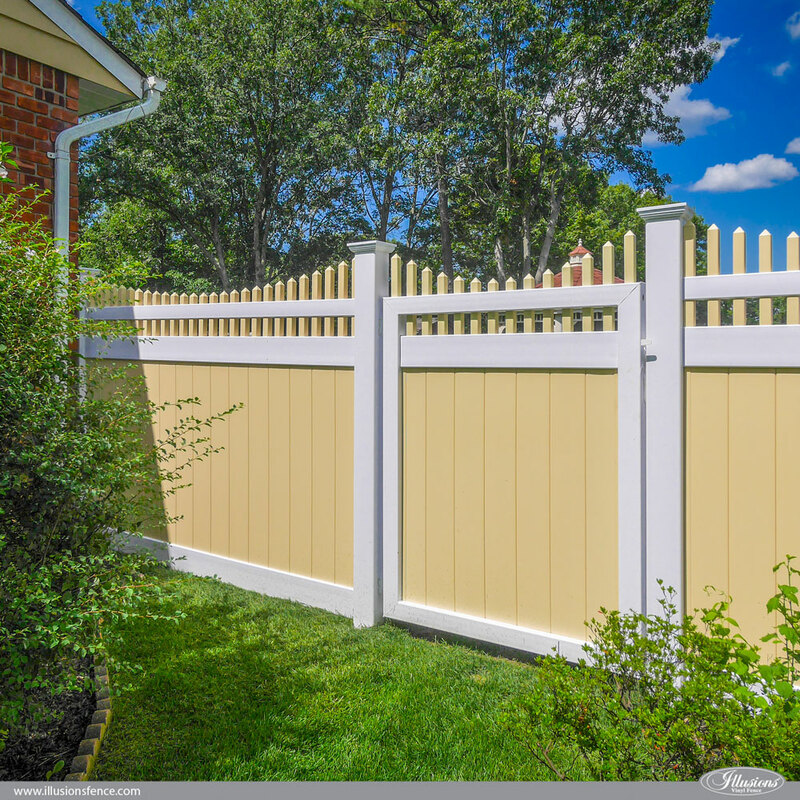 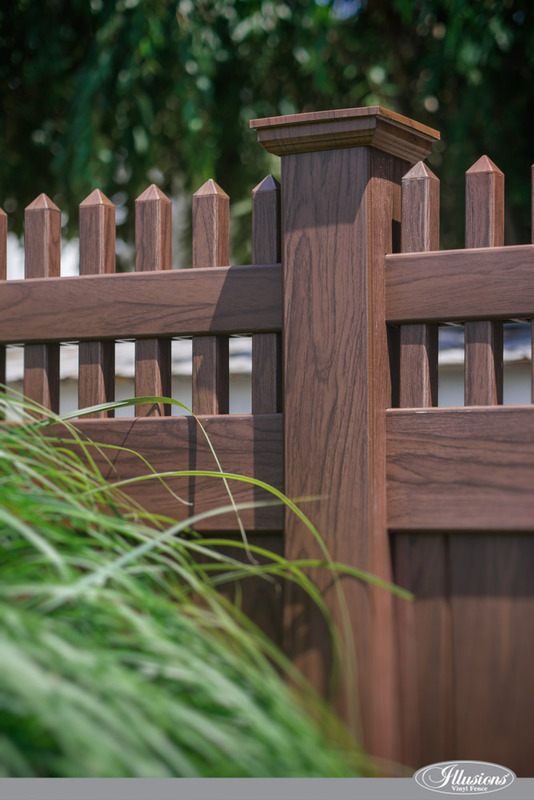 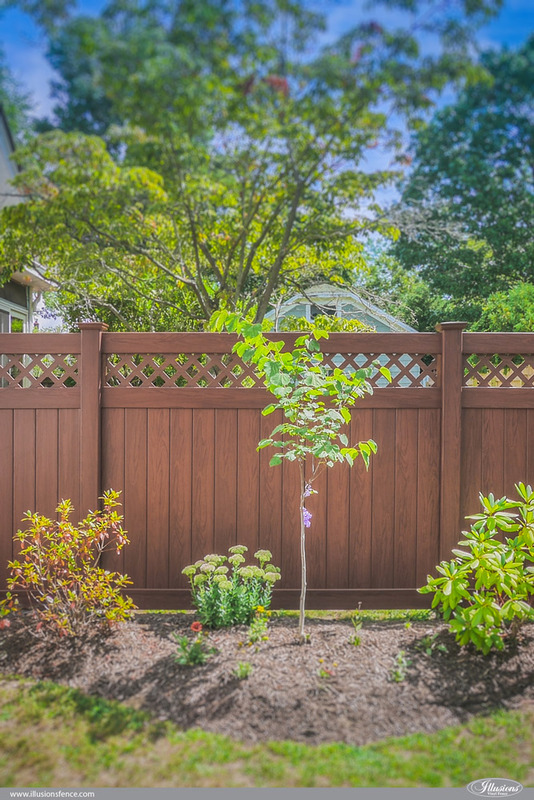 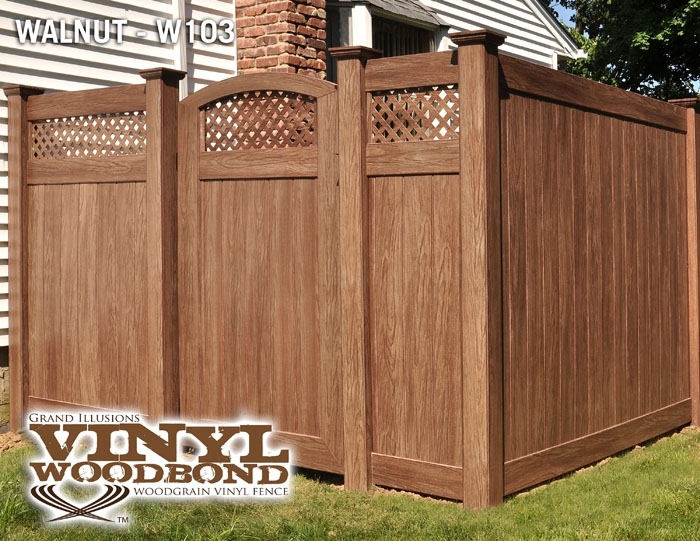 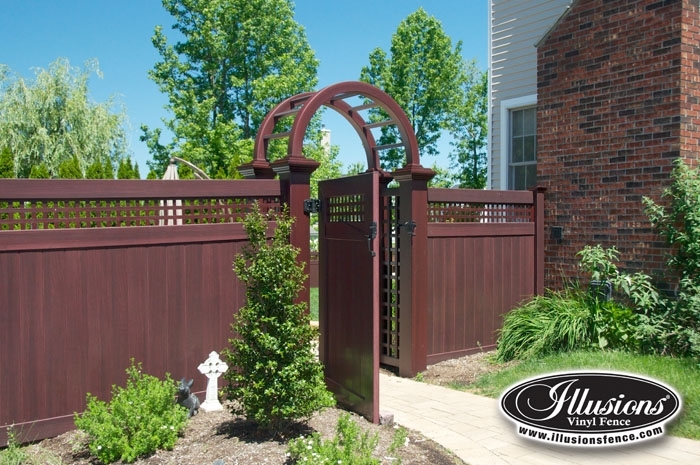 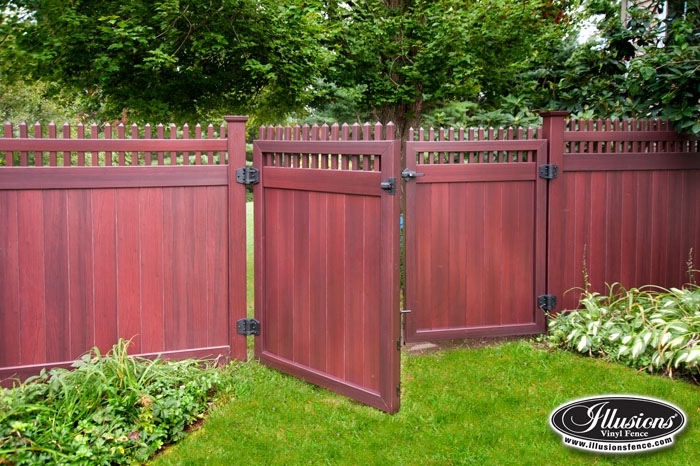 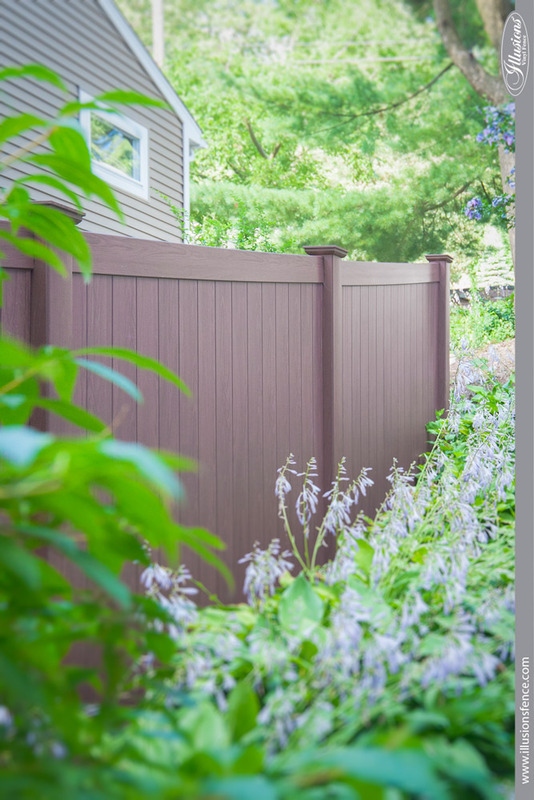 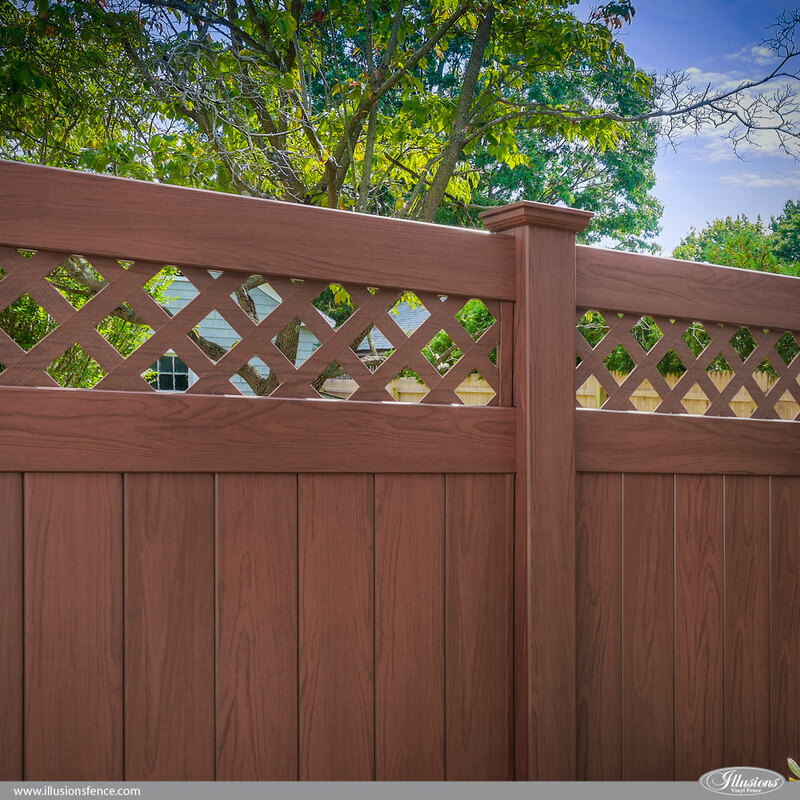 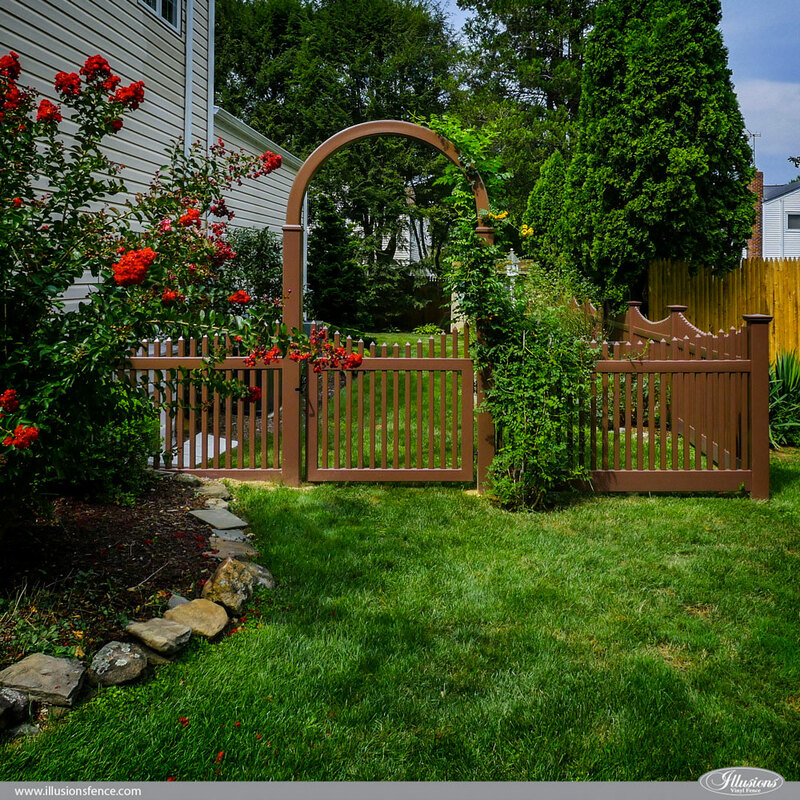 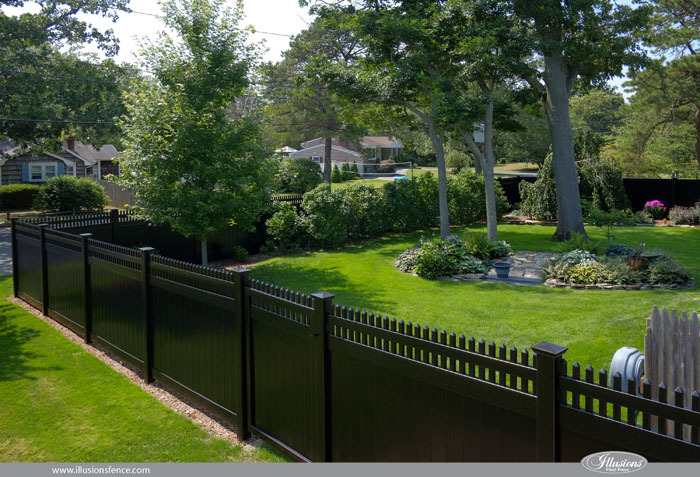 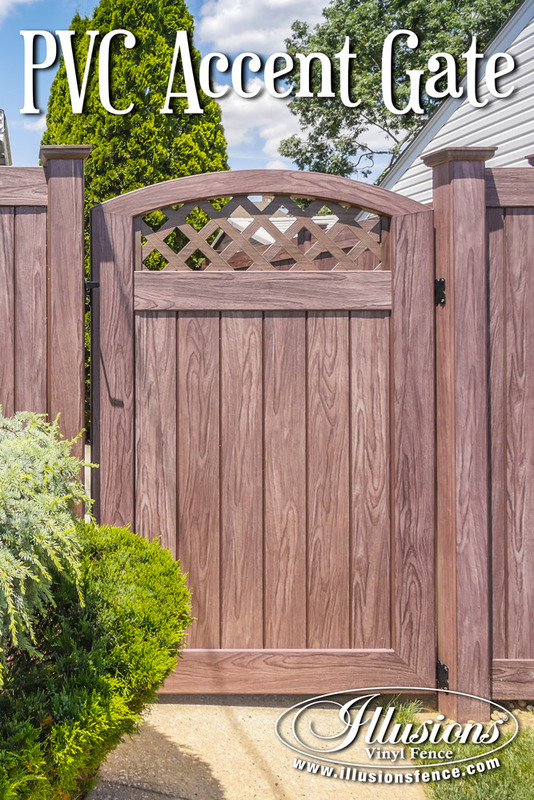 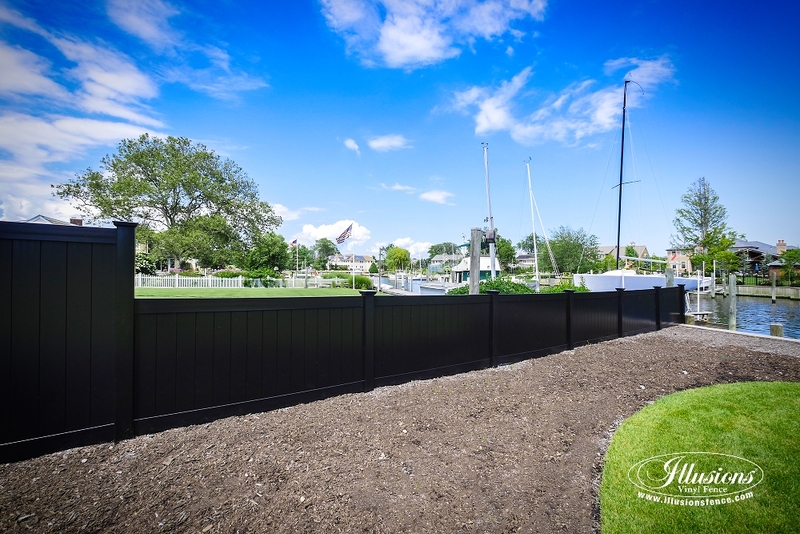 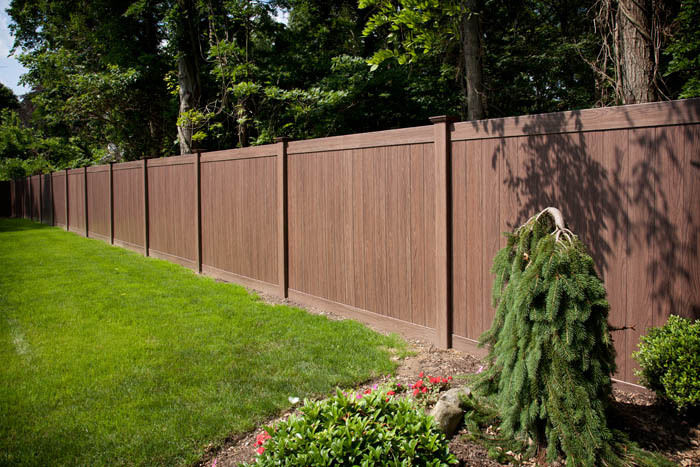 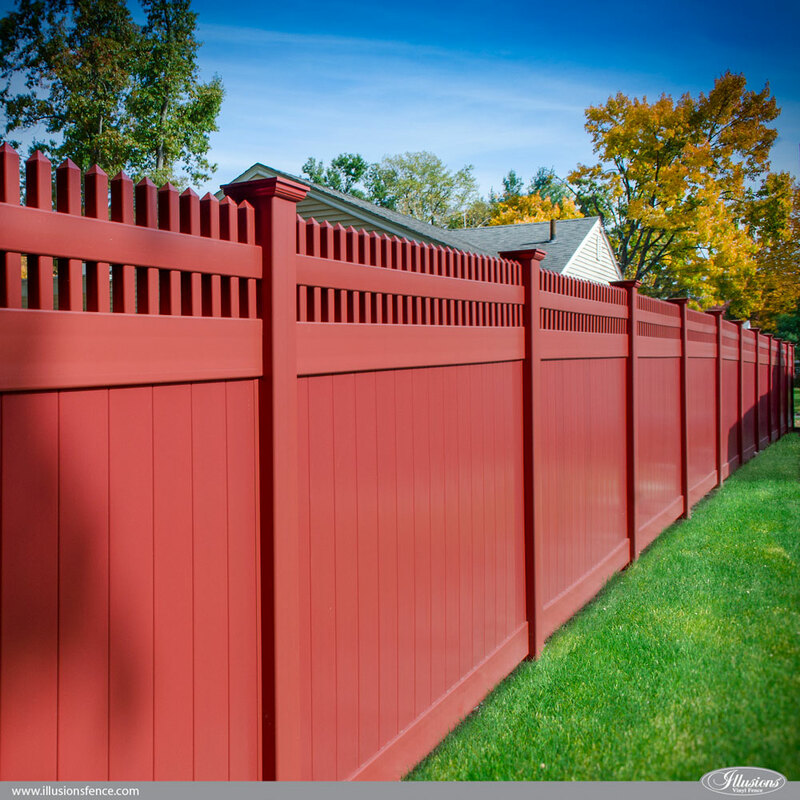 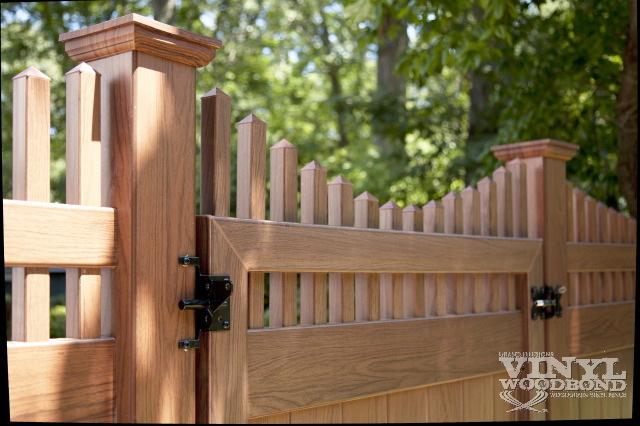 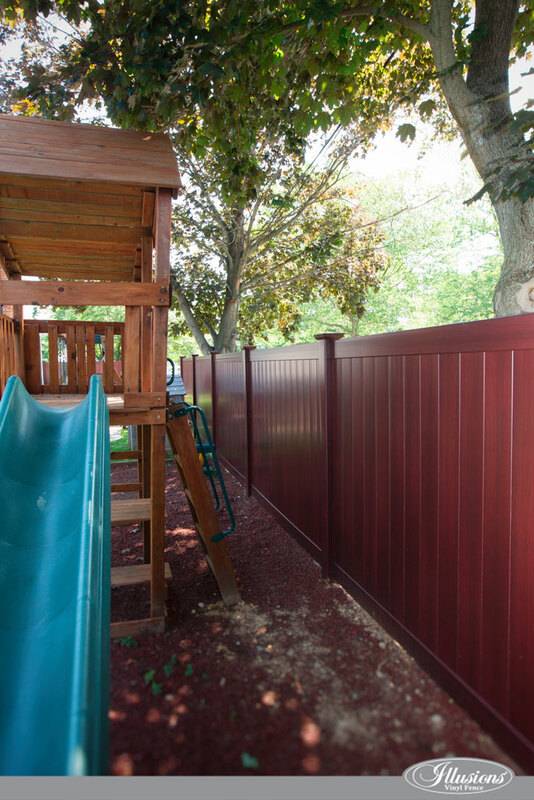 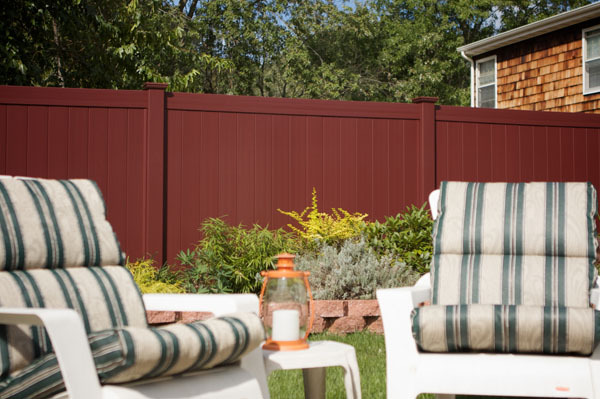 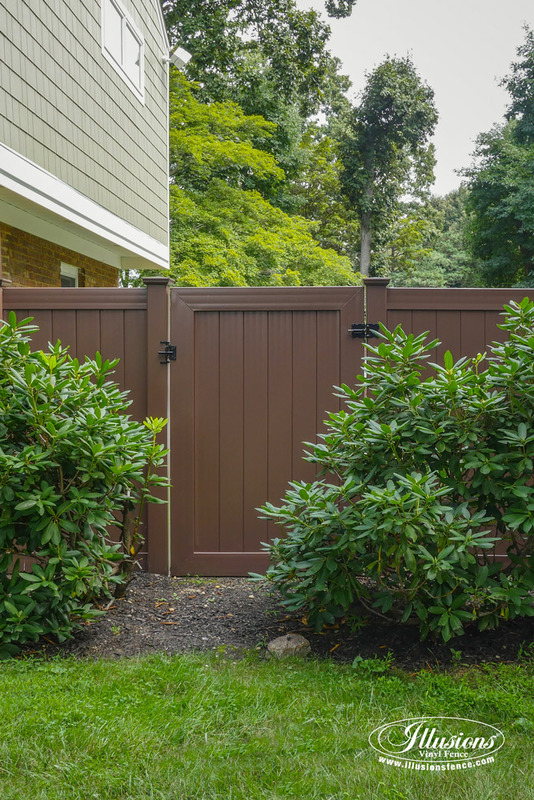 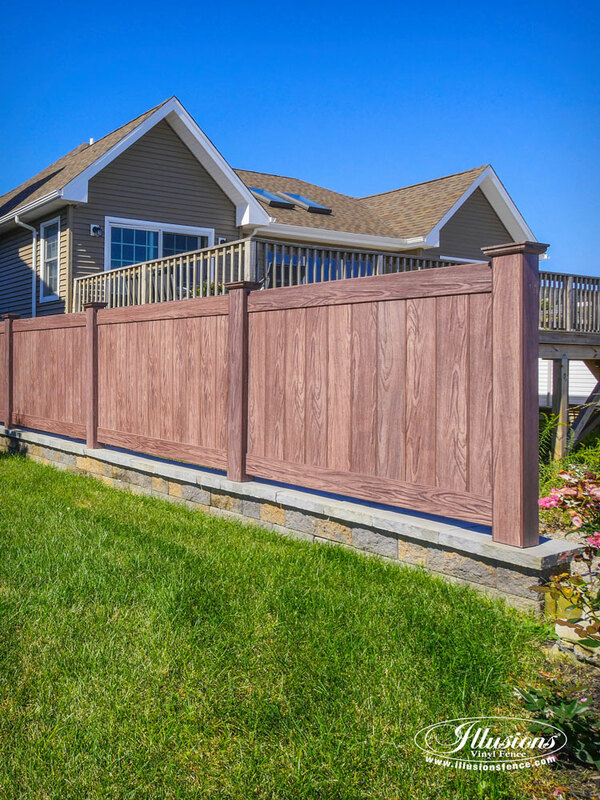 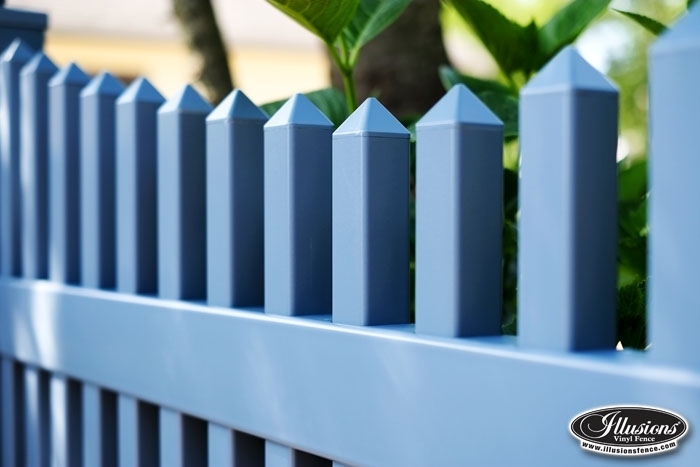 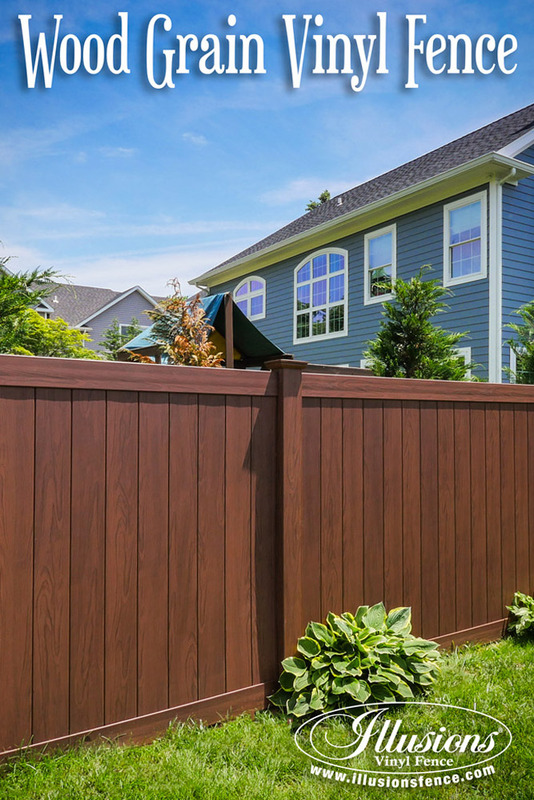 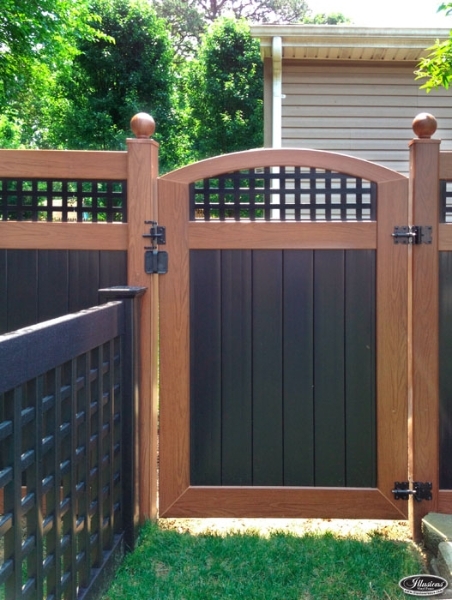 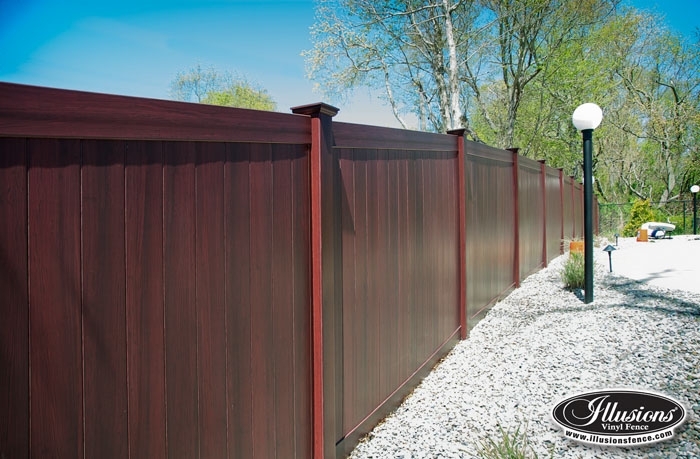 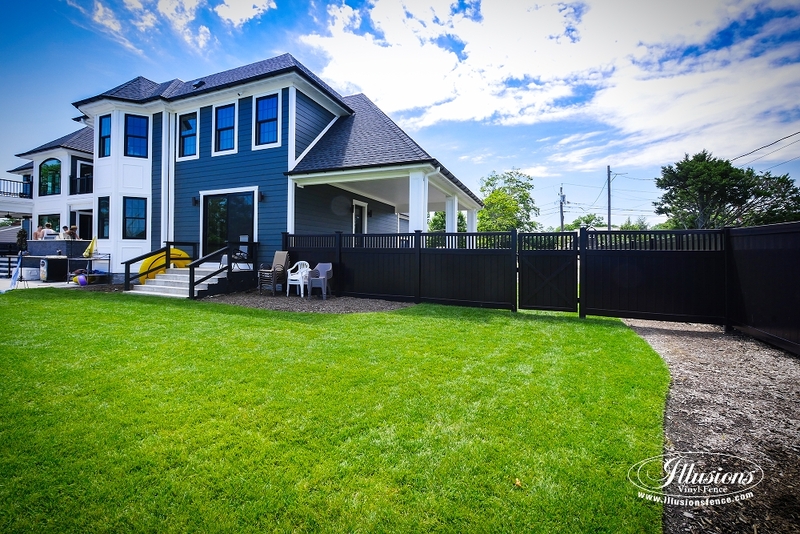 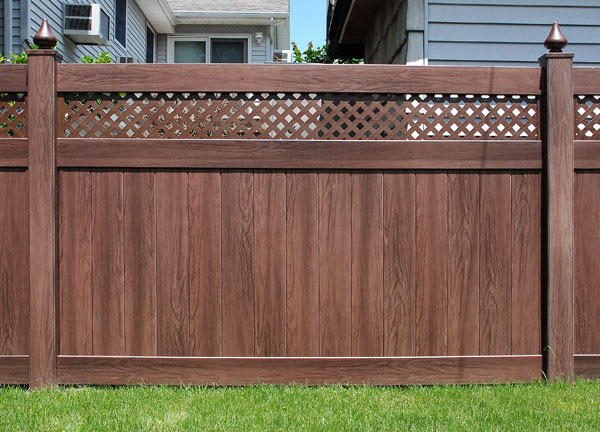 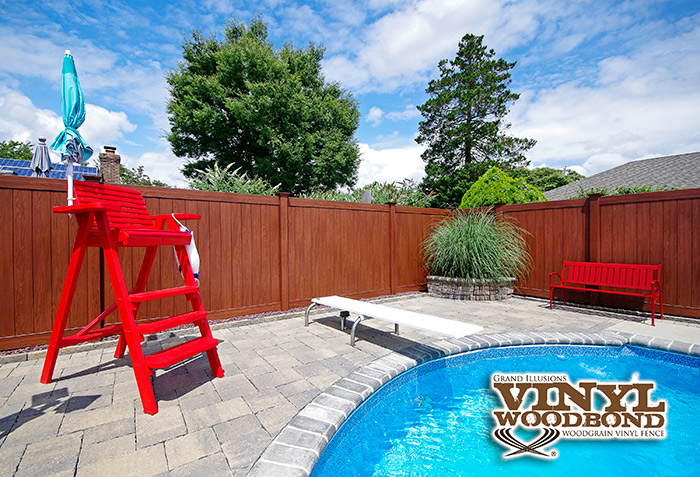 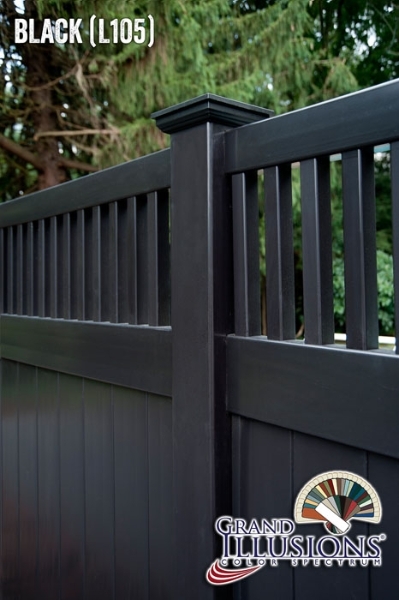 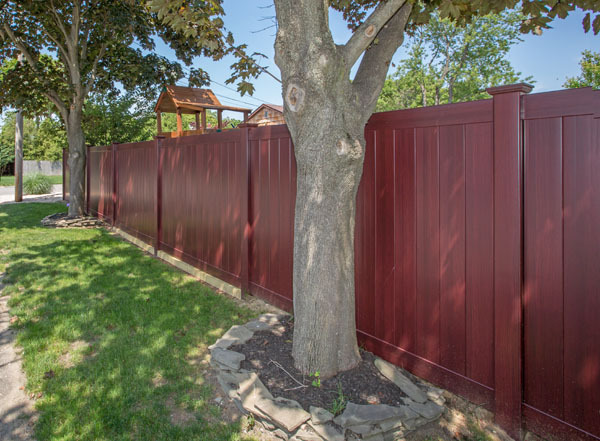 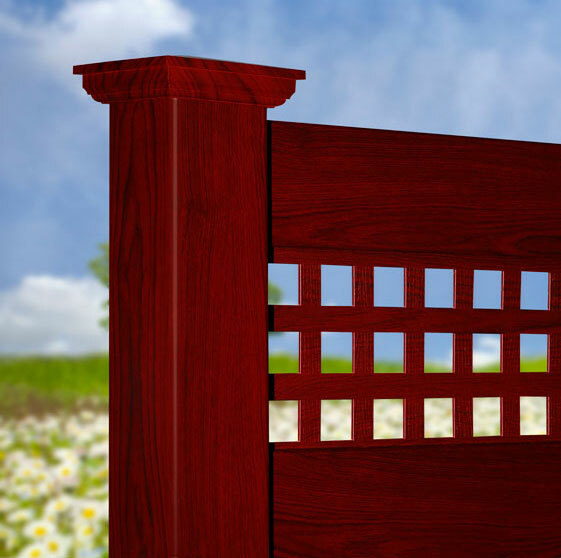 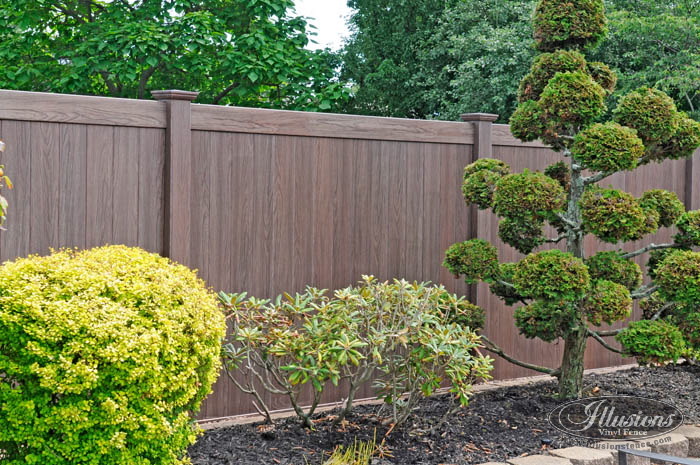 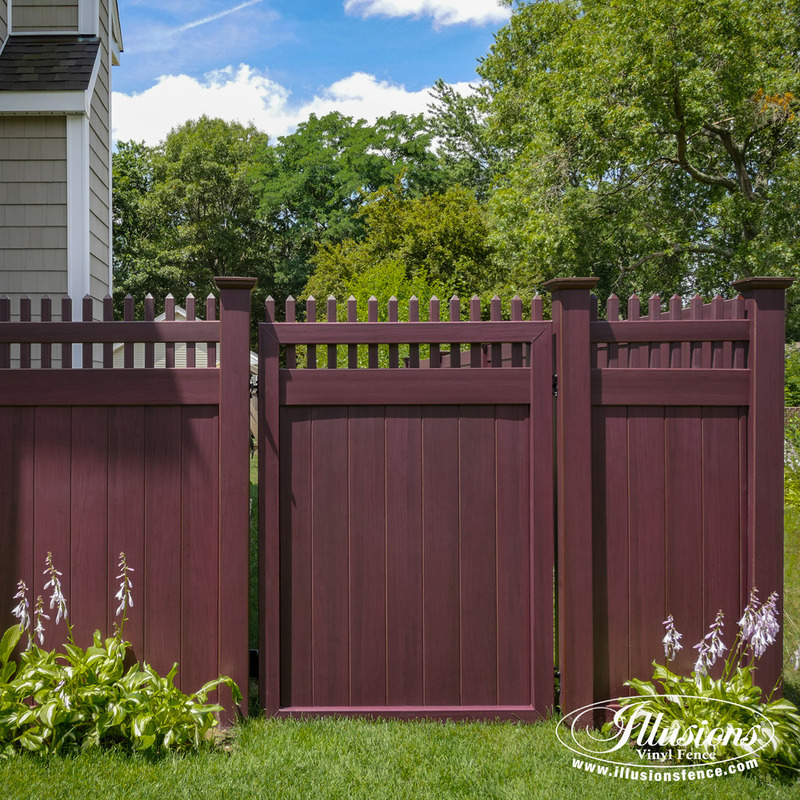 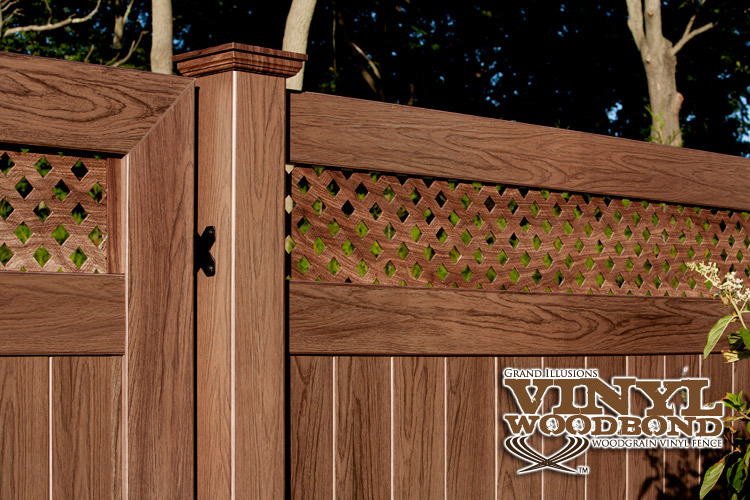 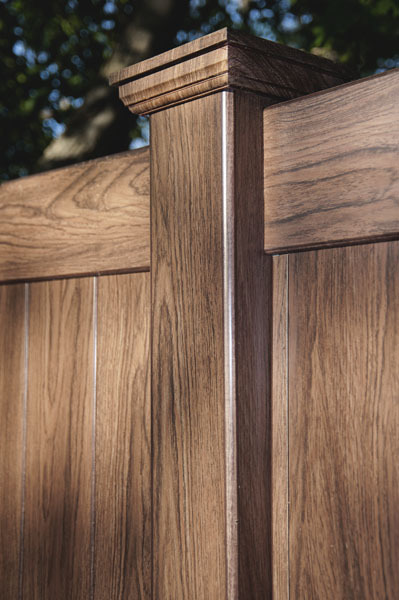 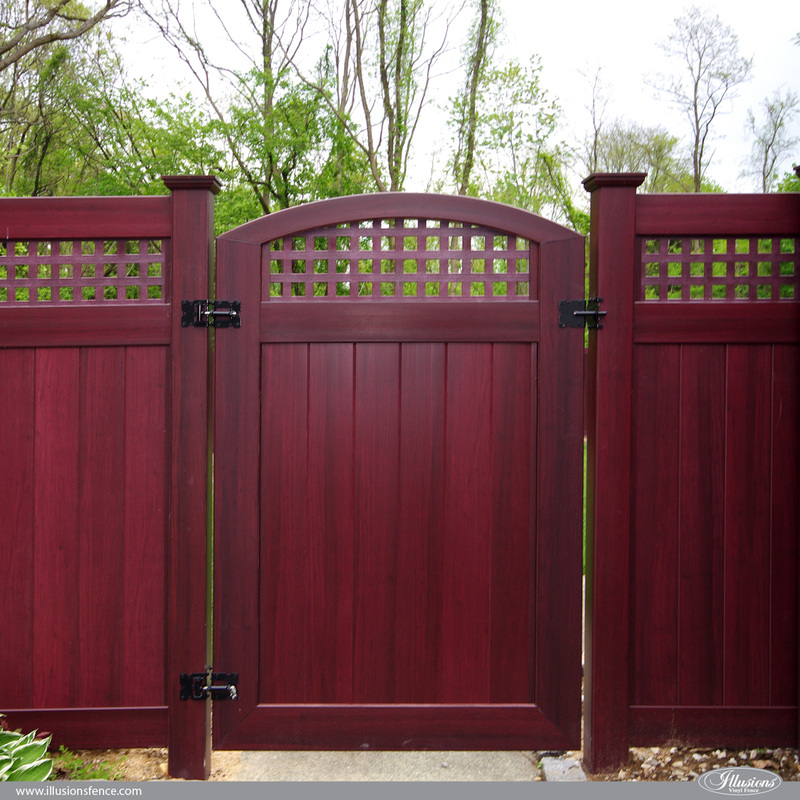 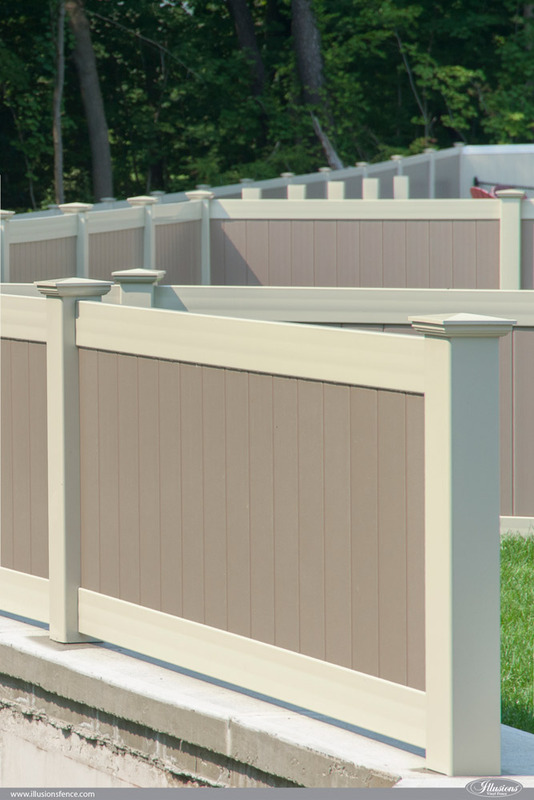 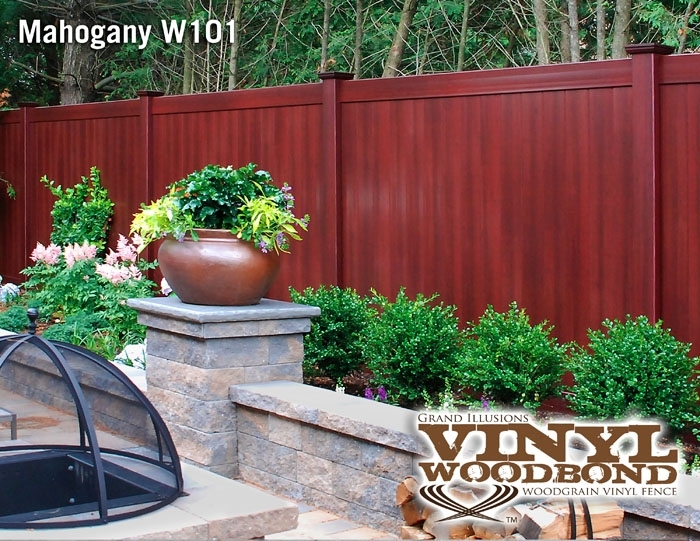 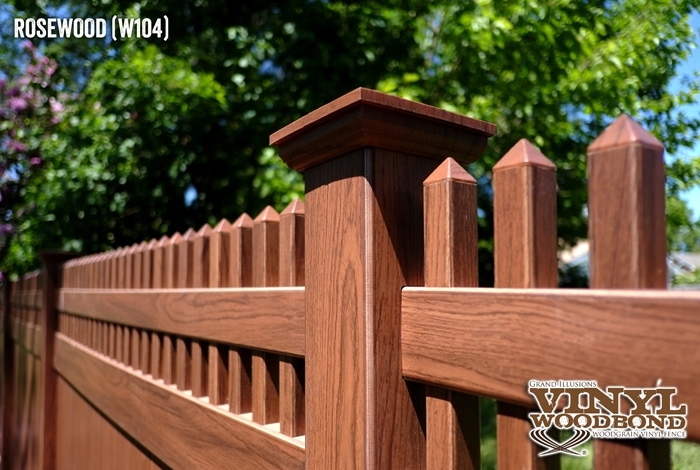 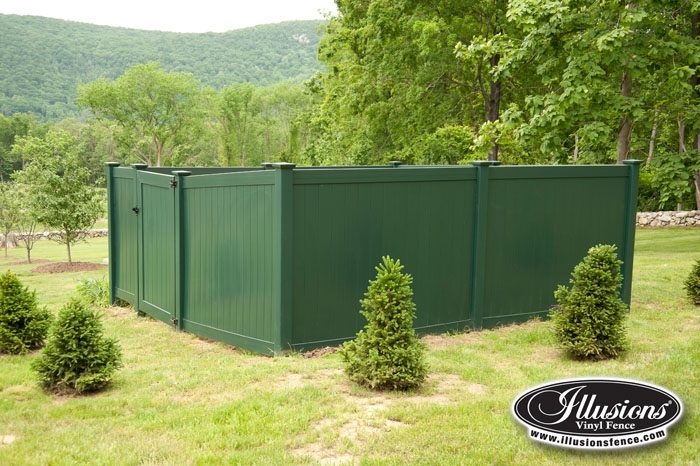 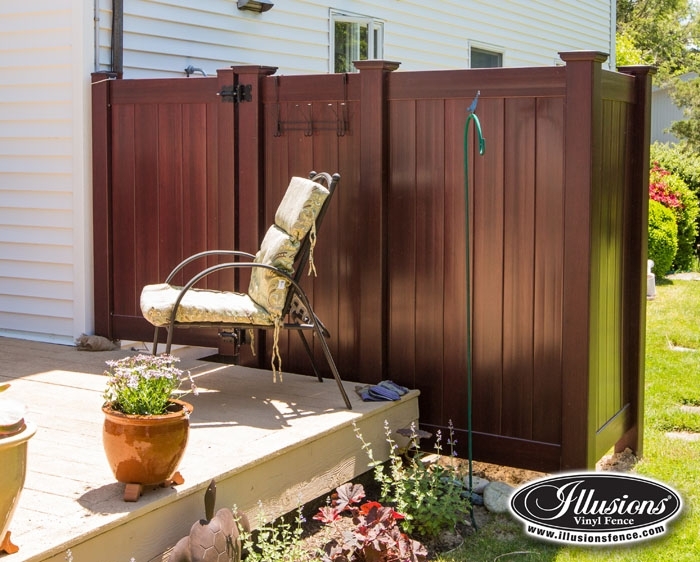 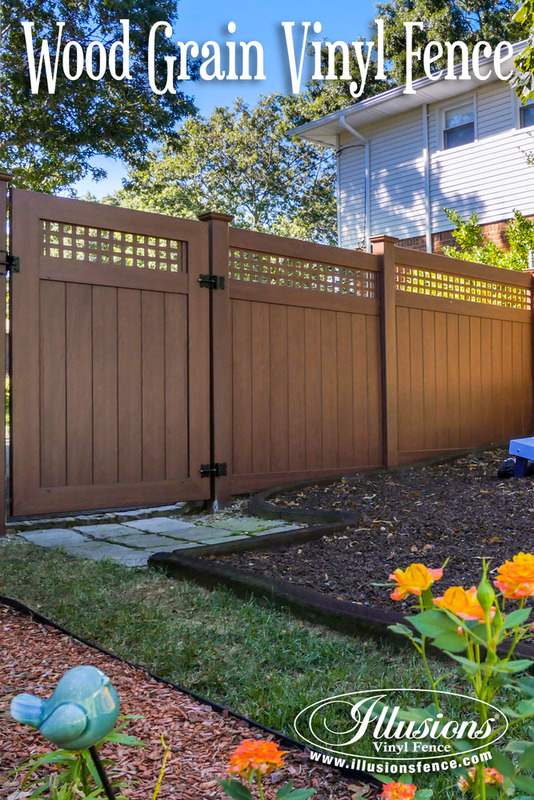 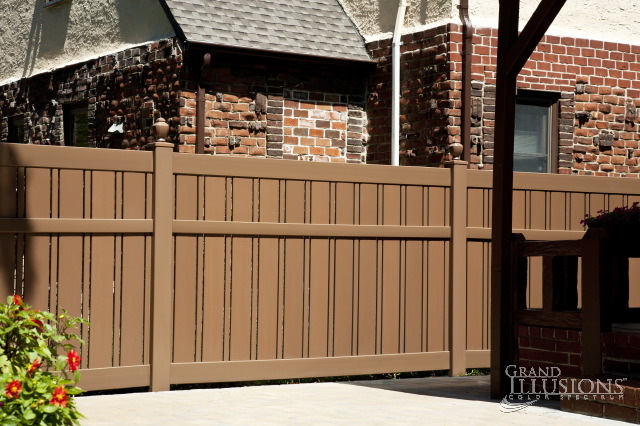 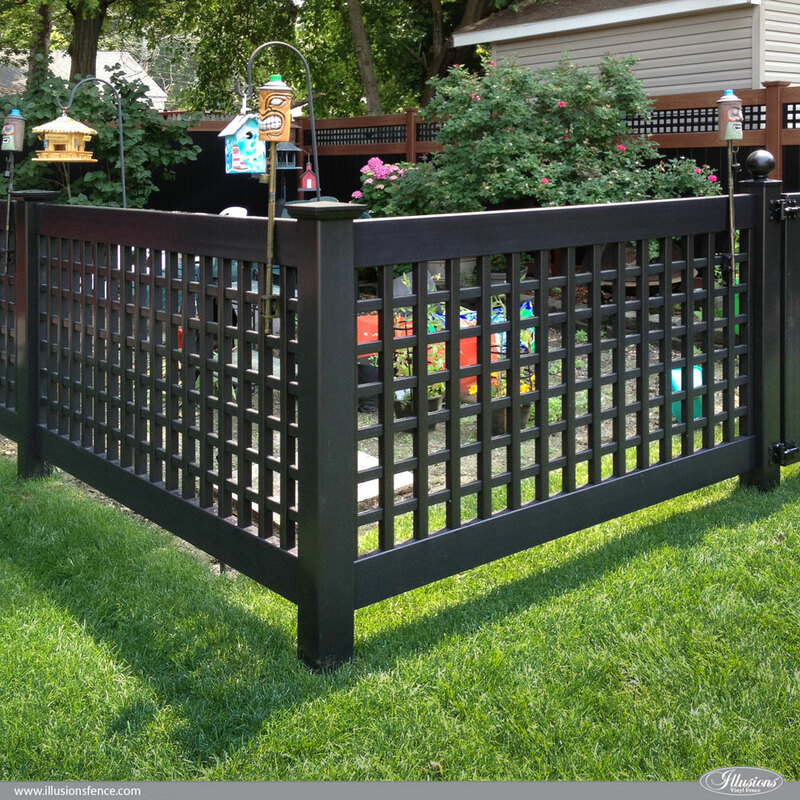 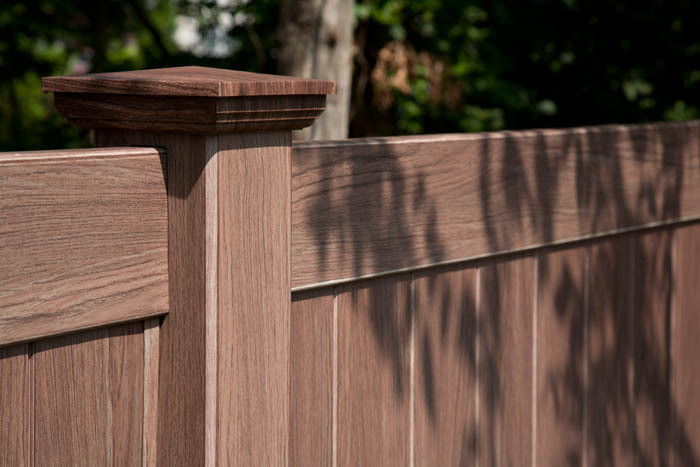 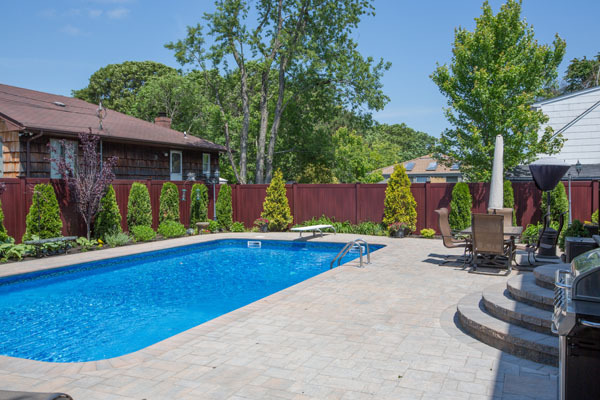 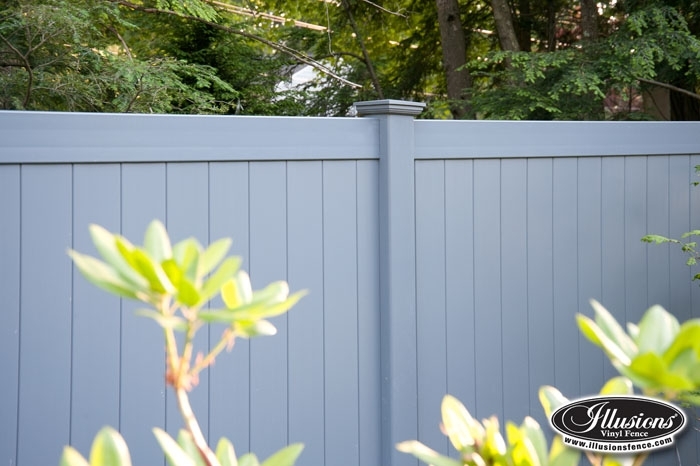 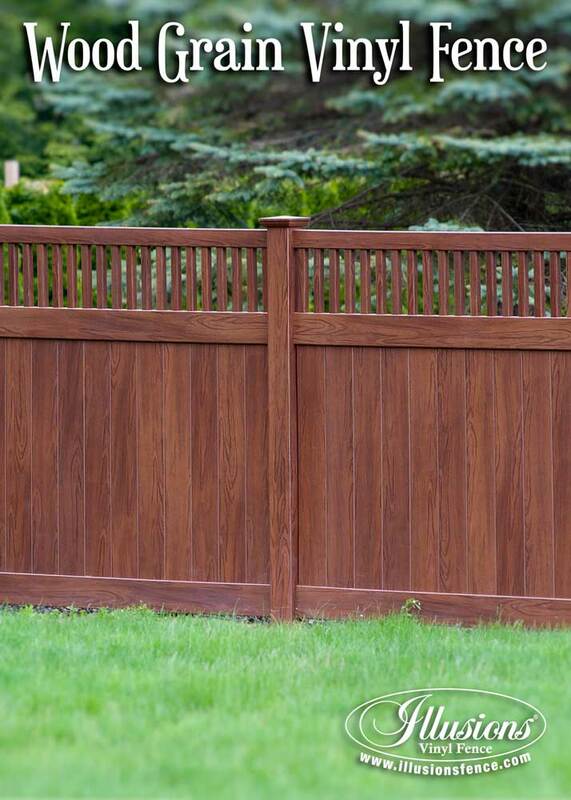 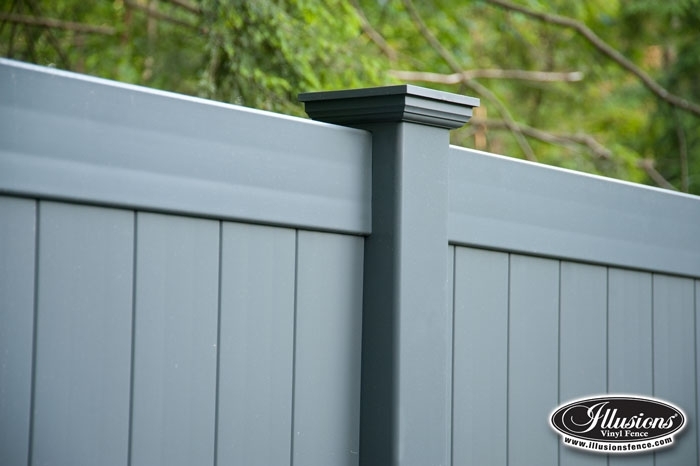 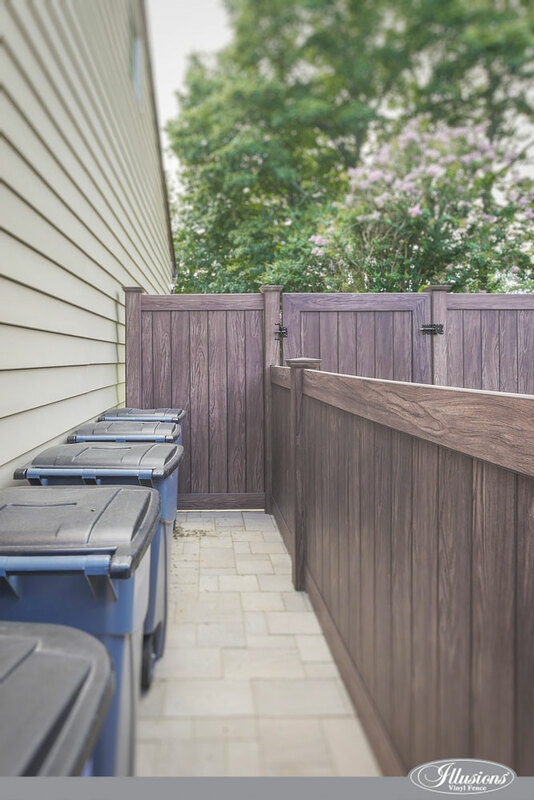 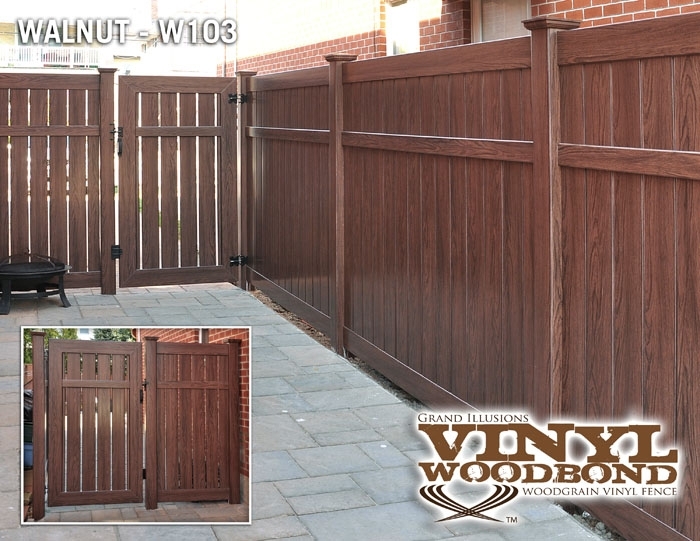 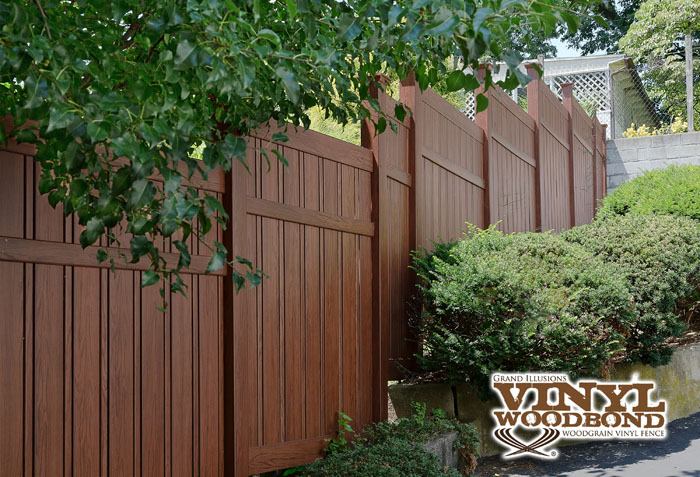 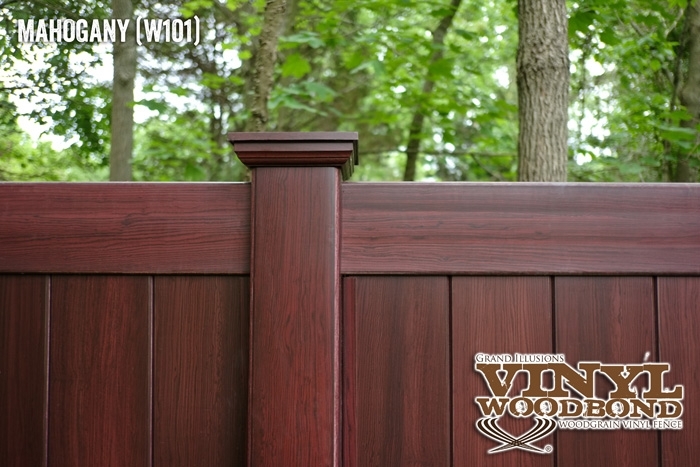 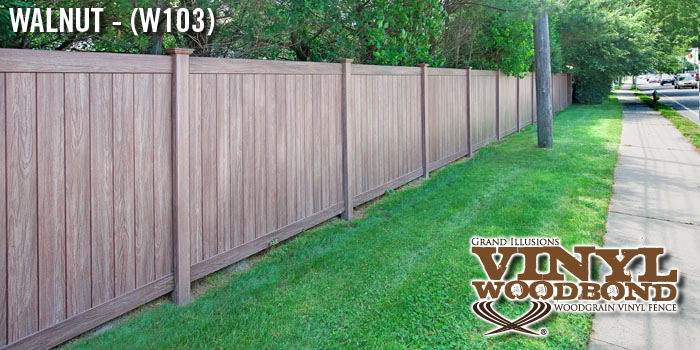 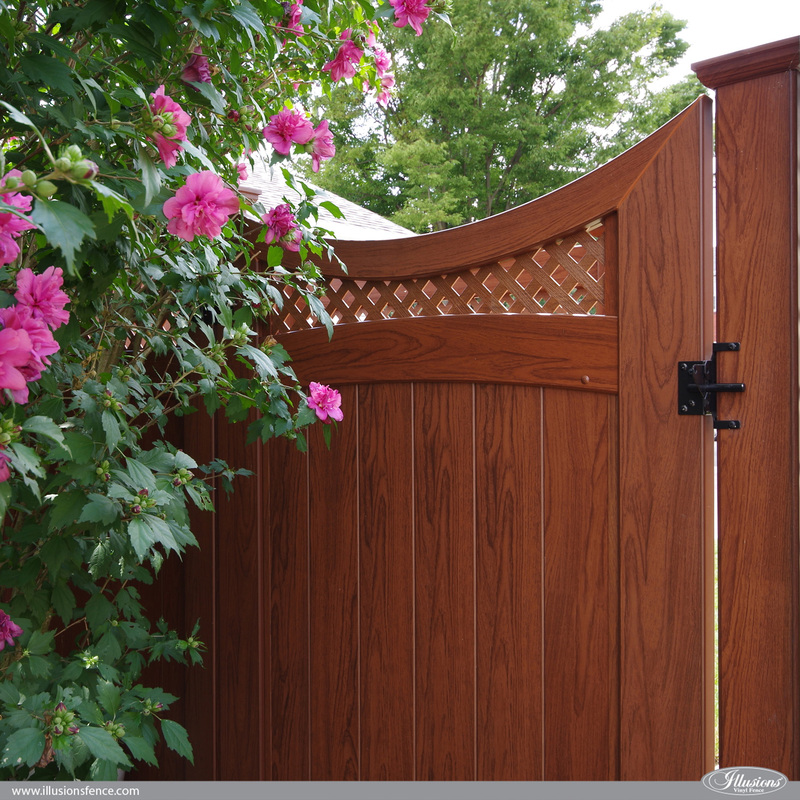 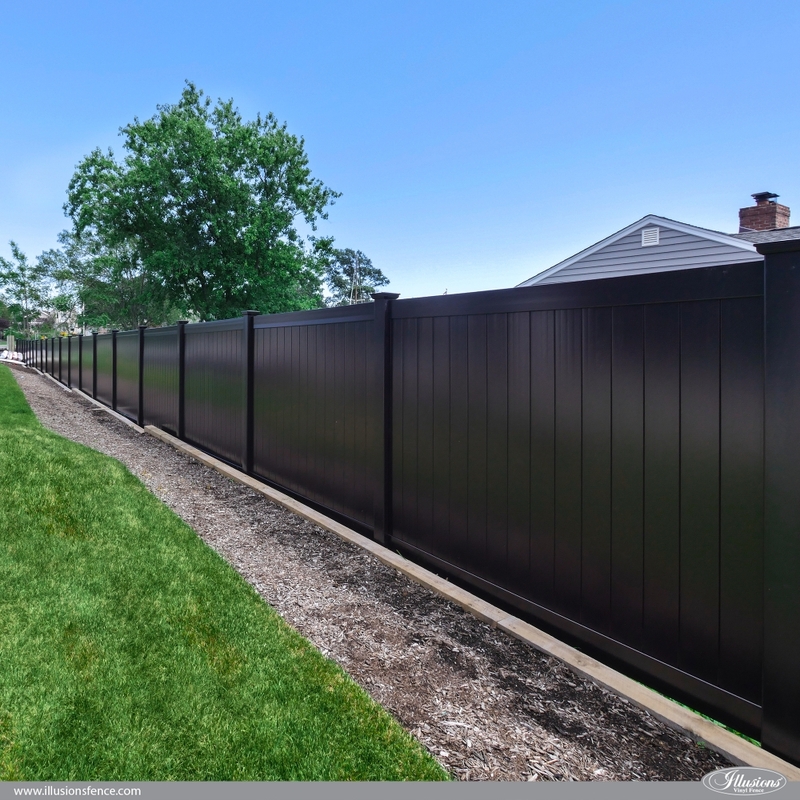 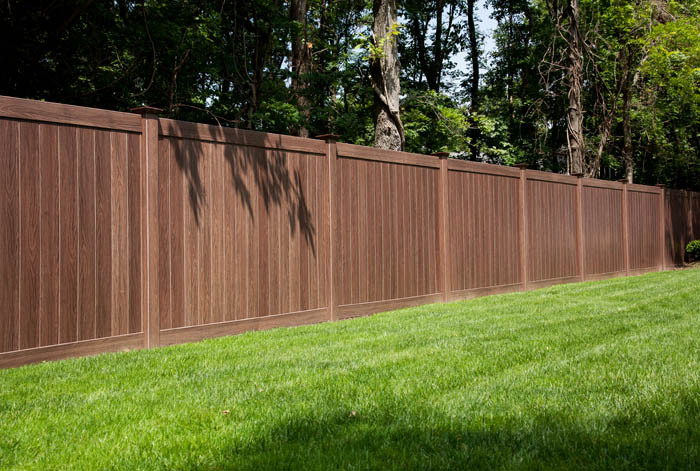 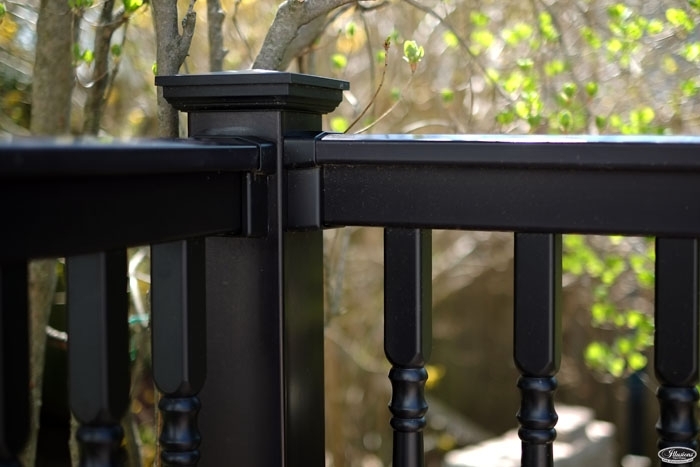 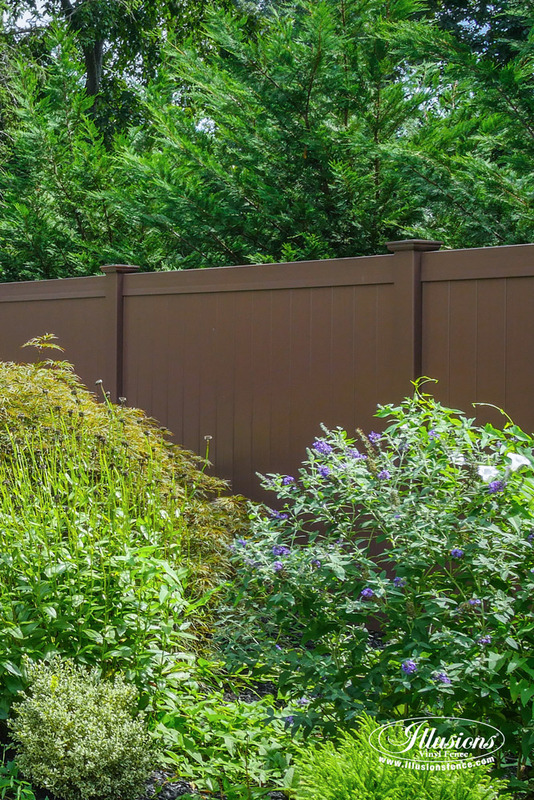 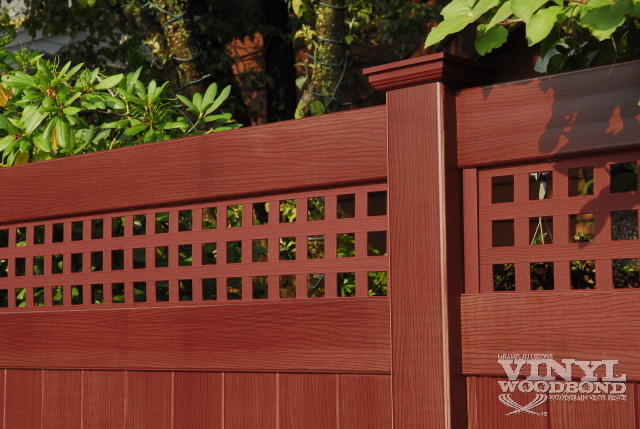 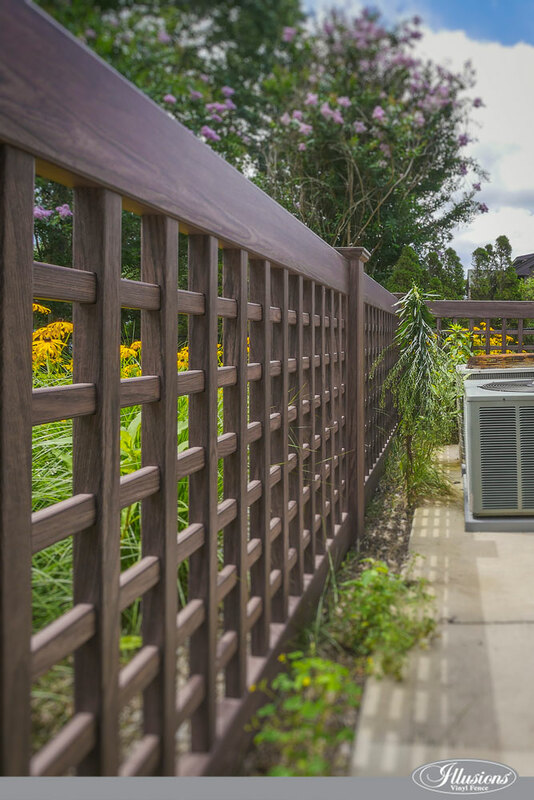 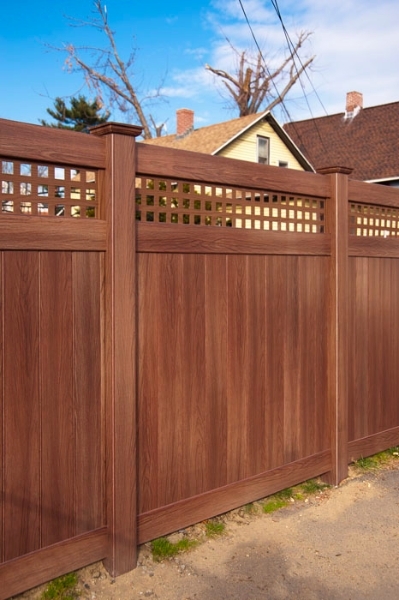 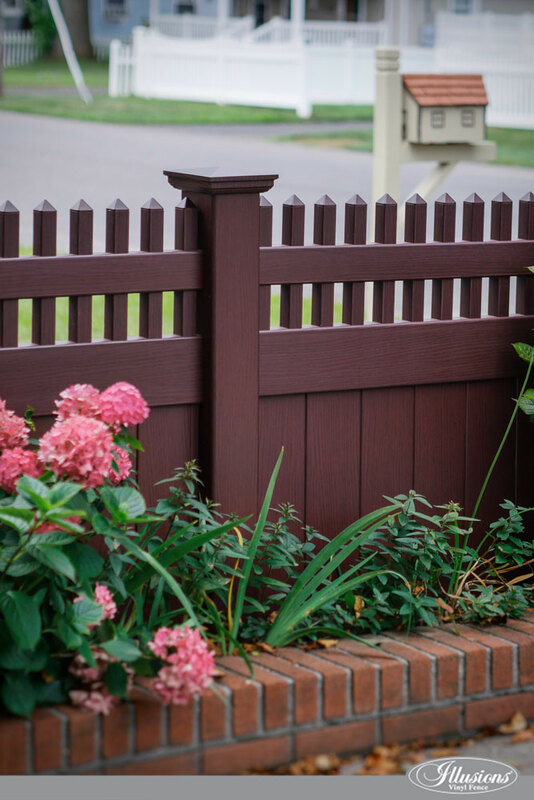 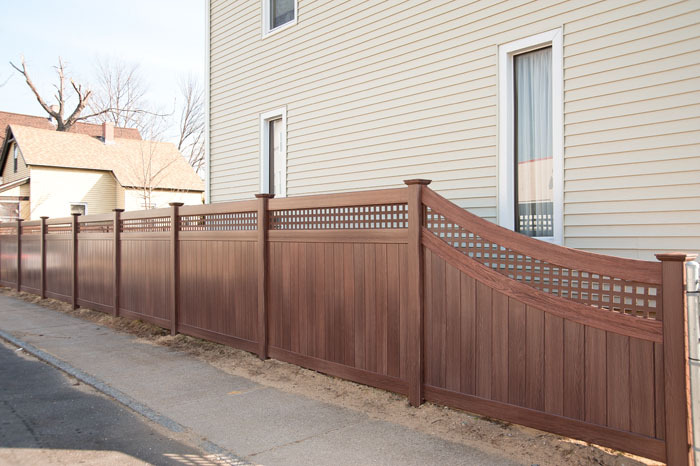 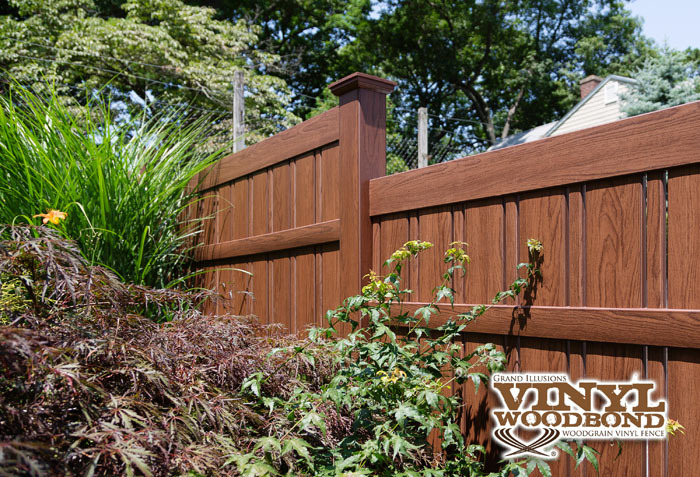 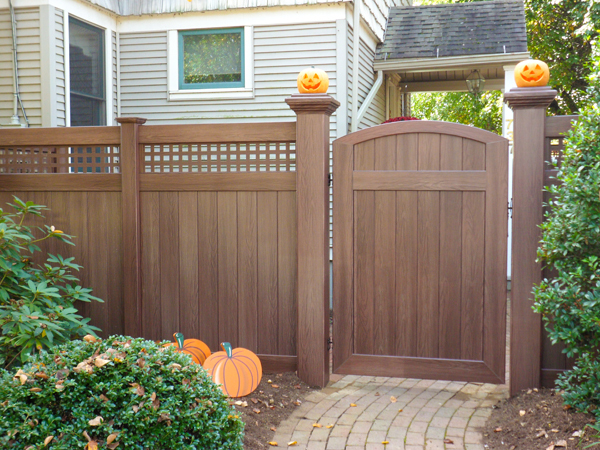 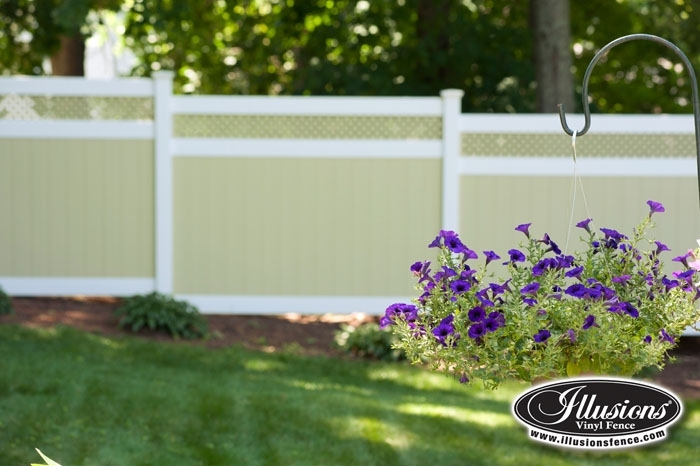 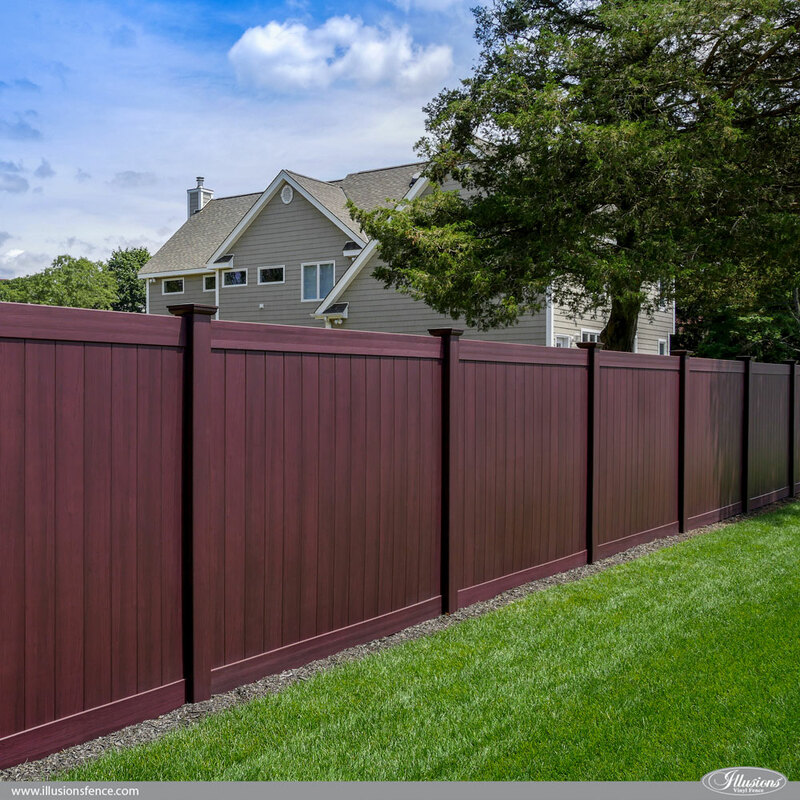 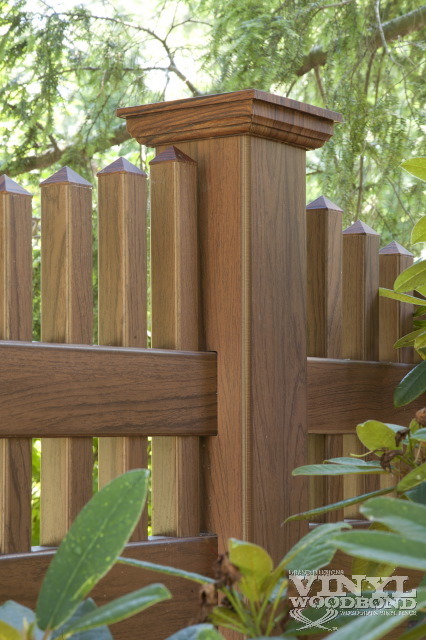 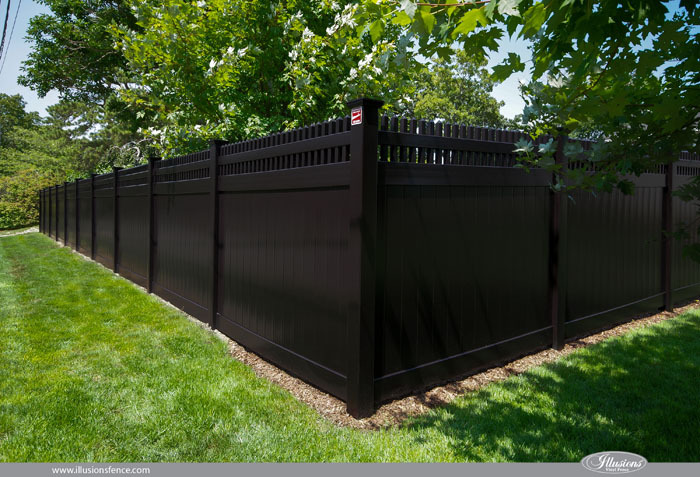 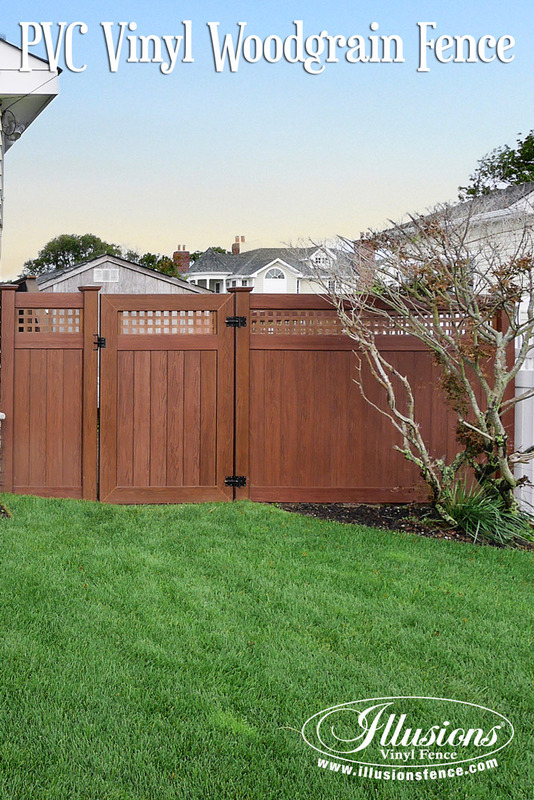 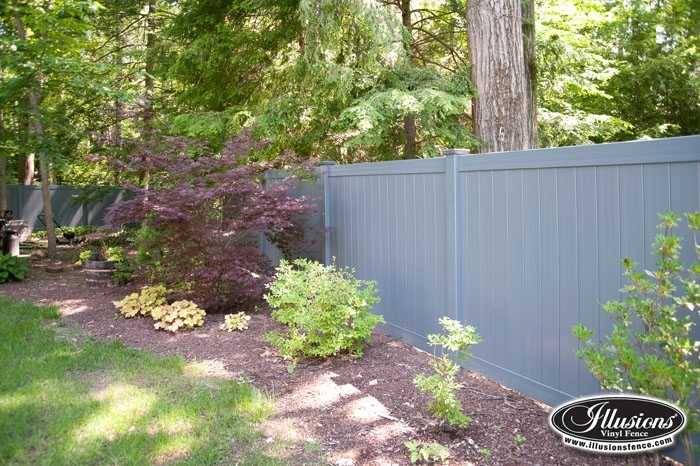 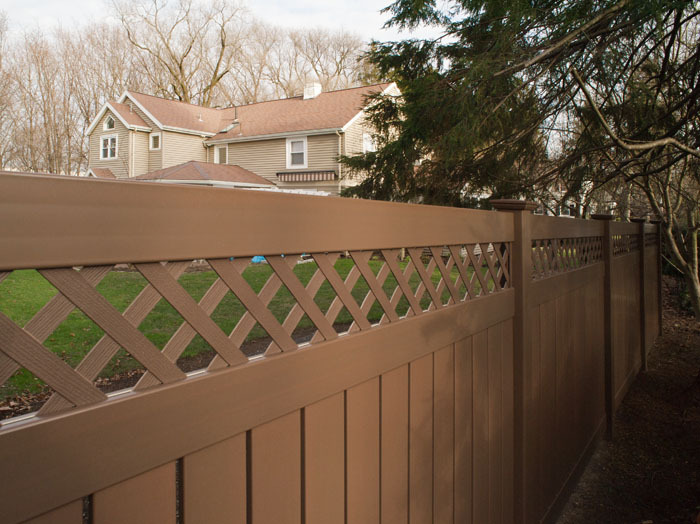 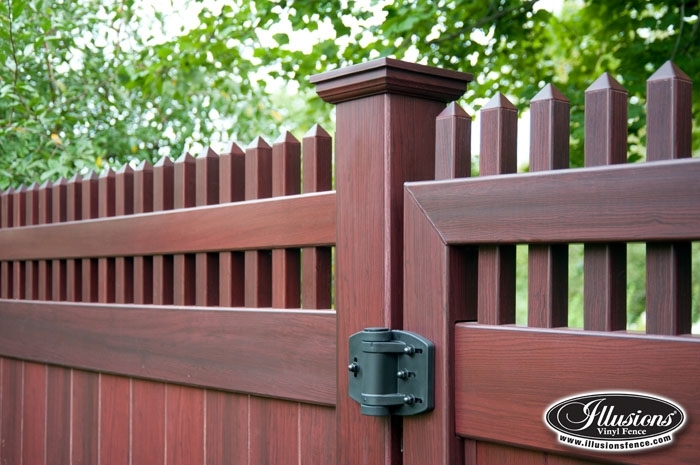 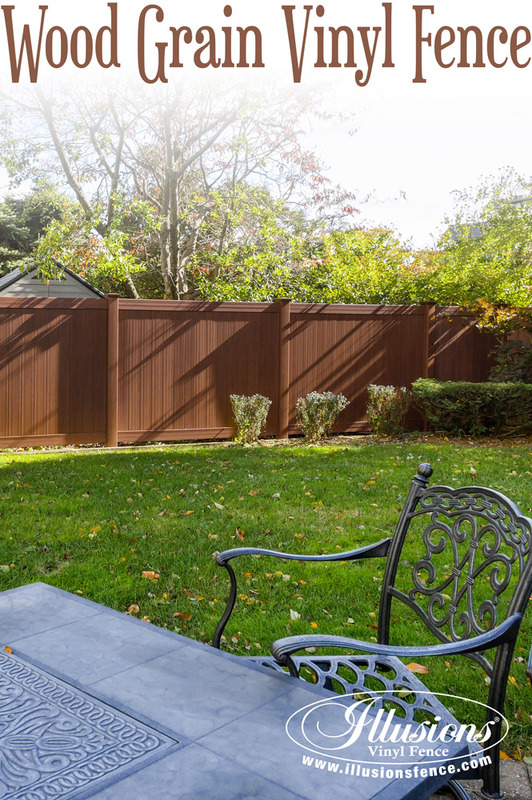 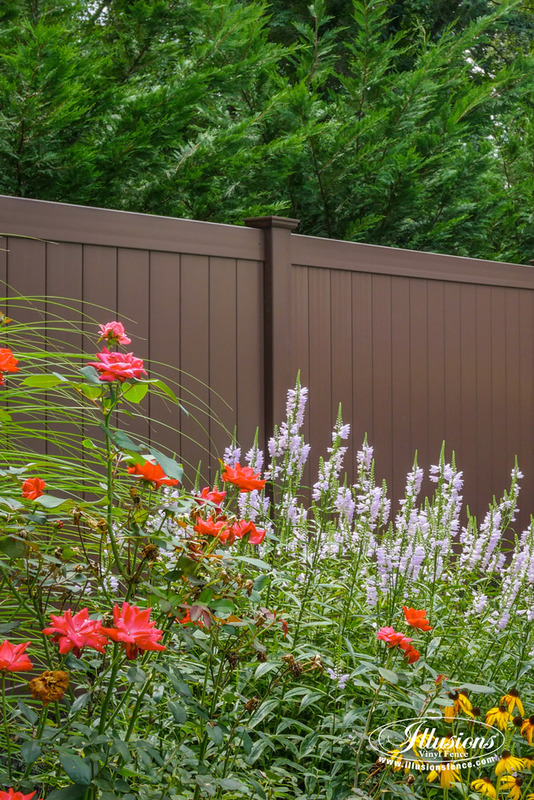 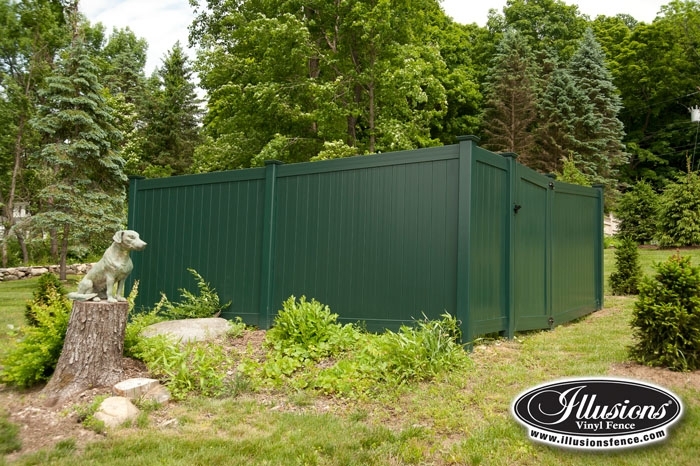 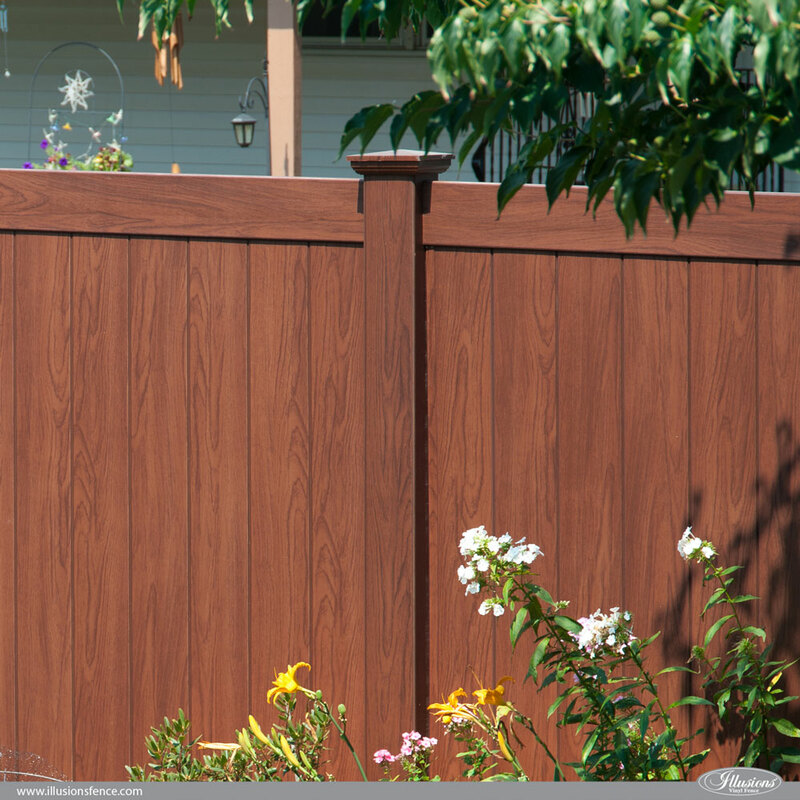 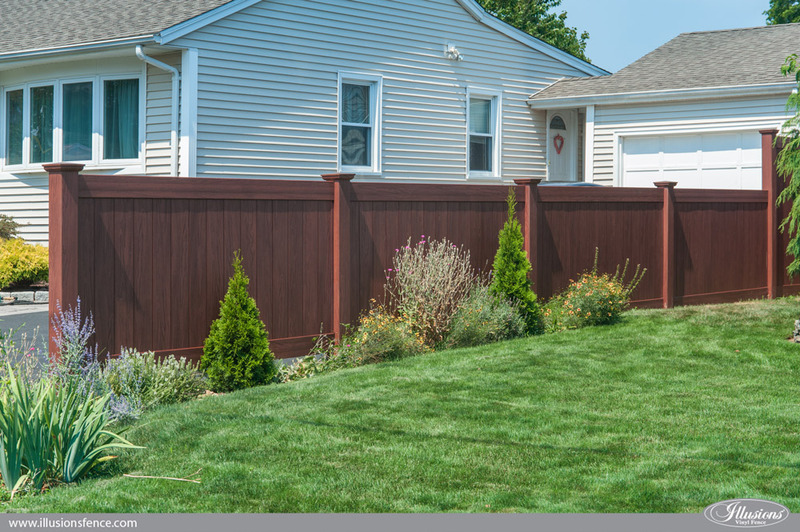 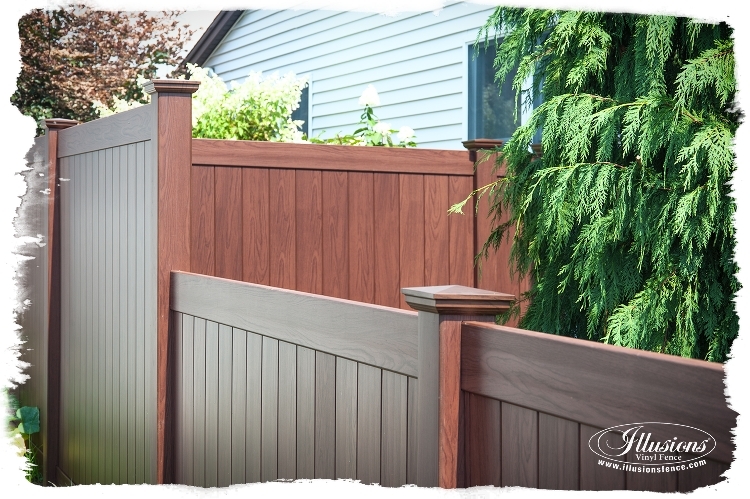 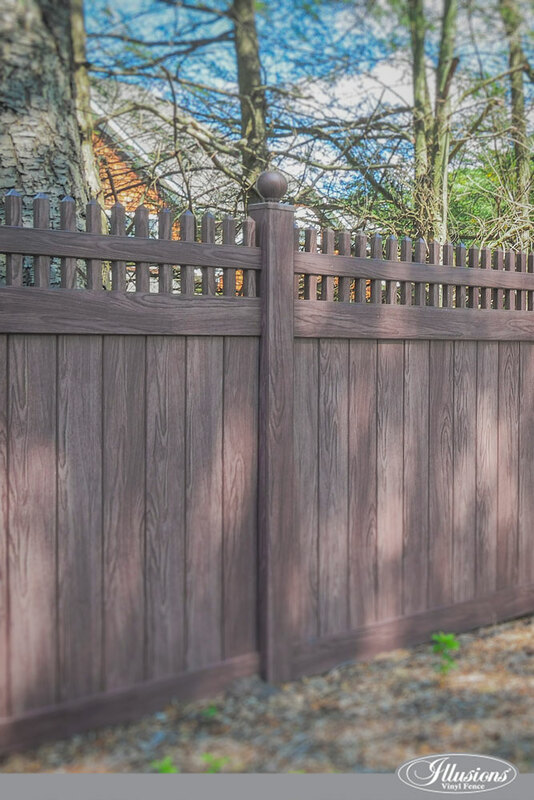 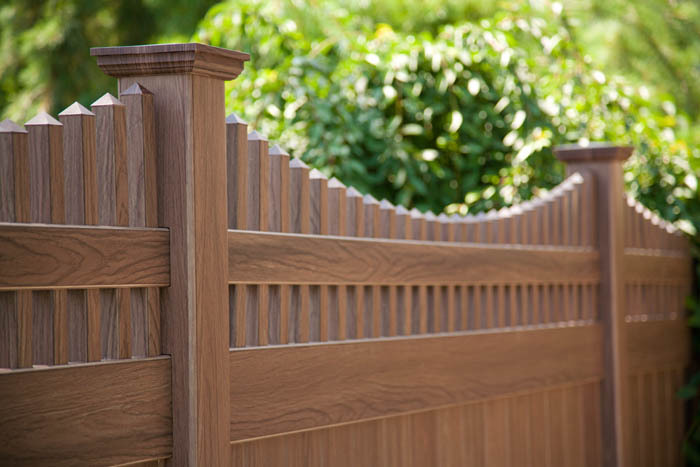 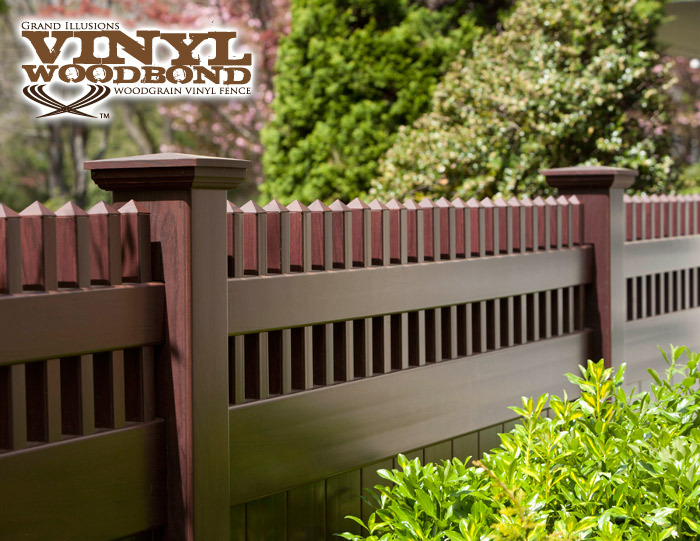 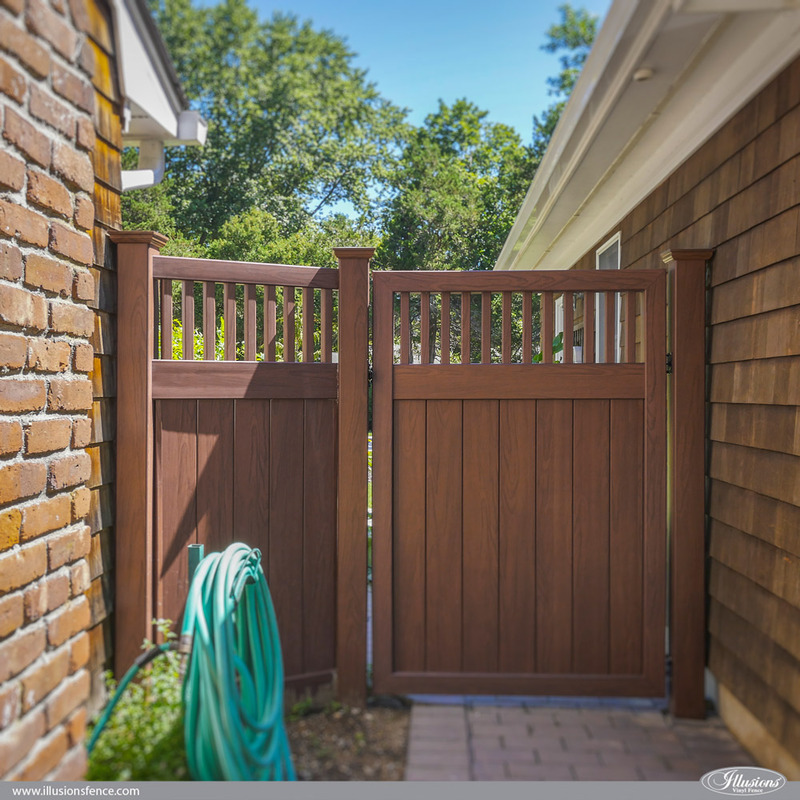 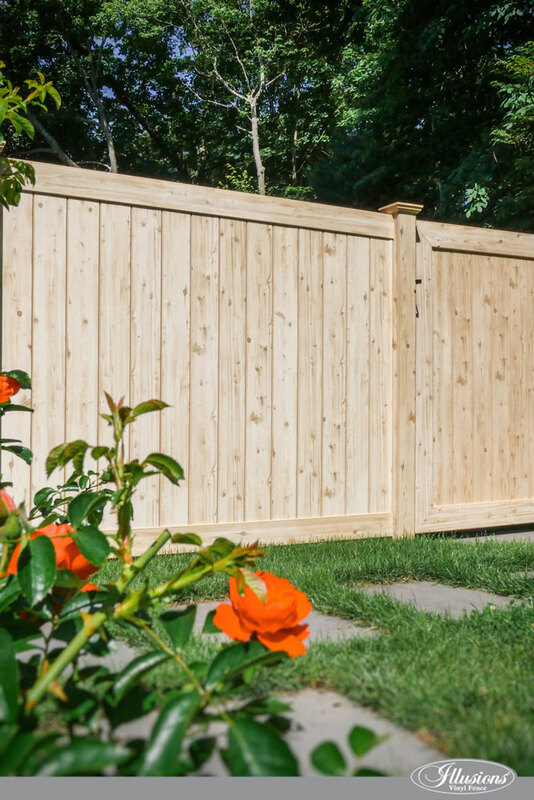 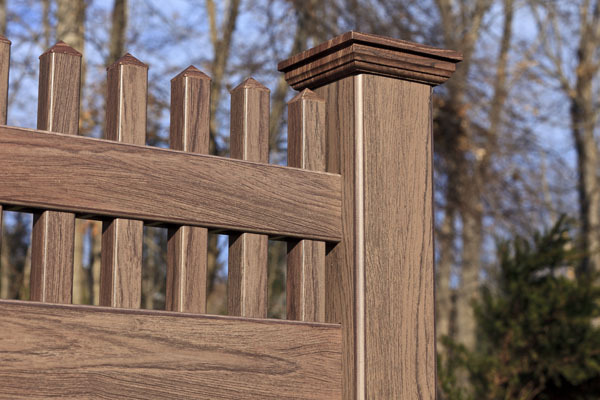 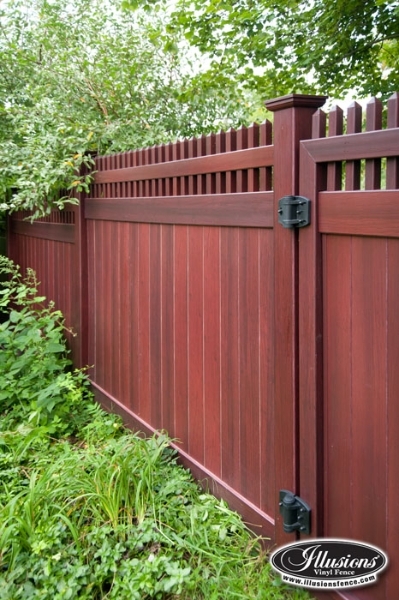 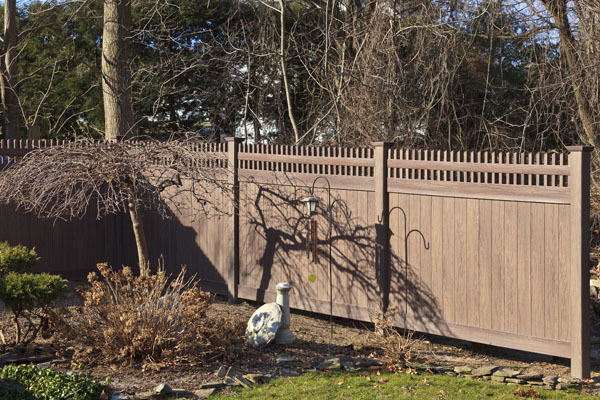 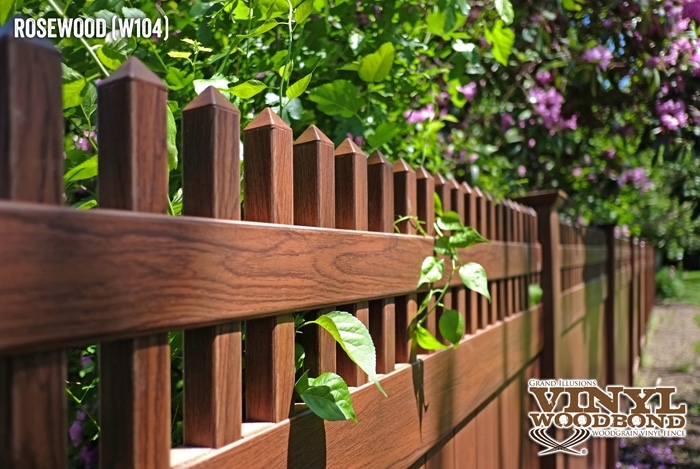 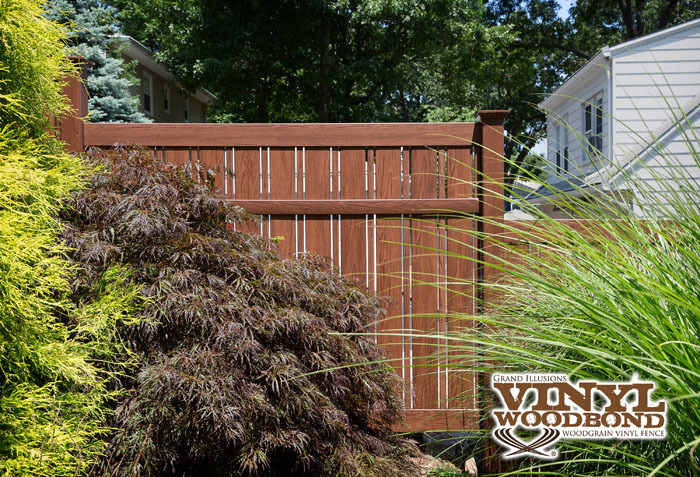 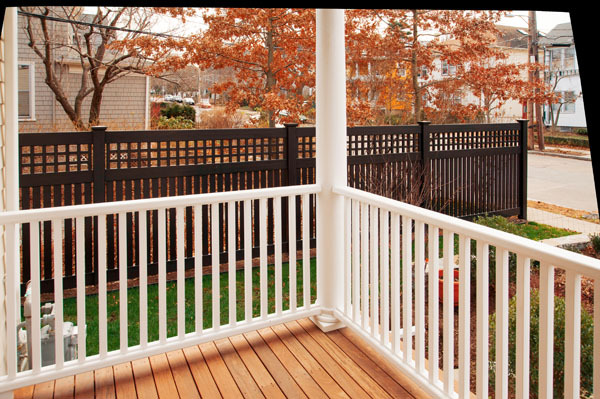 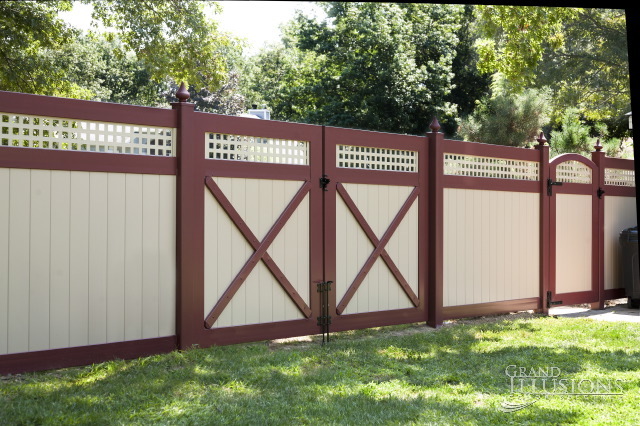 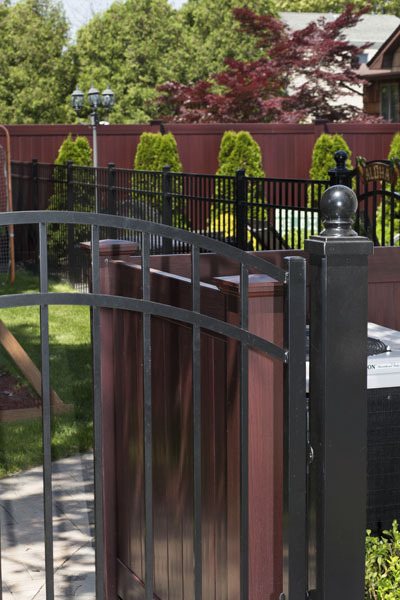 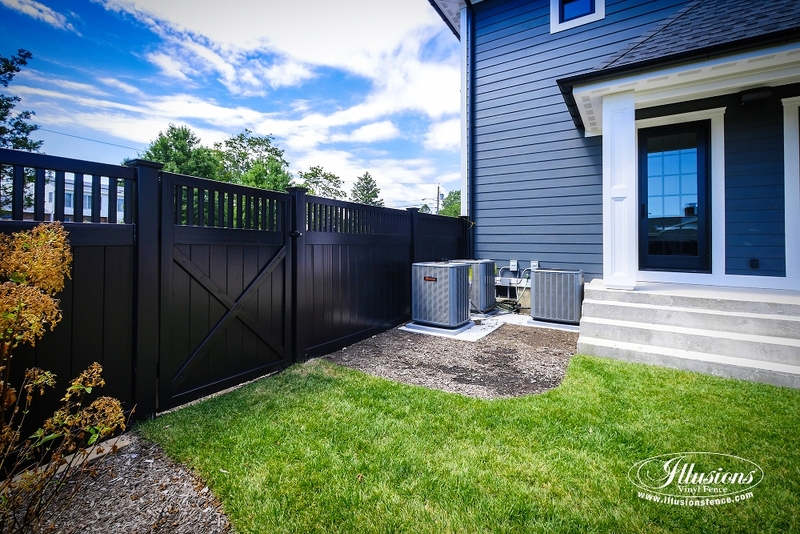 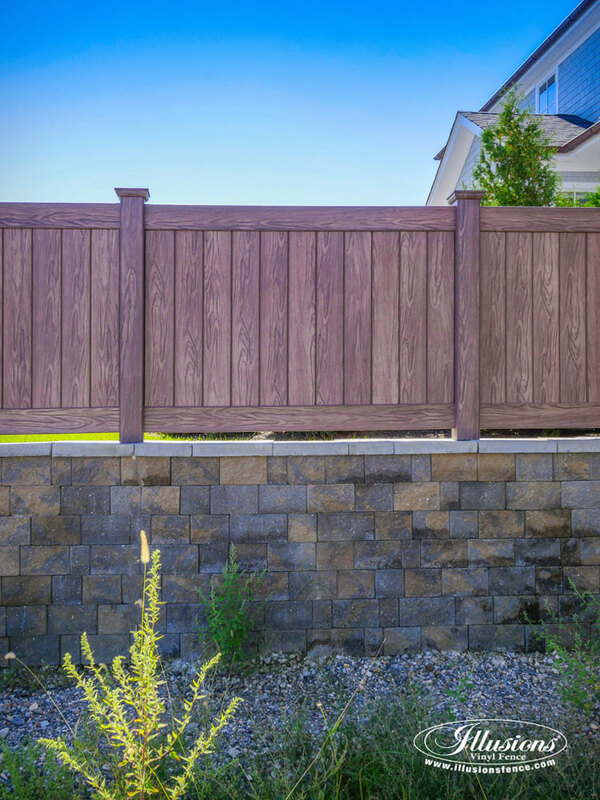 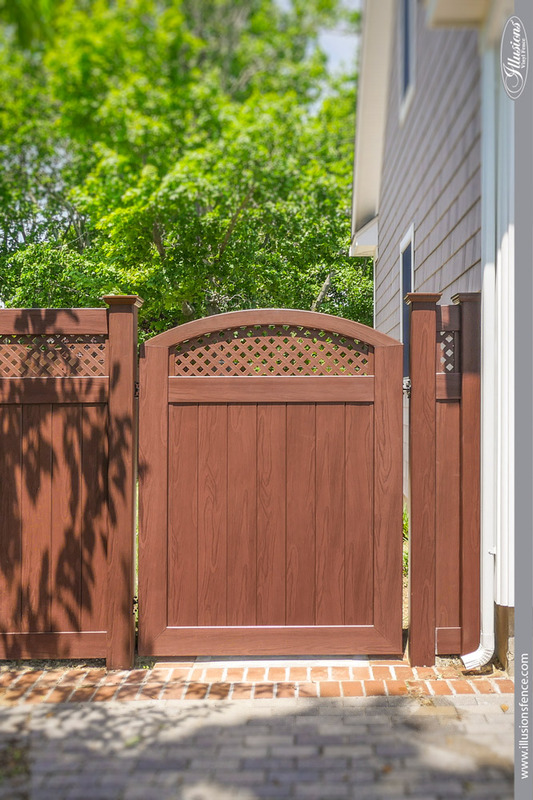 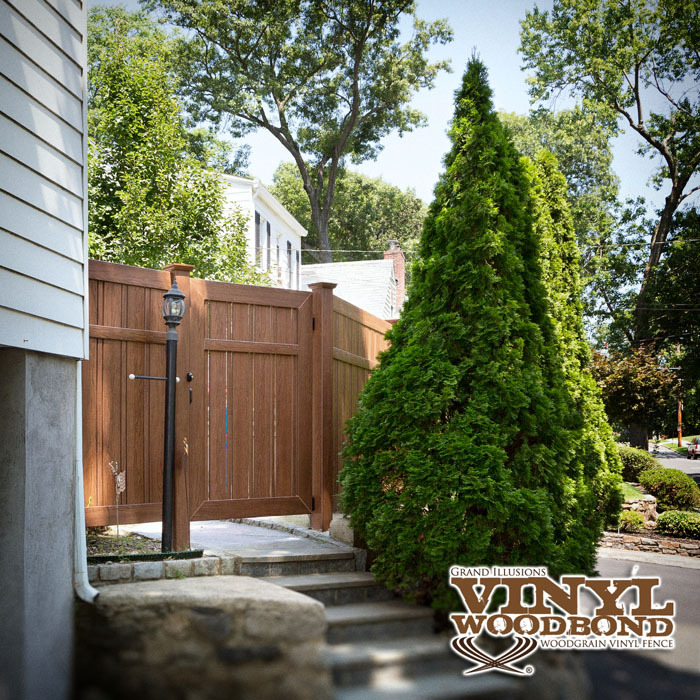 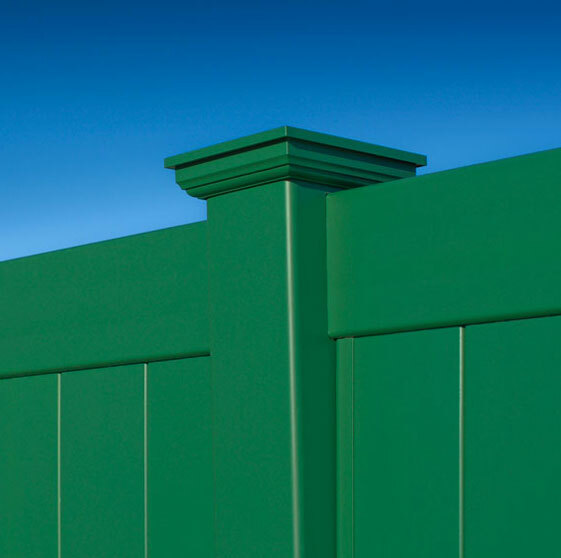 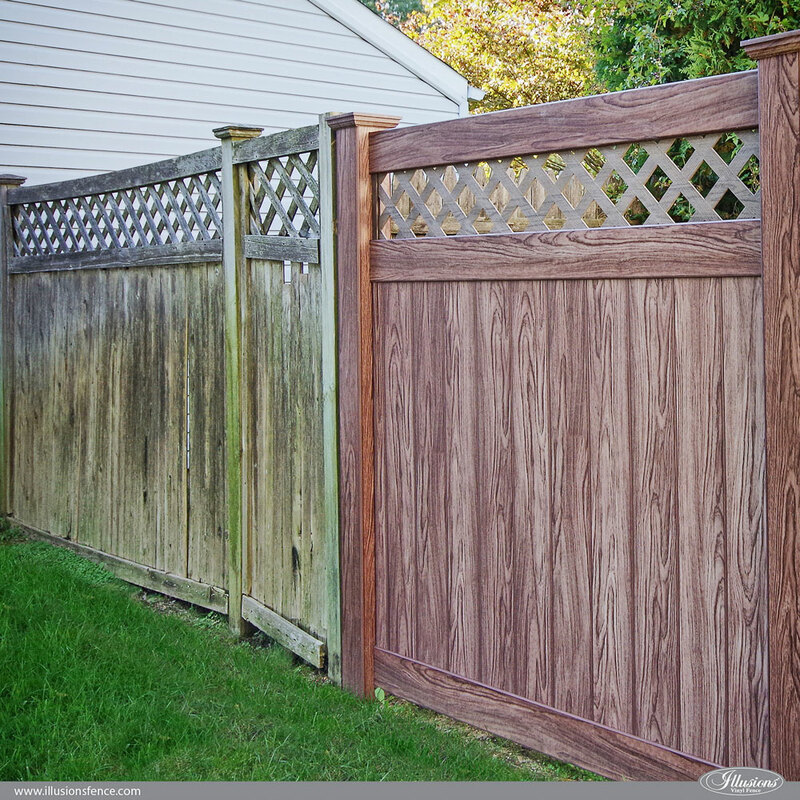 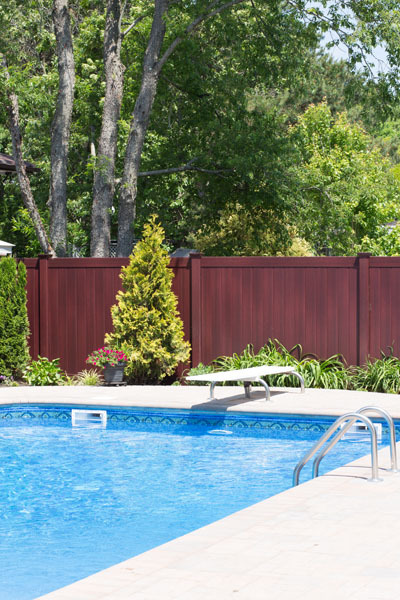 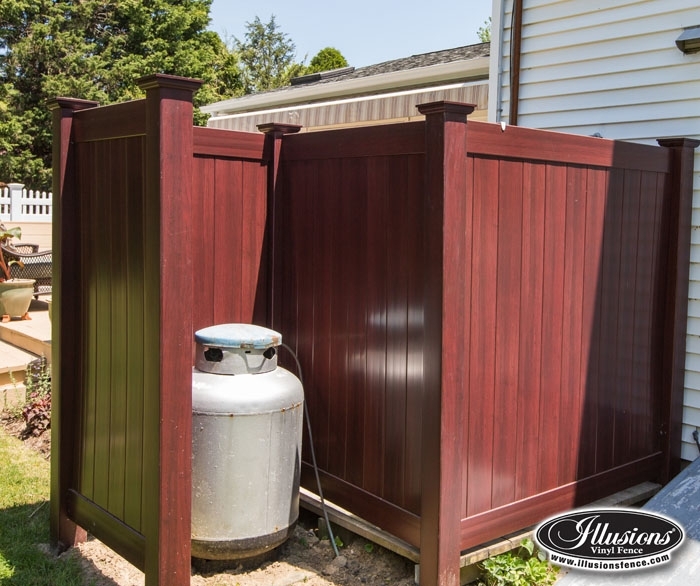 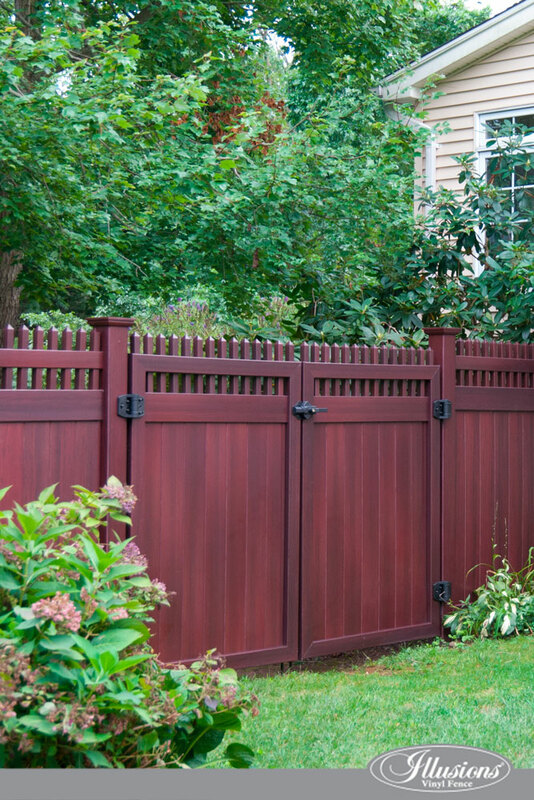 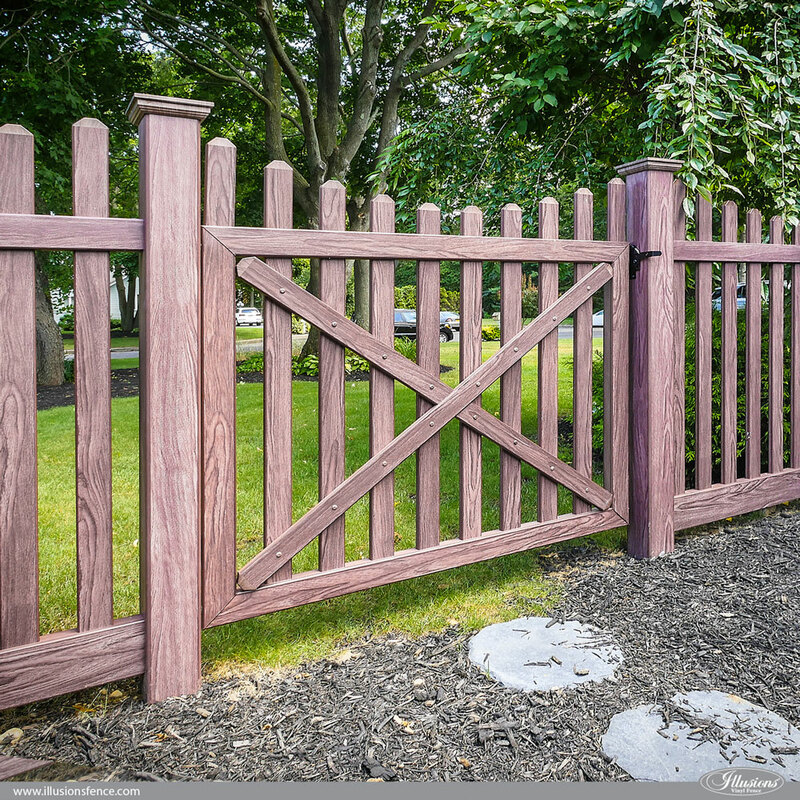 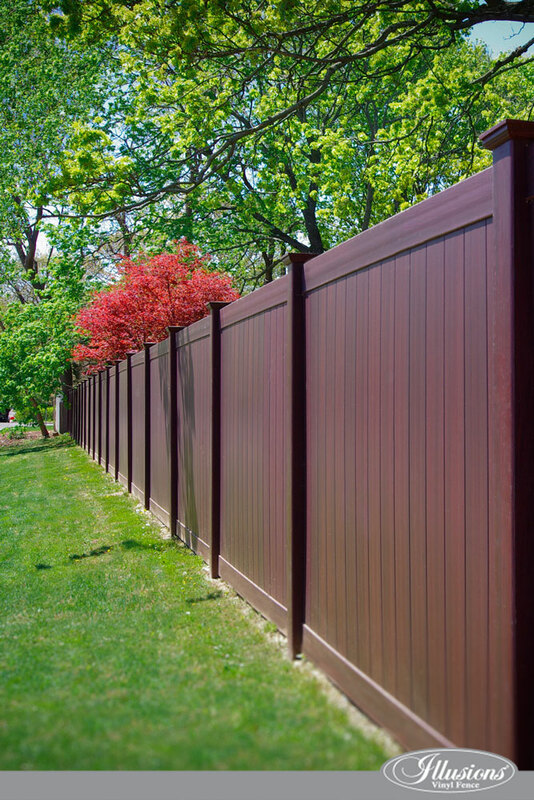 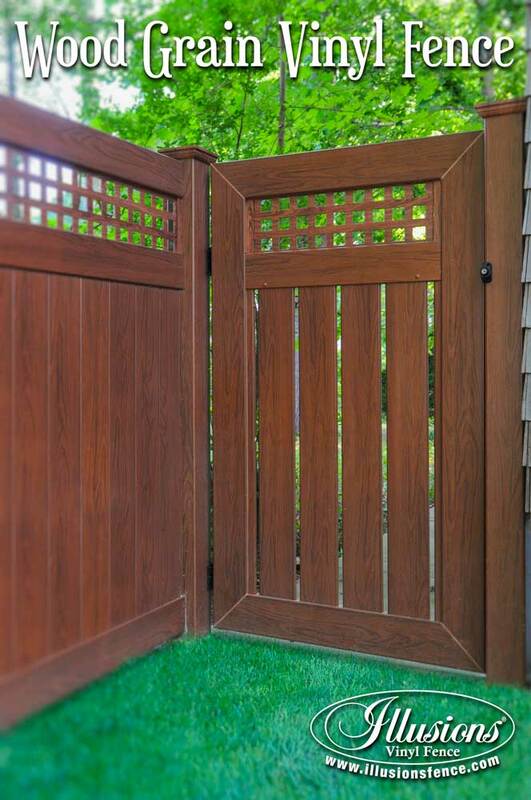 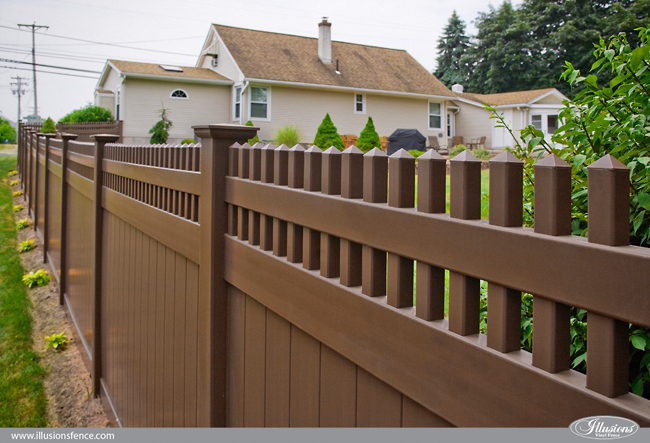 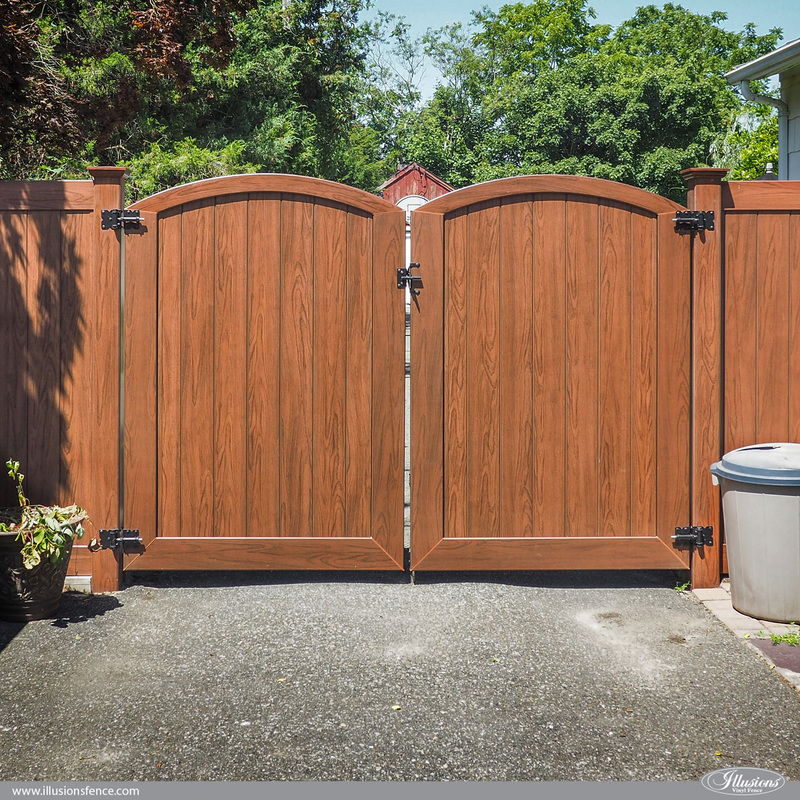 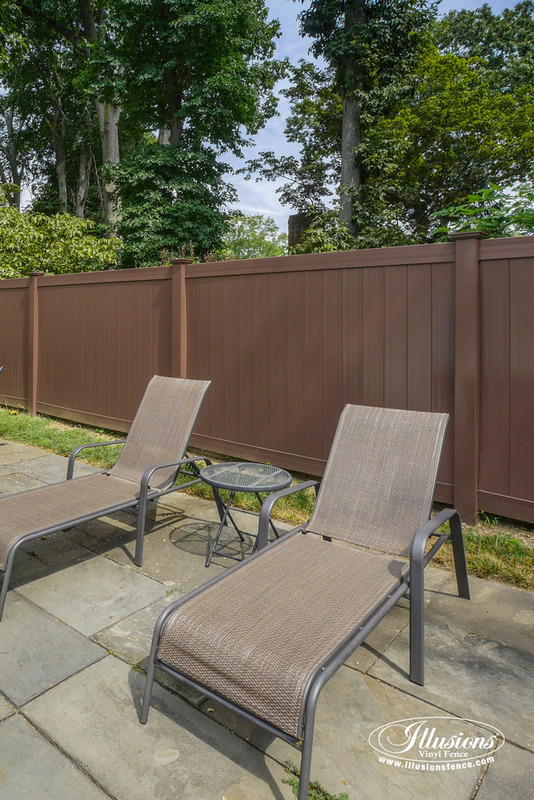 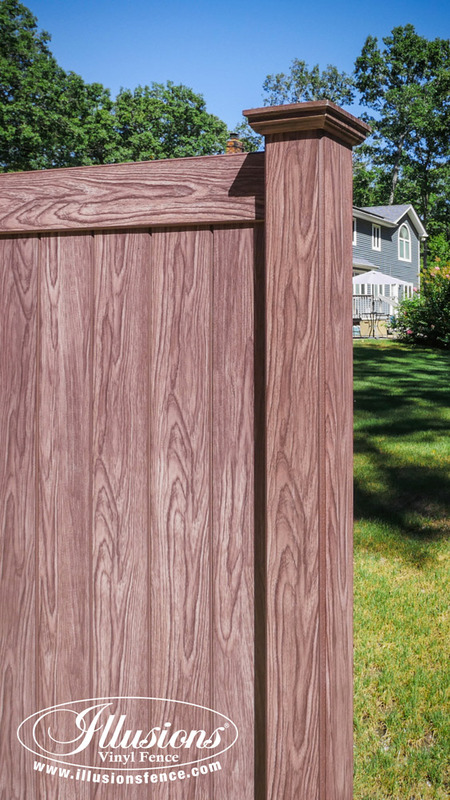 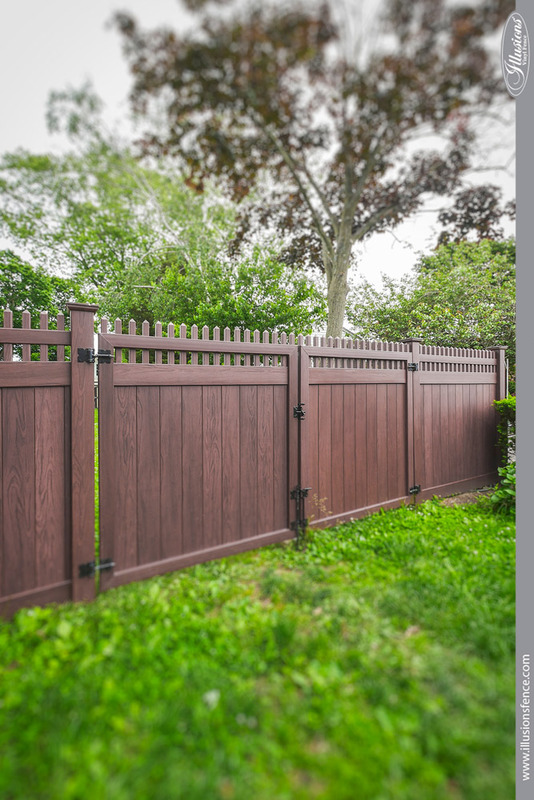 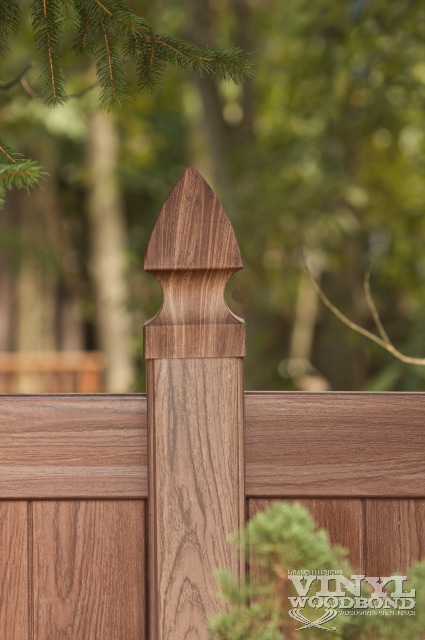 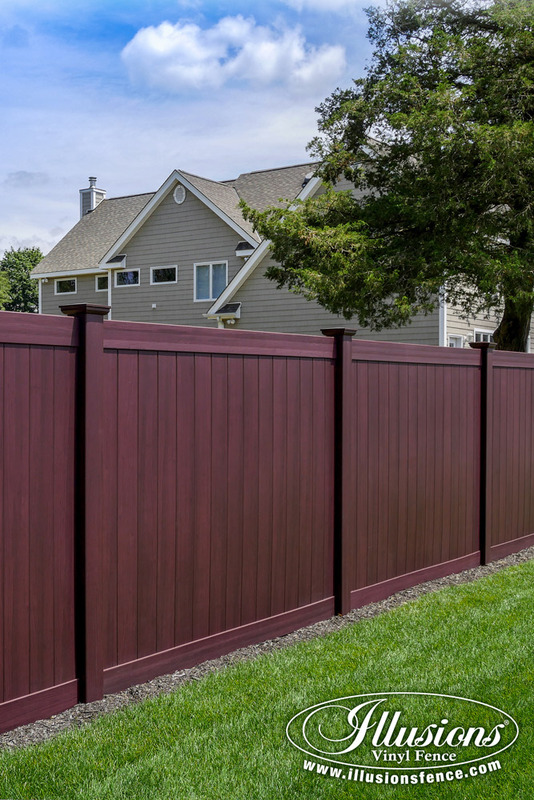 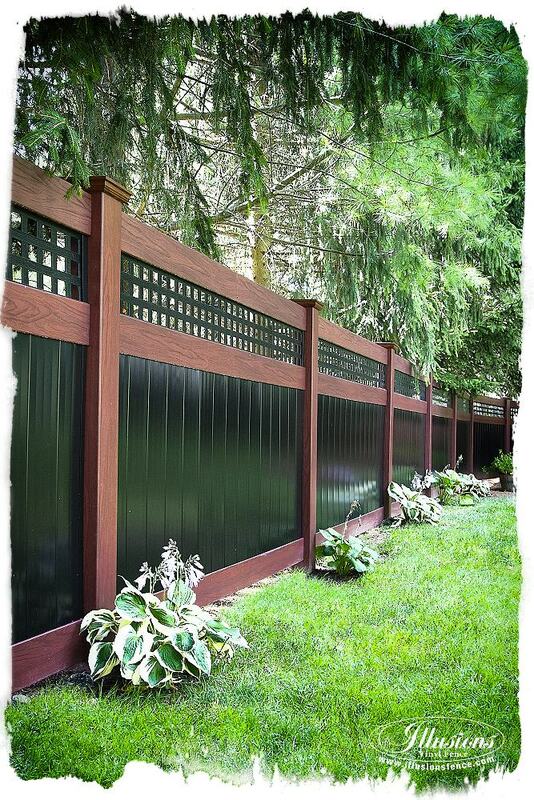 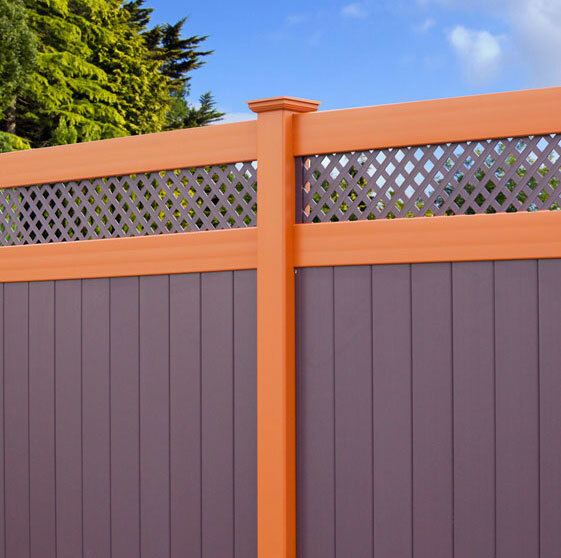 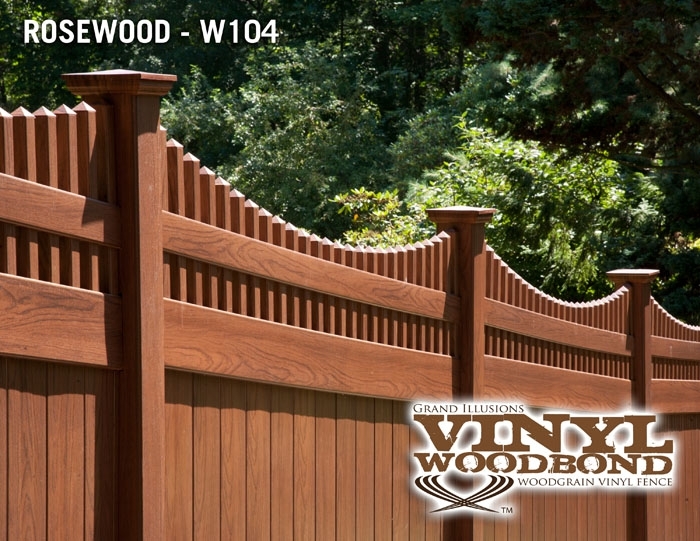 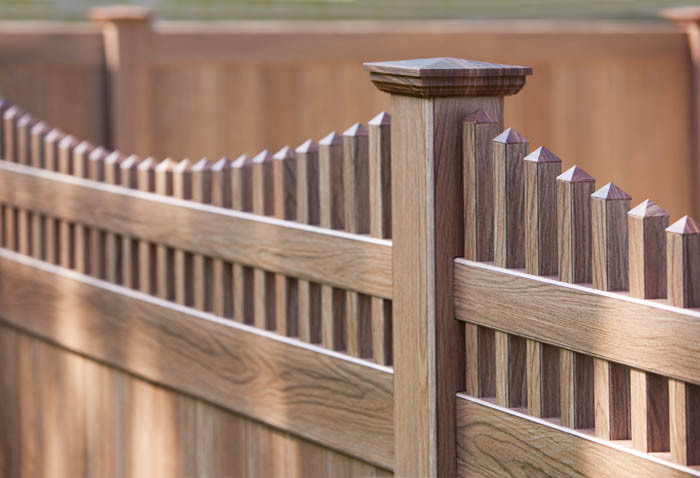 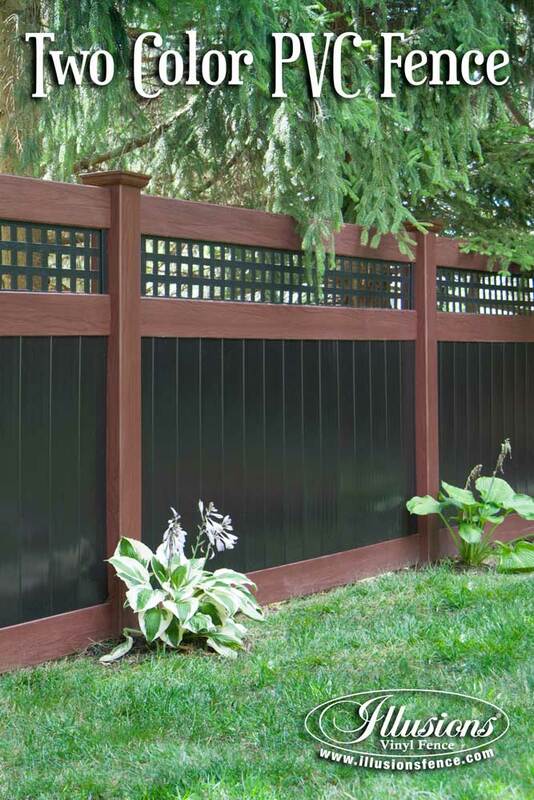 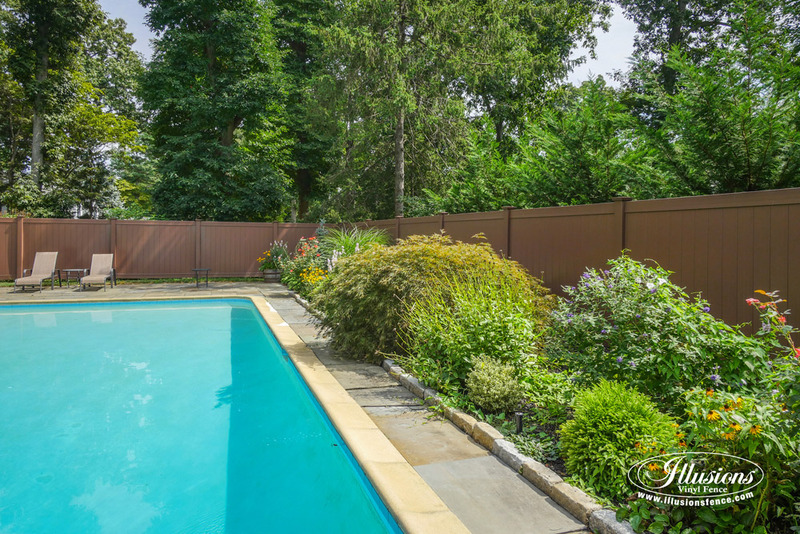 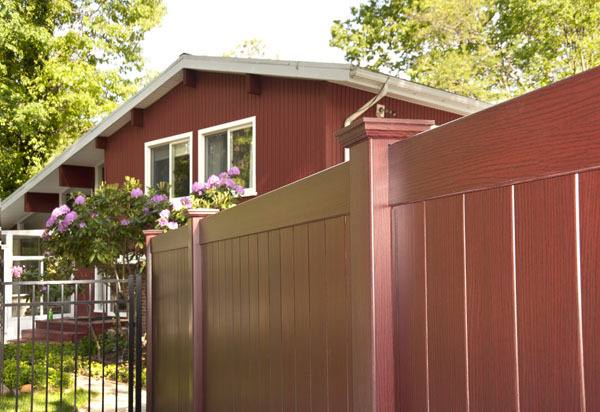 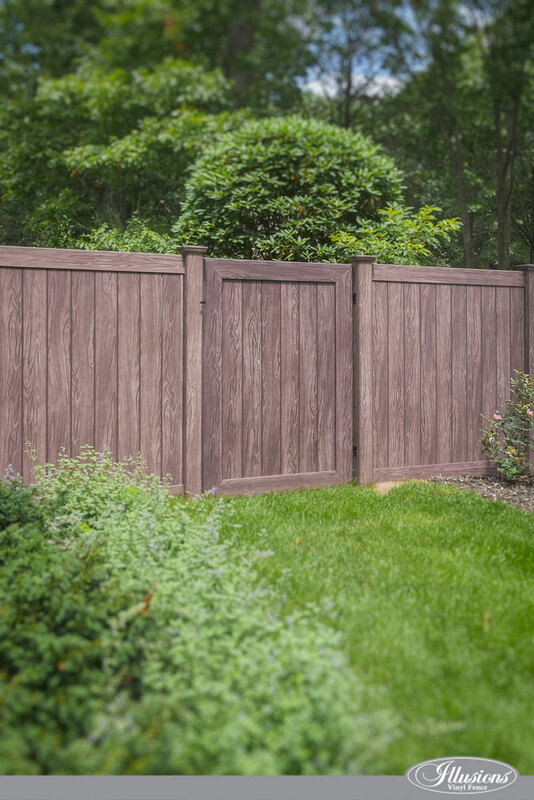 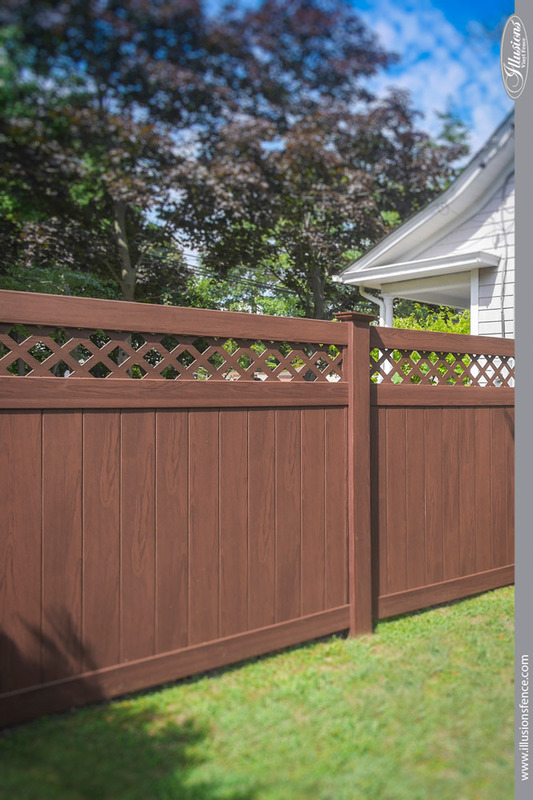 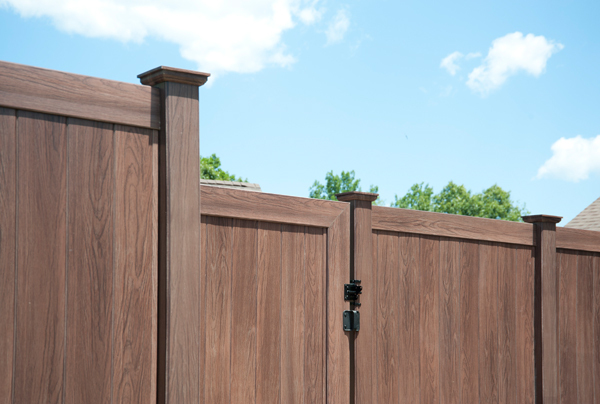 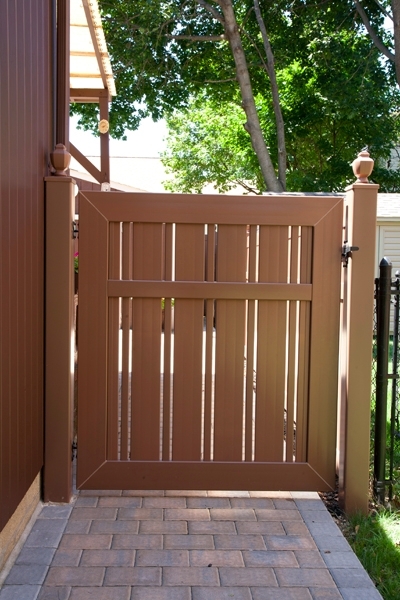 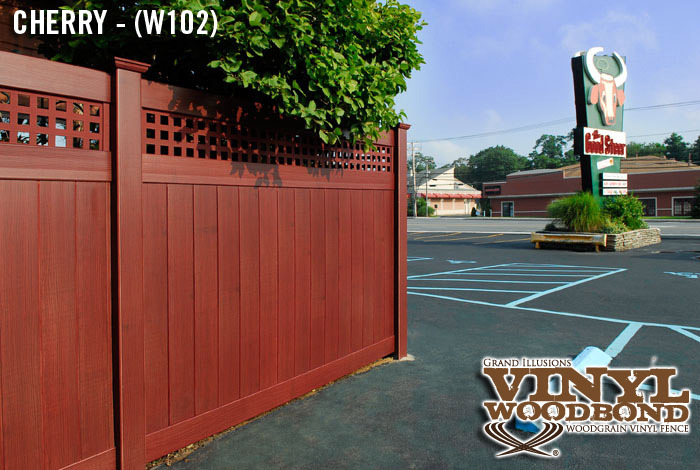 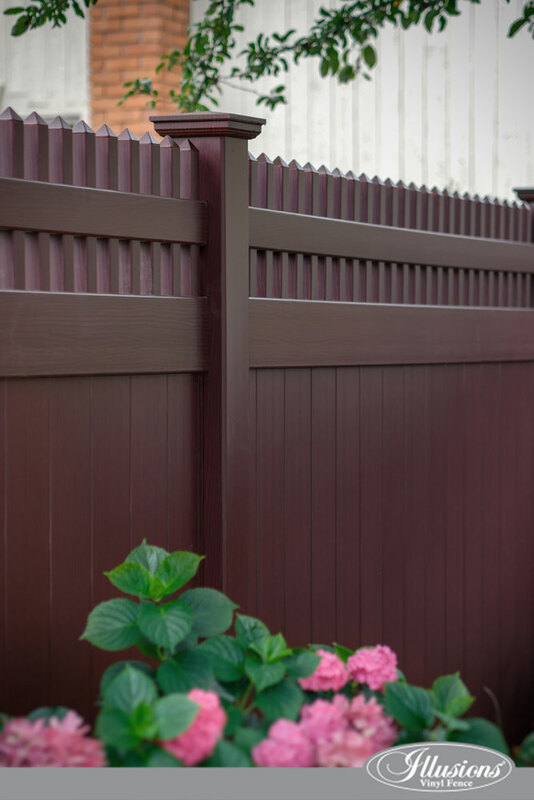 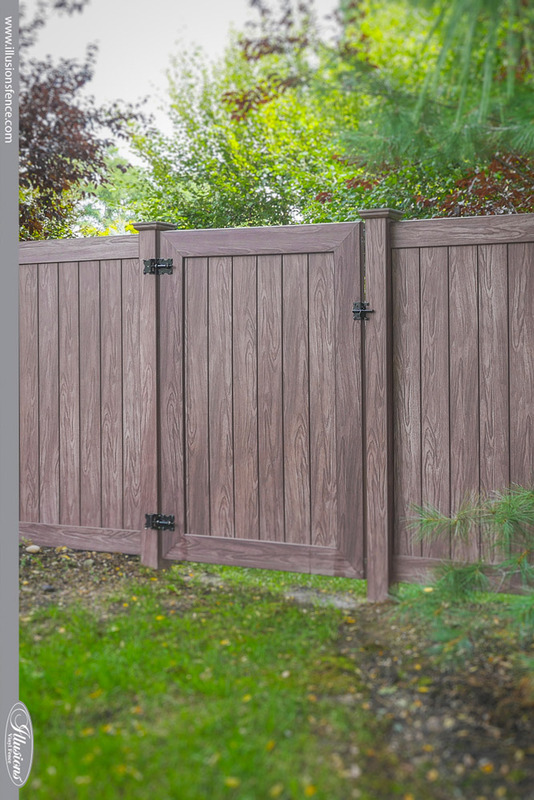 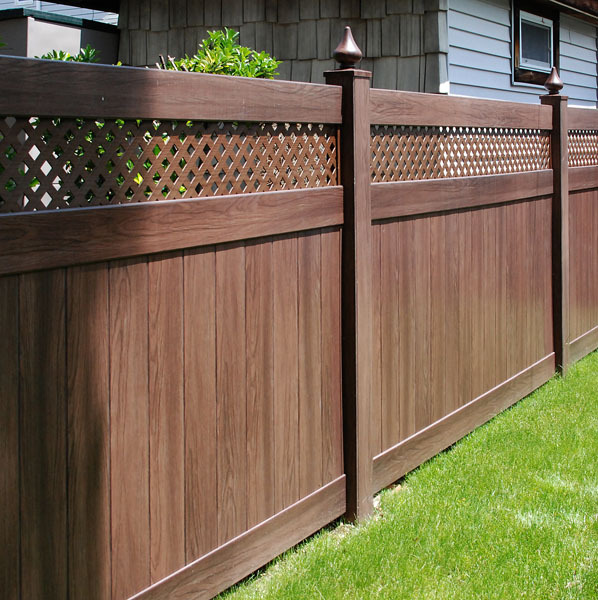 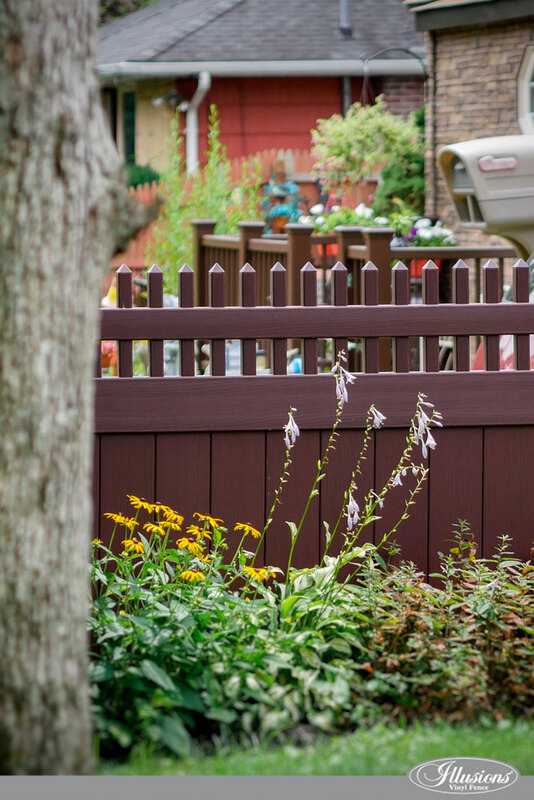 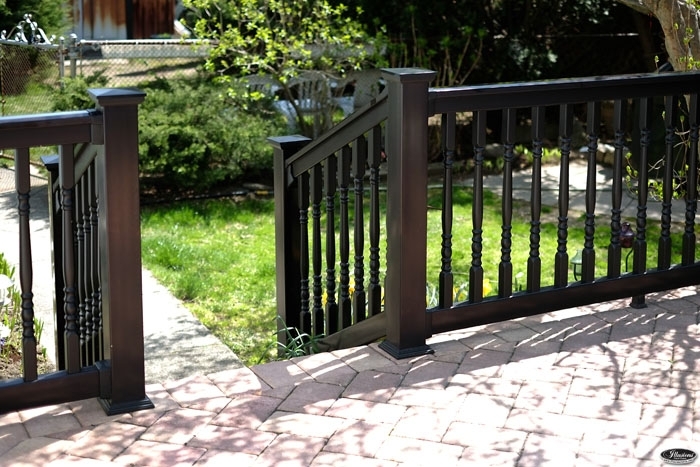 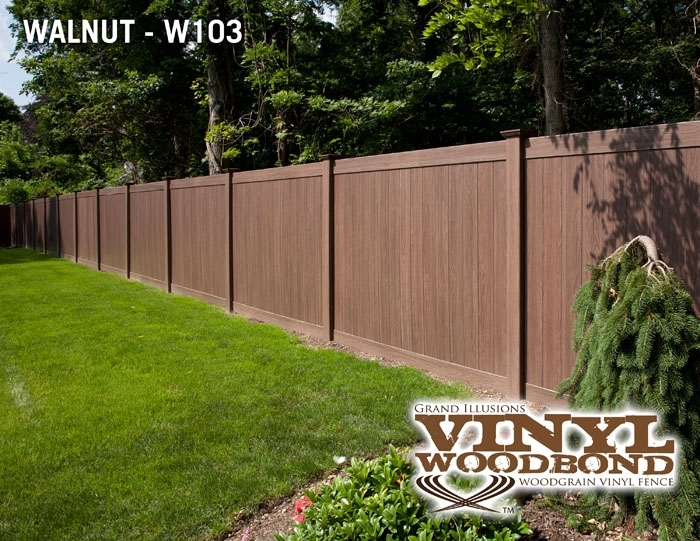 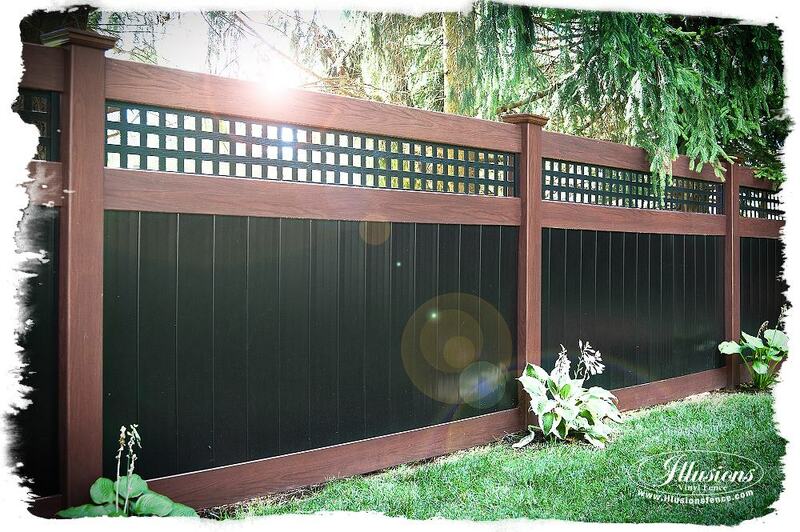 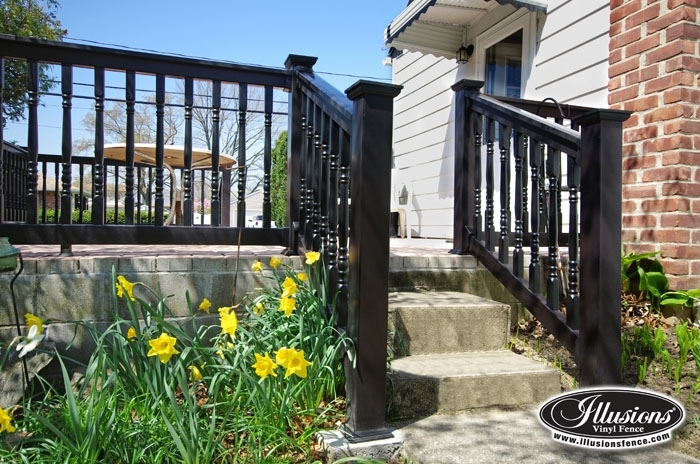 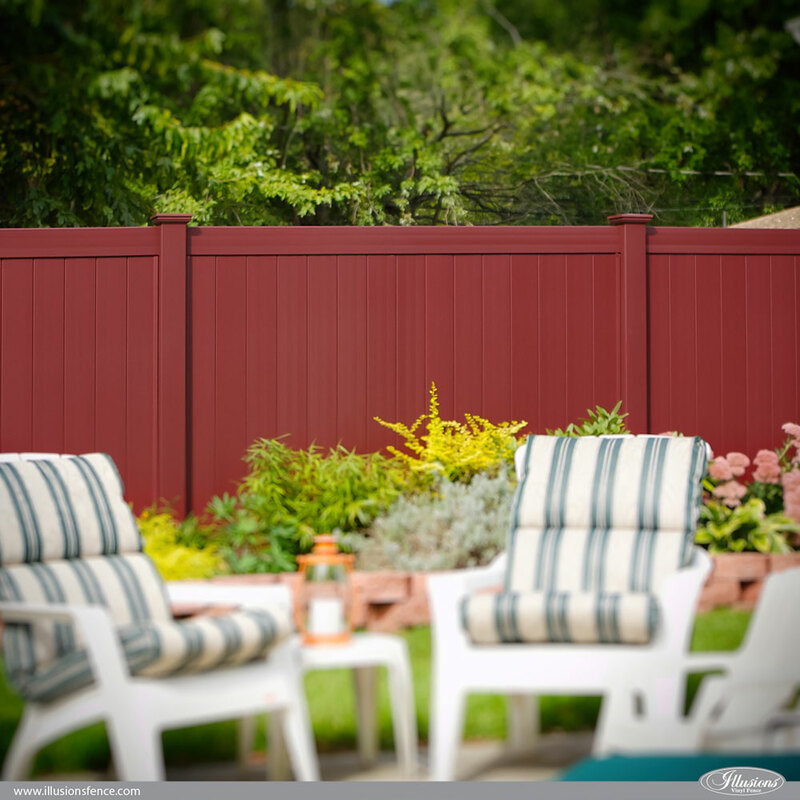 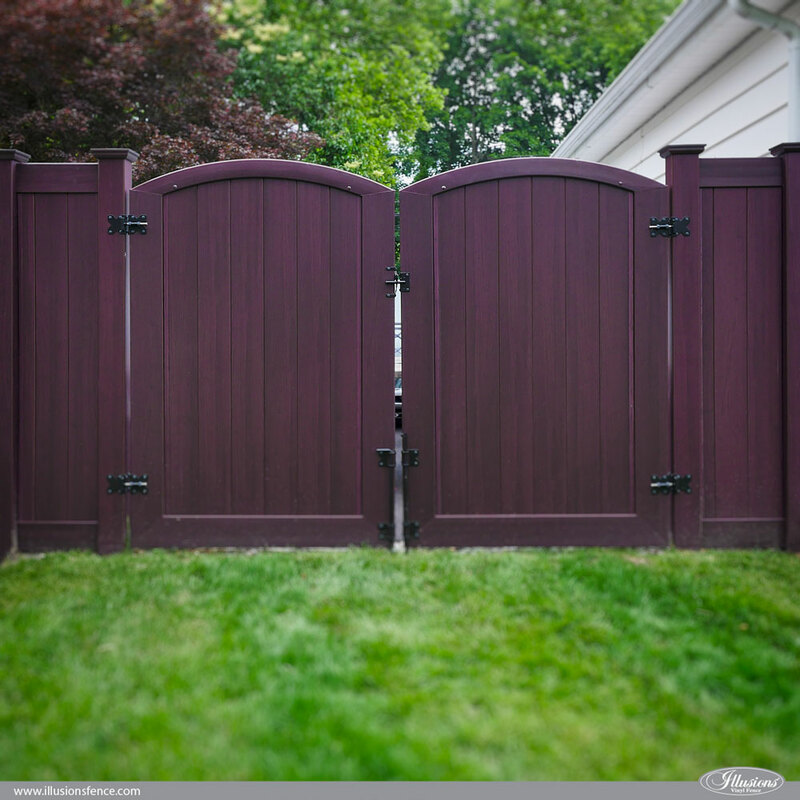 If you have been looking around the internet for the company that has those gorgeous color and wood grain PVC vinyl fences, you have found it. 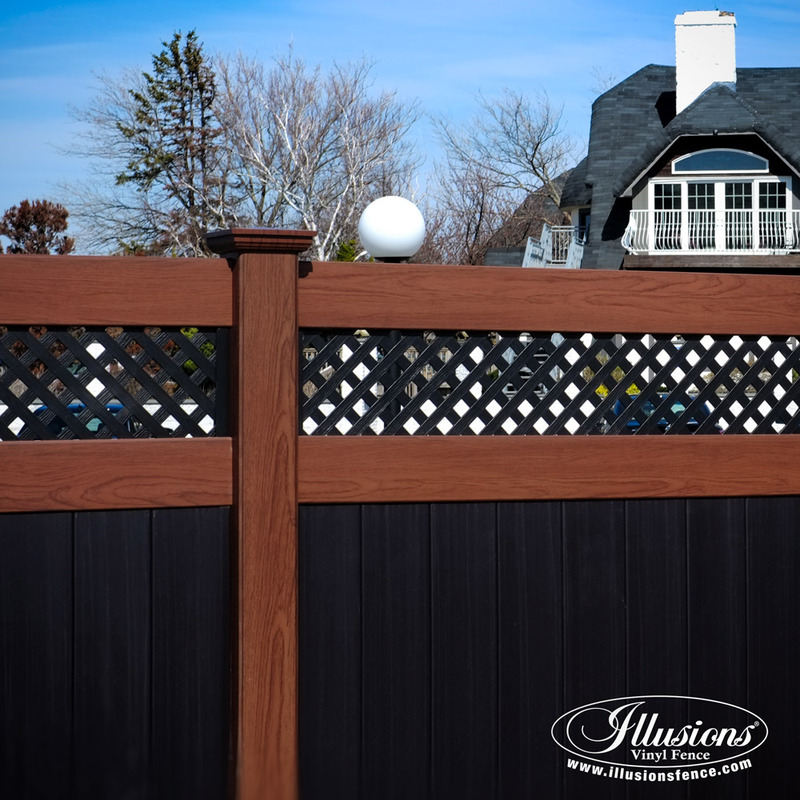 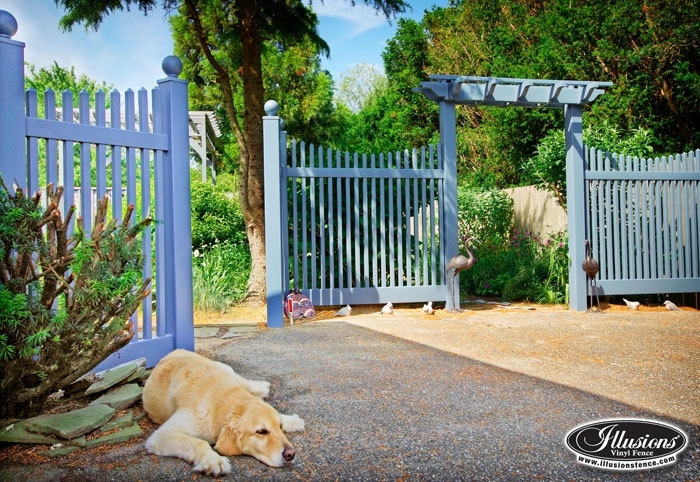 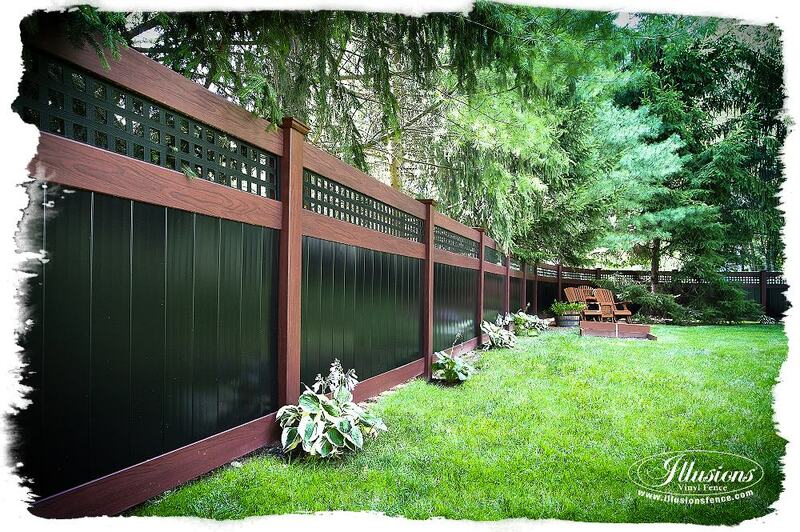 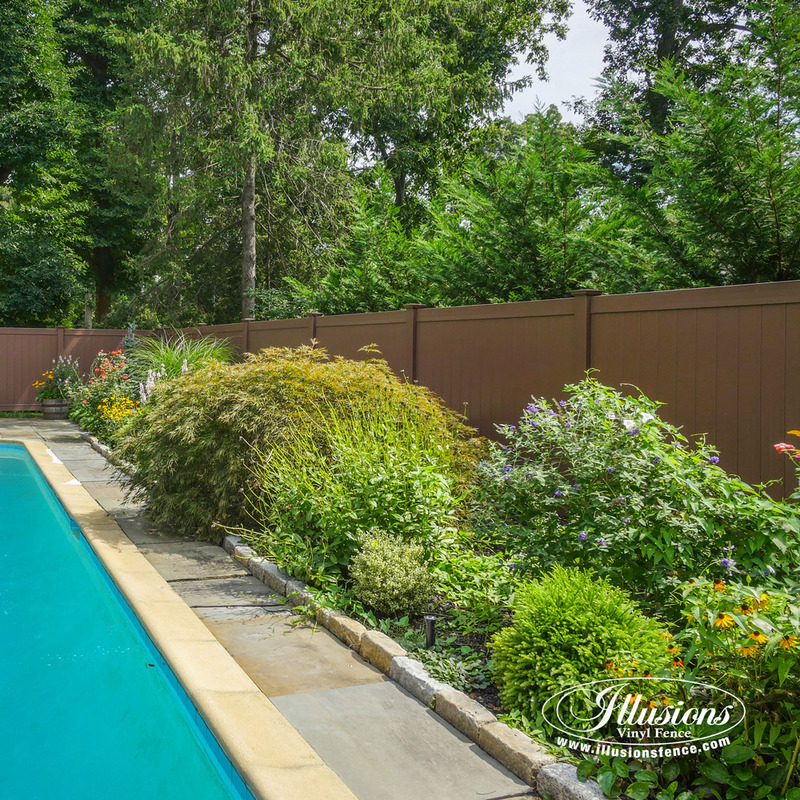 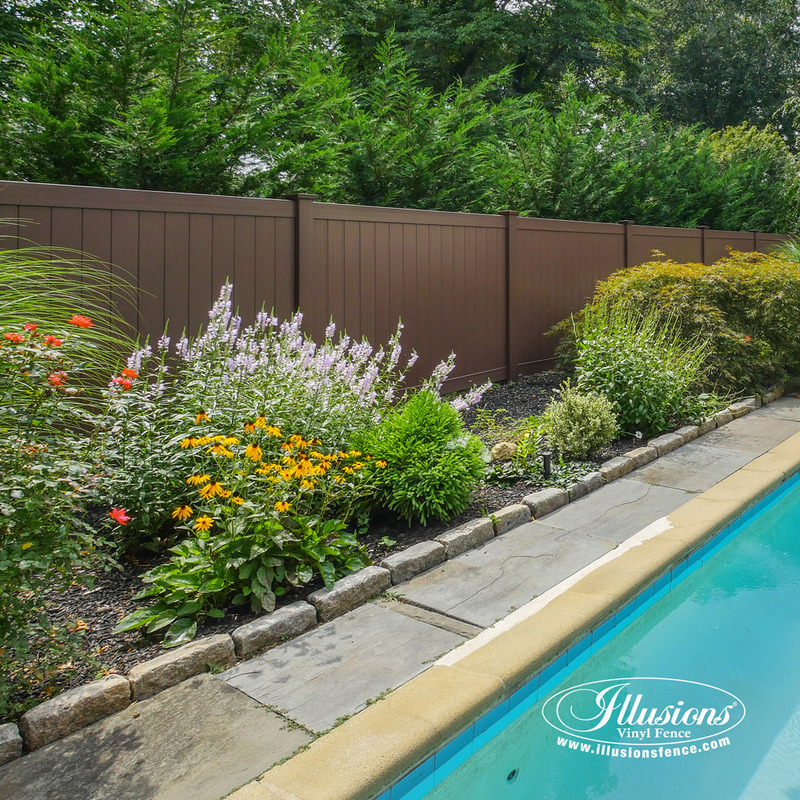 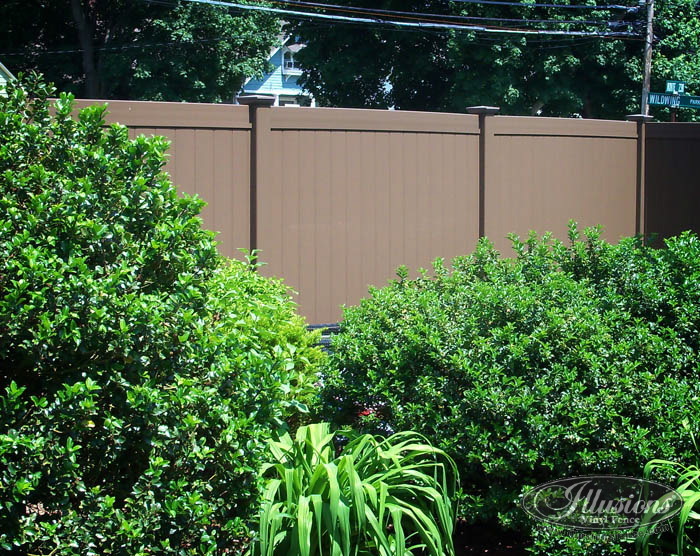 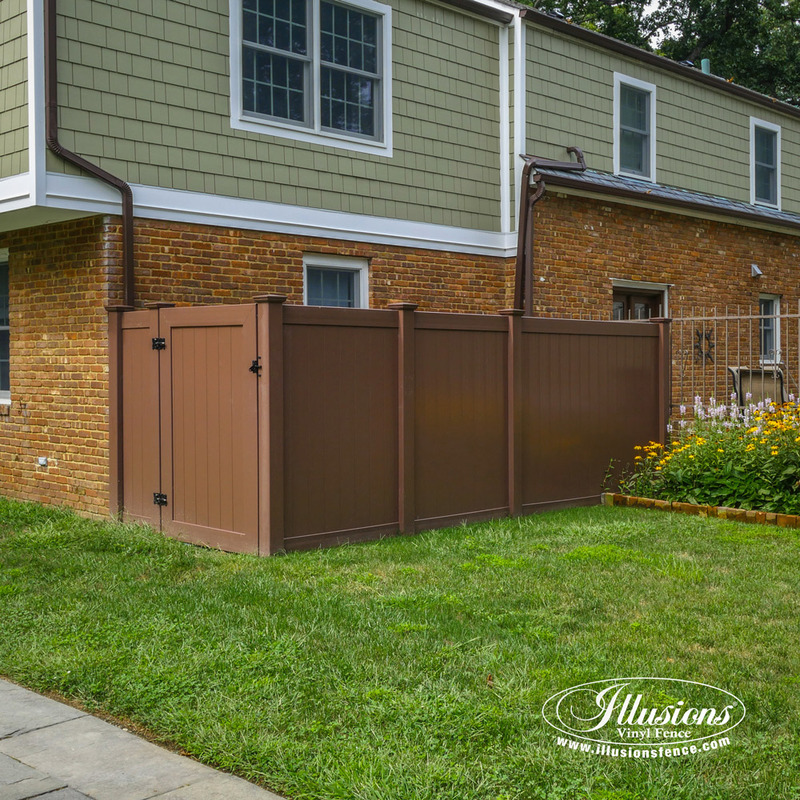 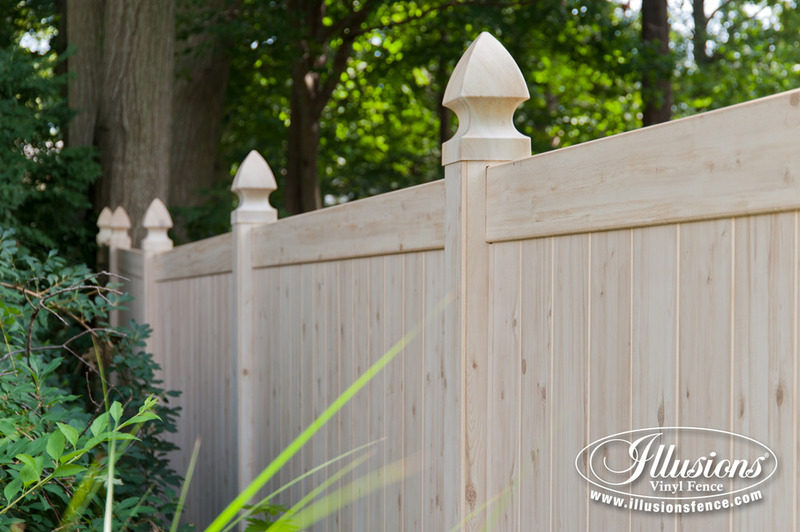 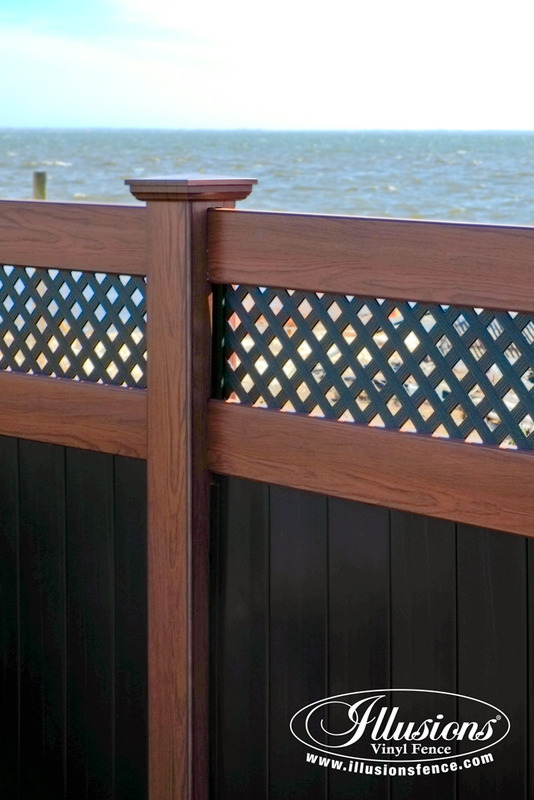 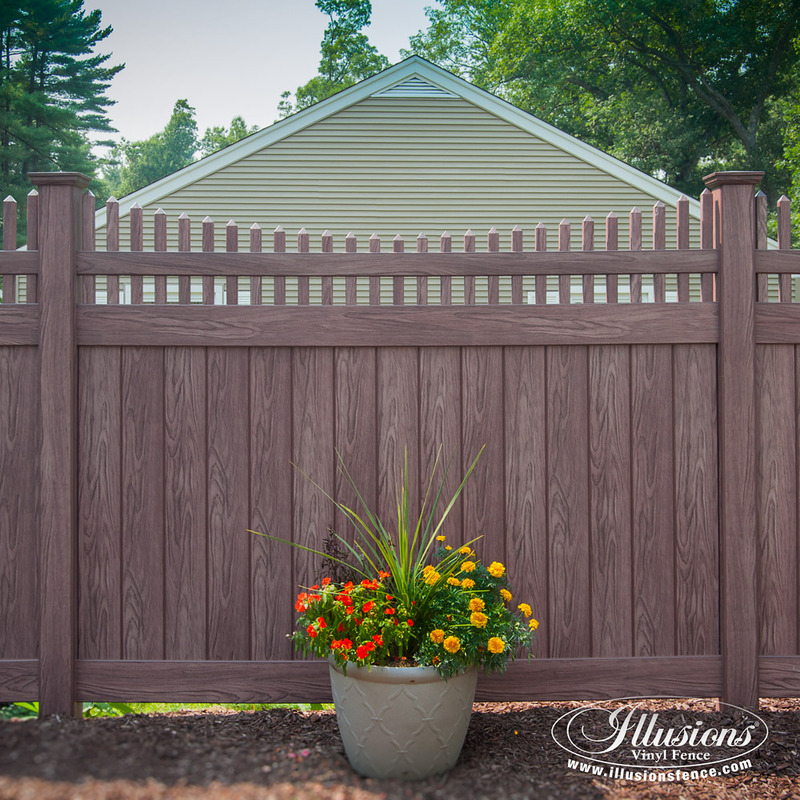 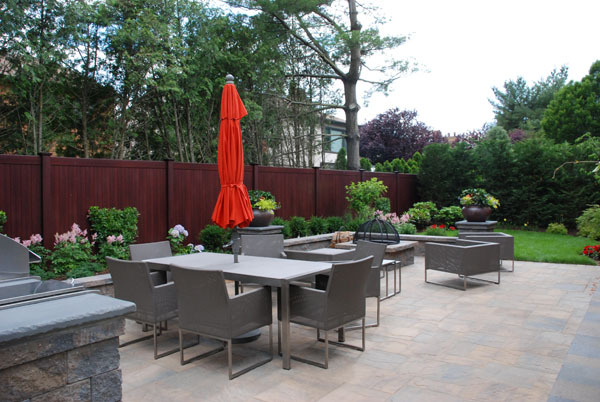 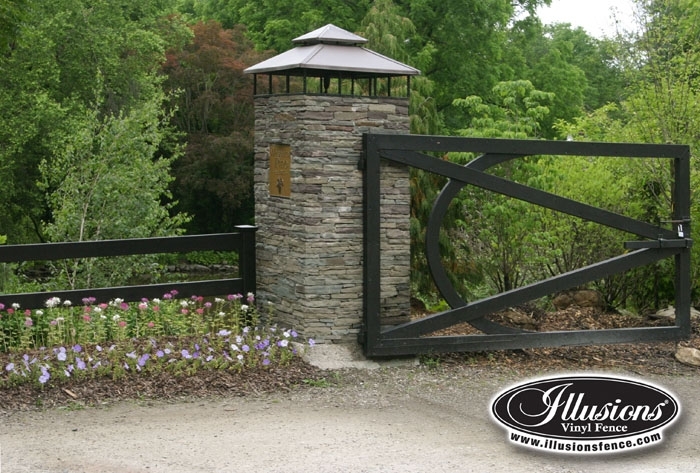 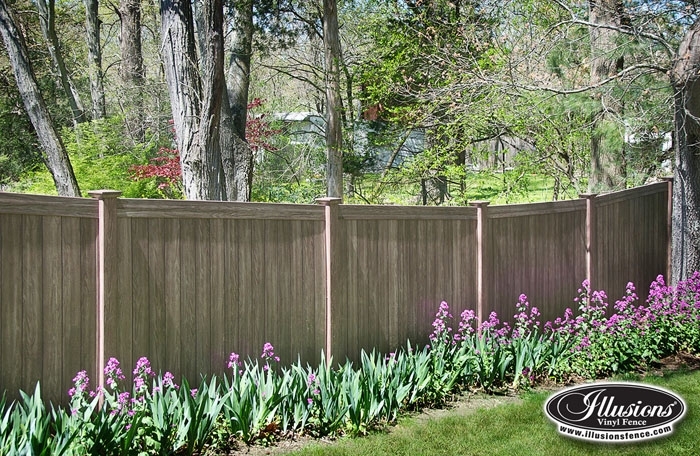 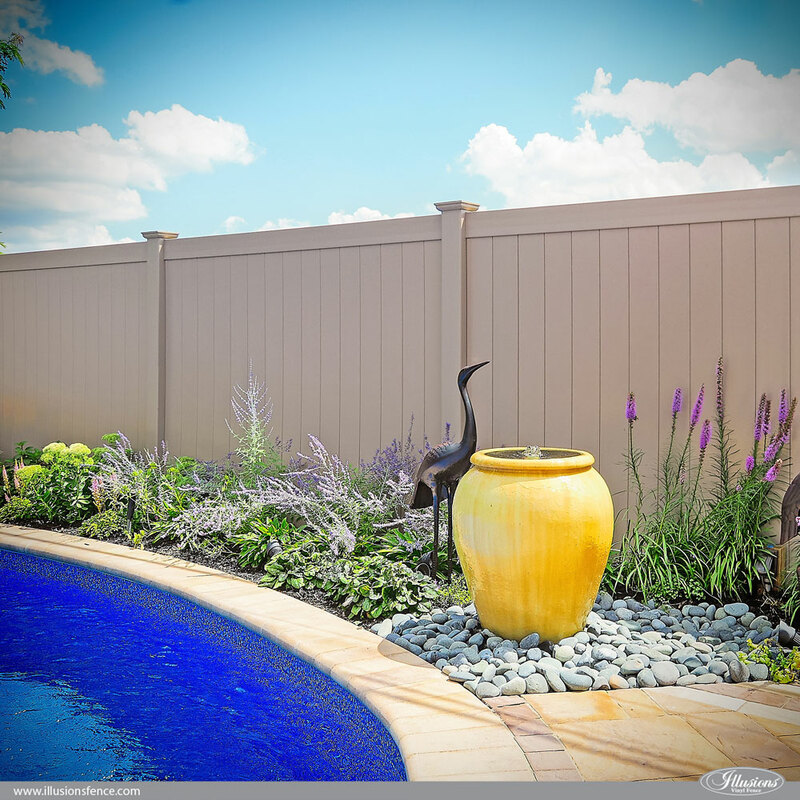 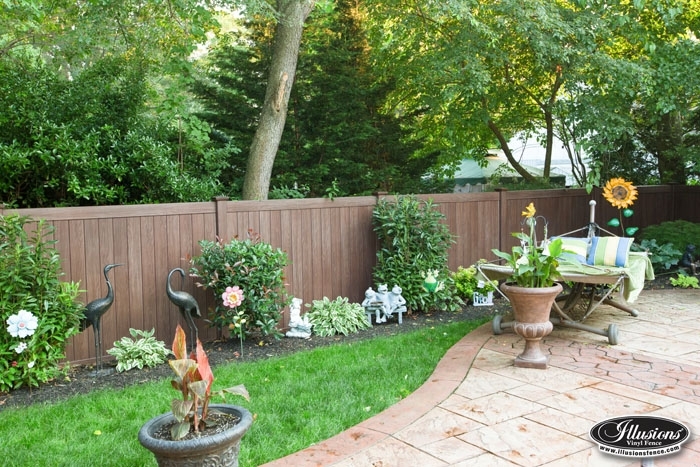 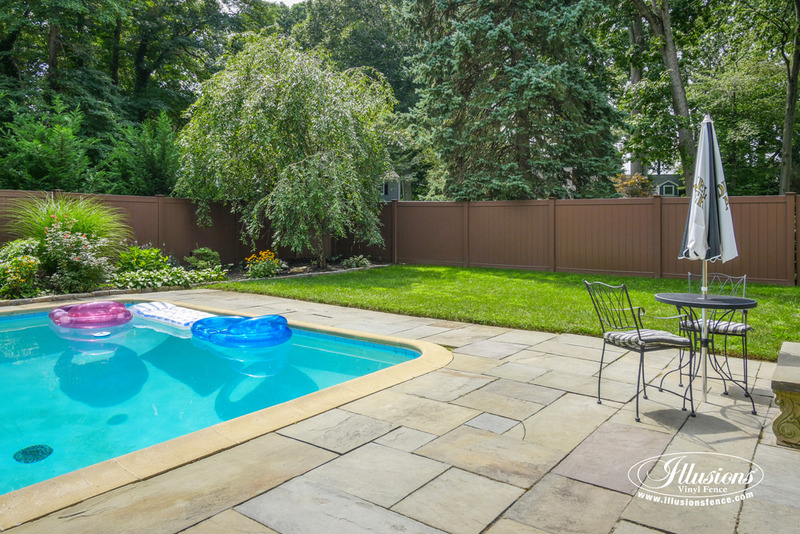 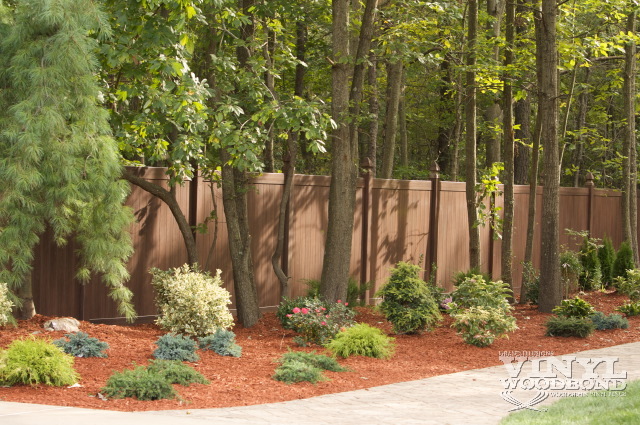 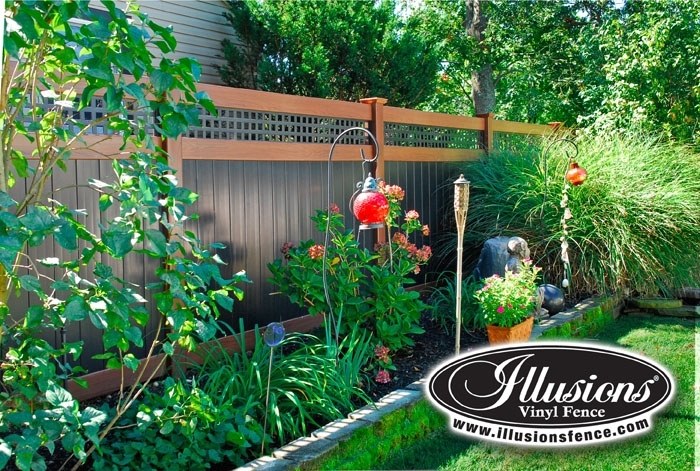 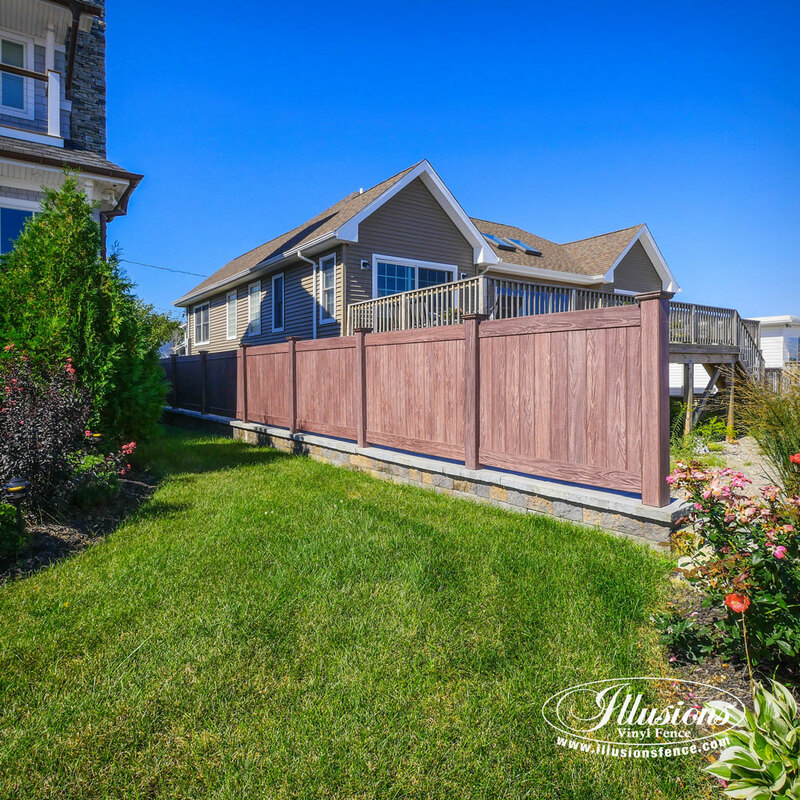 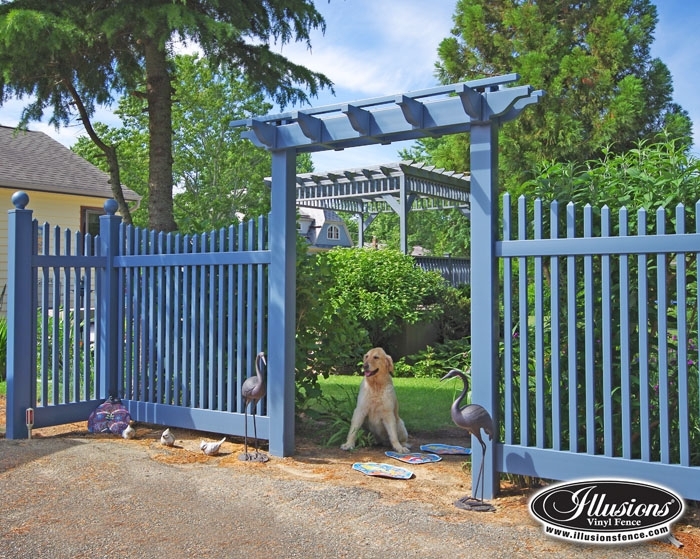 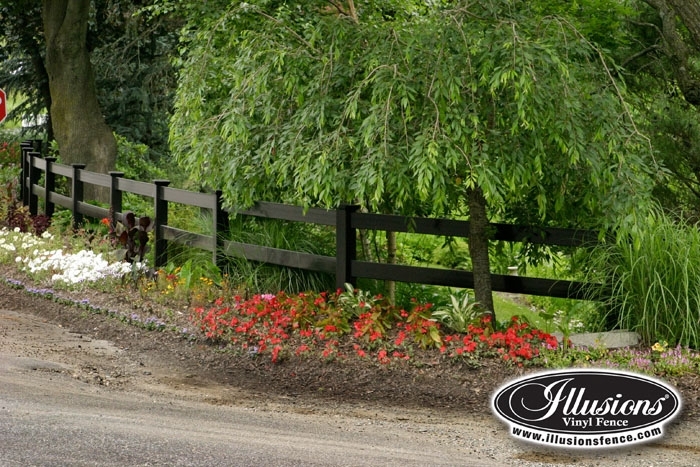 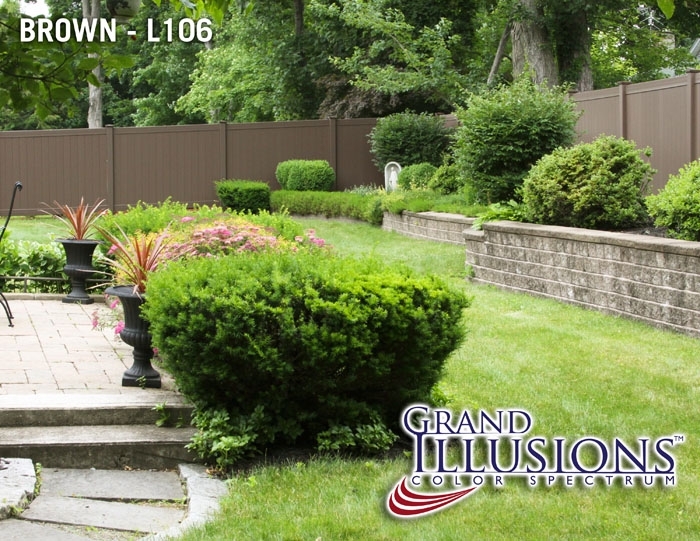 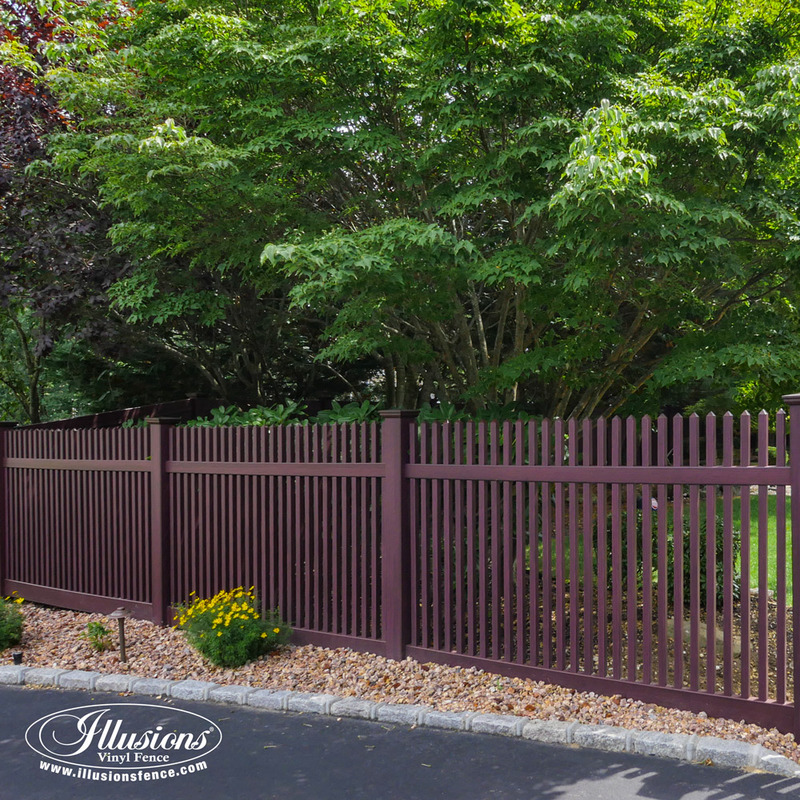 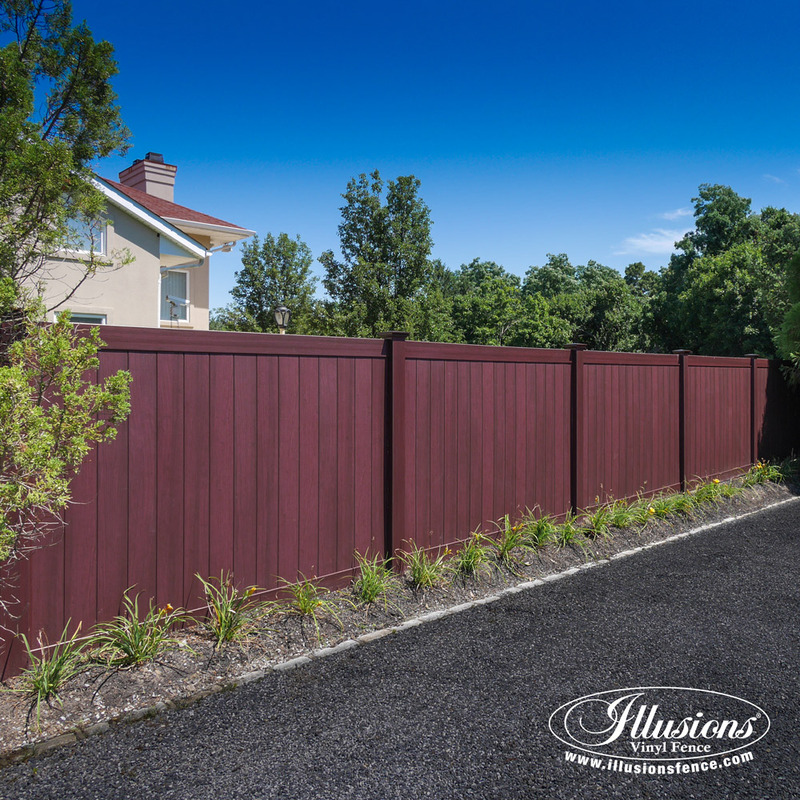 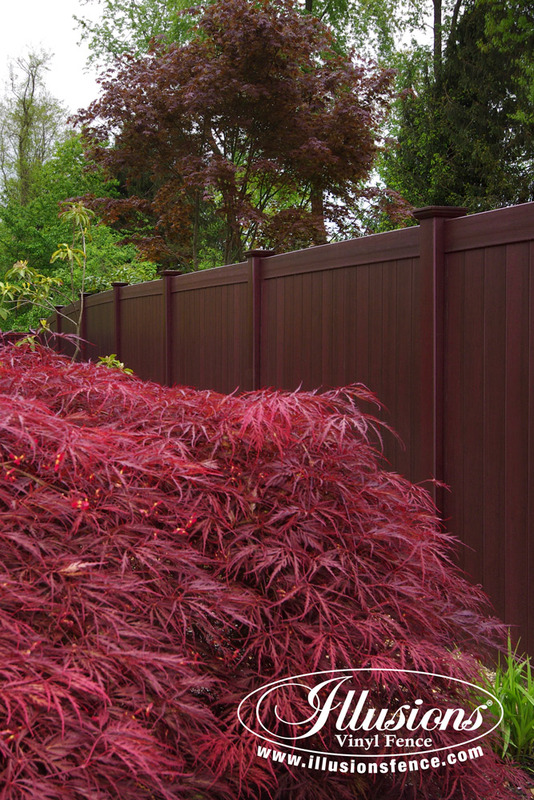 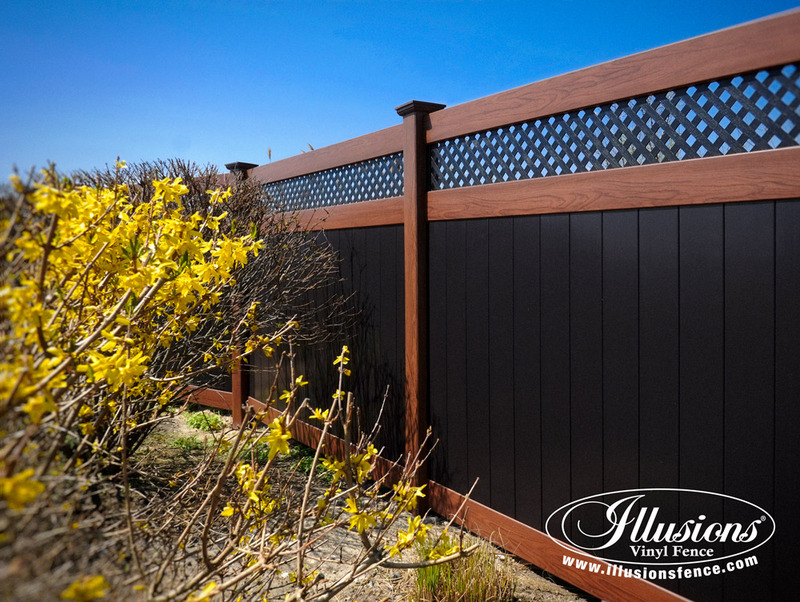 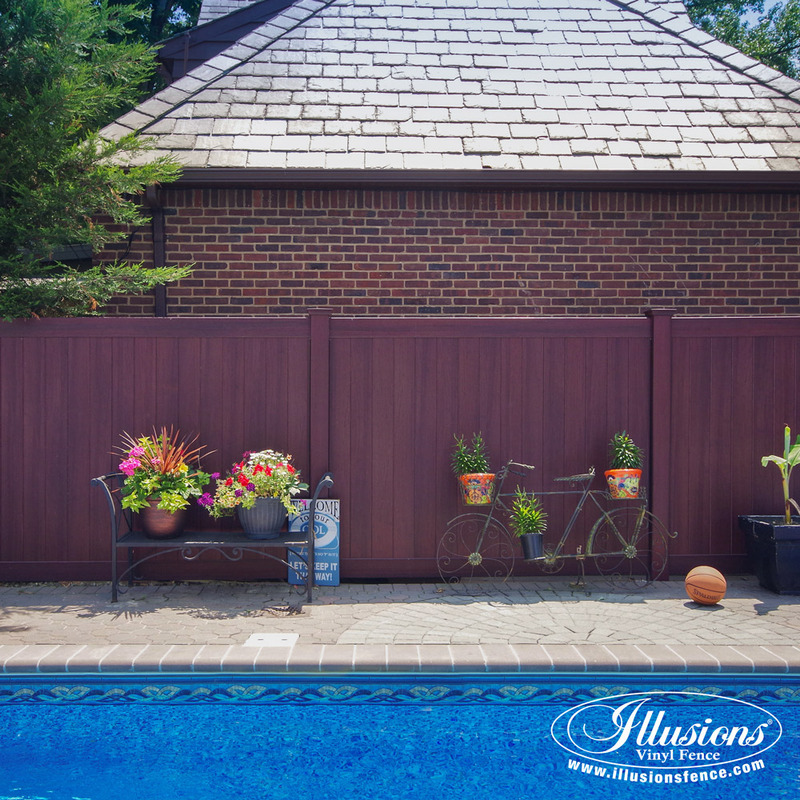 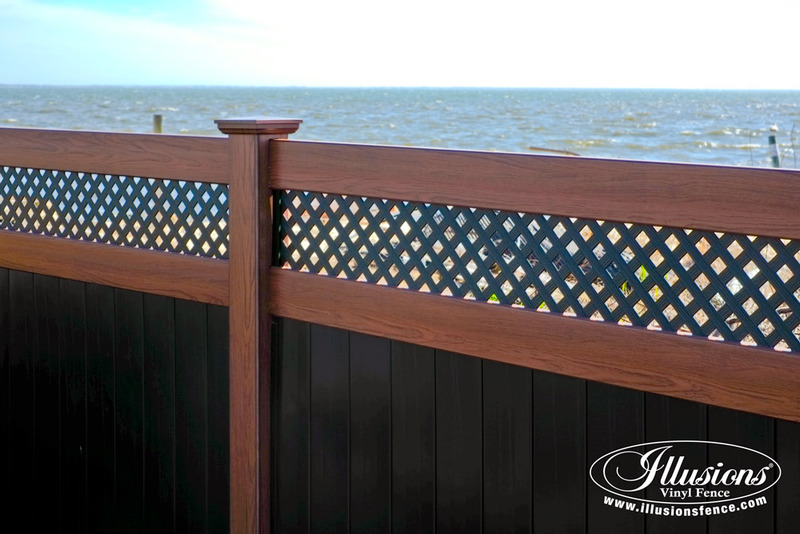 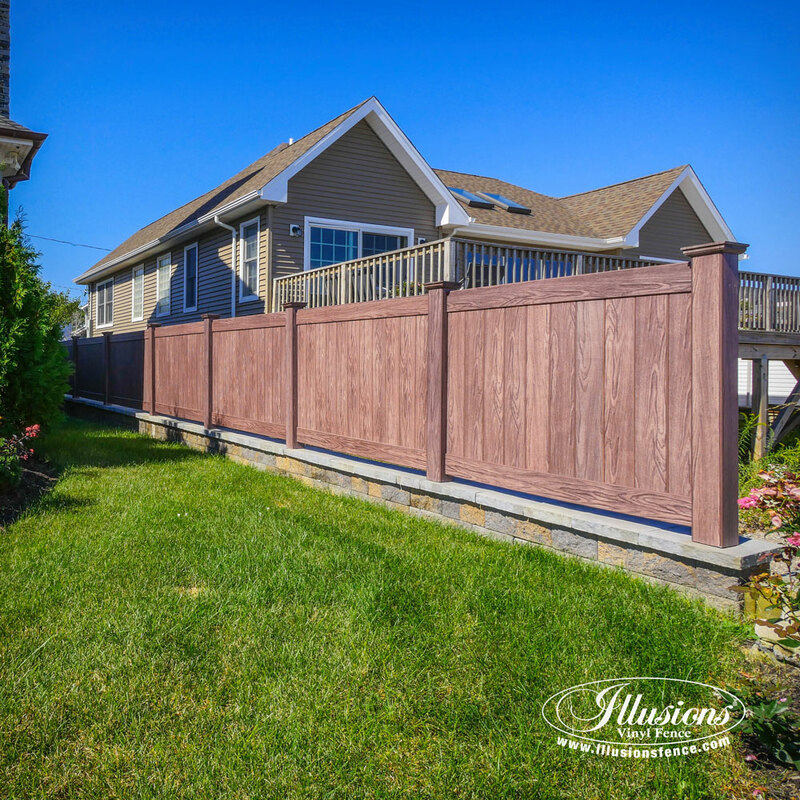 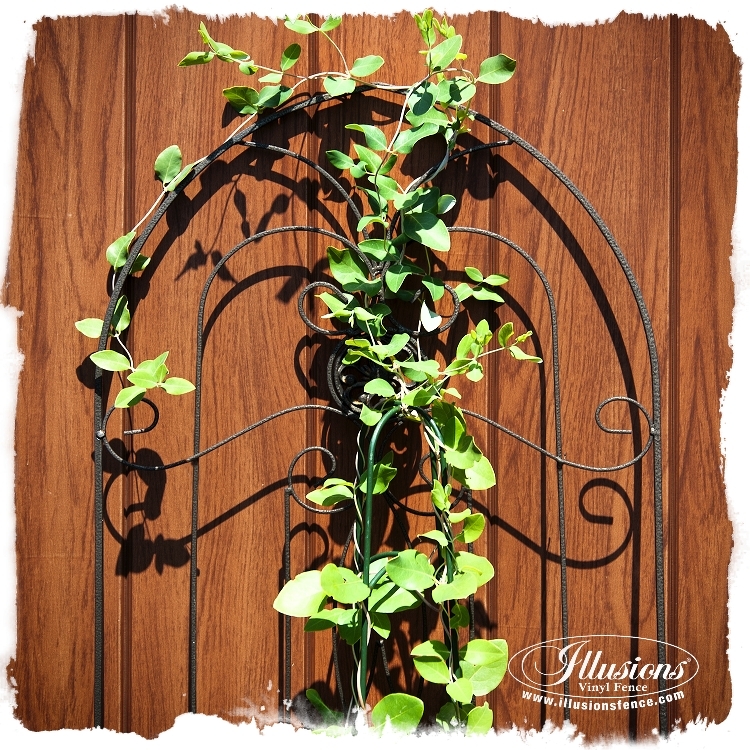 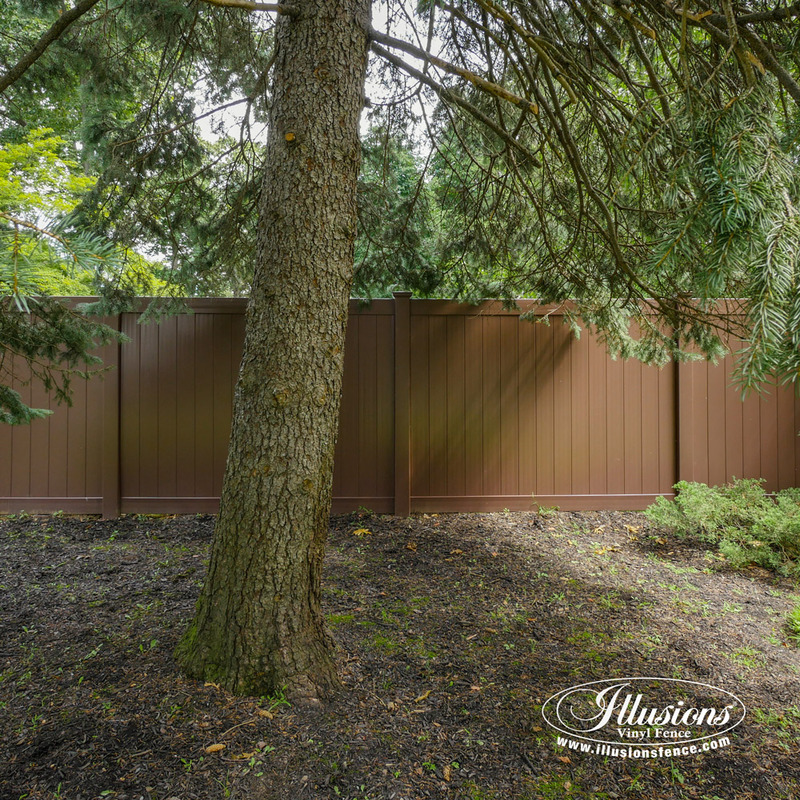 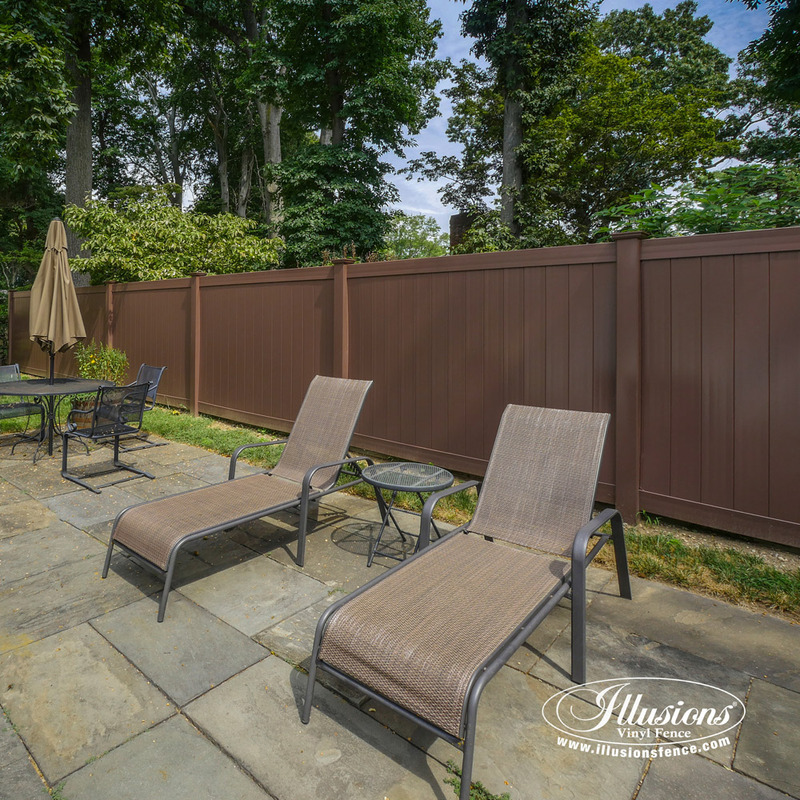 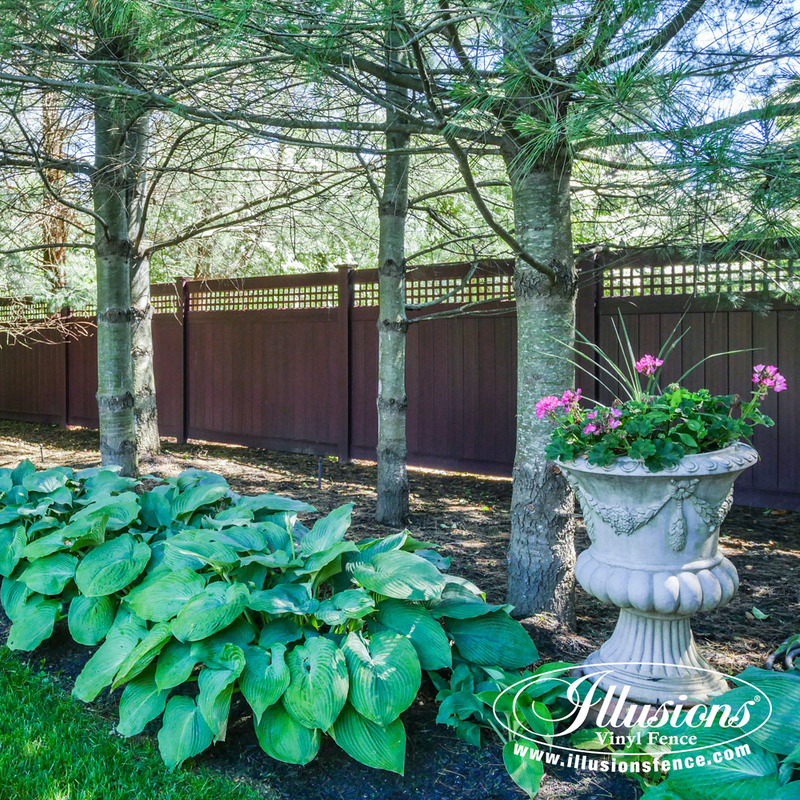 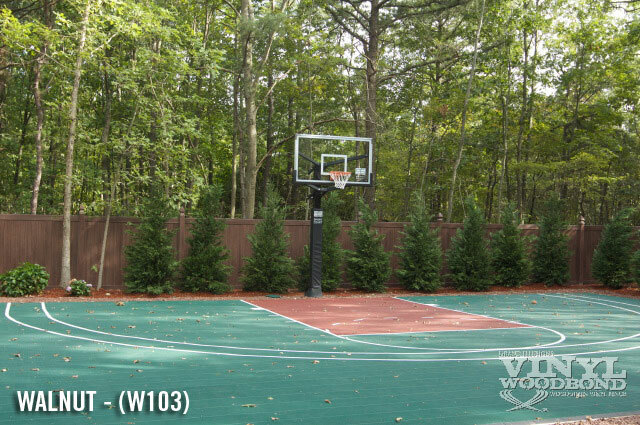 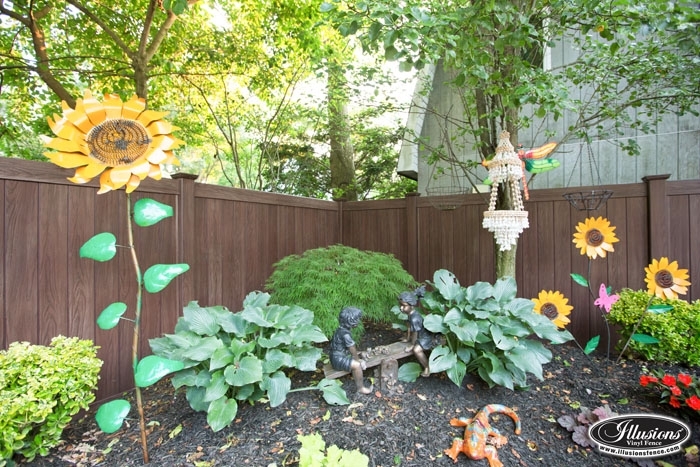 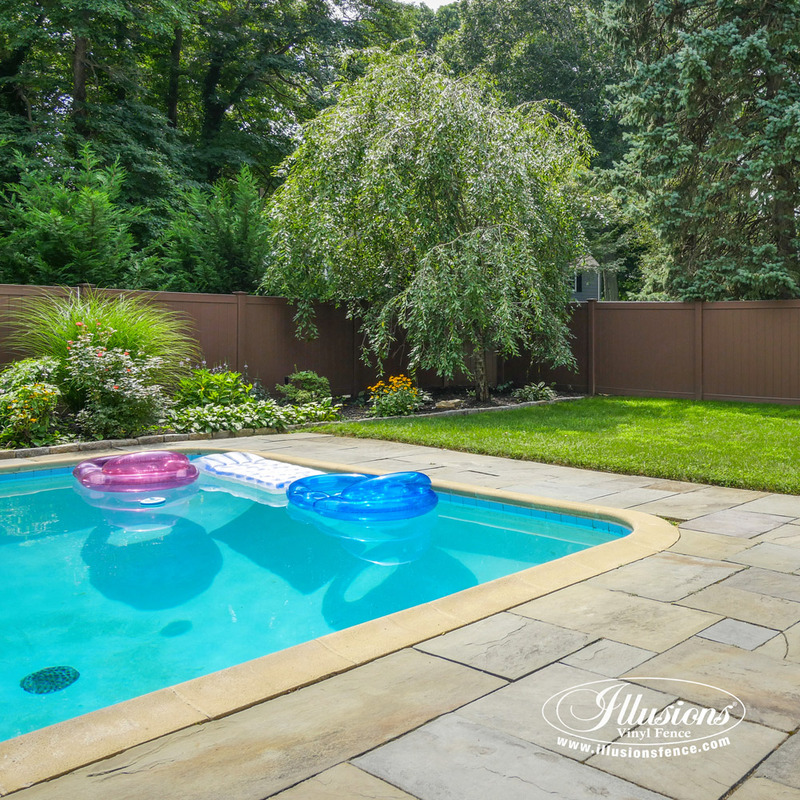 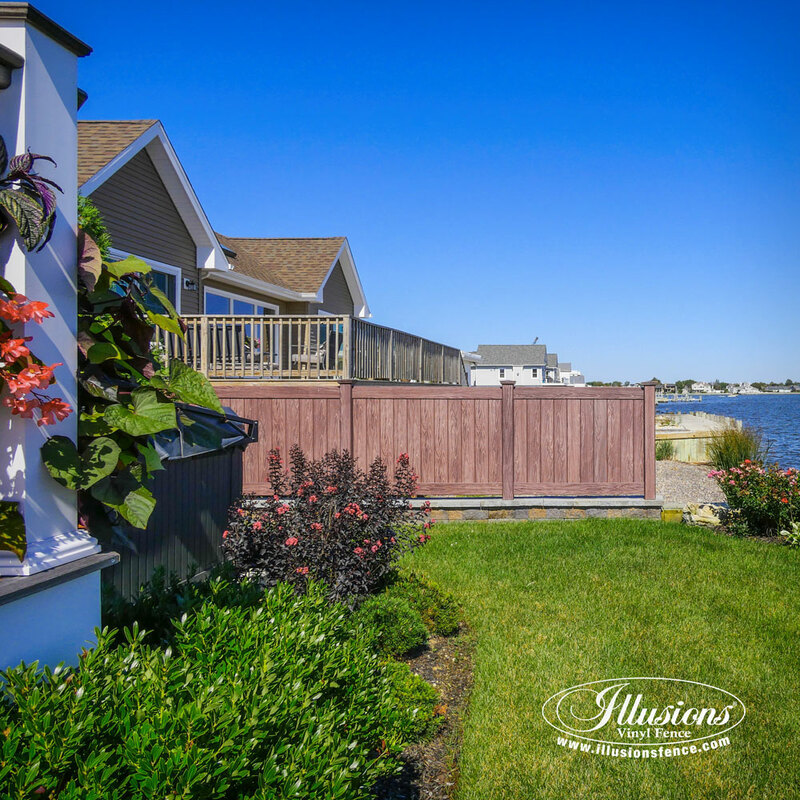 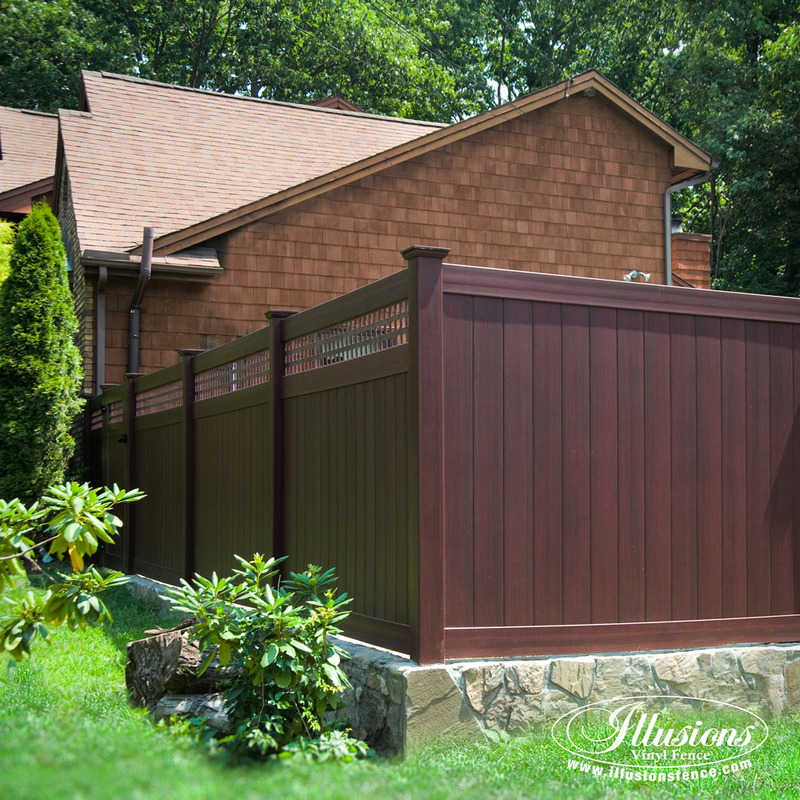 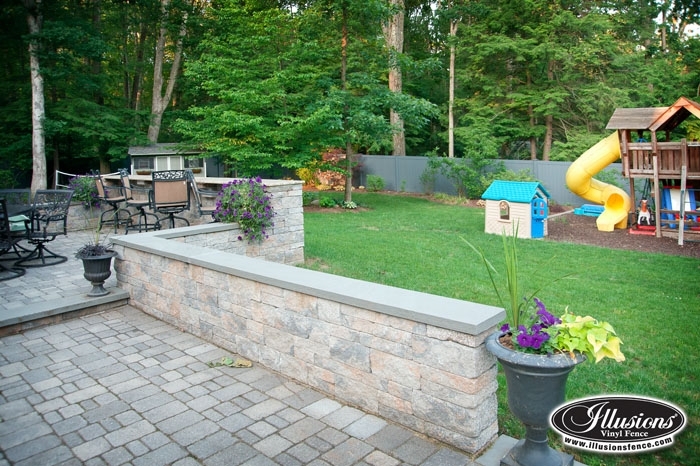 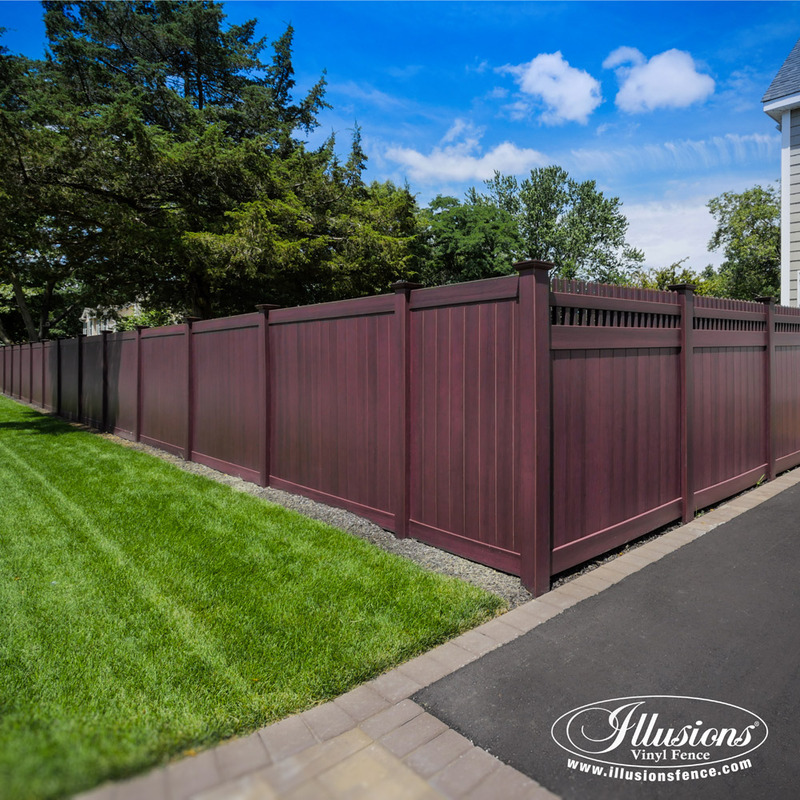 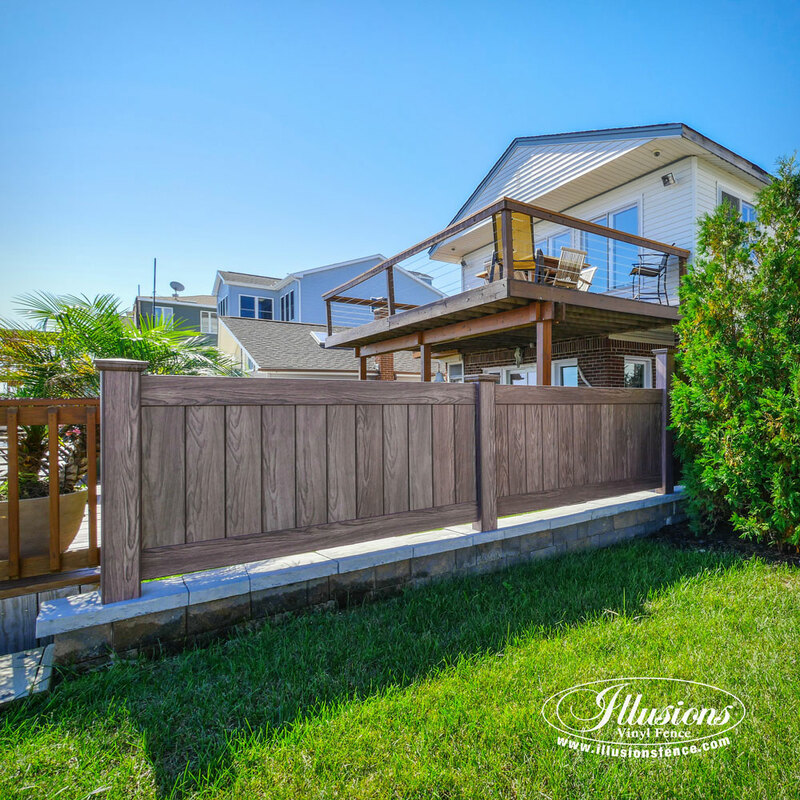 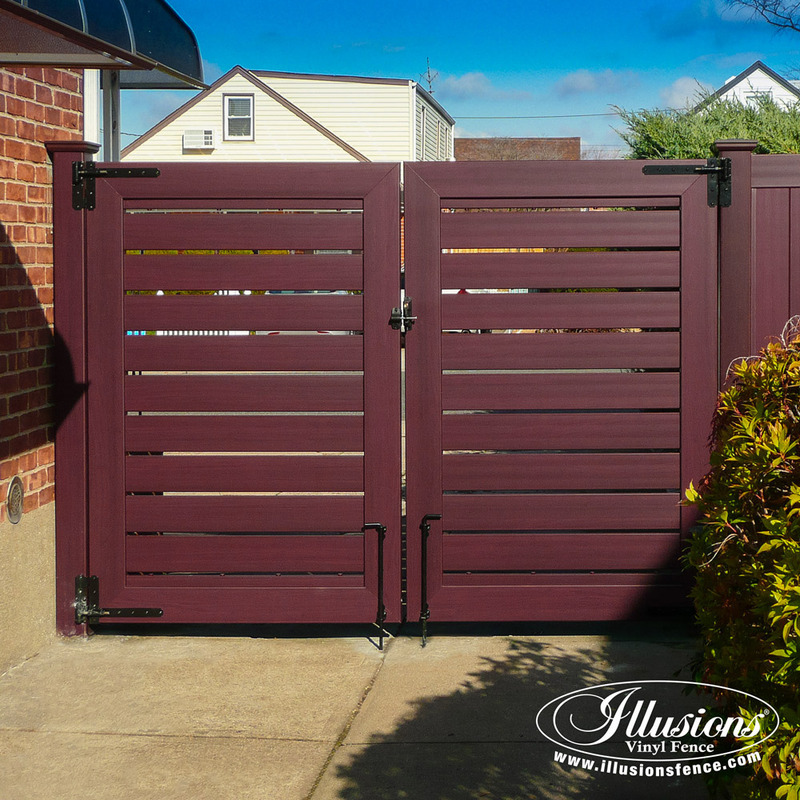 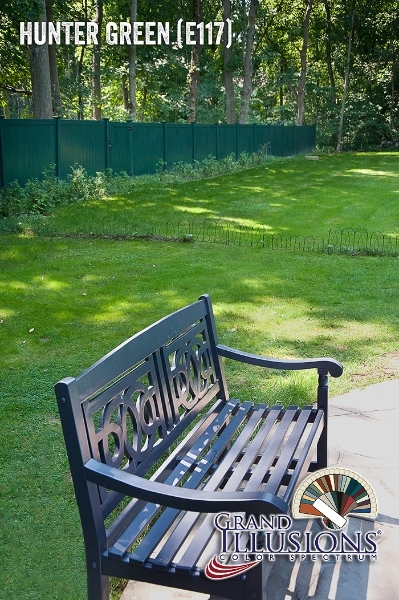 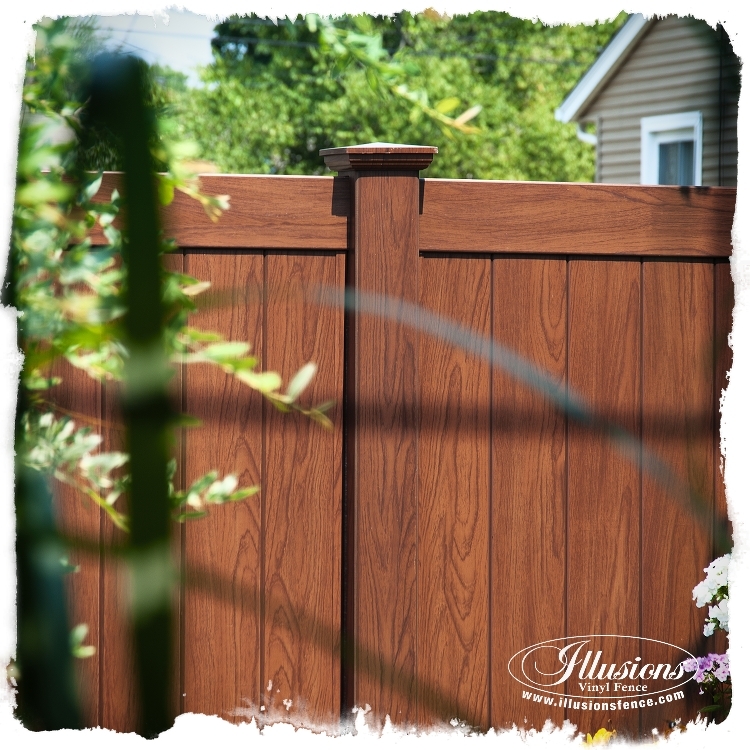 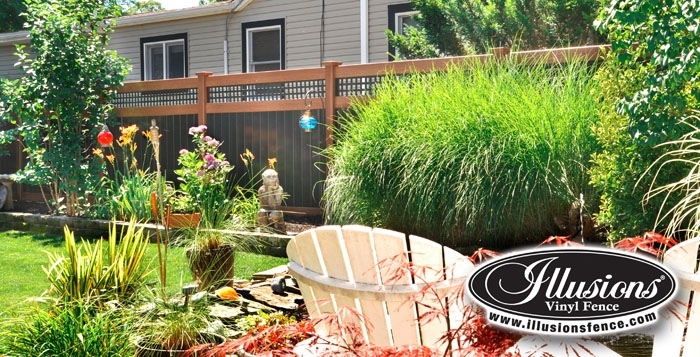 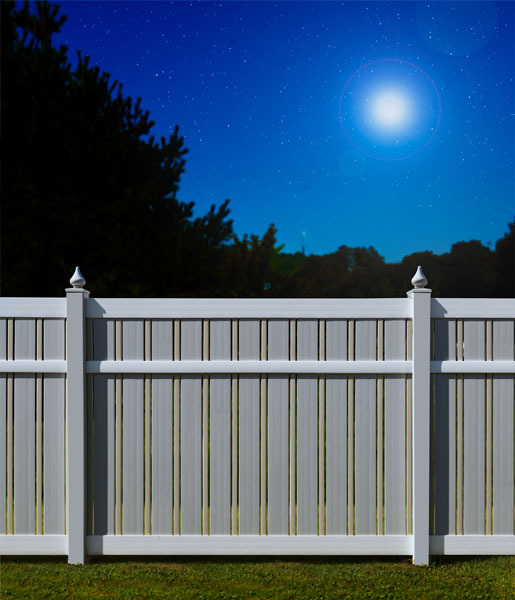 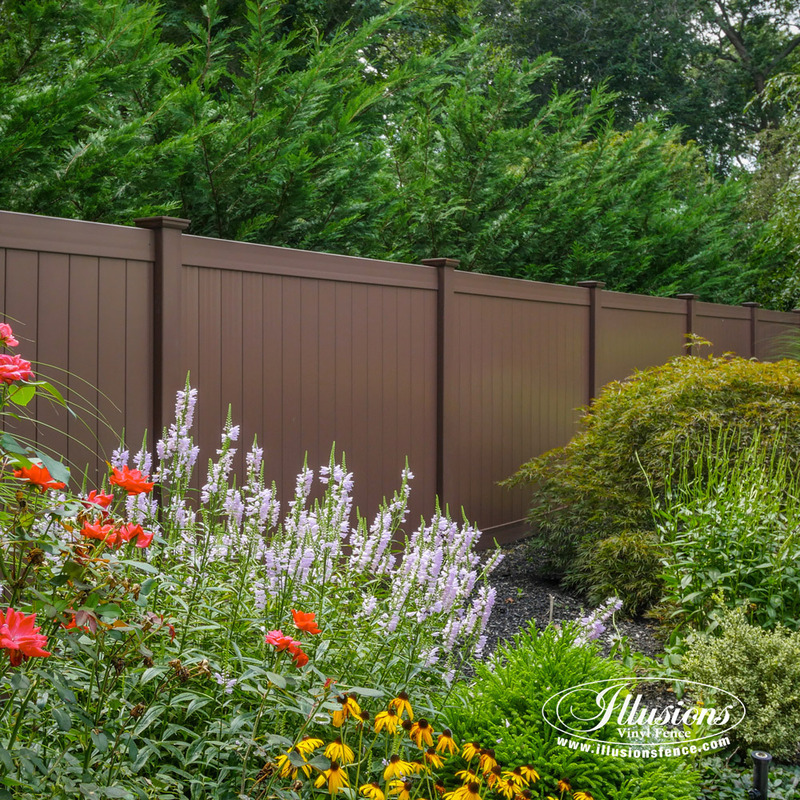 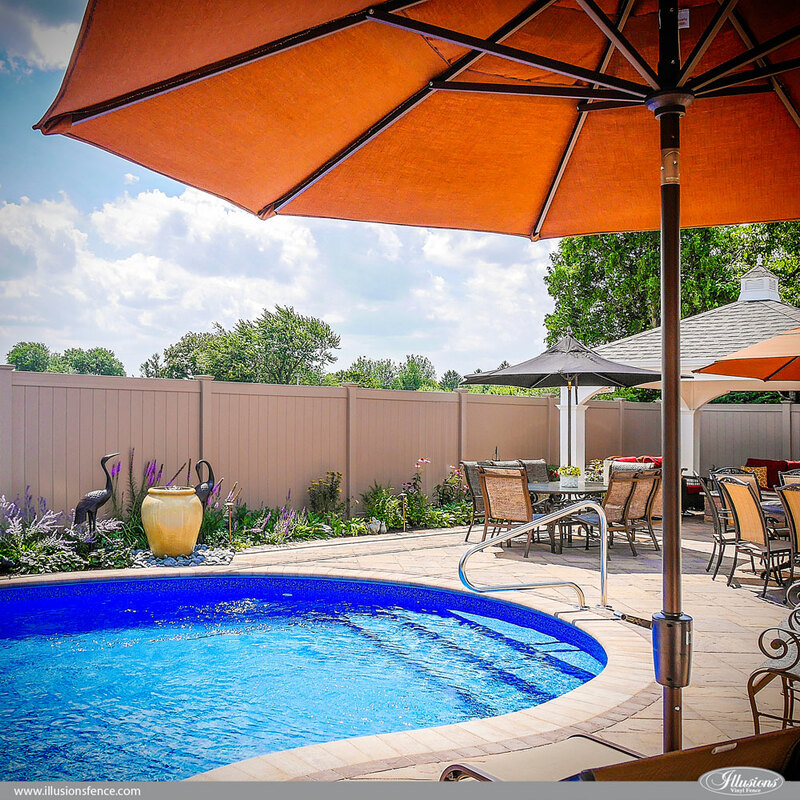 Illusions Vinyl Fence is one of the most visually stunning fences you can find. 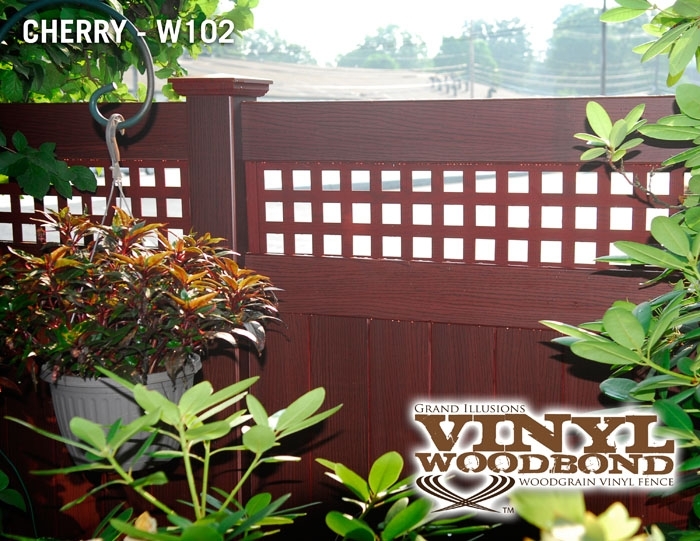 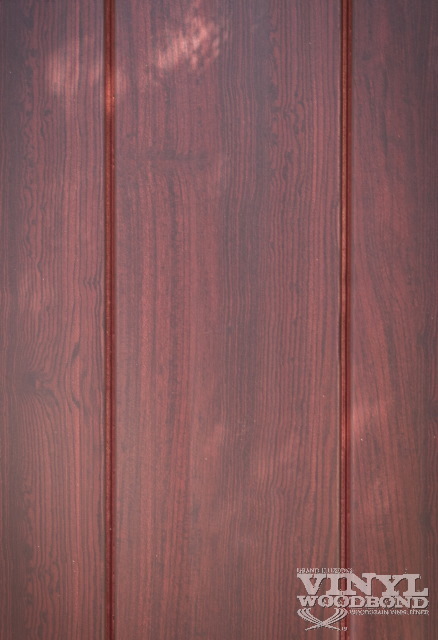 With 35 colors and 5 wood grains of vinyl, you are sure to find what you’re looking for here. 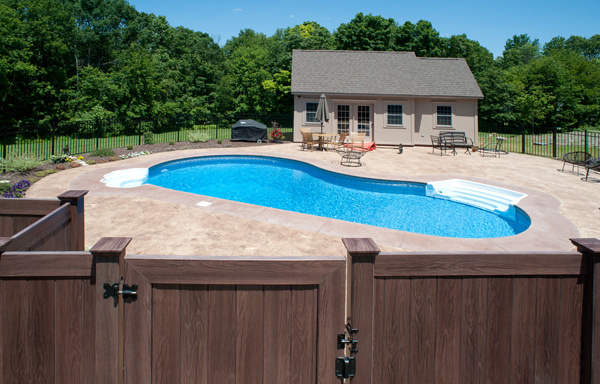 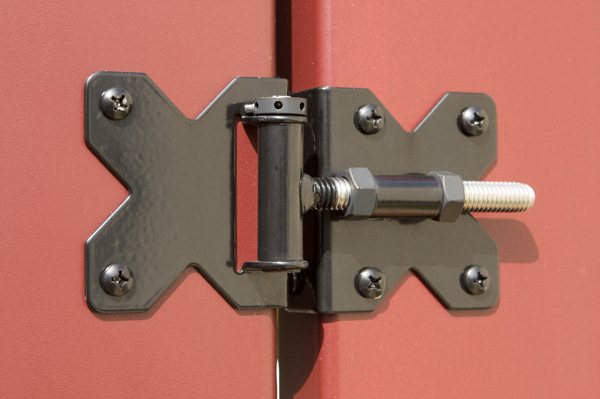 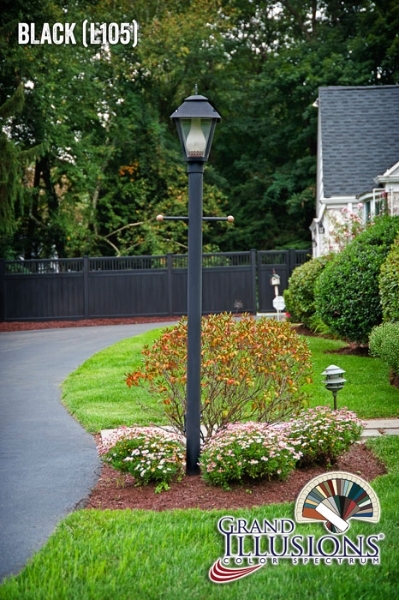 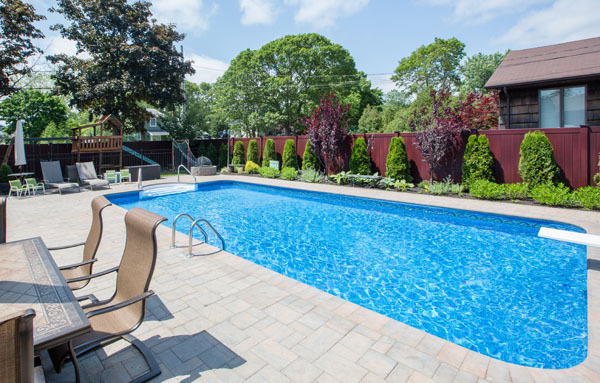 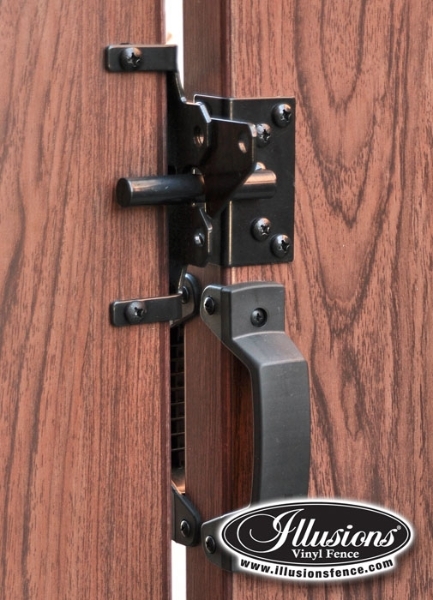 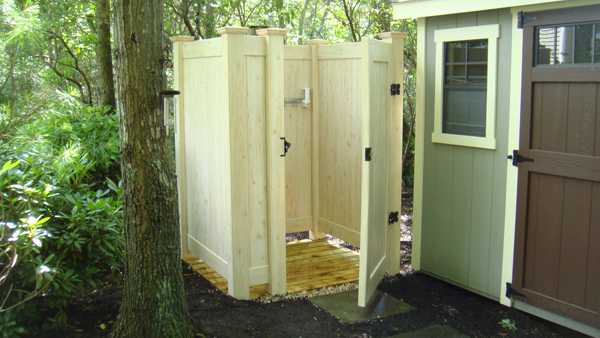 Below is a gallery of a sampling of install photos of this amazing product. 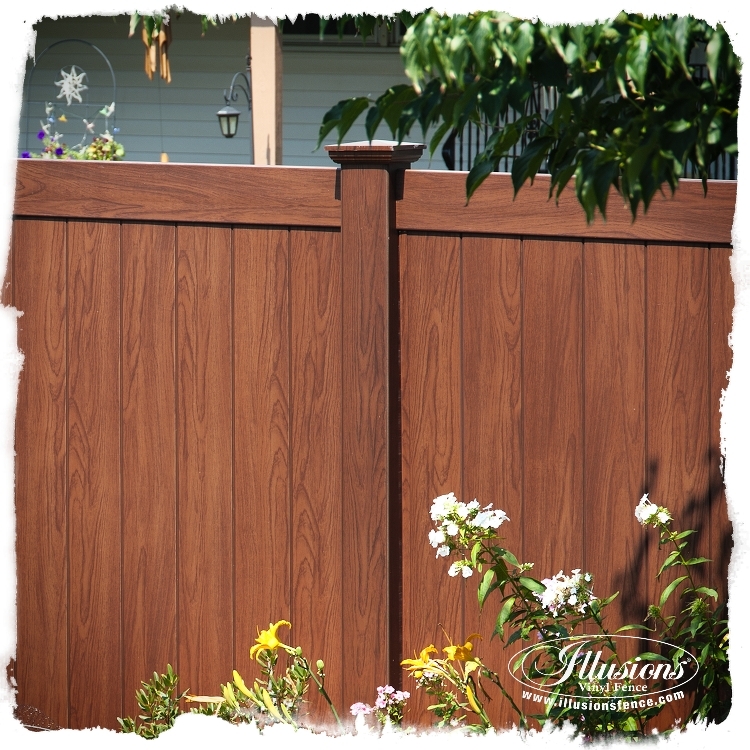 You can mix and match your colors and wood grains into infinite combinations. 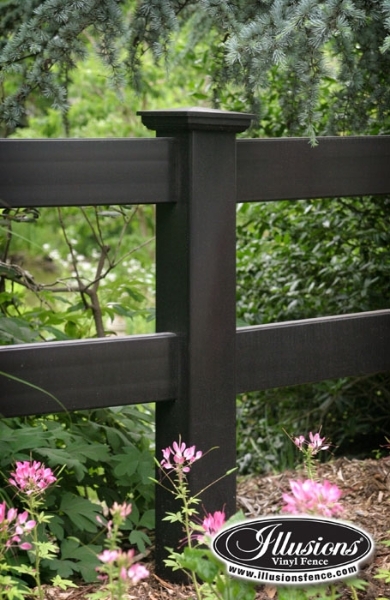 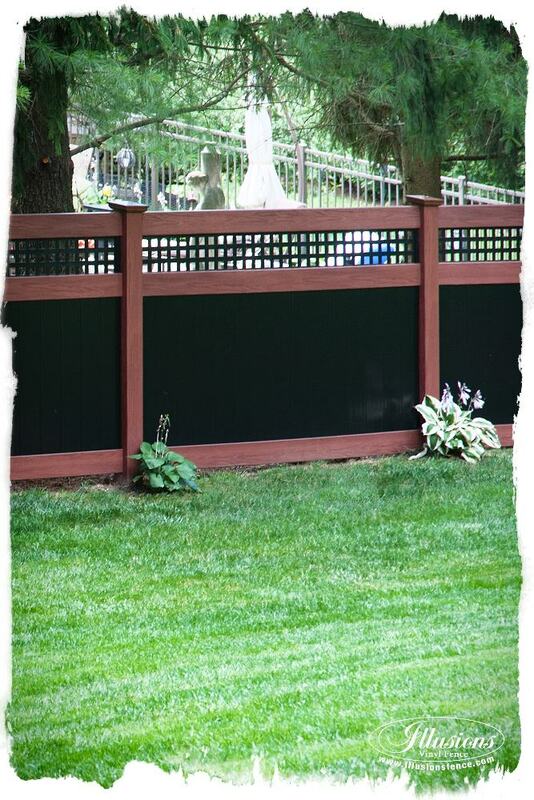 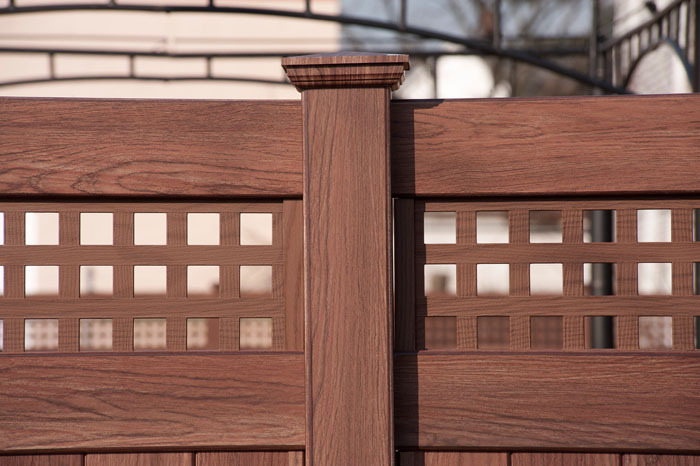 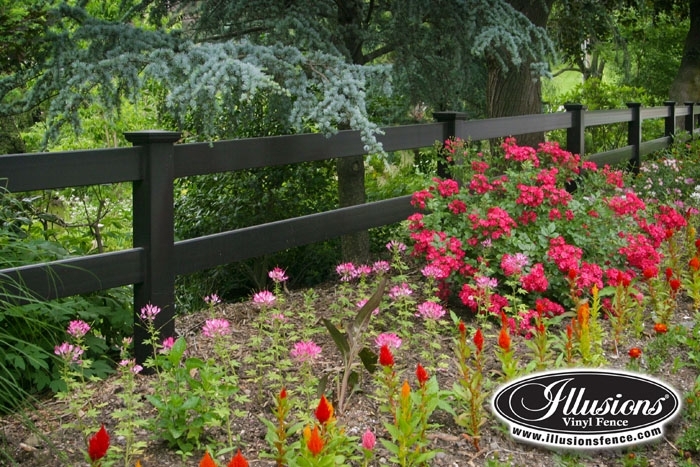 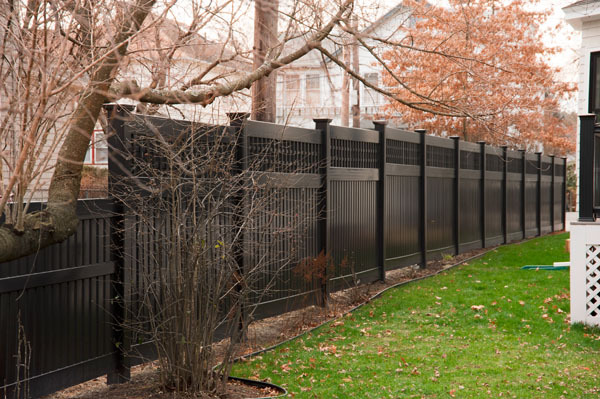 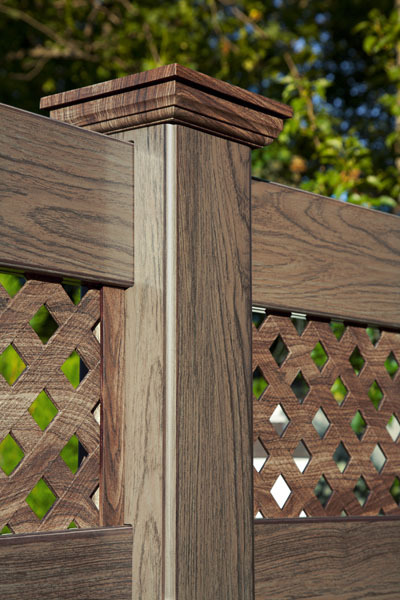 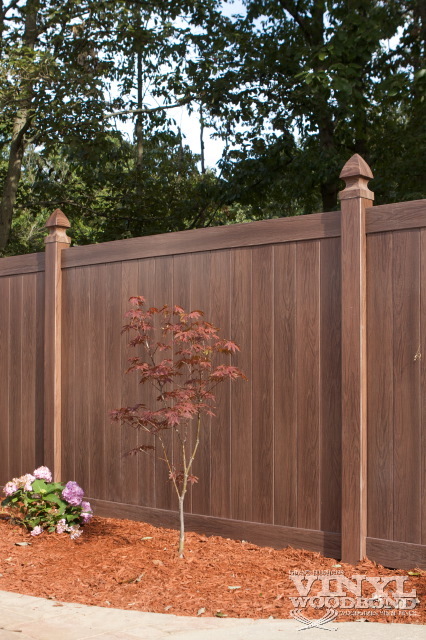 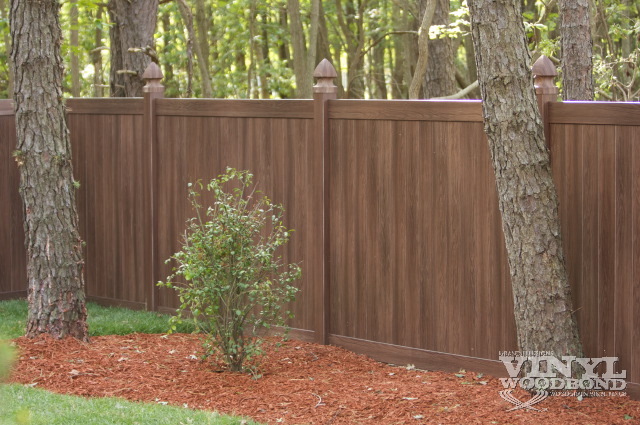 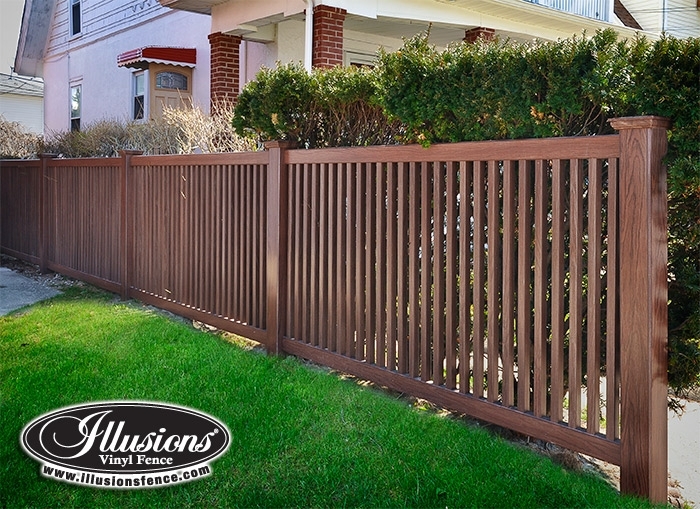 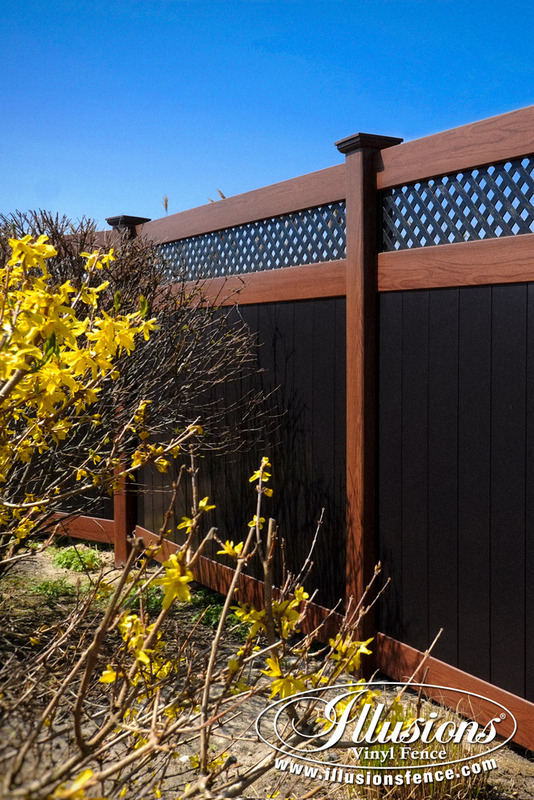 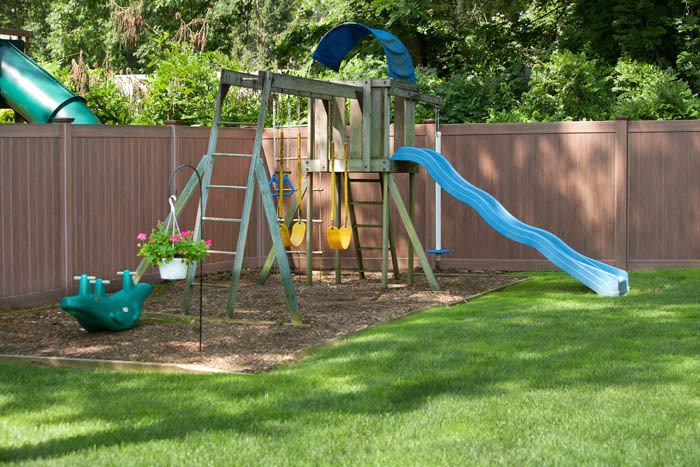 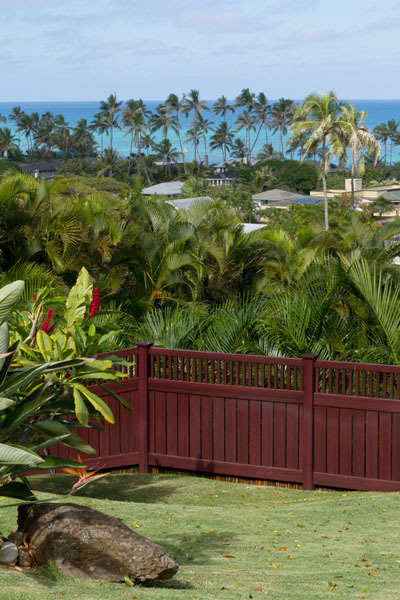 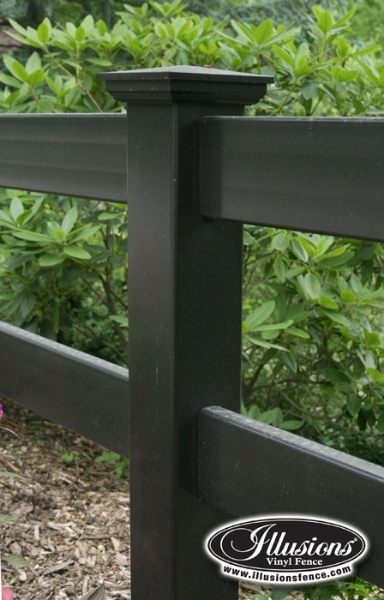 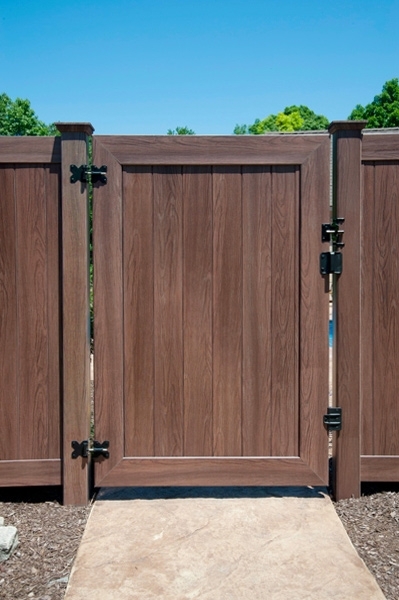 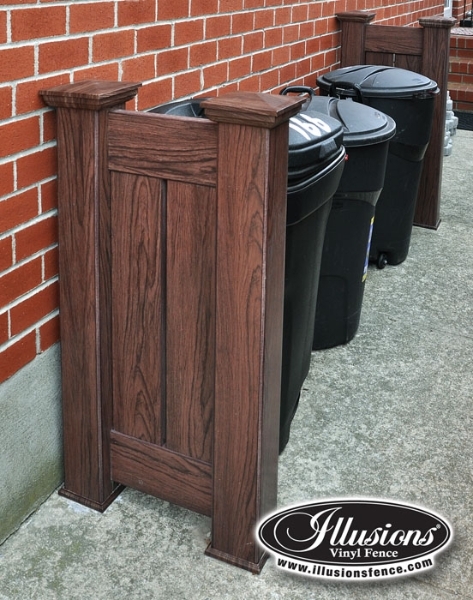 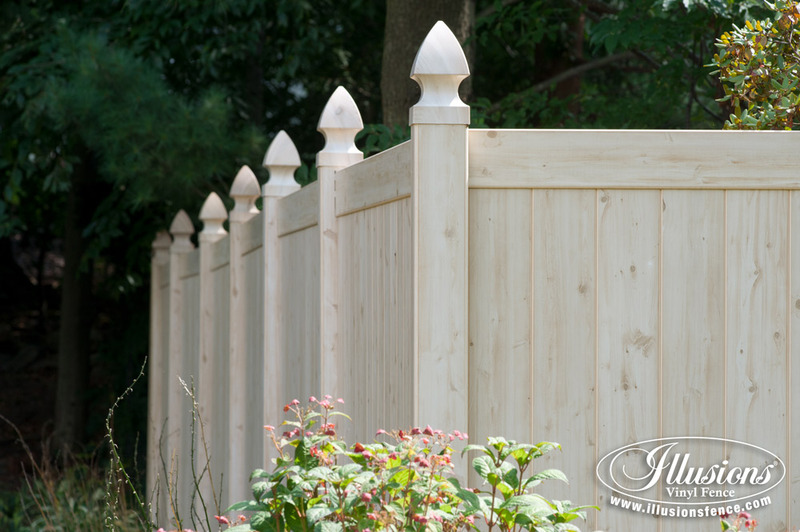 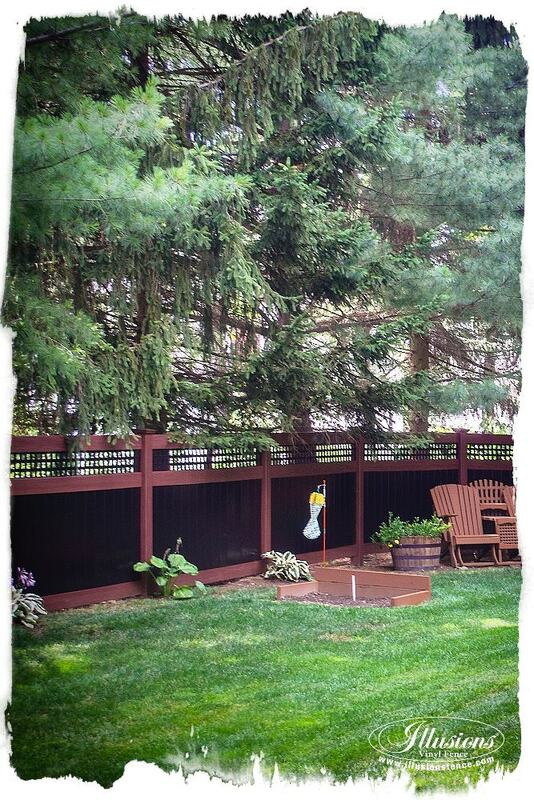 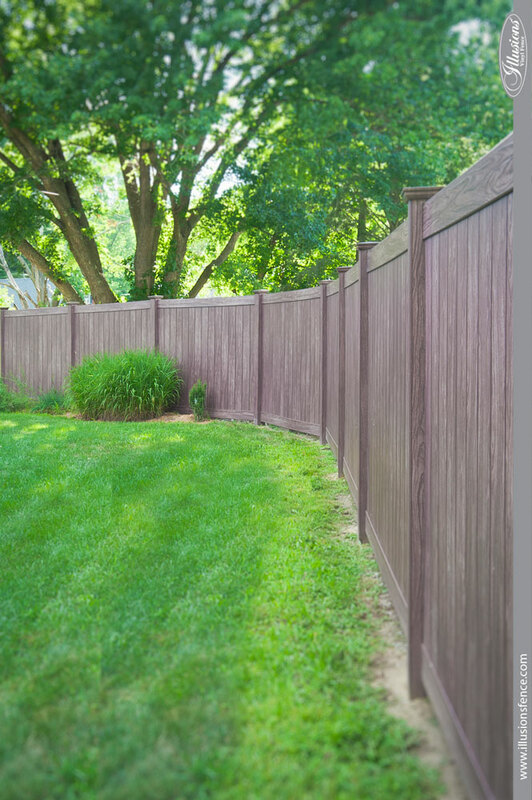 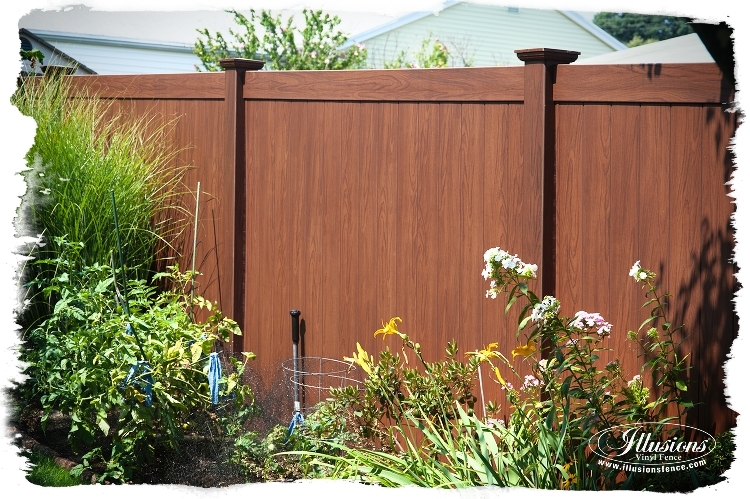 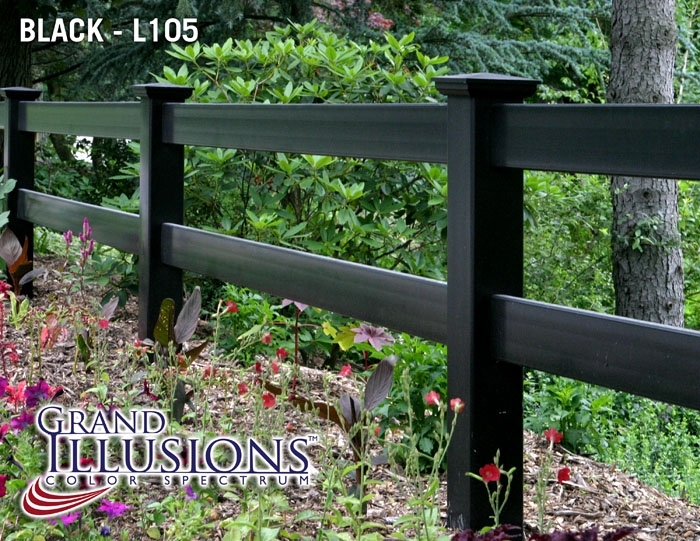 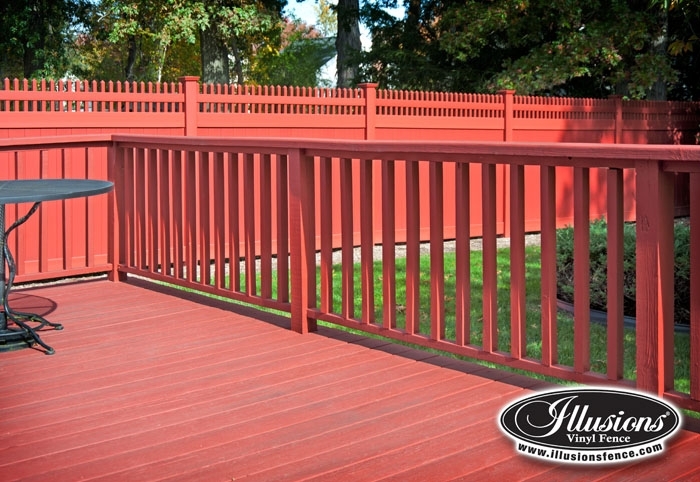 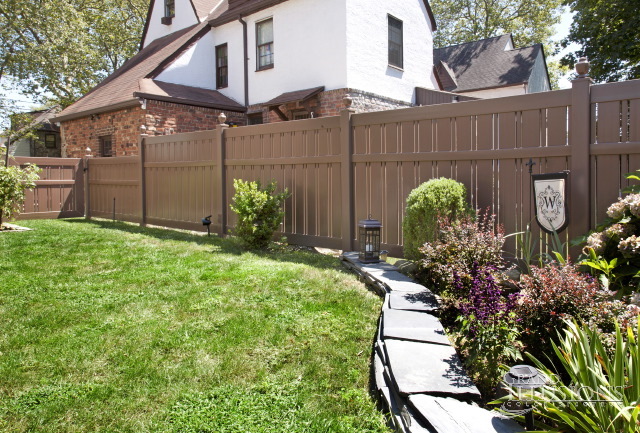 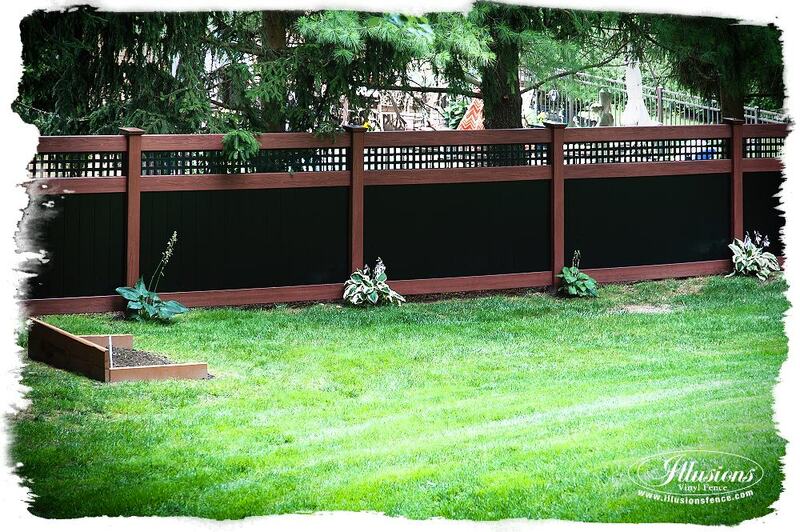 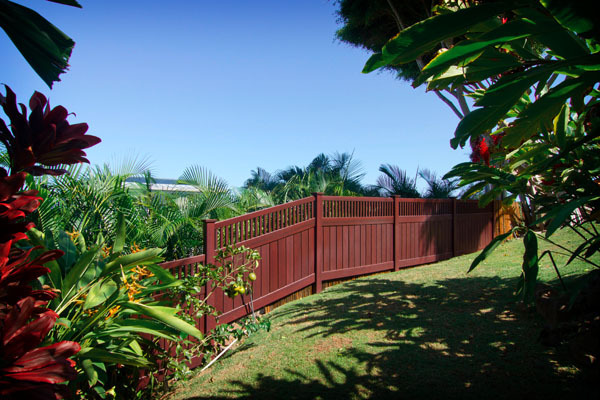 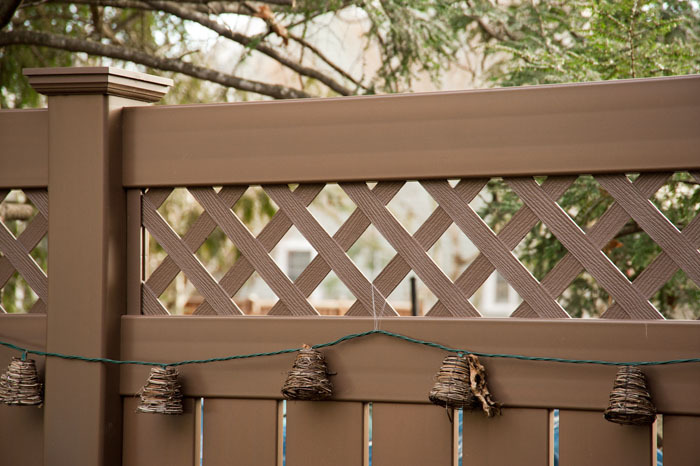 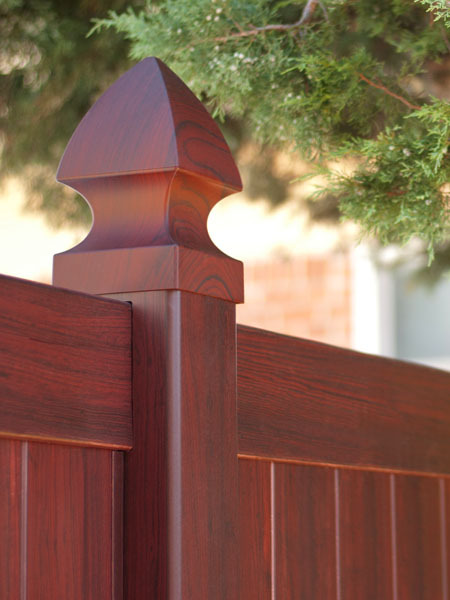 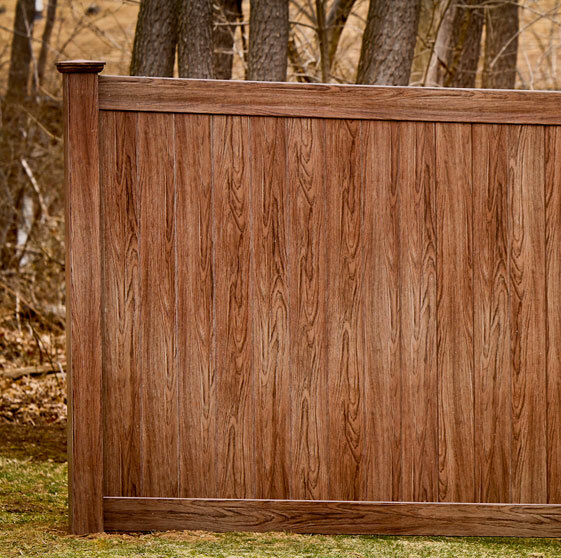 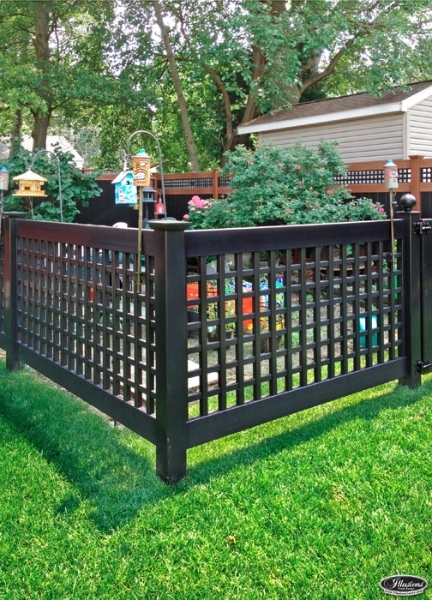 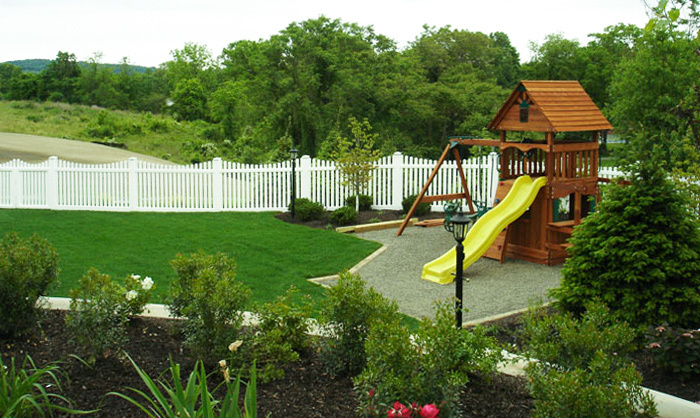 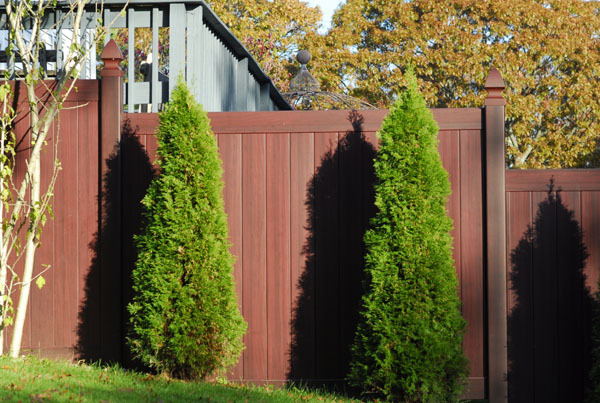 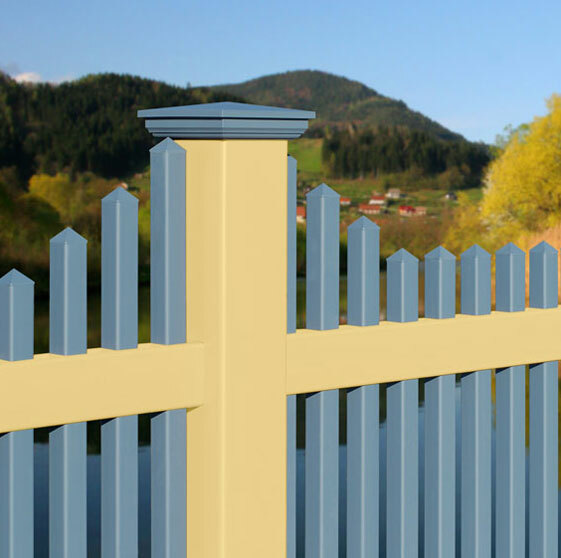 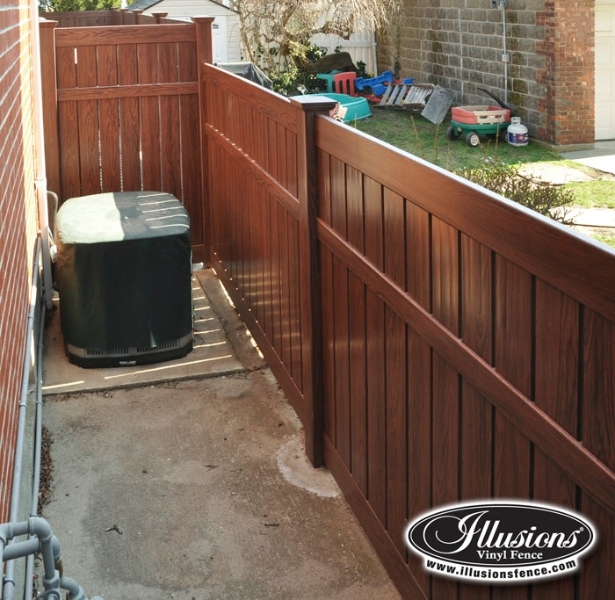 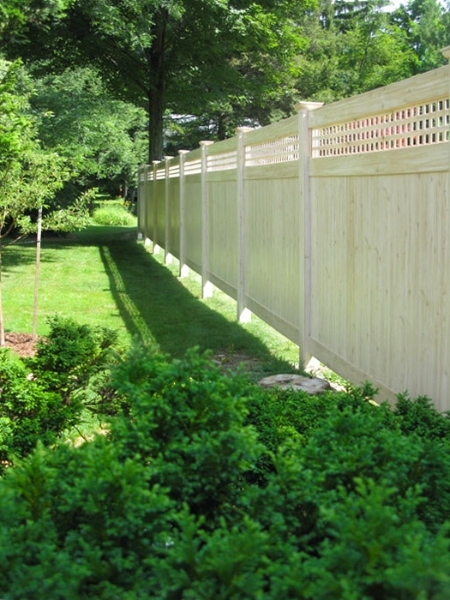 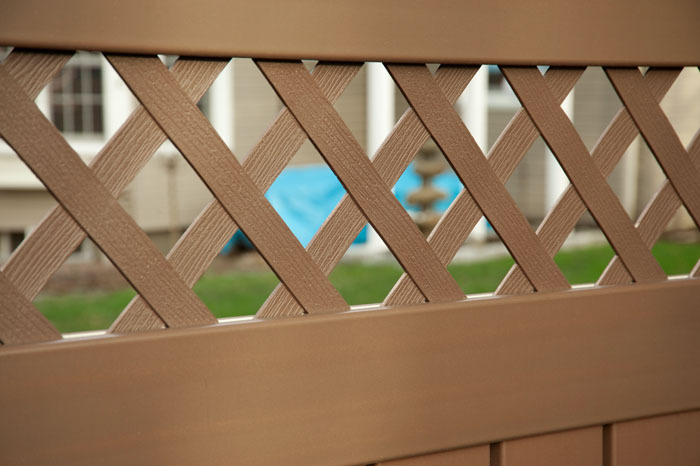 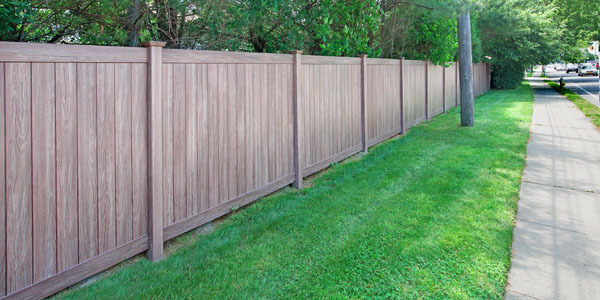 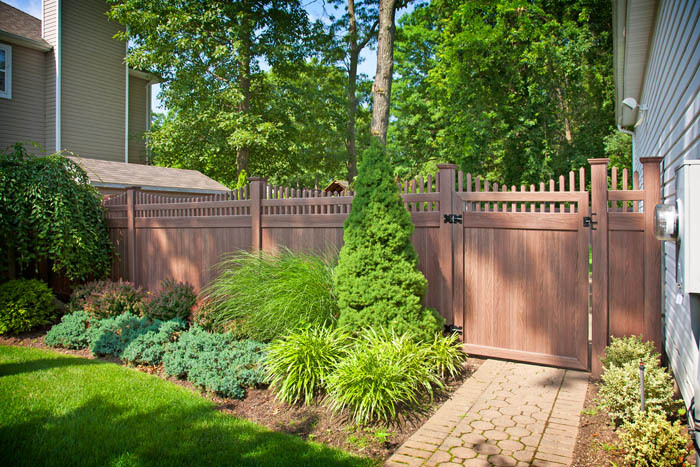 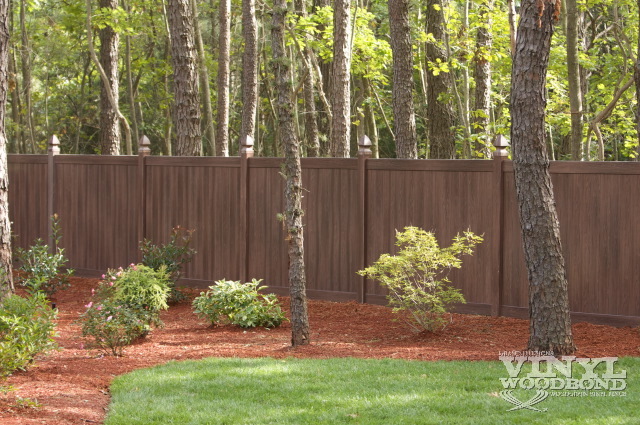 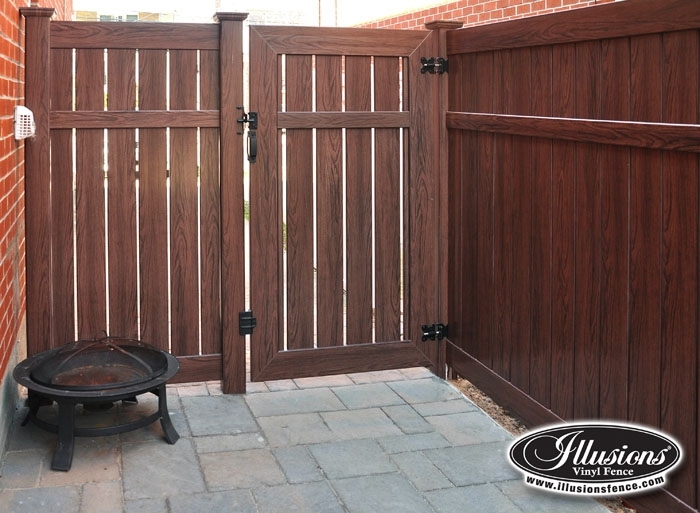 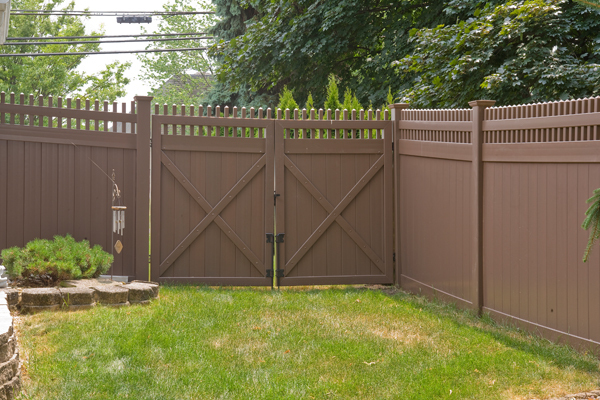 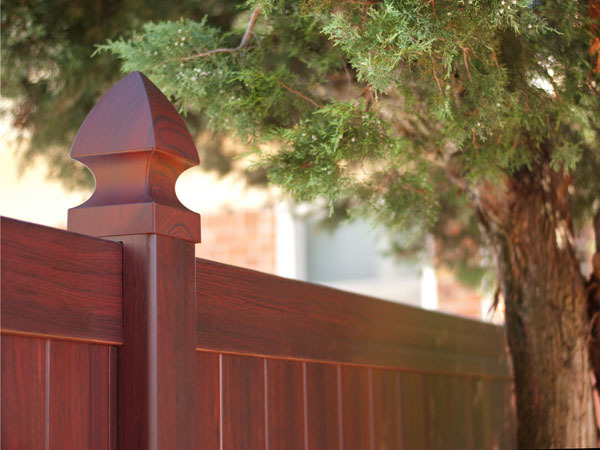 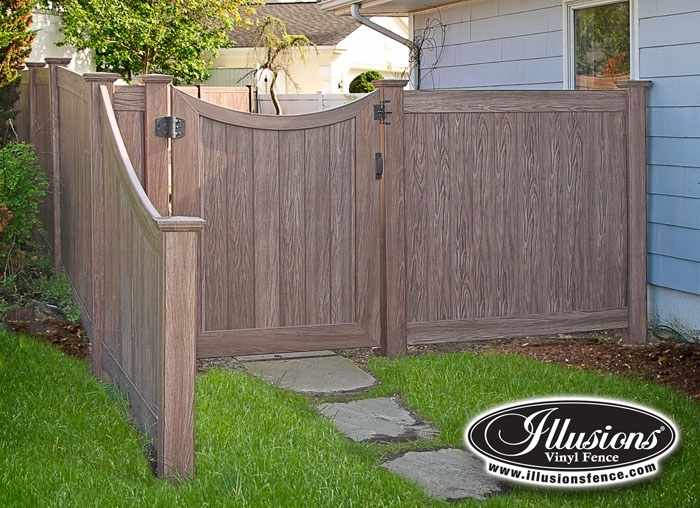 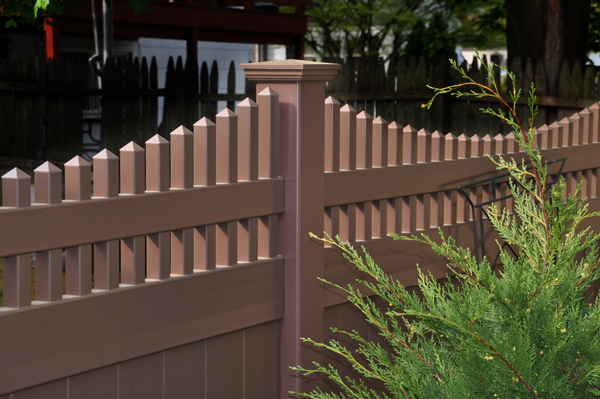 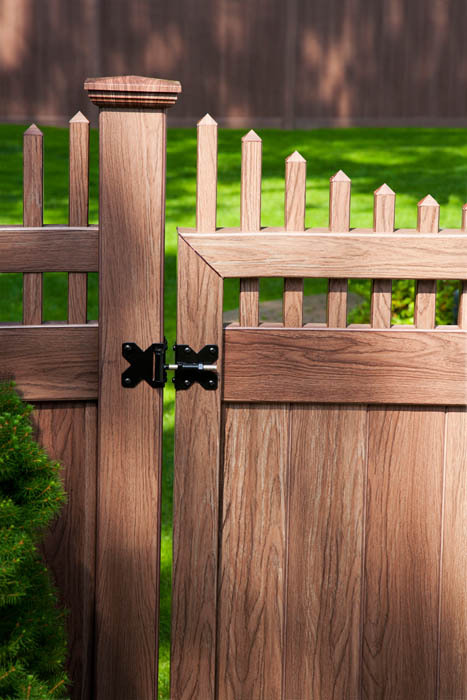 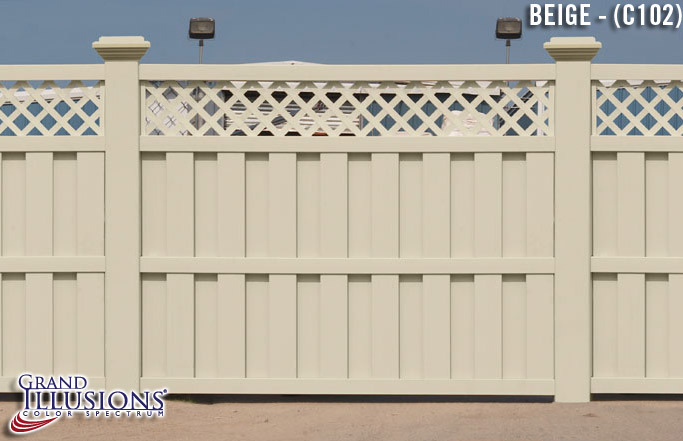 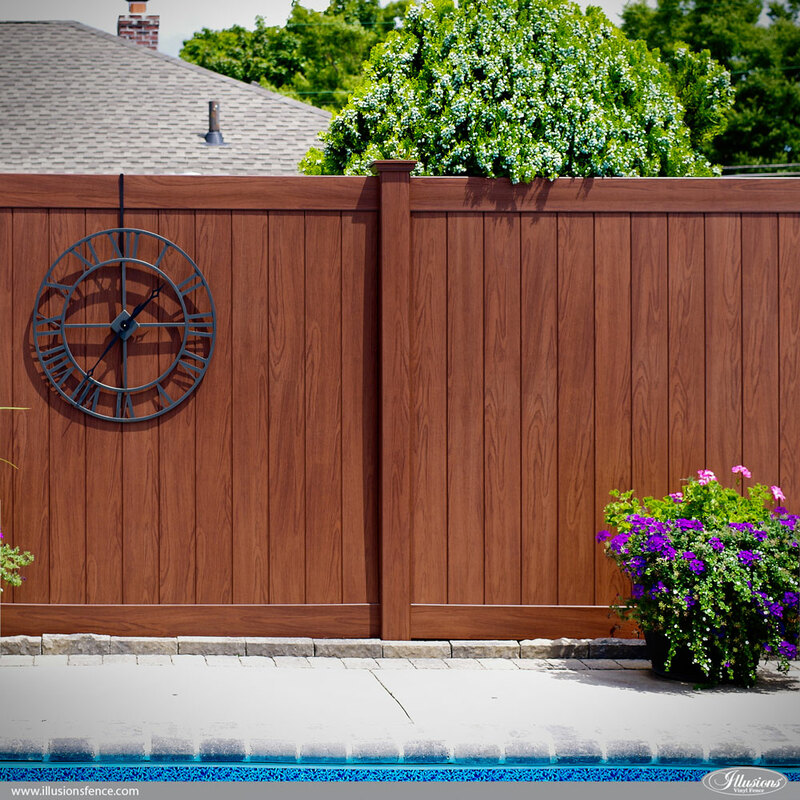 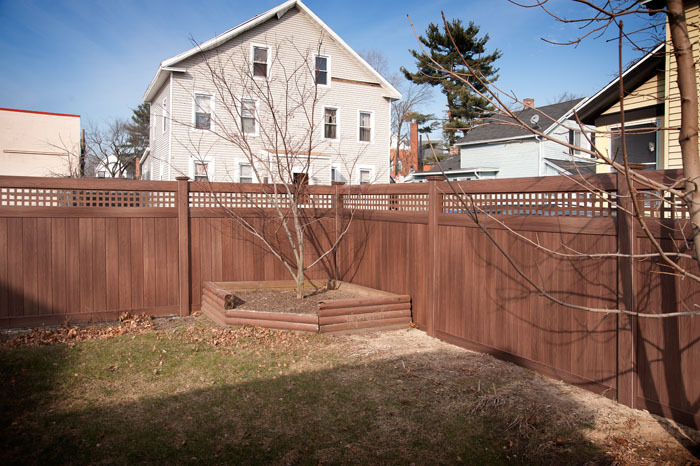 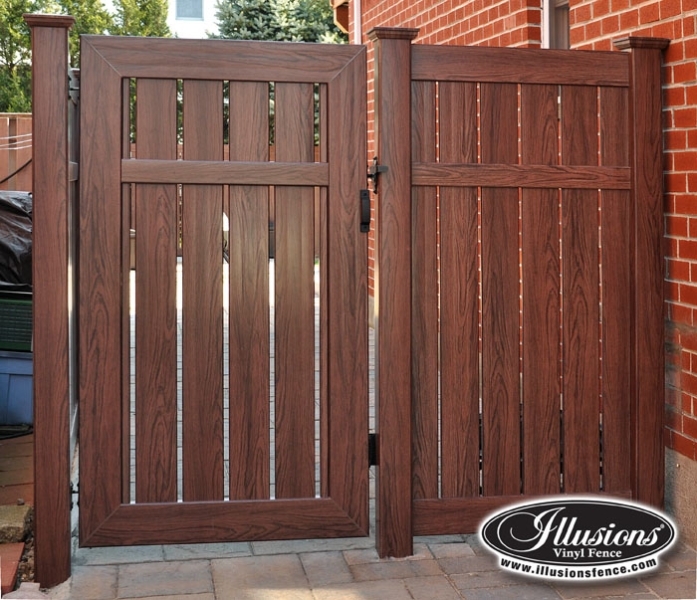 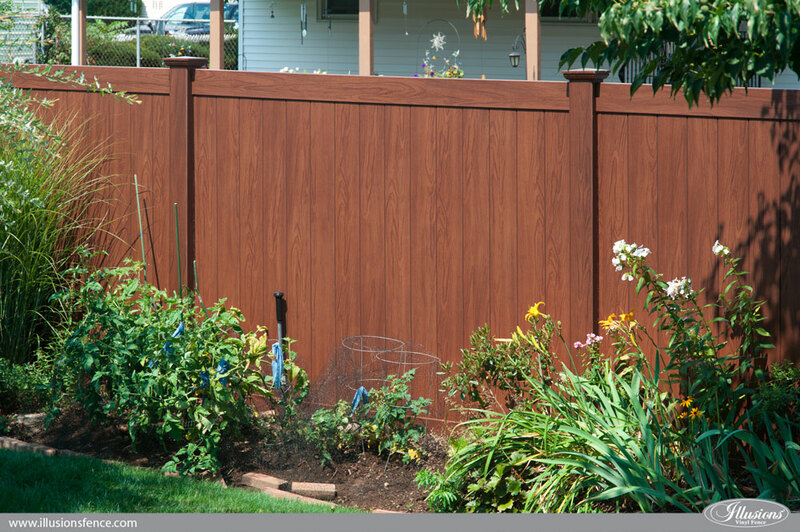 Illusions Fence carries all different styles of vinyl fence and they are all available in all colors and wood grains. 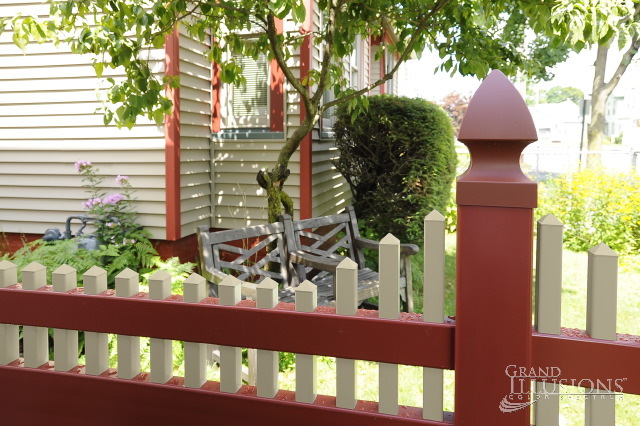 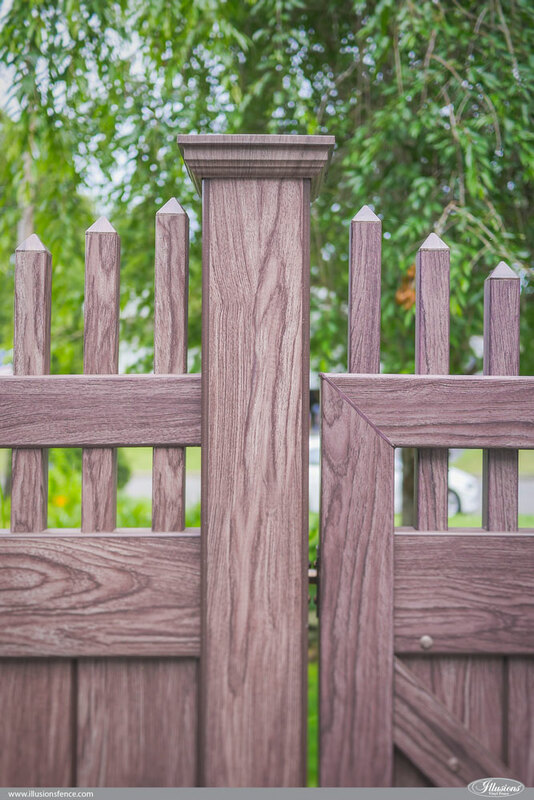 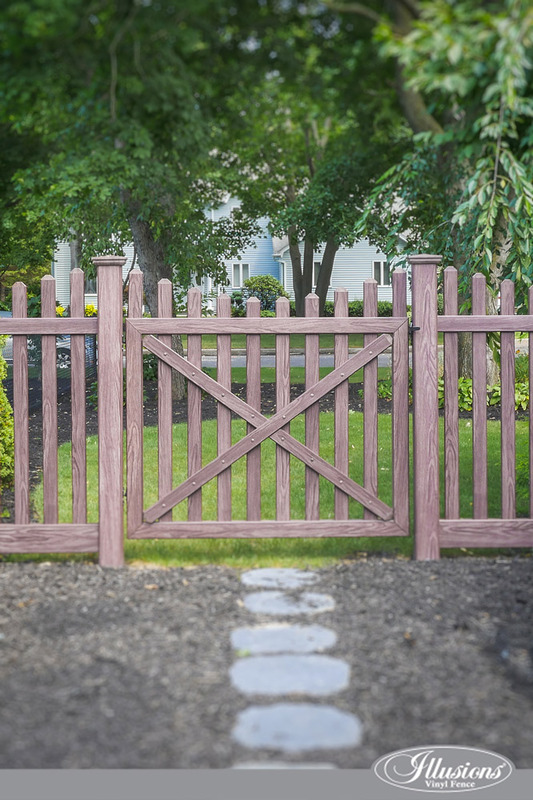 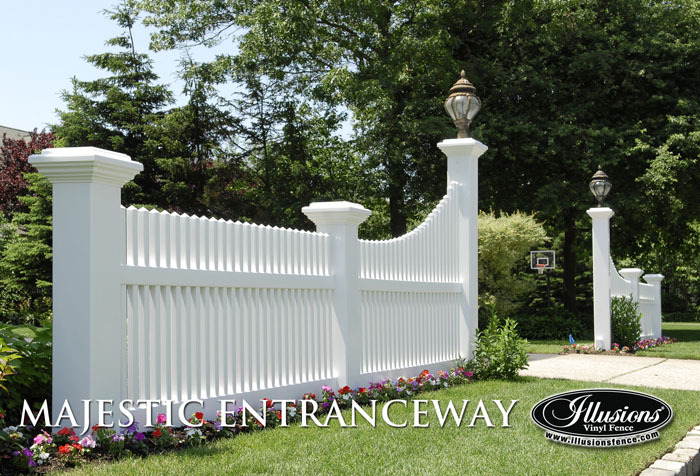 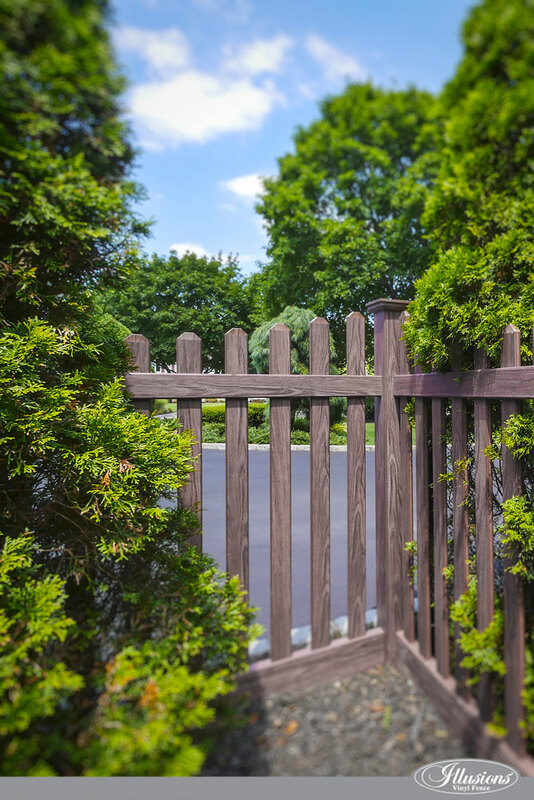 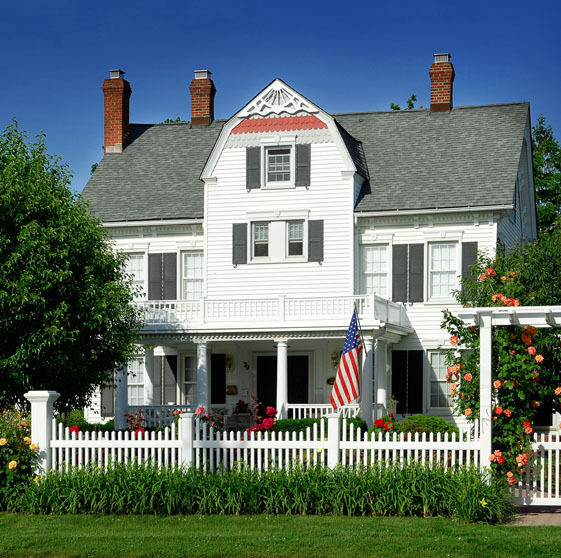 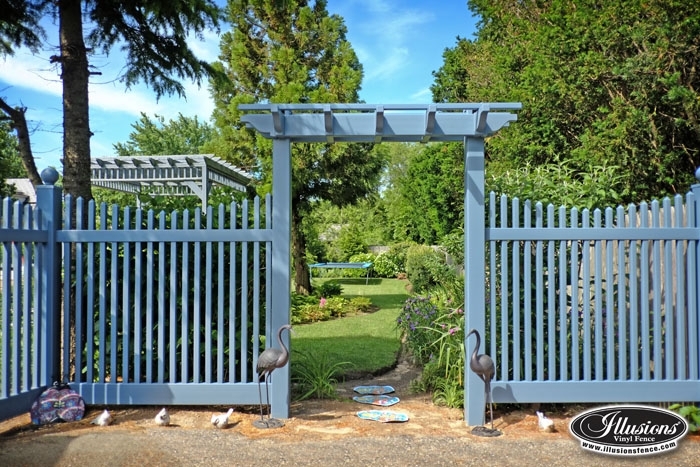 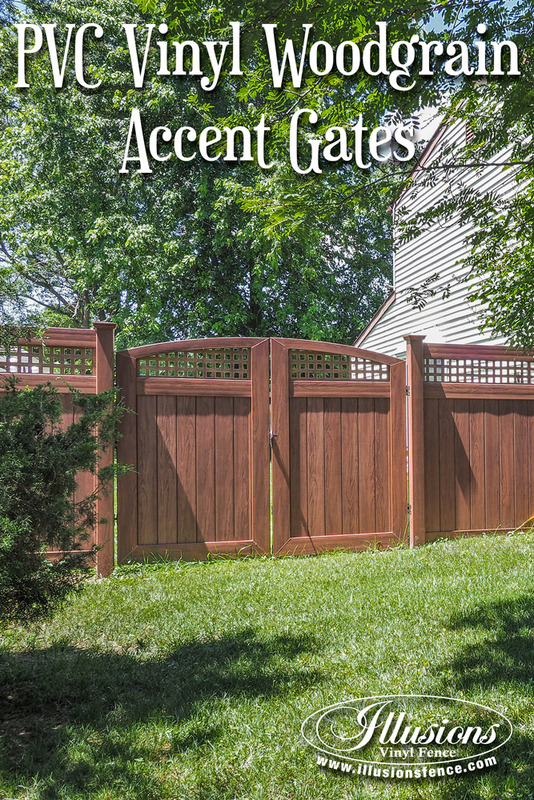 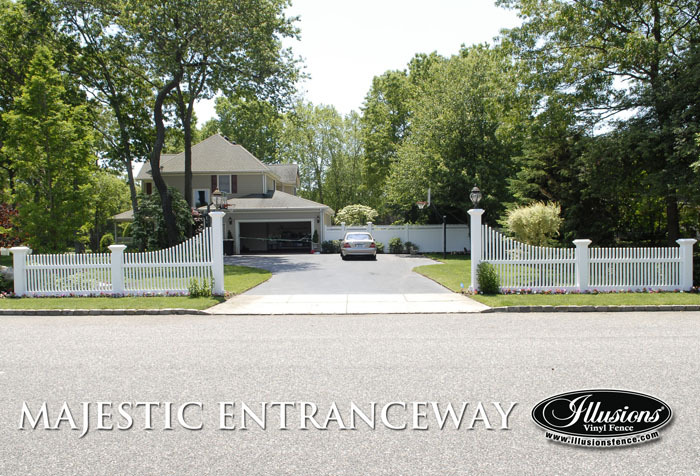 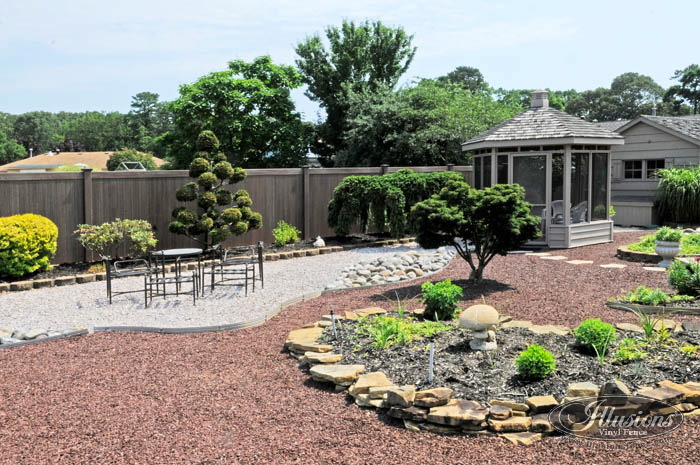 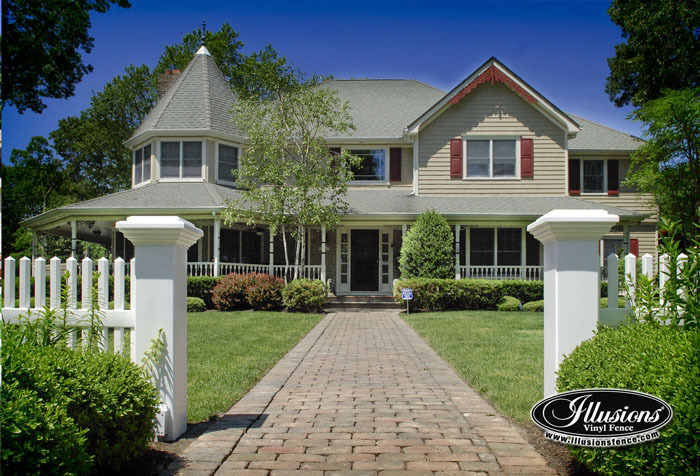 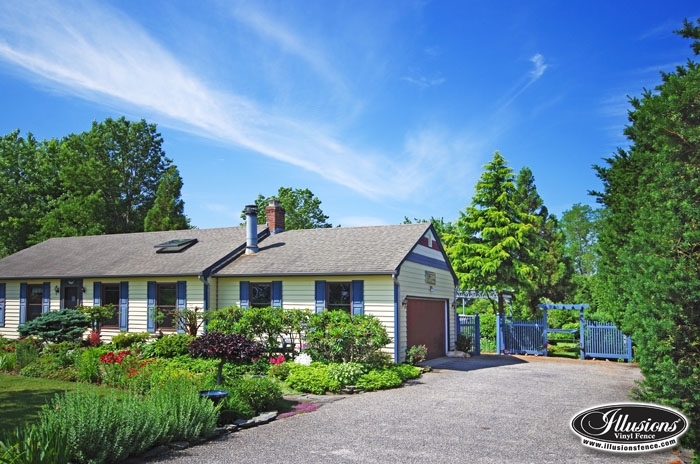 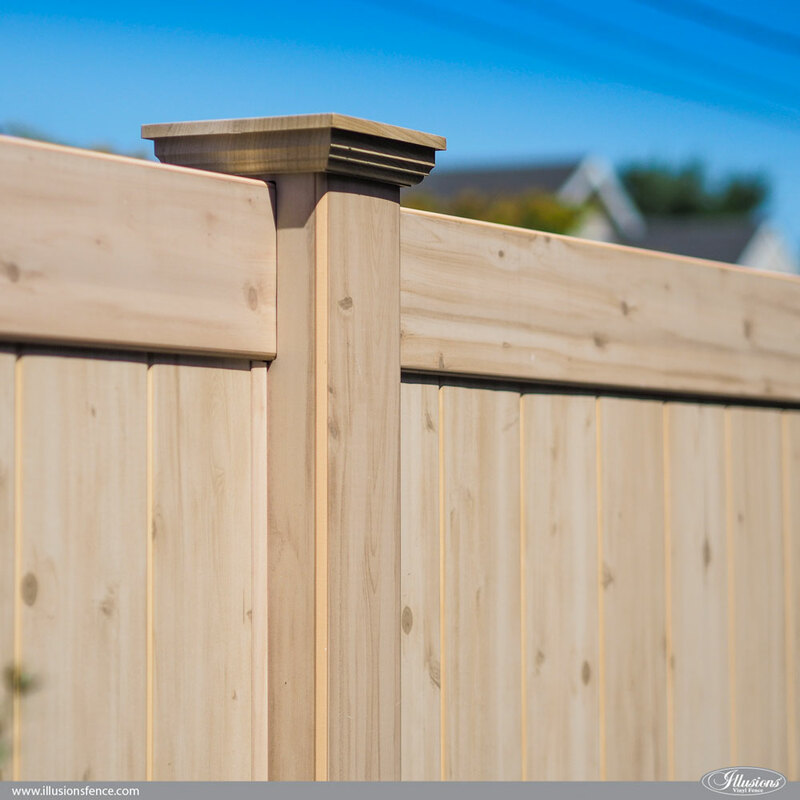 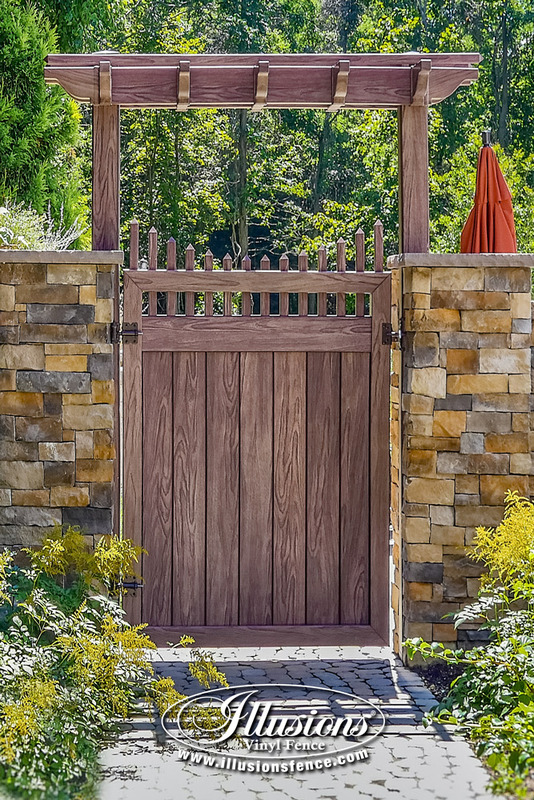 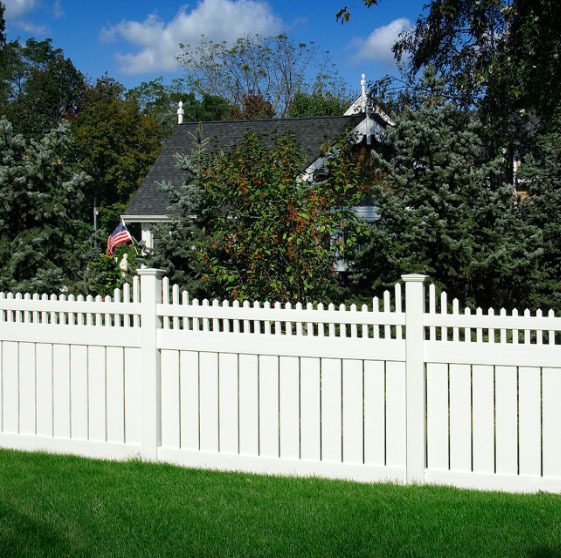 Including privacy fence, semi-privacy fence, board on board fence, Classic Victorian picket fence, contemporary picket fence, post and rail fence, ornamental PVC fence, vinyl fence gates, amazing 8″ x 8″ Majestic posts, custom entryways, enclosures, and so much more. 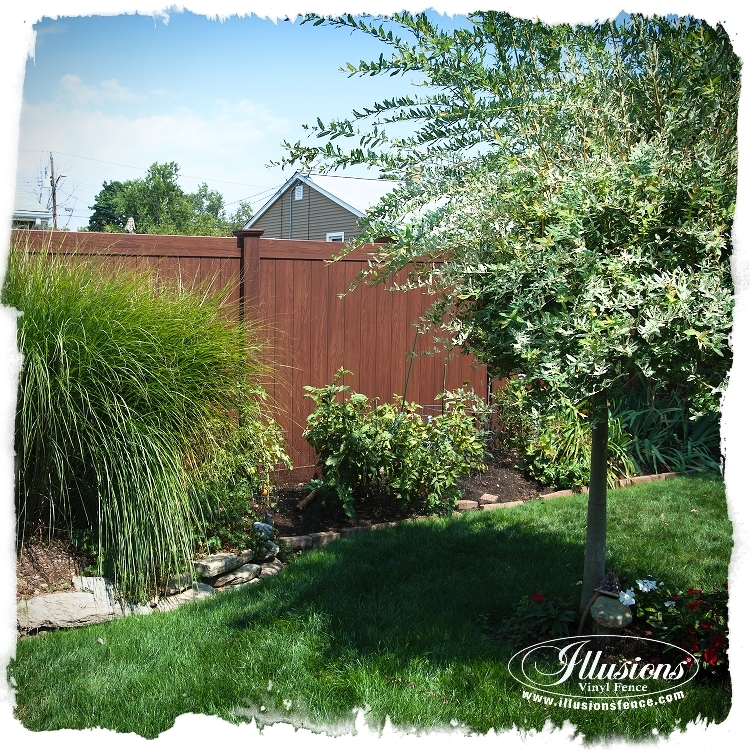 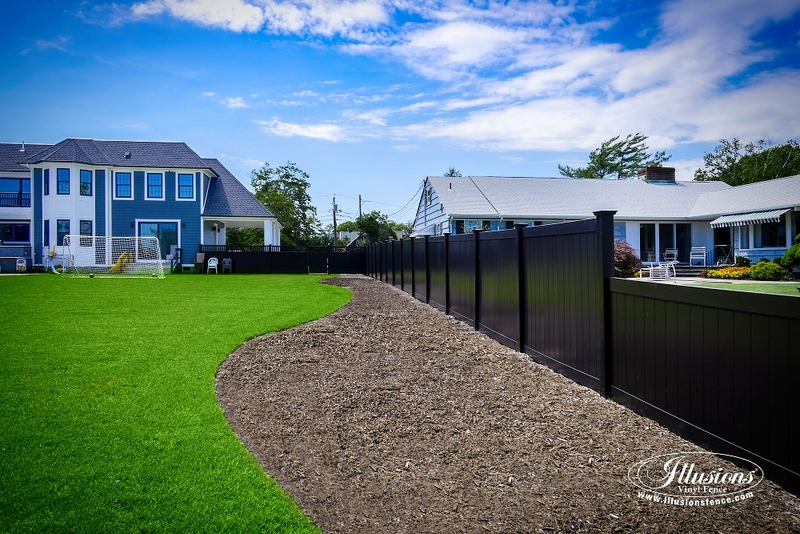 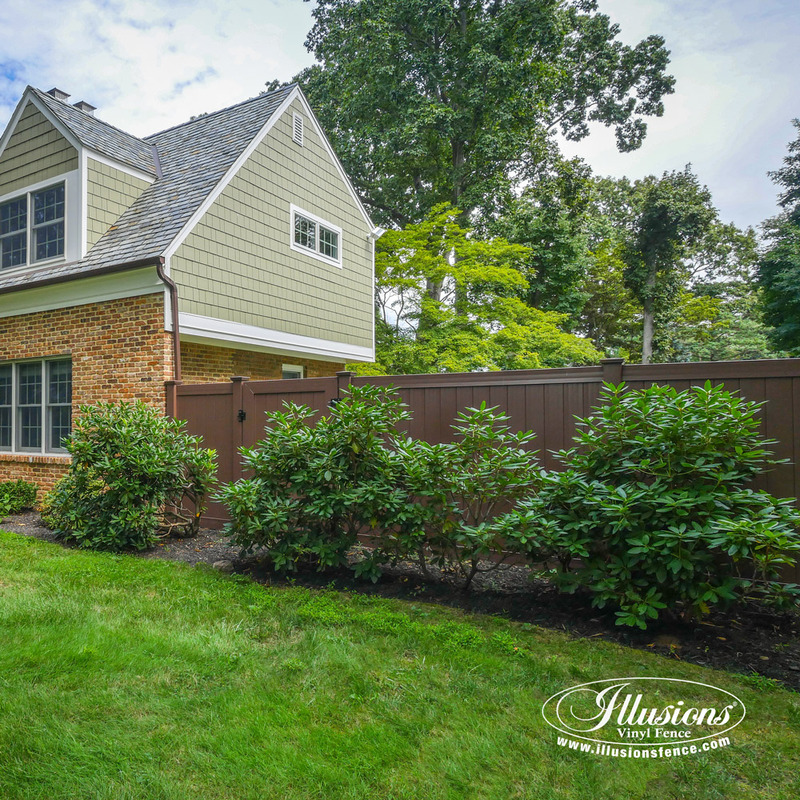 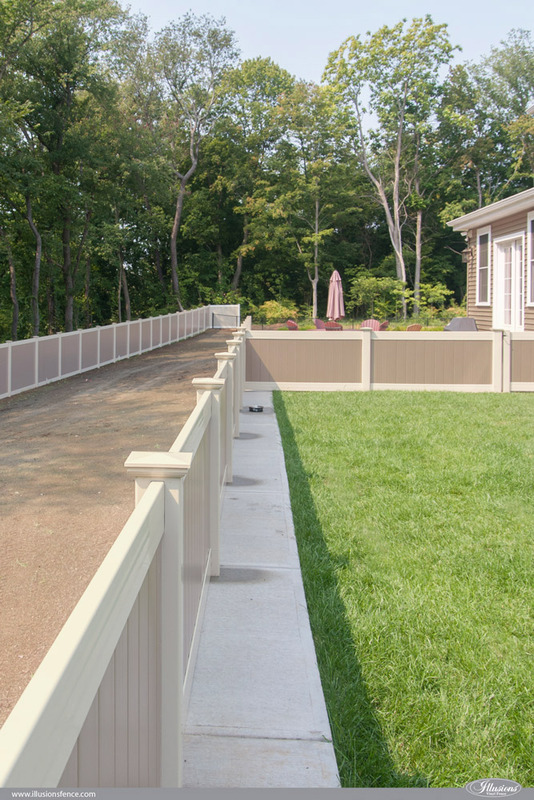 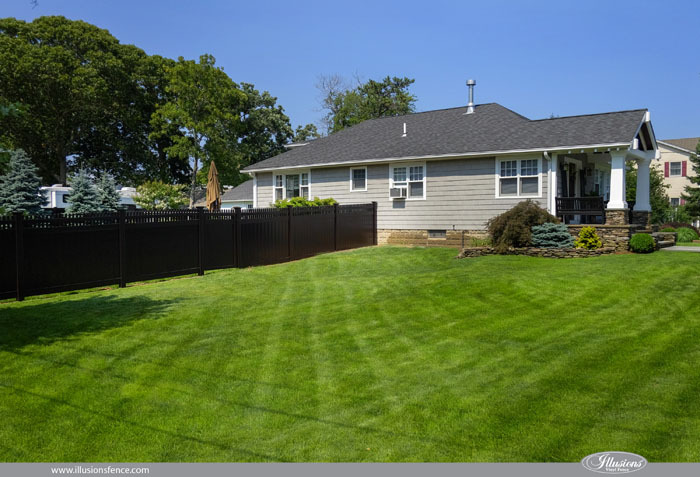 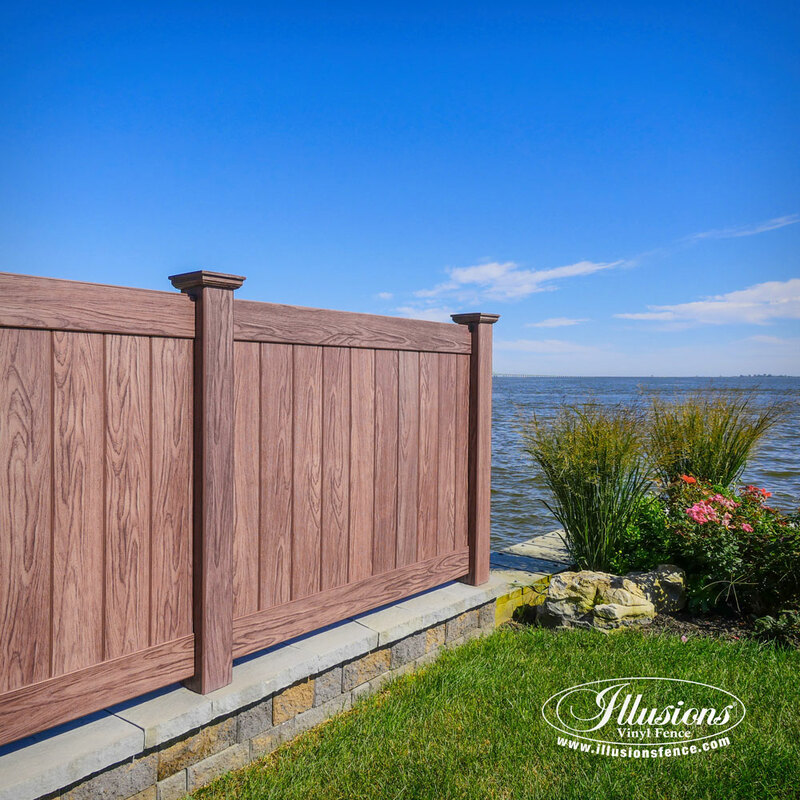 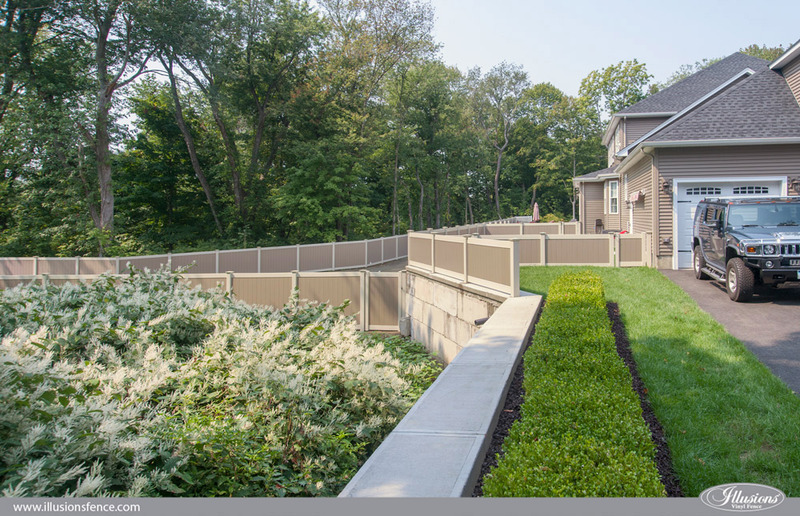 Illusions Vinyl Fence is the future of American landscaping, and the below images are just a sampling of the reason why. 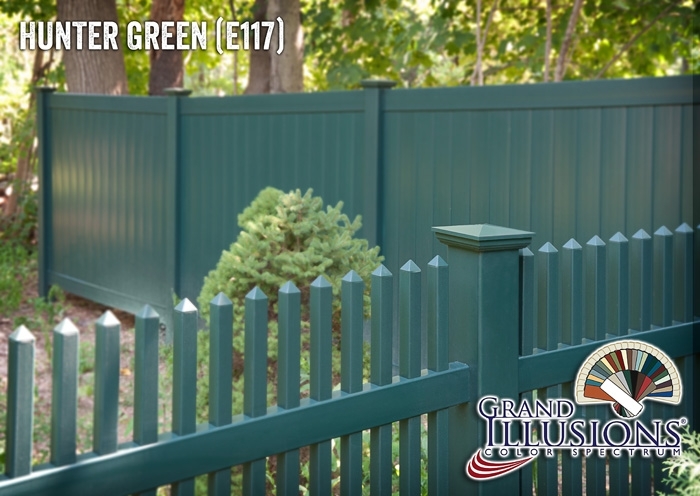 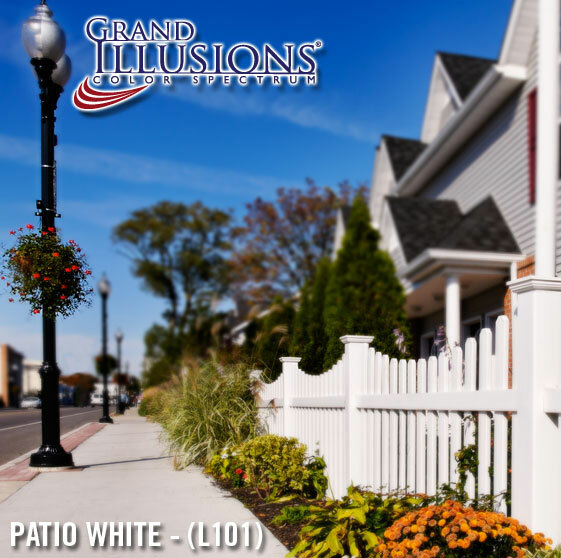 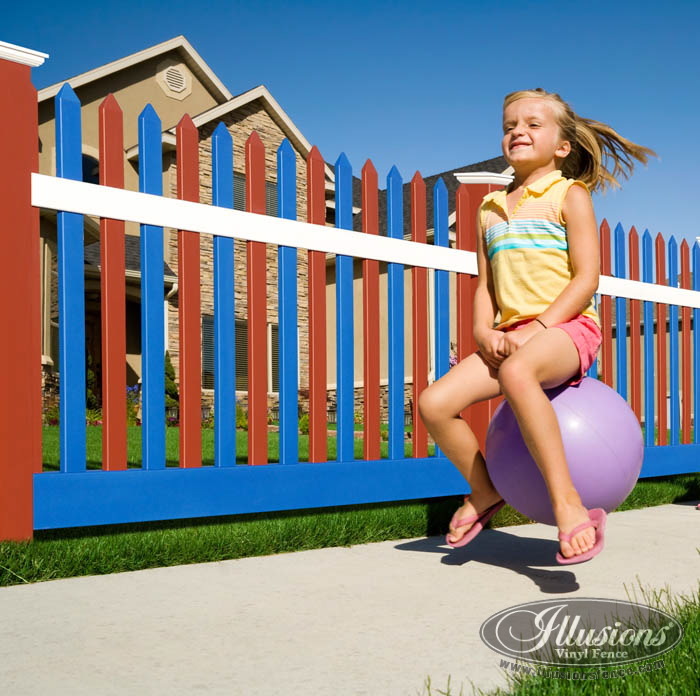 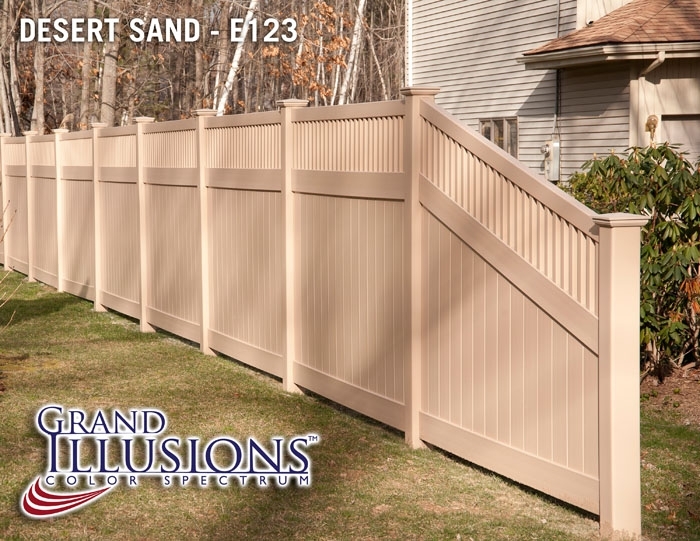 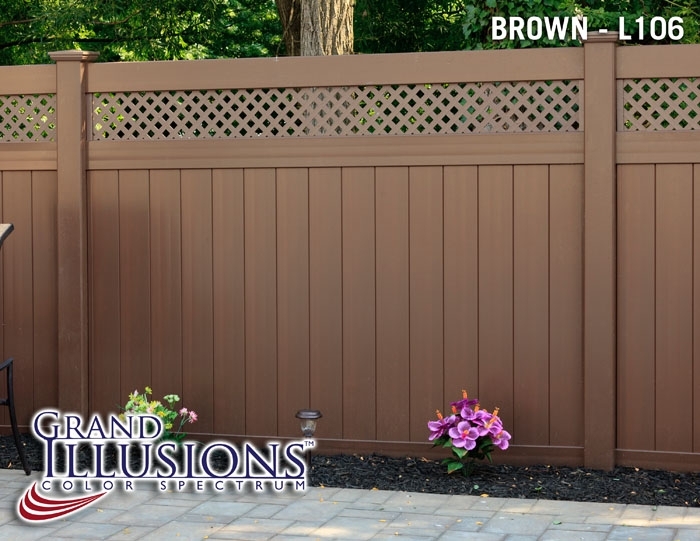 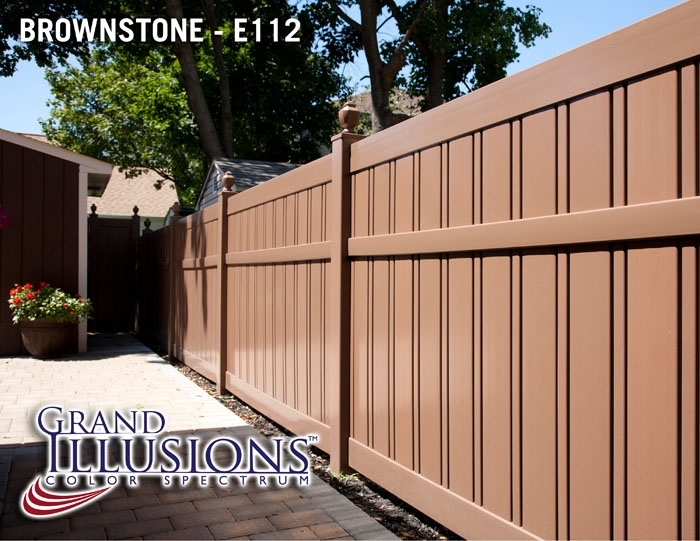 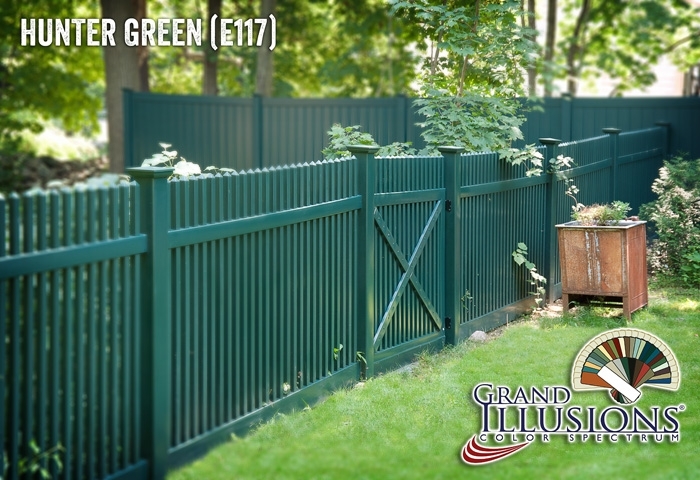 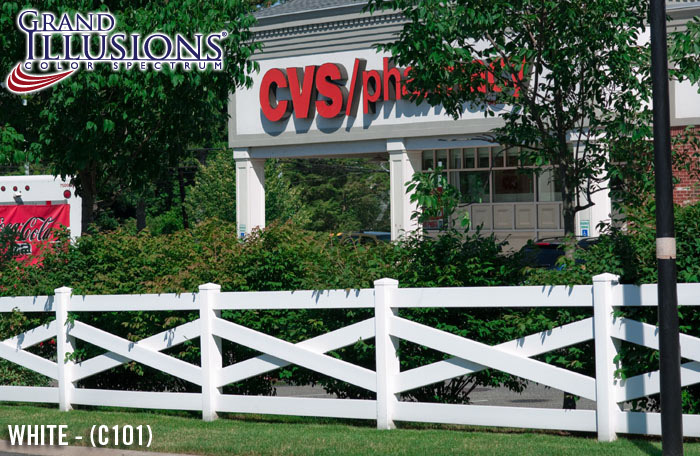 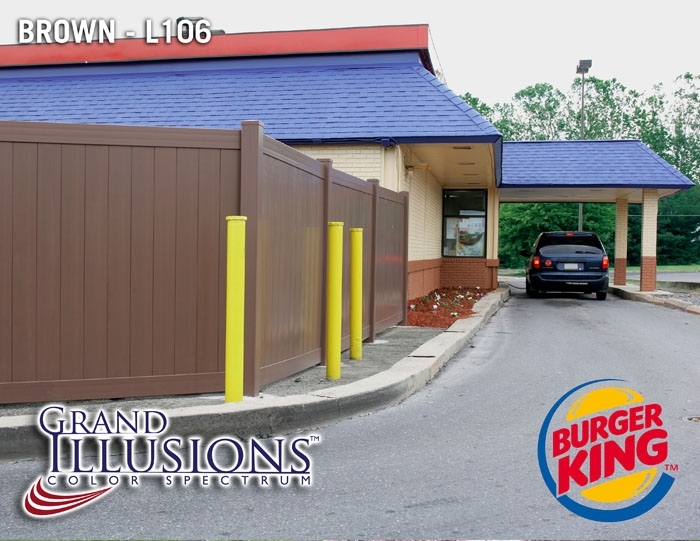 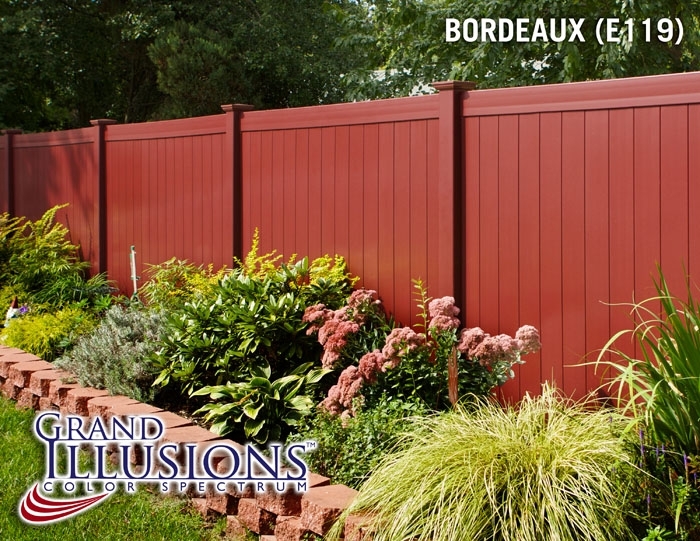 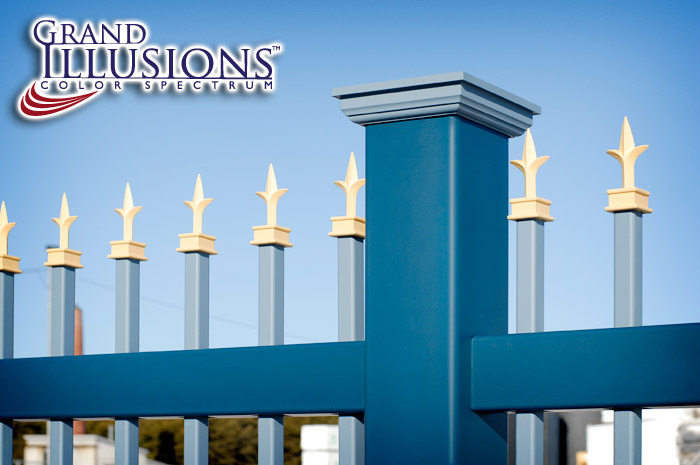 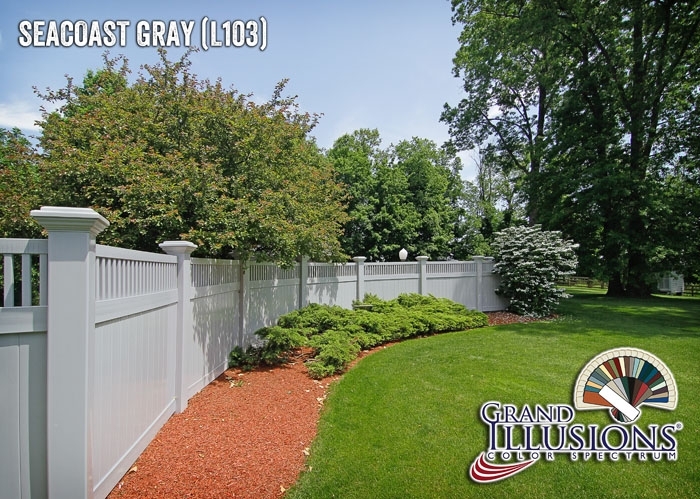 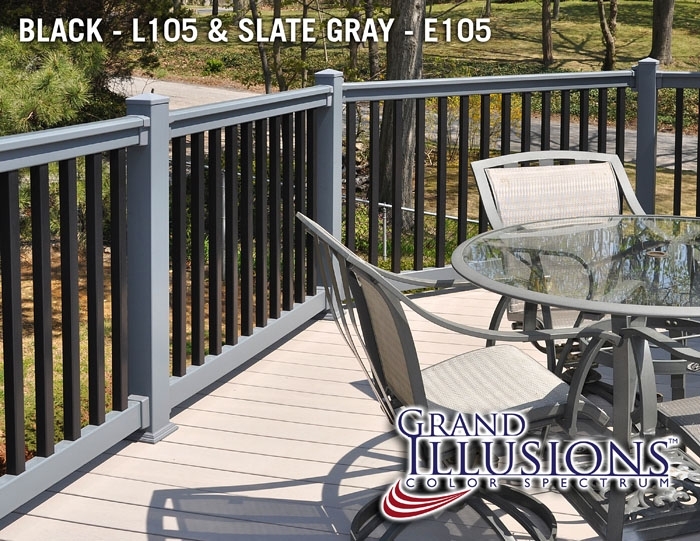 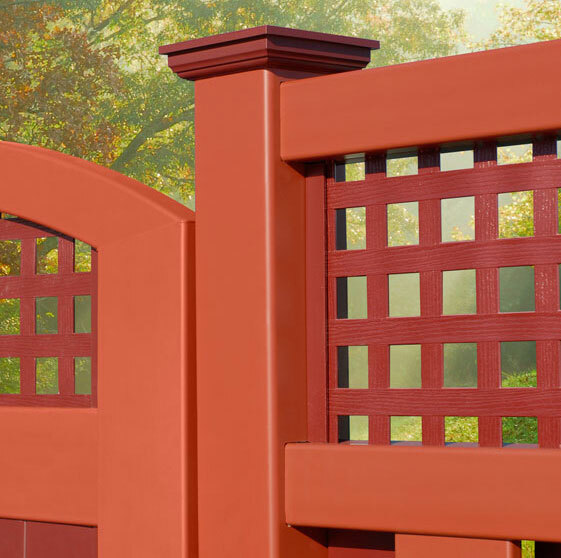 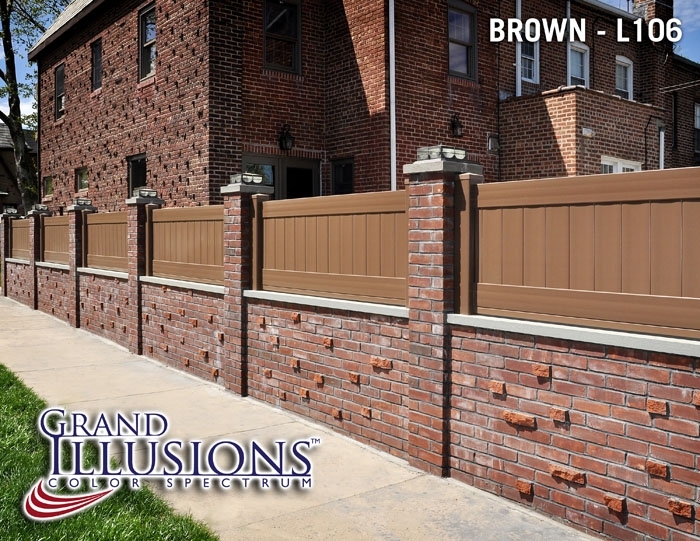 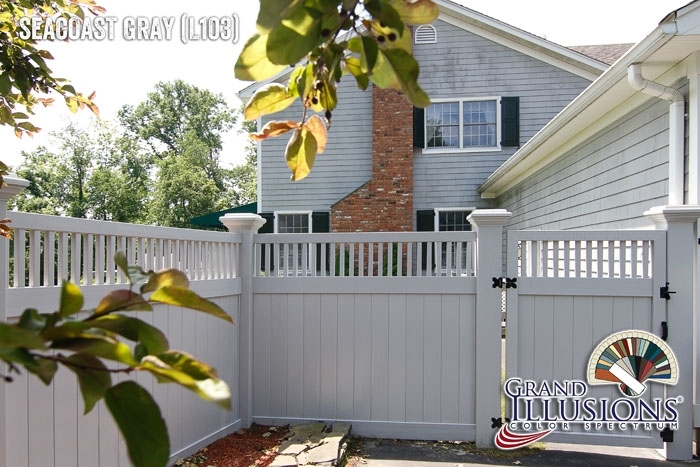 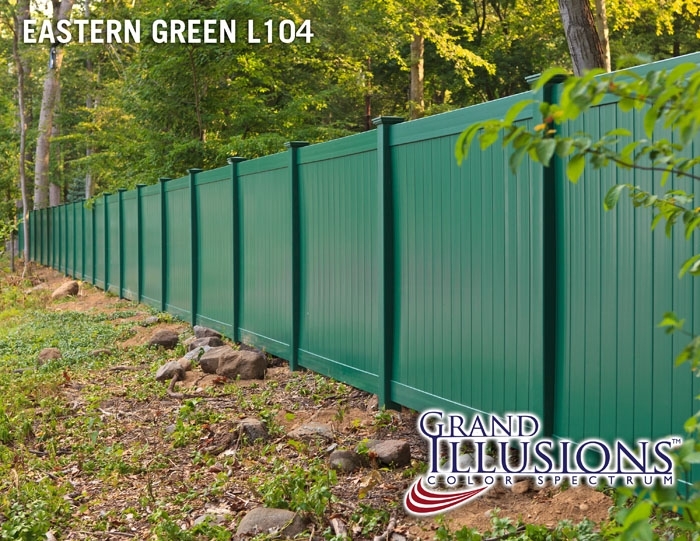 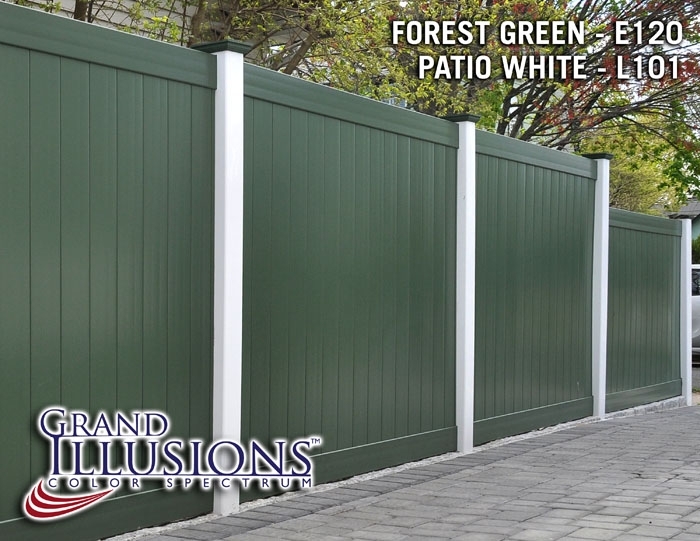 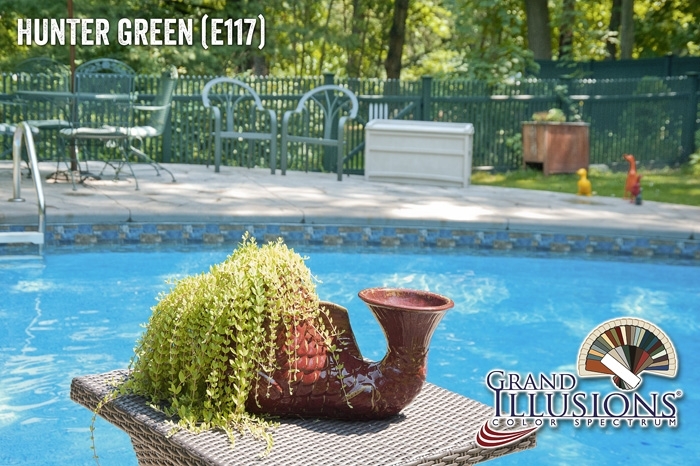 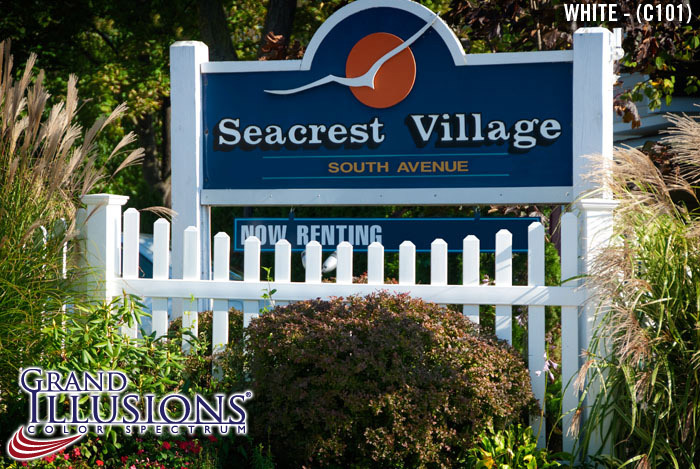 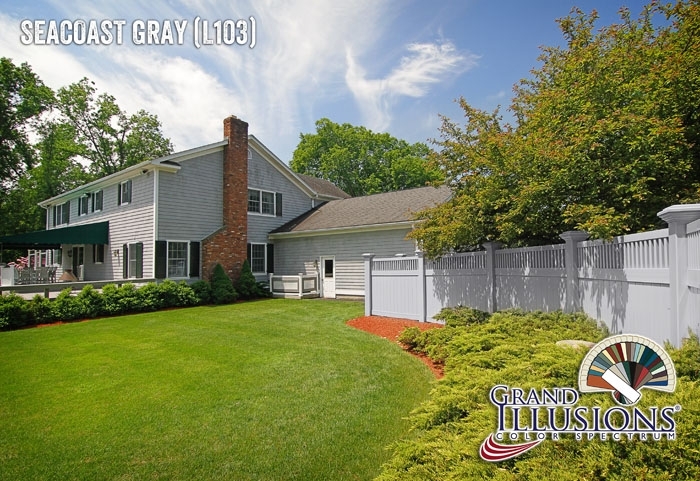 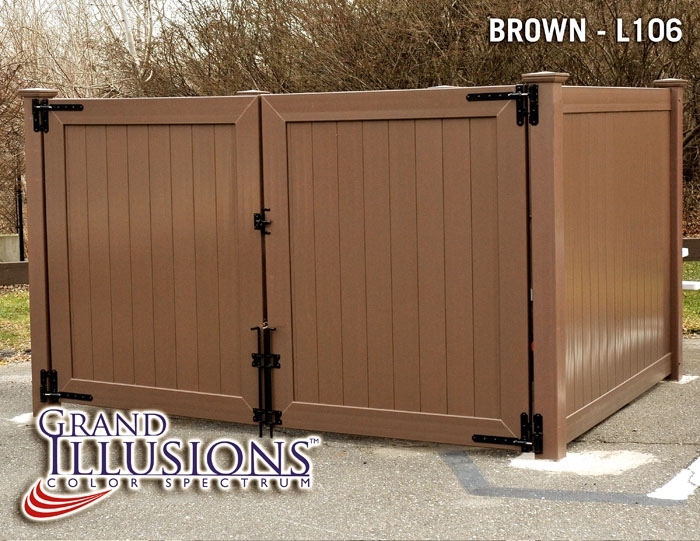 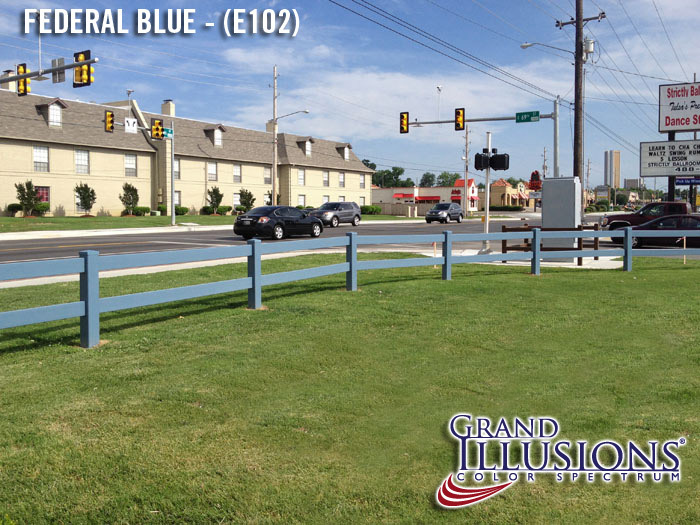 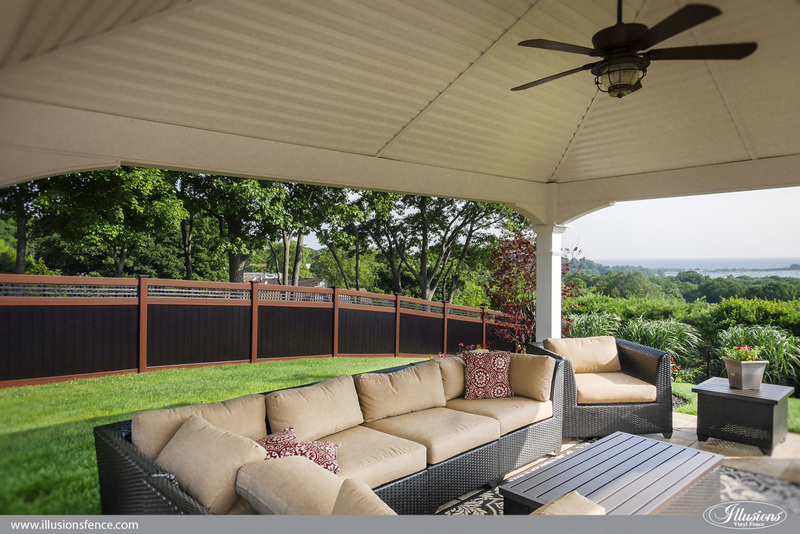 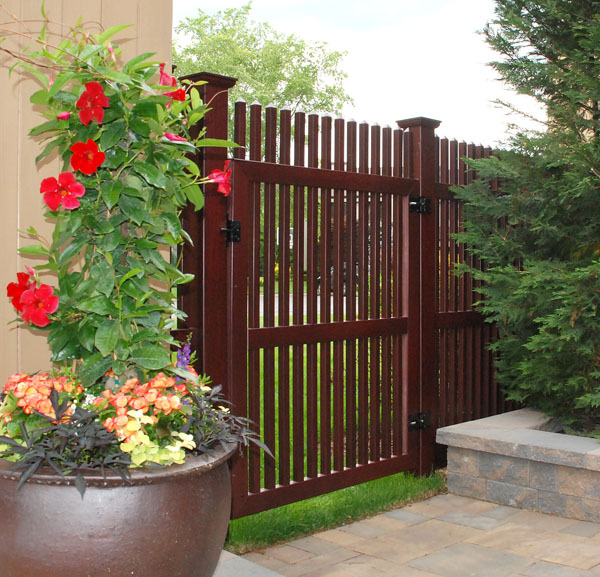 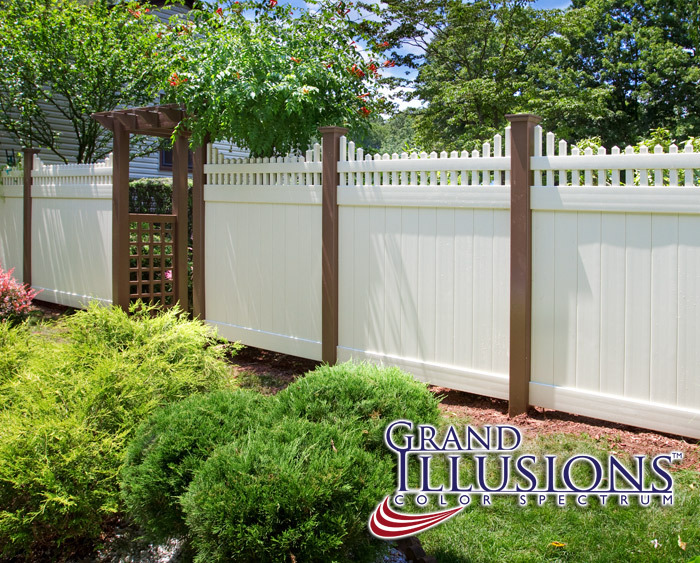 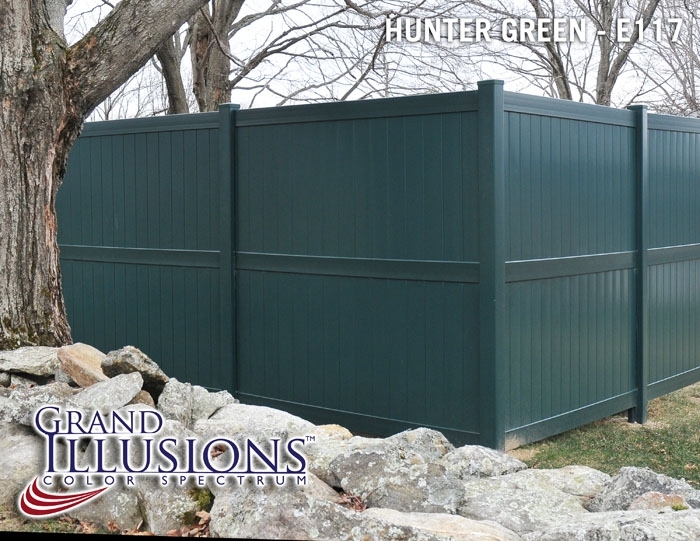 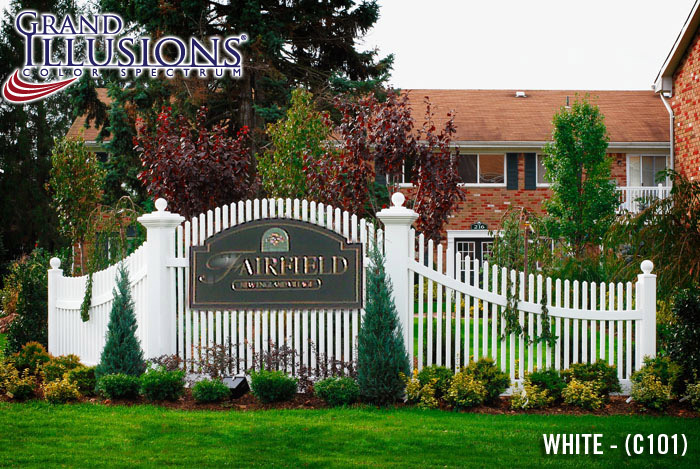 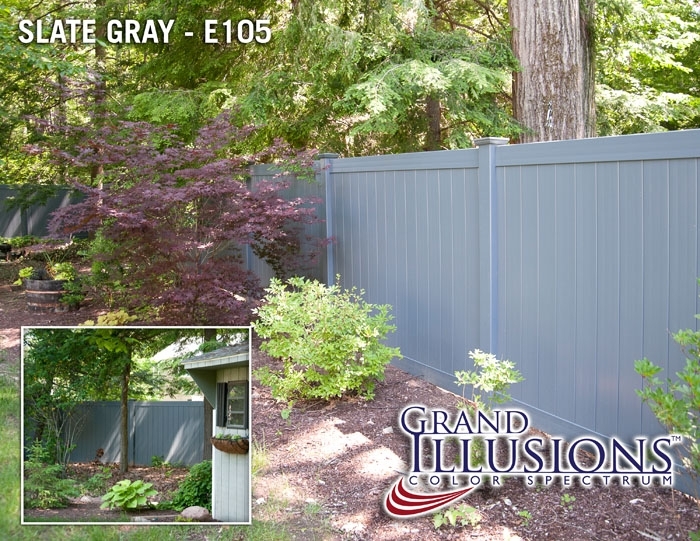 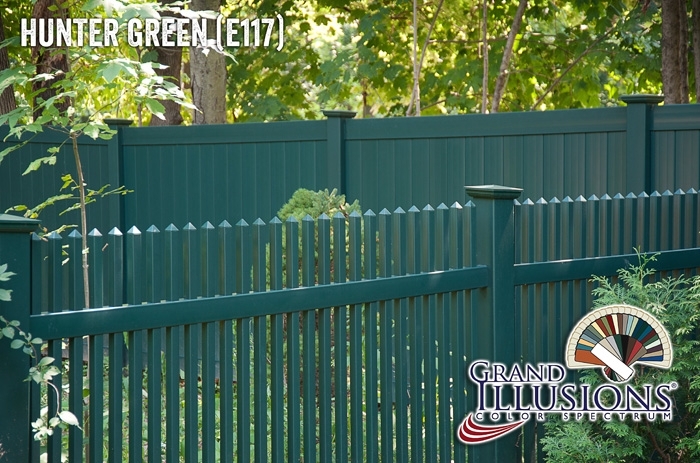 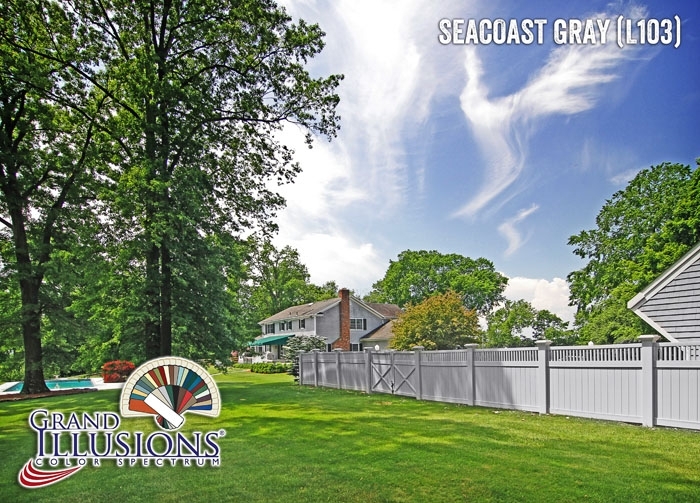 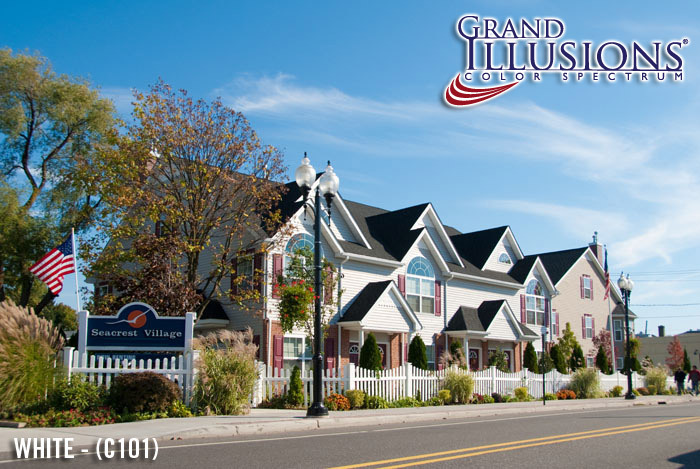 Grand Illusions Color Spectrum represents the 8 Landscape Series, and 24 Estate Series color PVC vinyl fence products produced by Illusions Vinyl Fence. 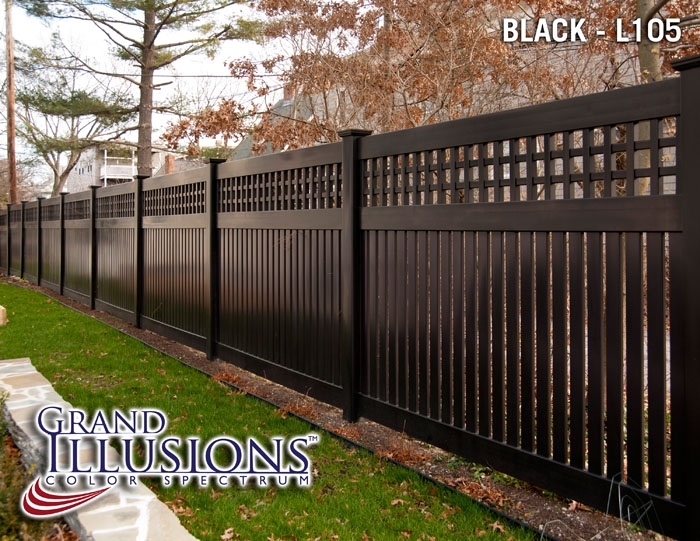 They are all matte finish and can be Mix ‘n’ Matched with each other, or Grand Illusions Vinyl WoodBond wood grain PVC Fence. 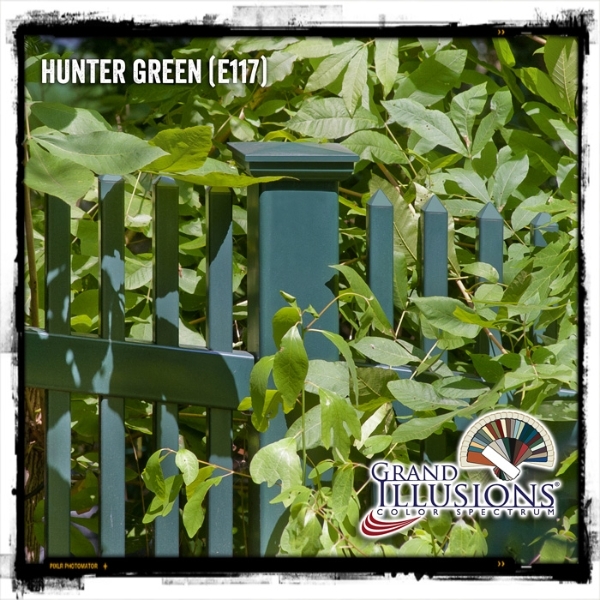 Some of the most popular colors include Black (L105) and Hunter Green (E117). 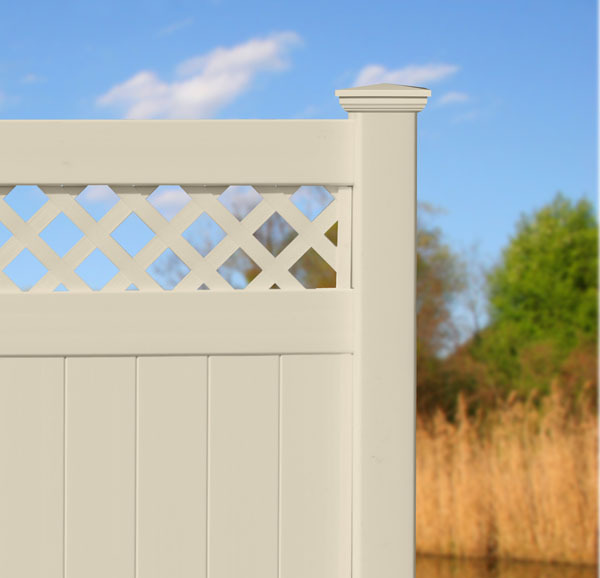 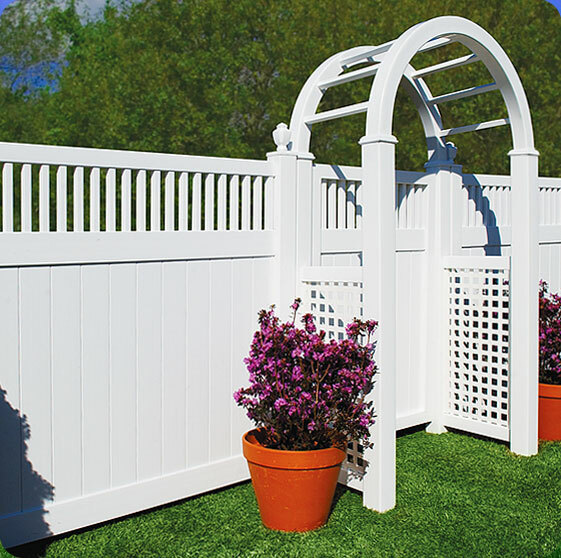 And Patio White is a matte finish PVC vinyl fence product without the shine that classic vinyl has. 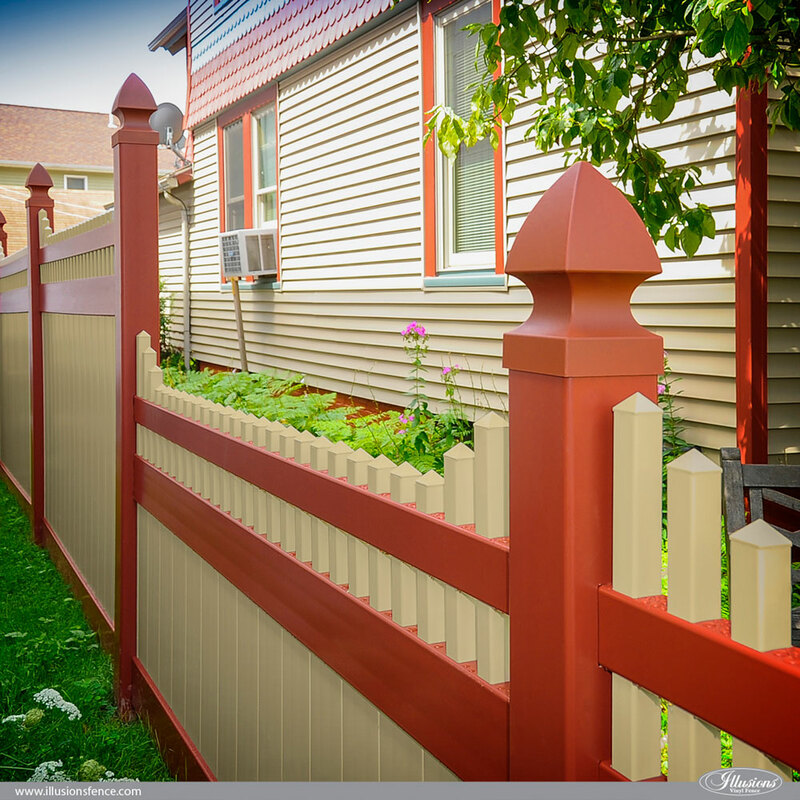 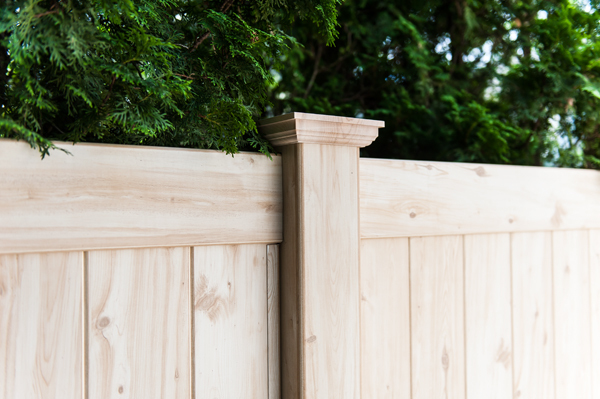 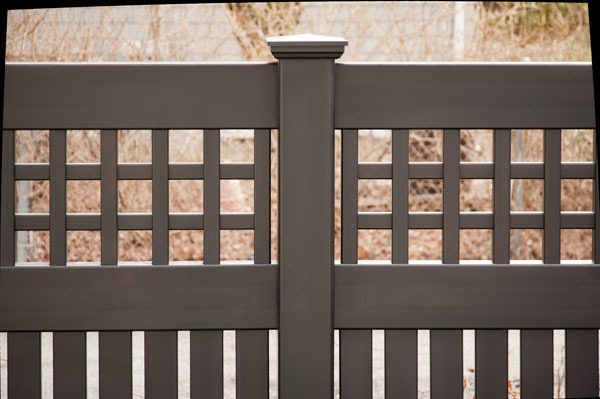 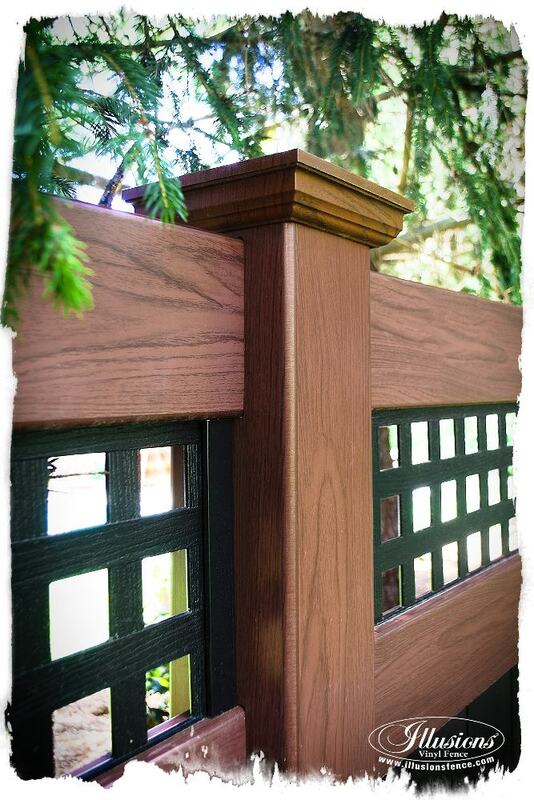 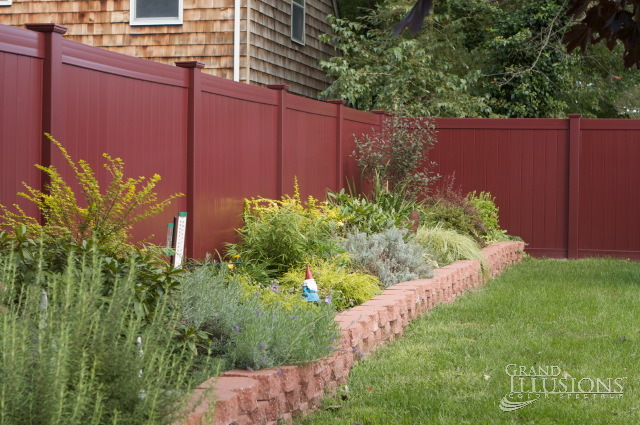 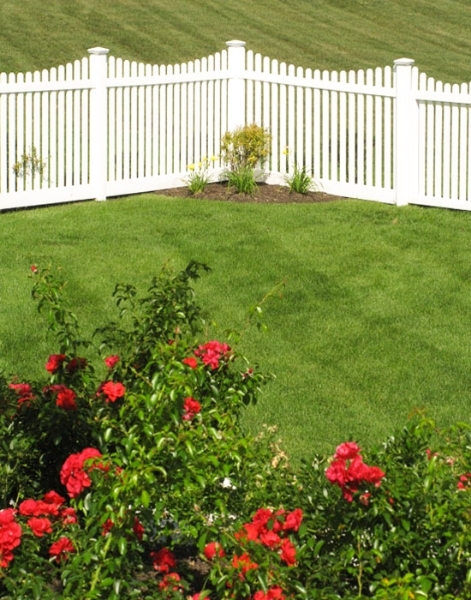 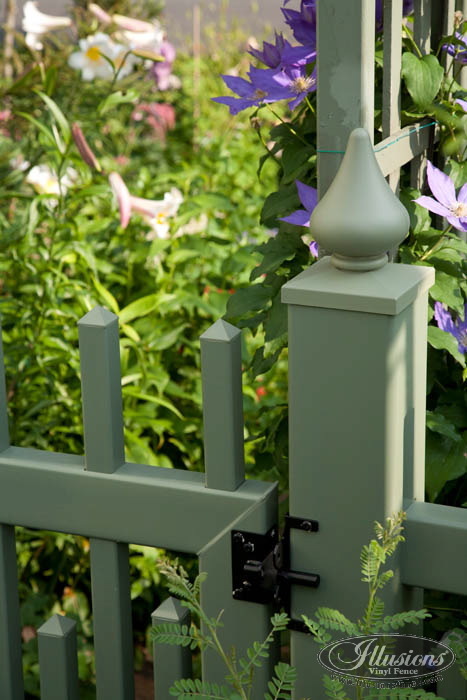 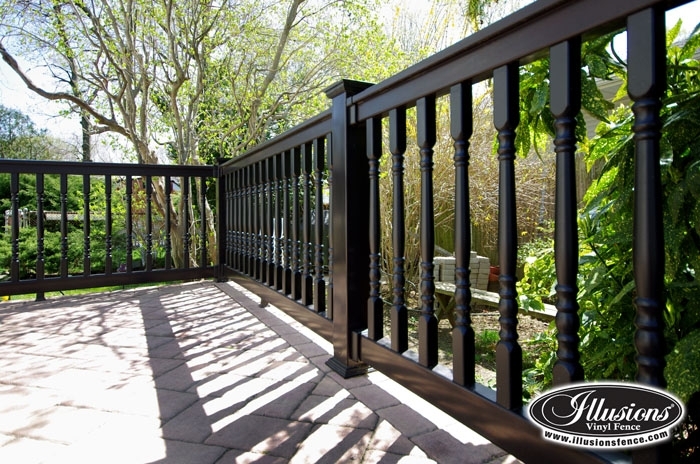 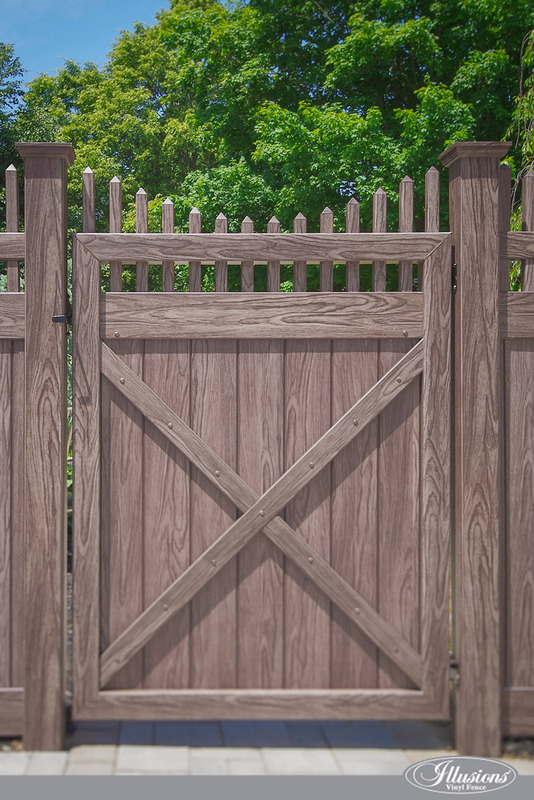 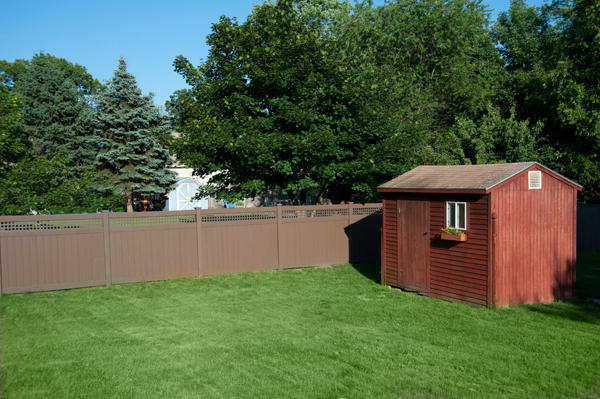 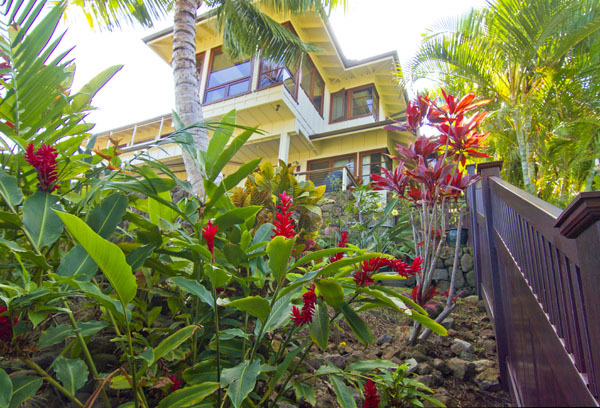 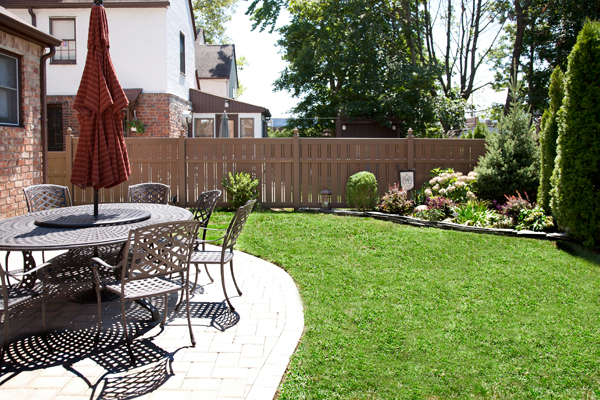 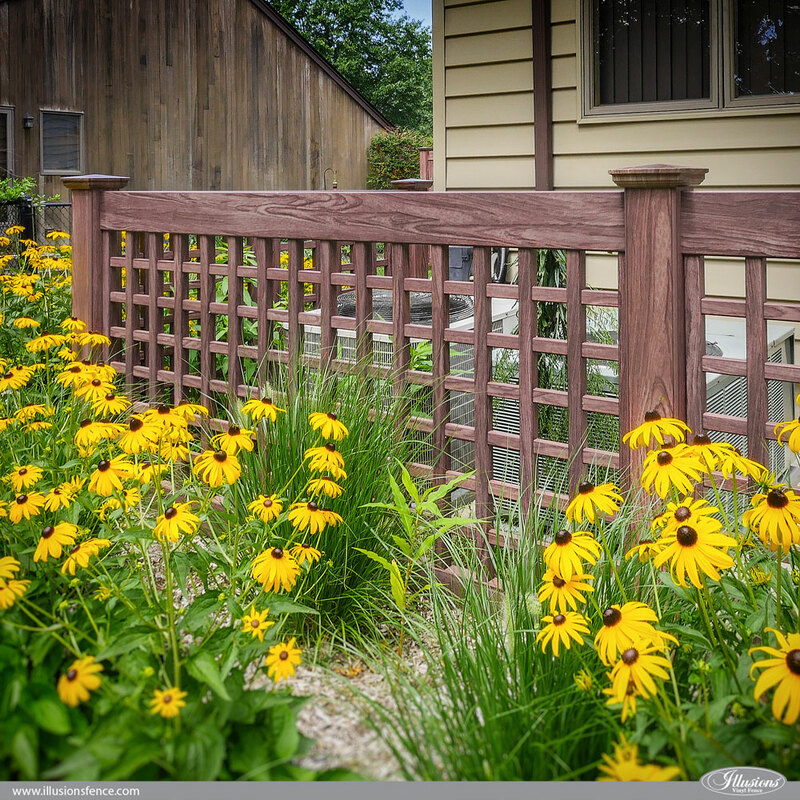 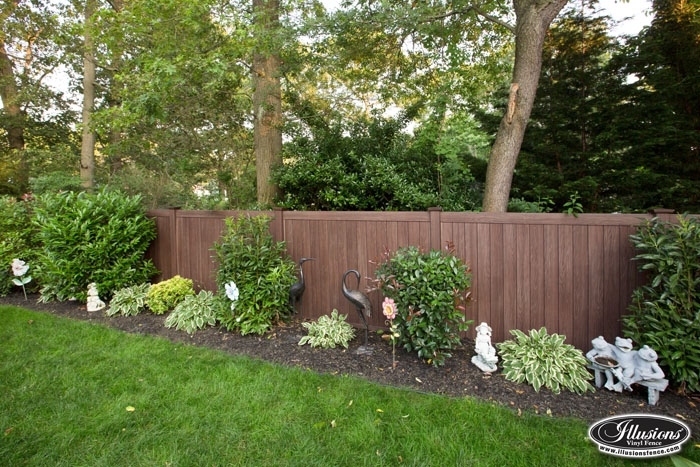 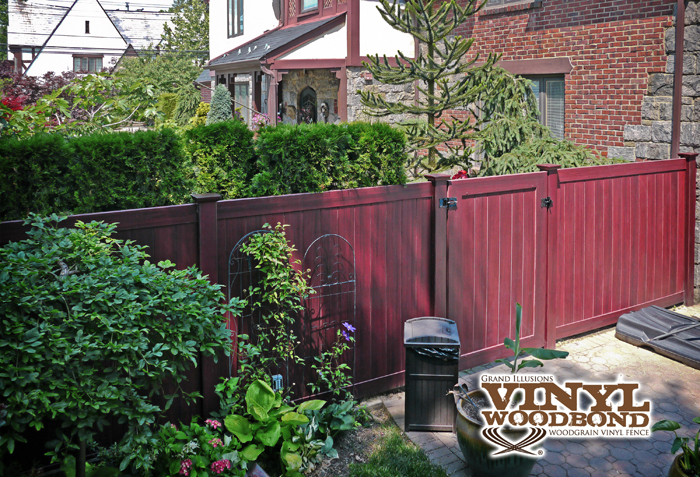 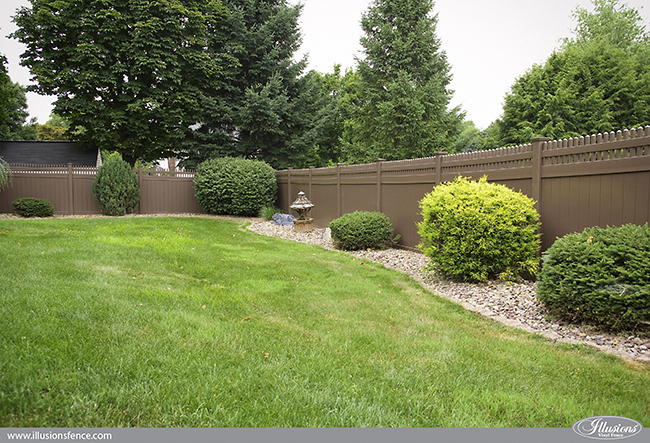 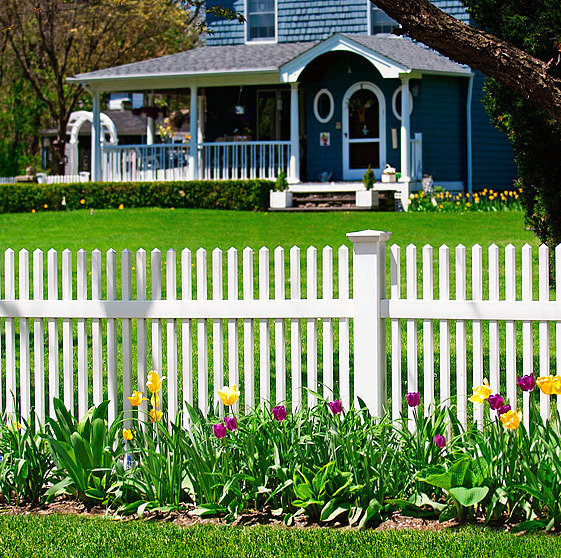 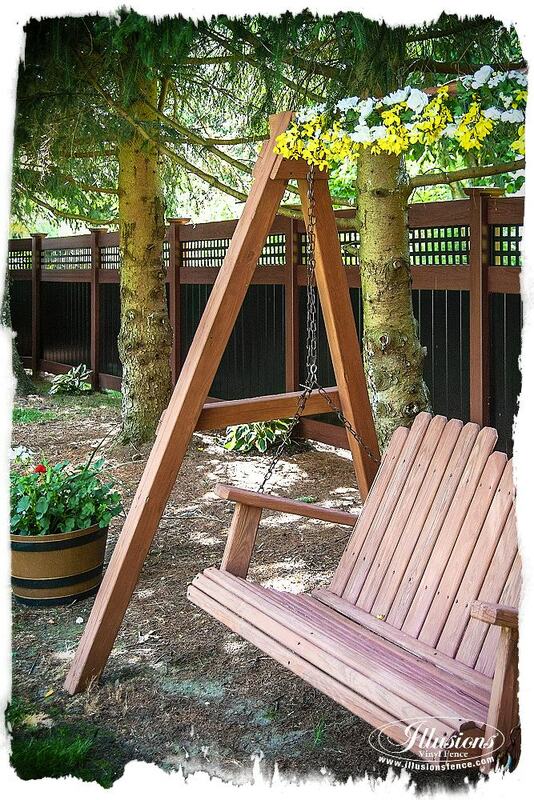 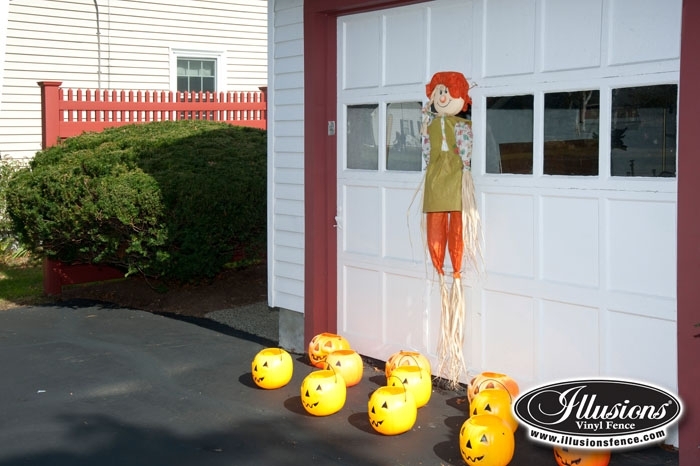 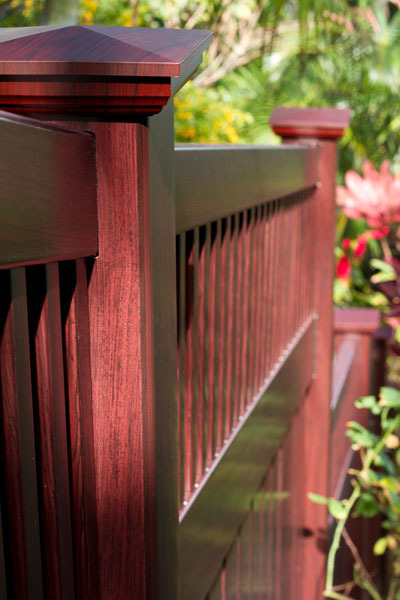 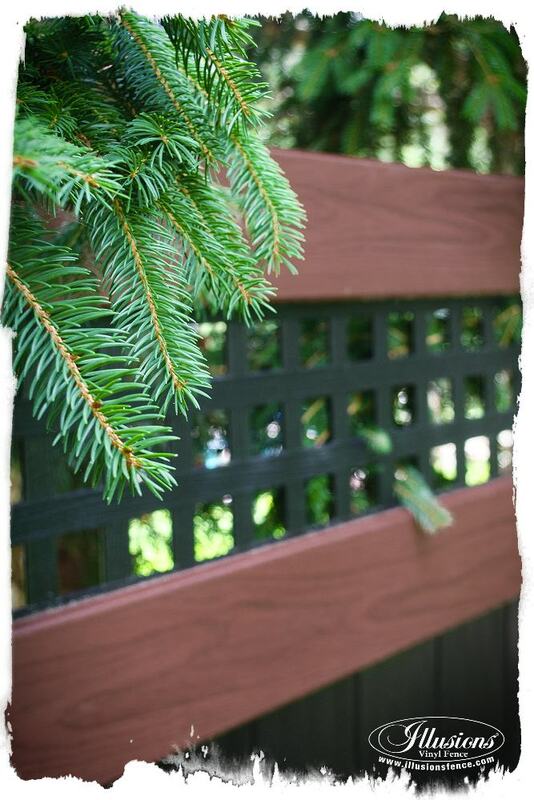 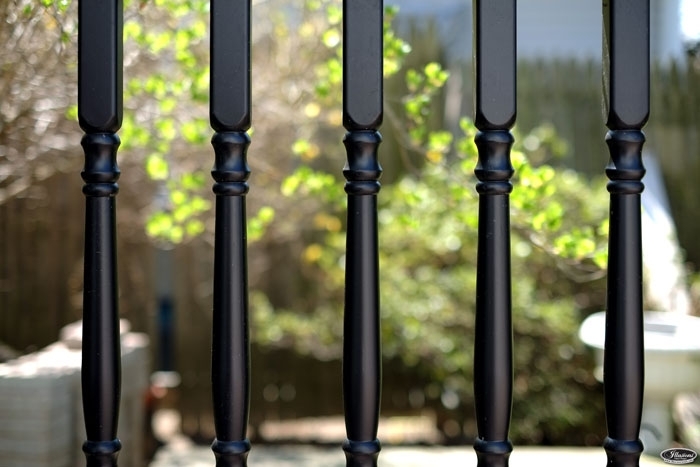 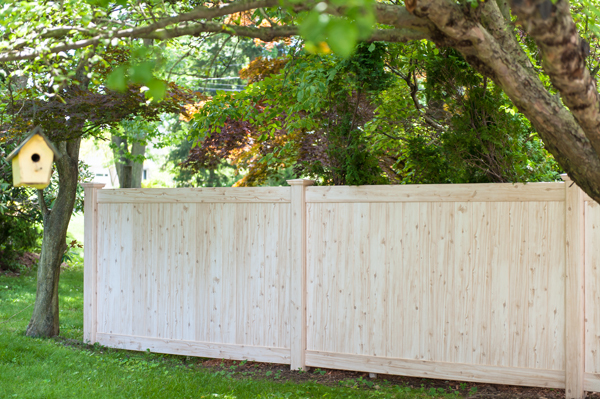 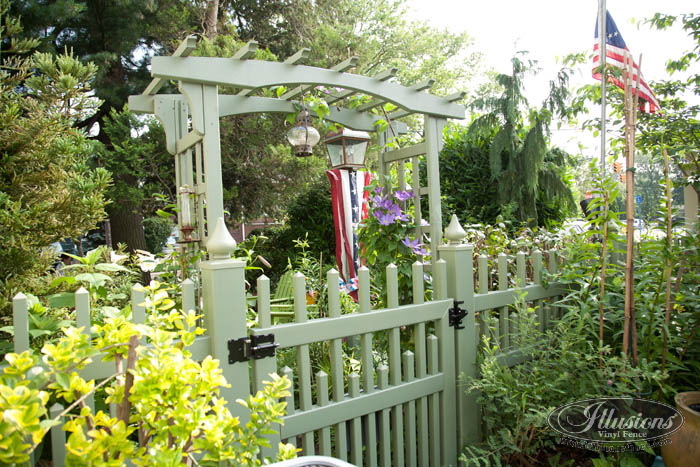 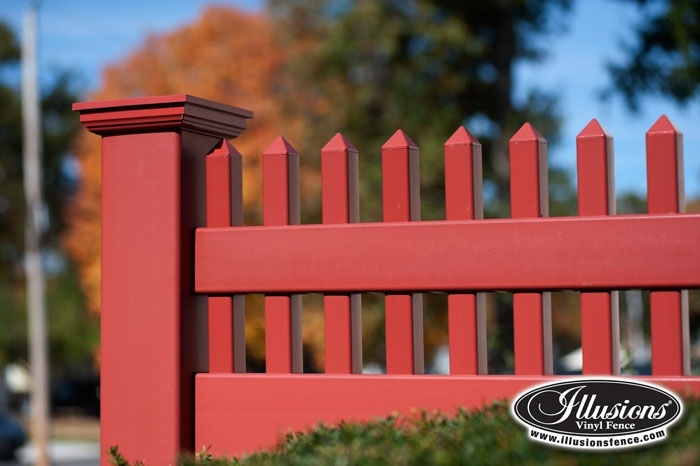 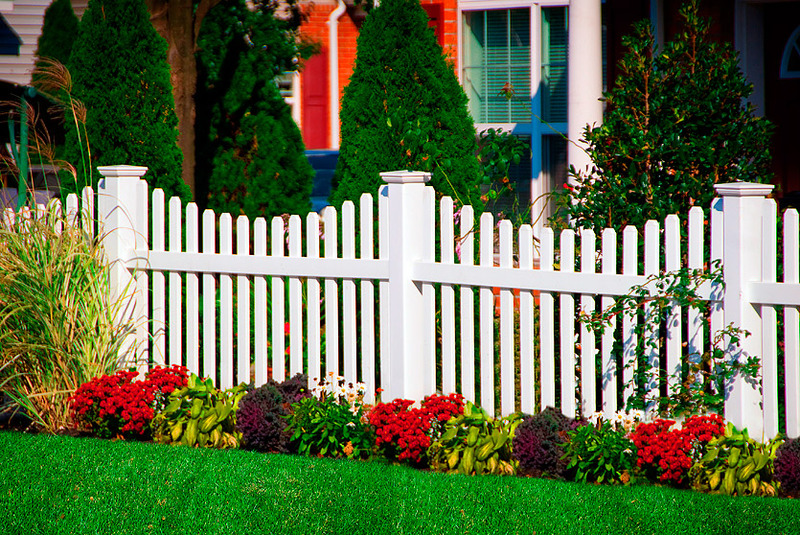 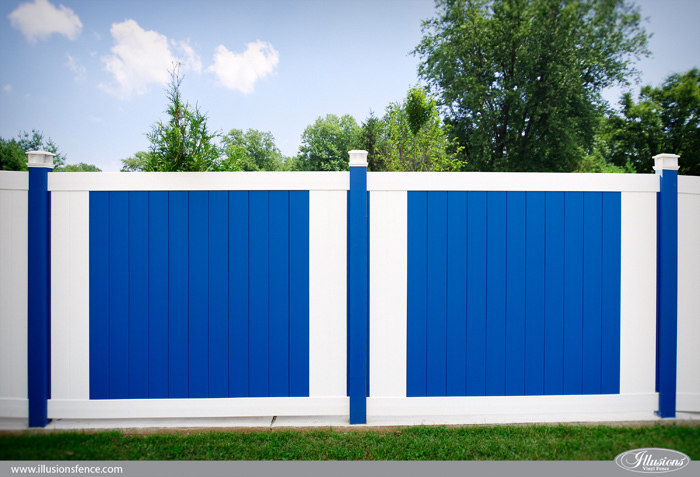 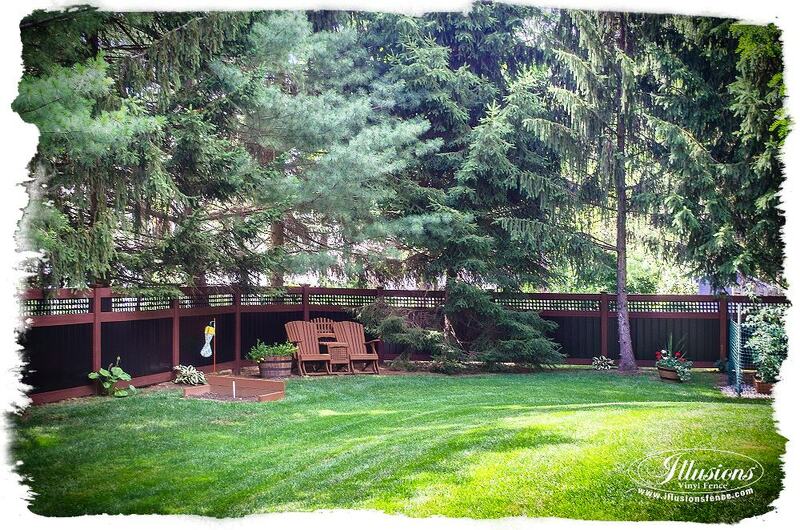 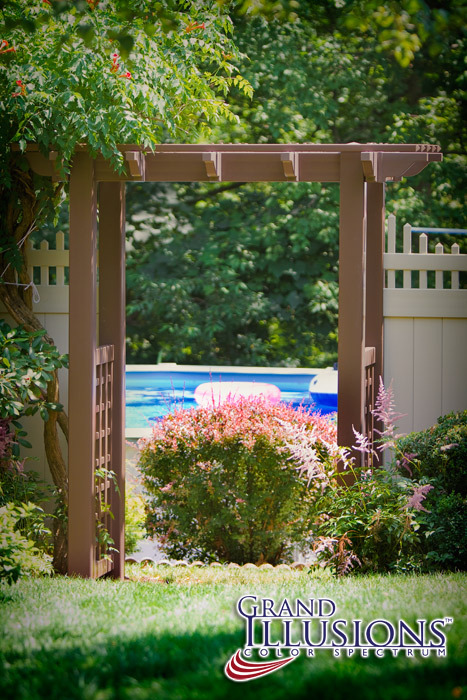 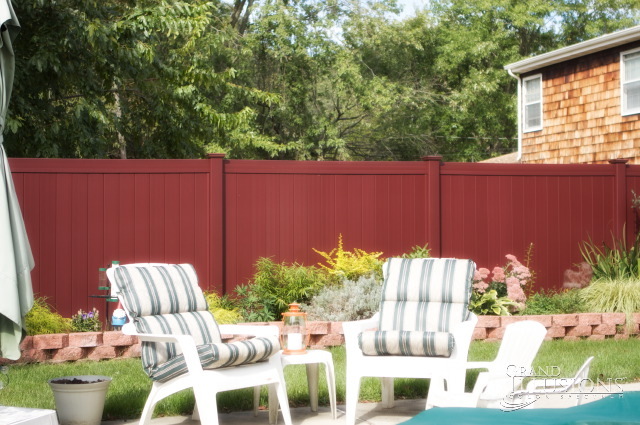 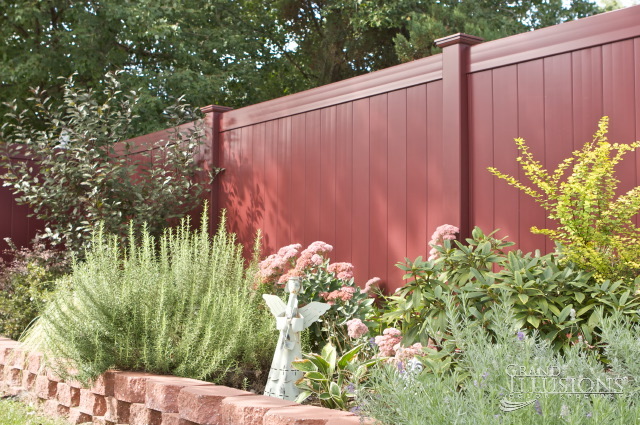 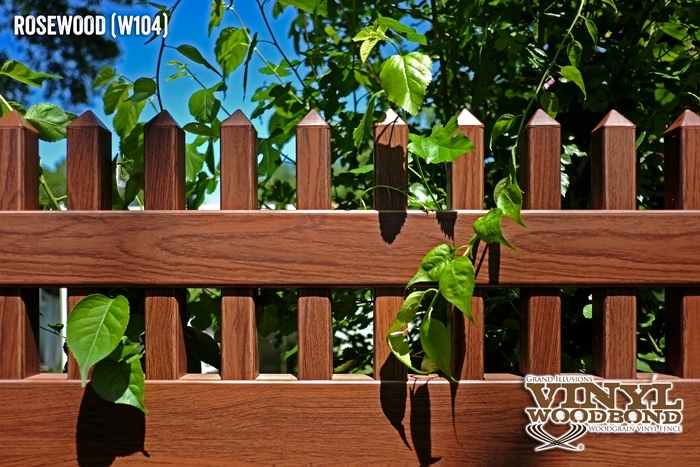 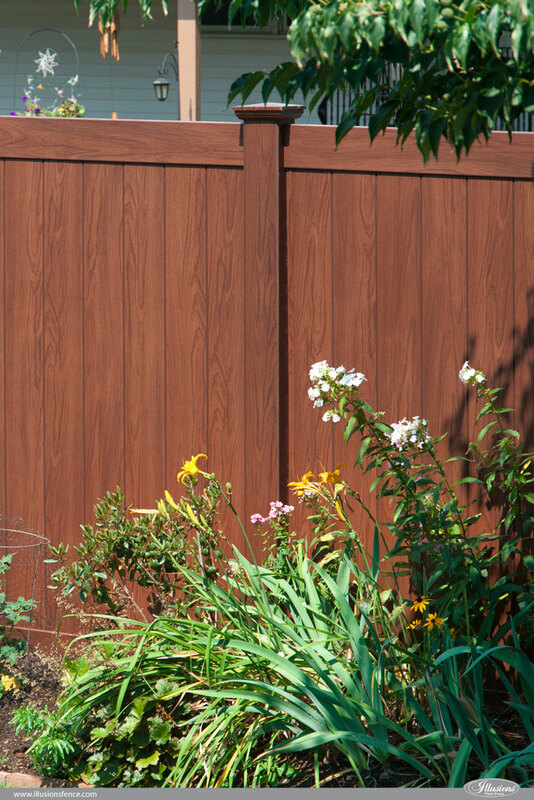 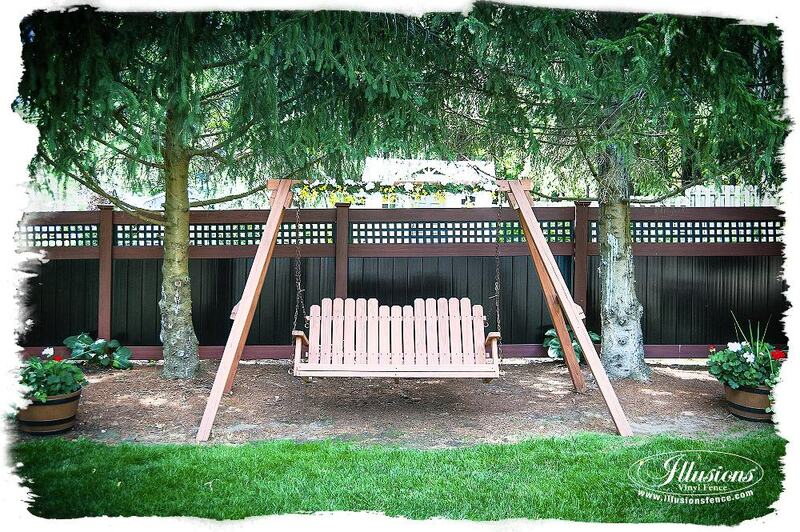 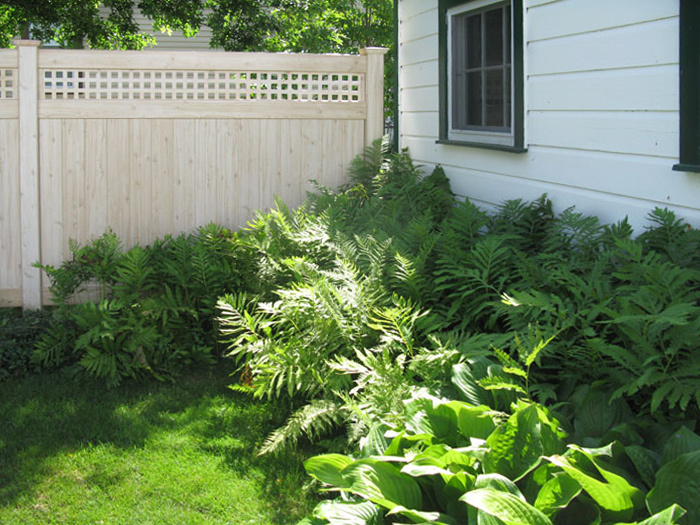 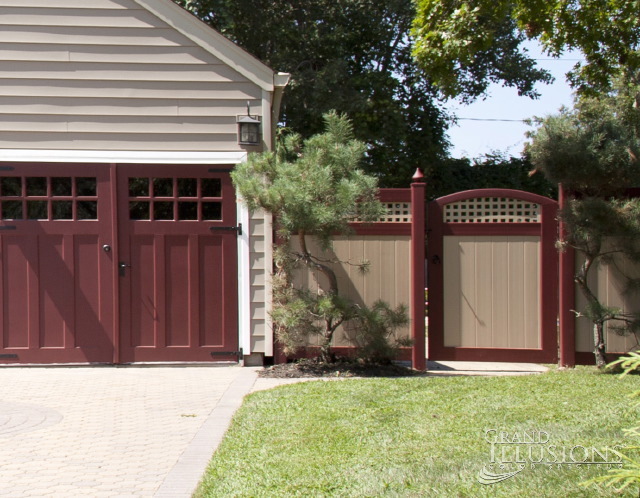 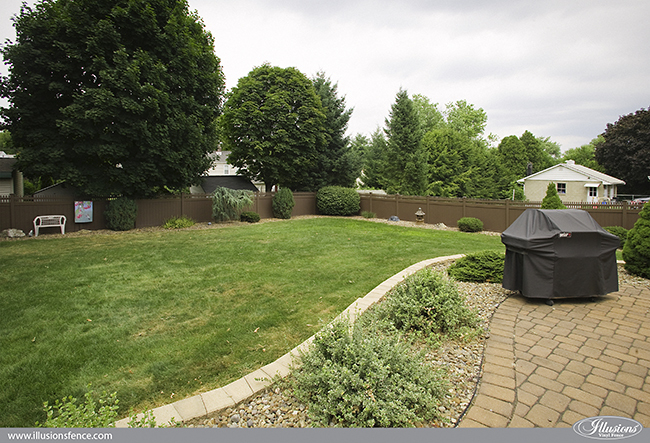 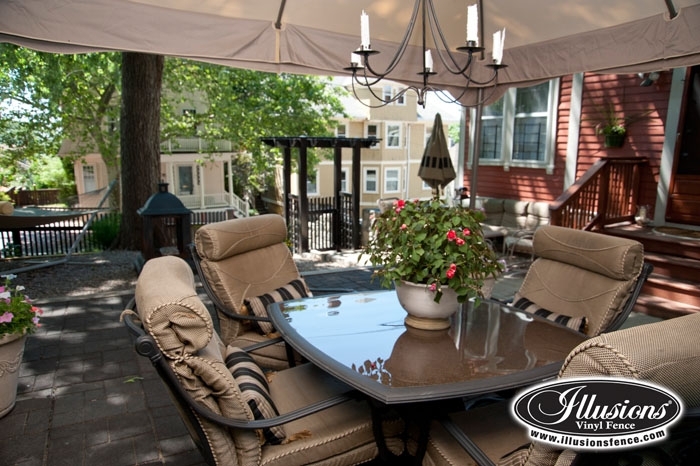 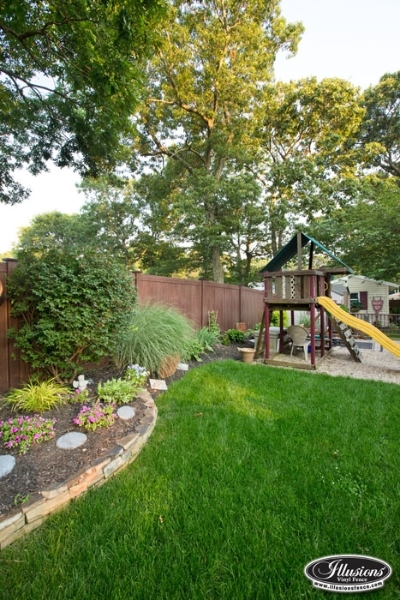 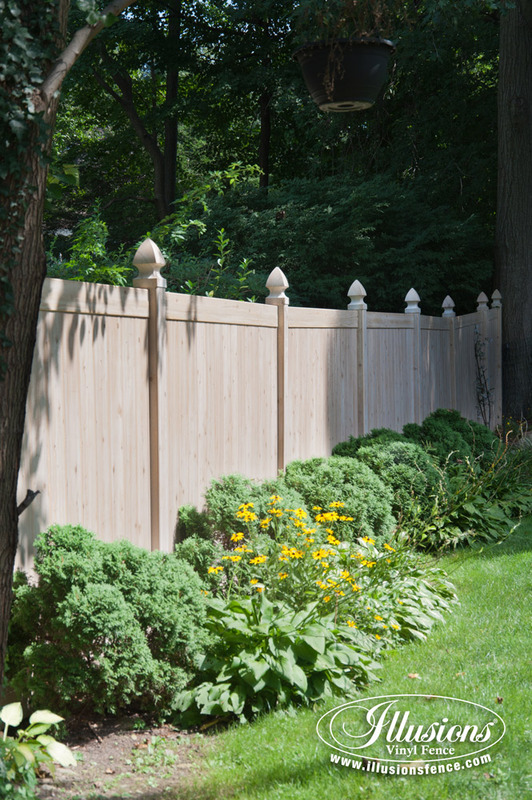 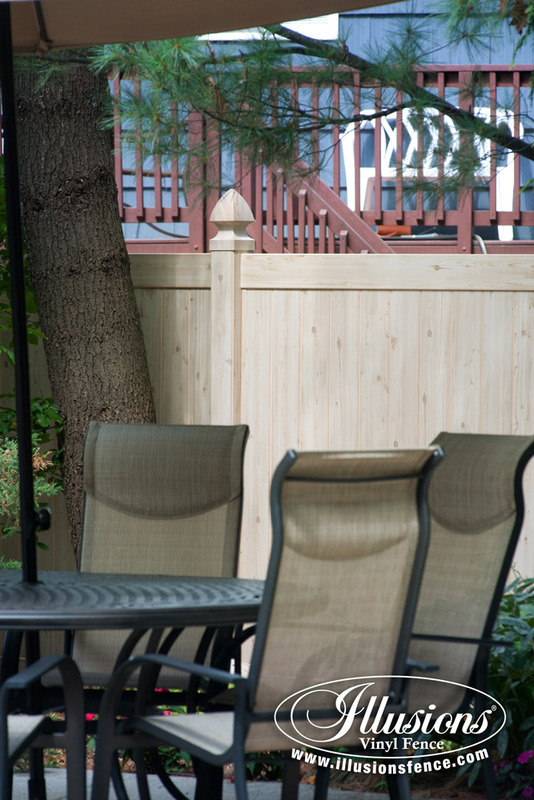 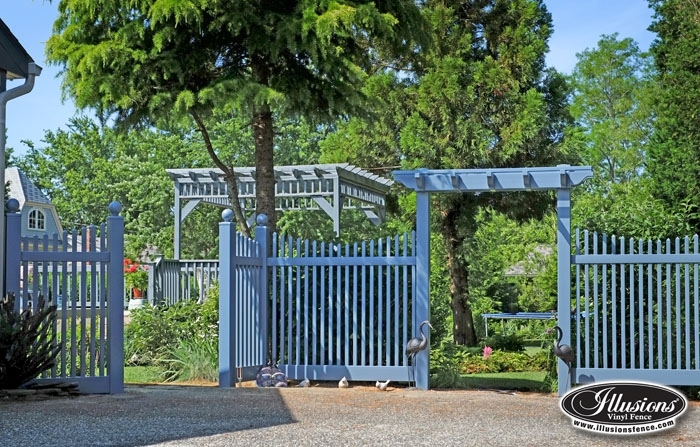 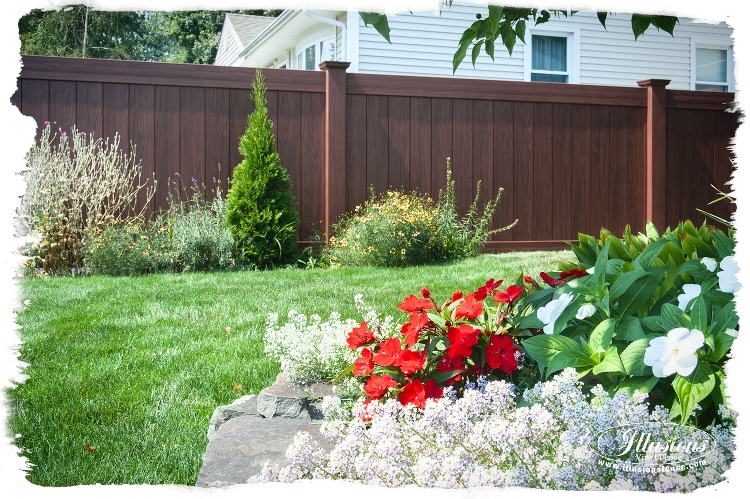 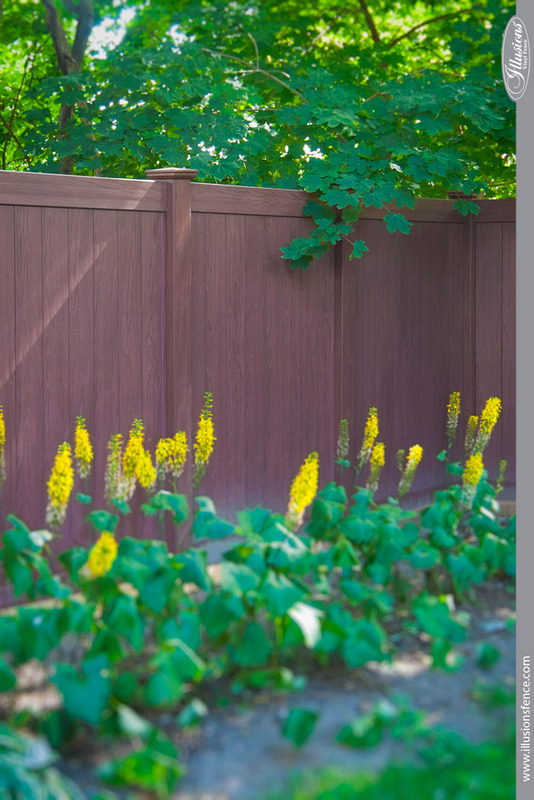 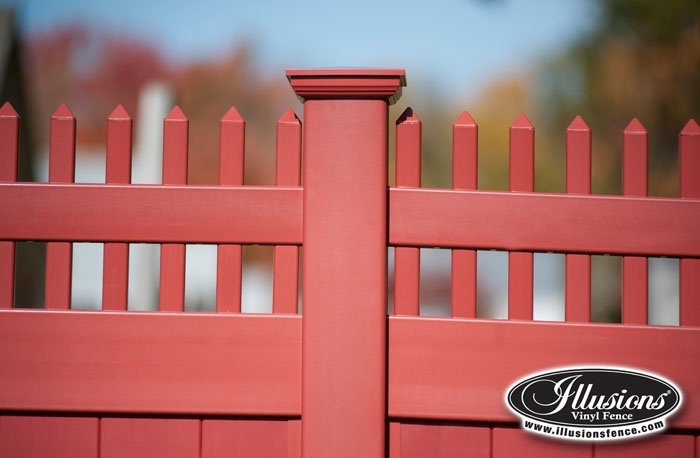 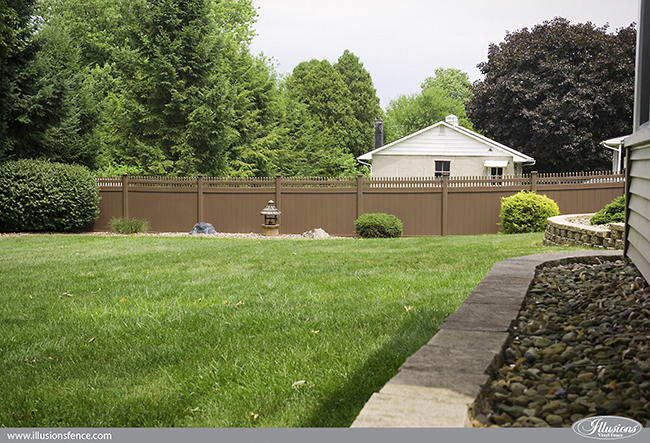 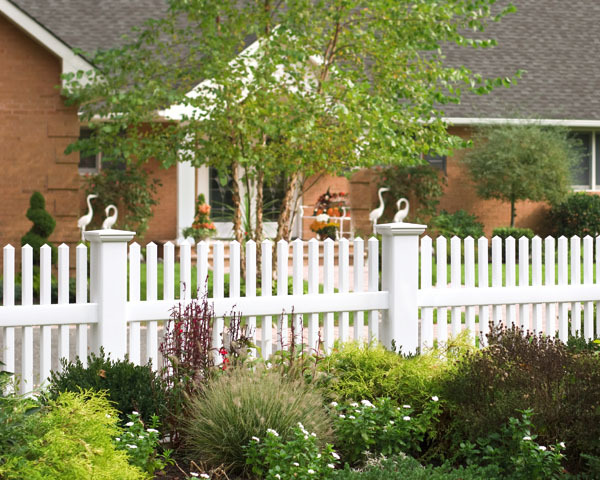 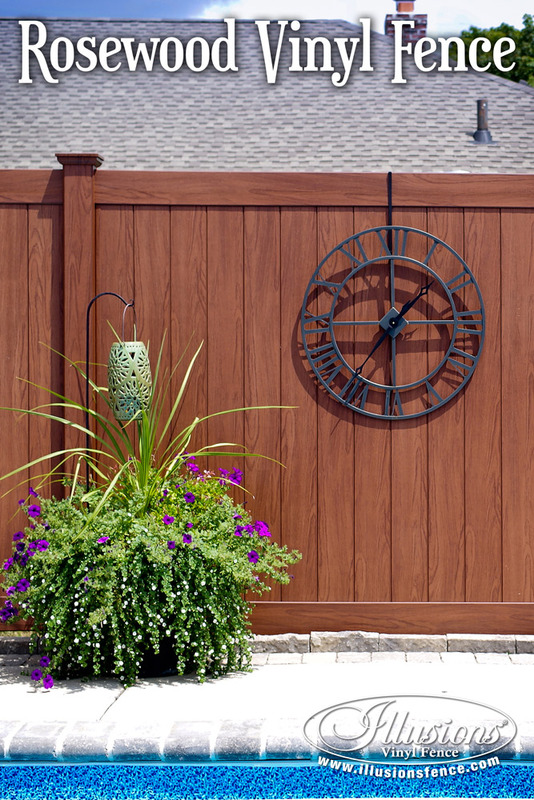 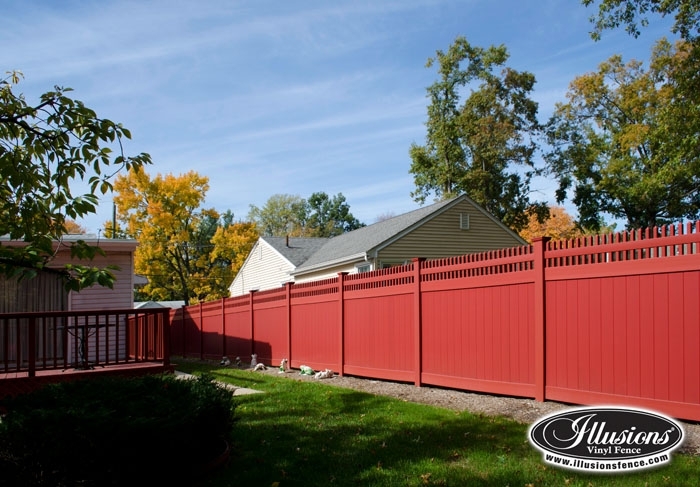 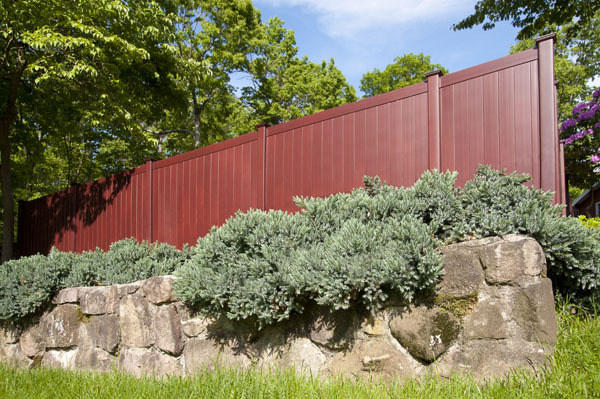 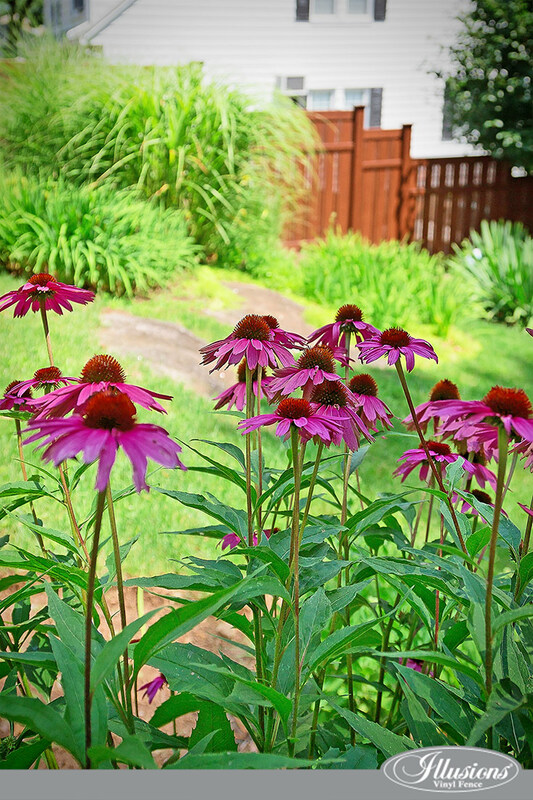 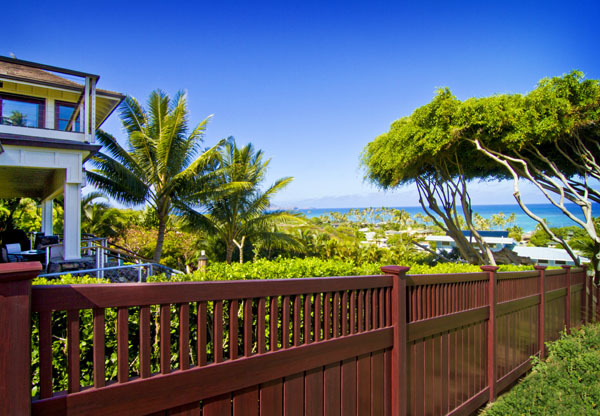 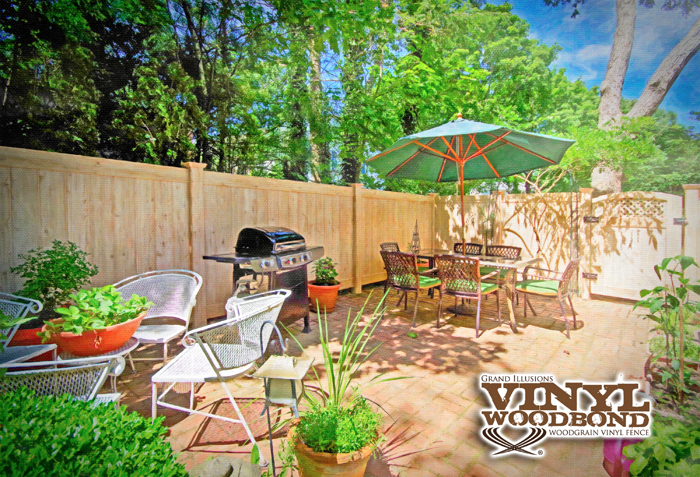 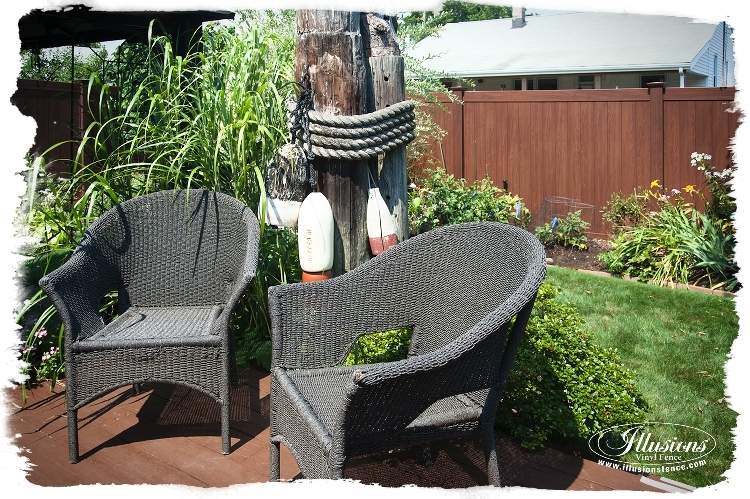 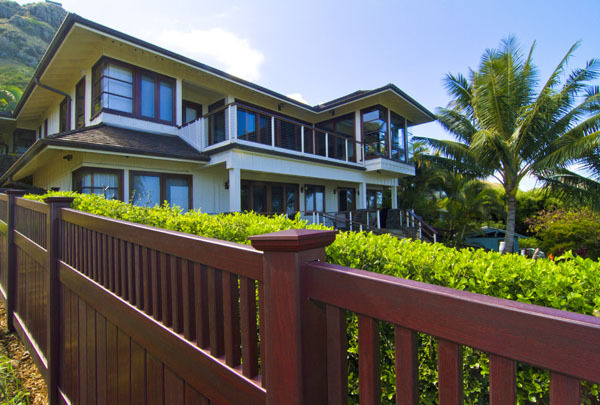 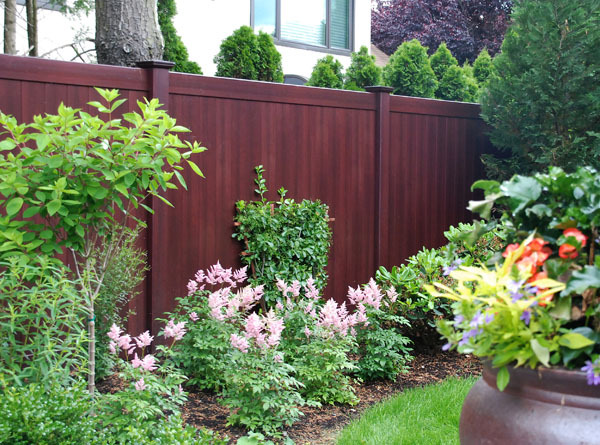 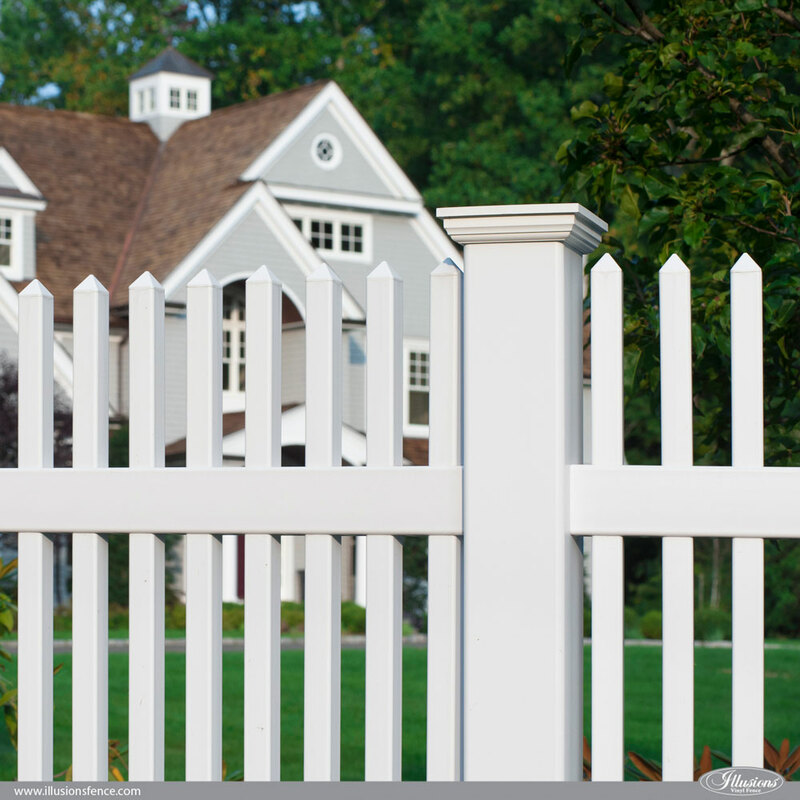 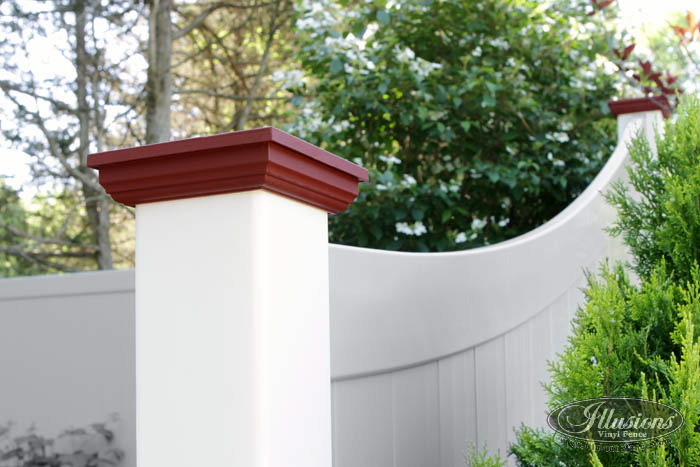 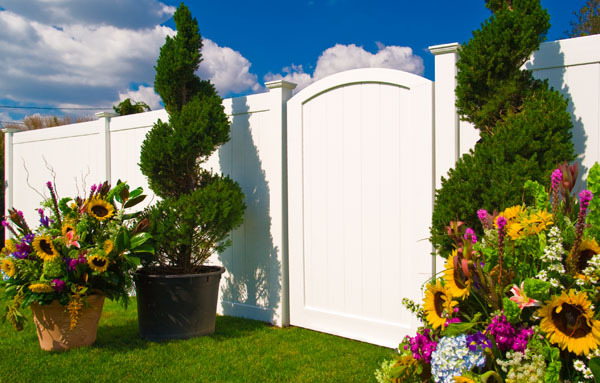 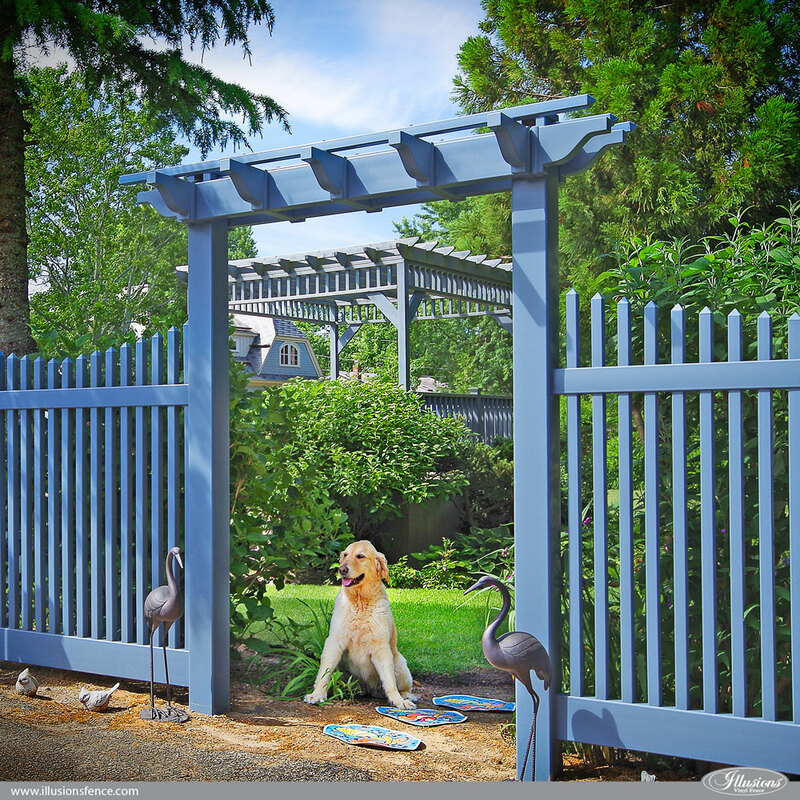 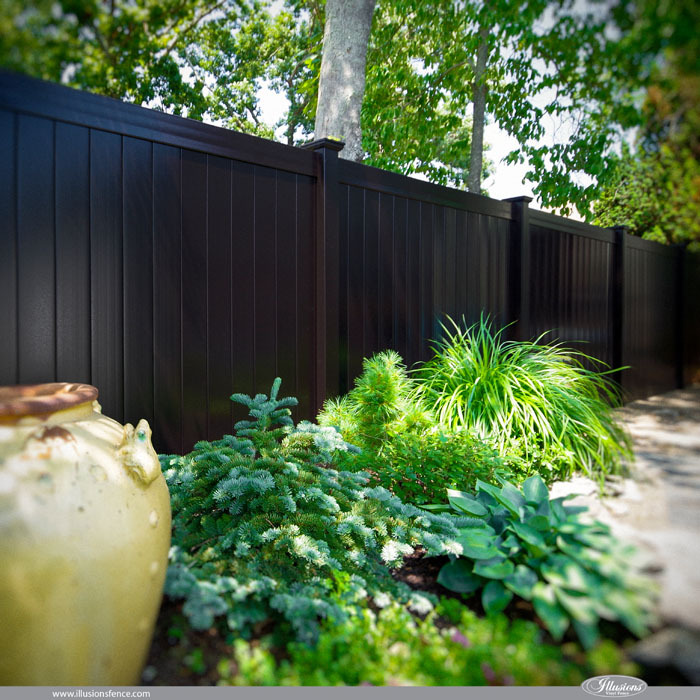 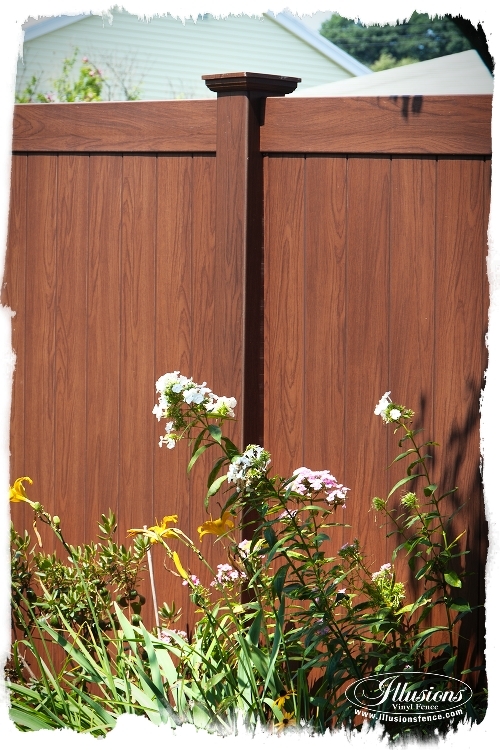 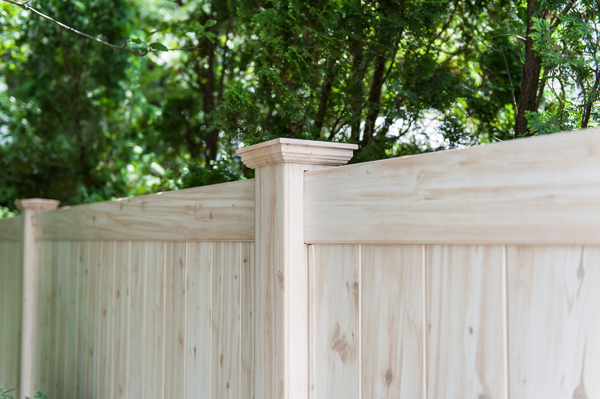 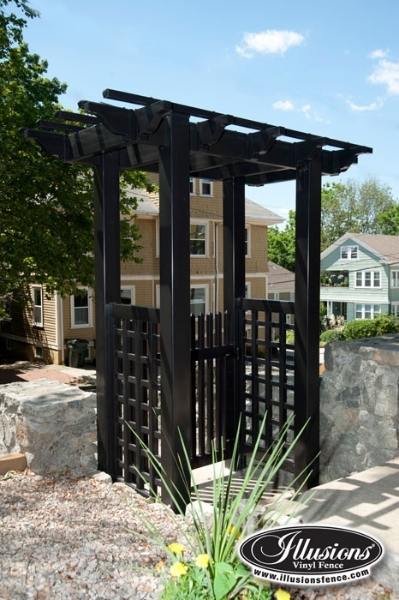 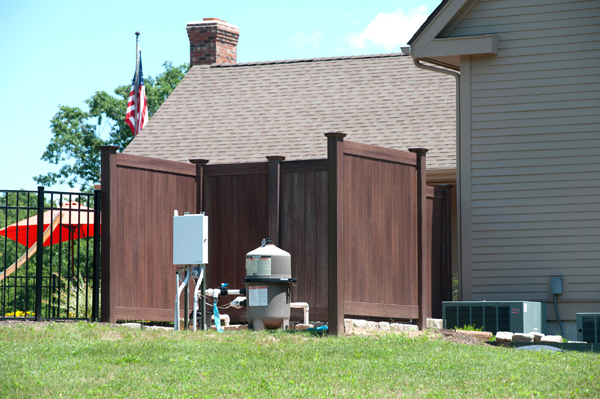 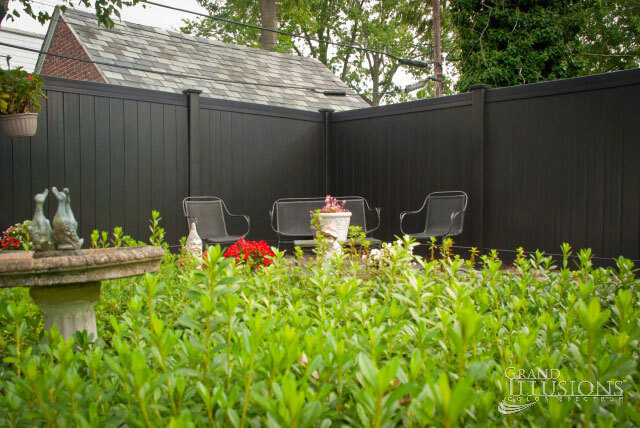 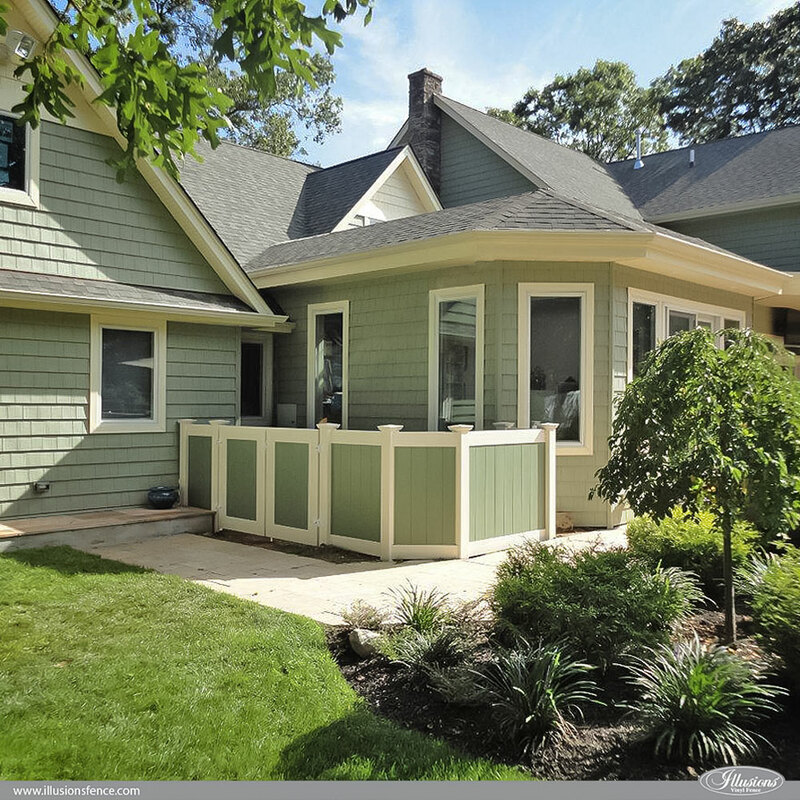 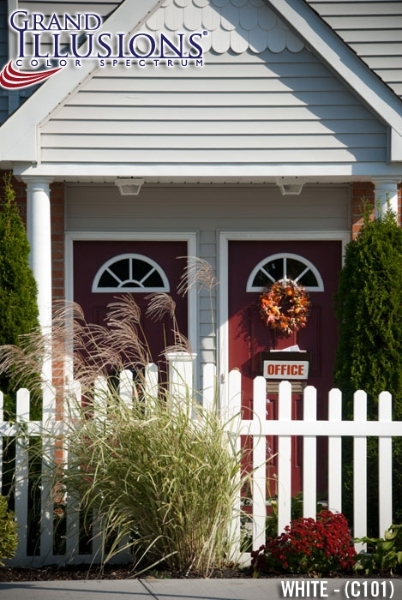 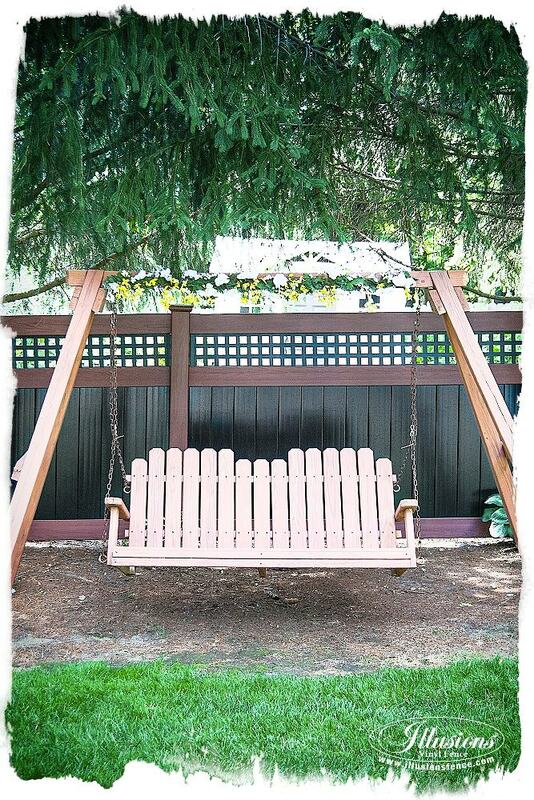 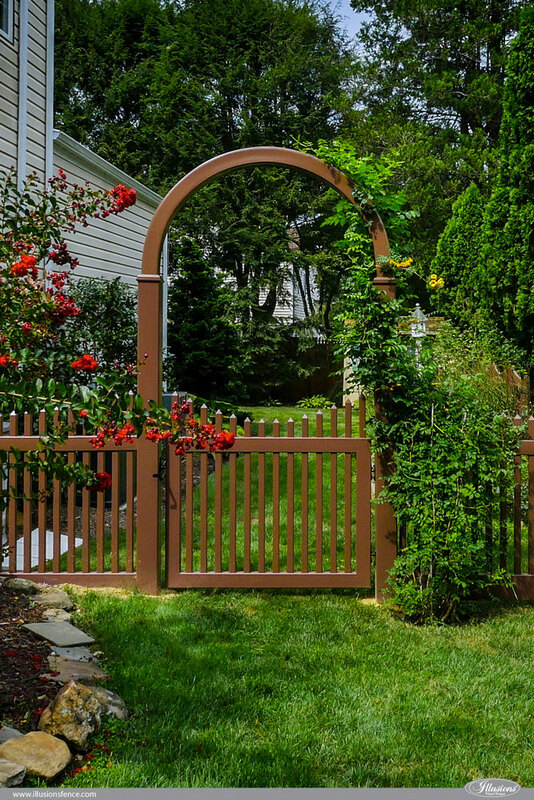 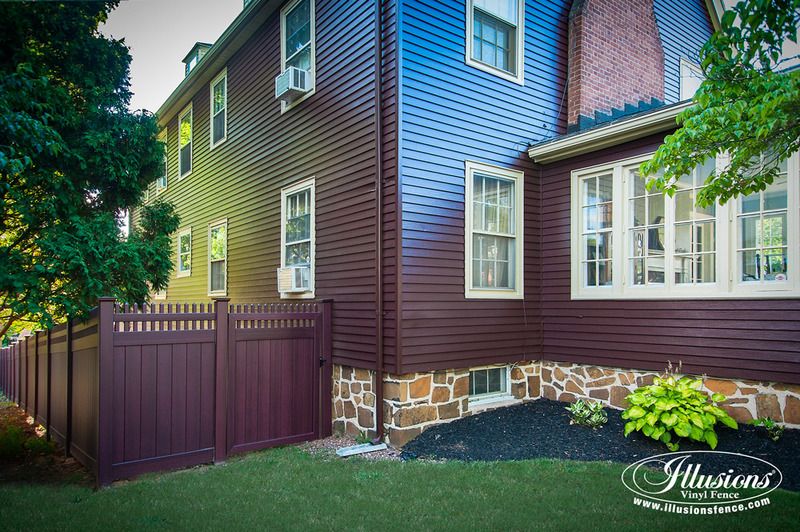 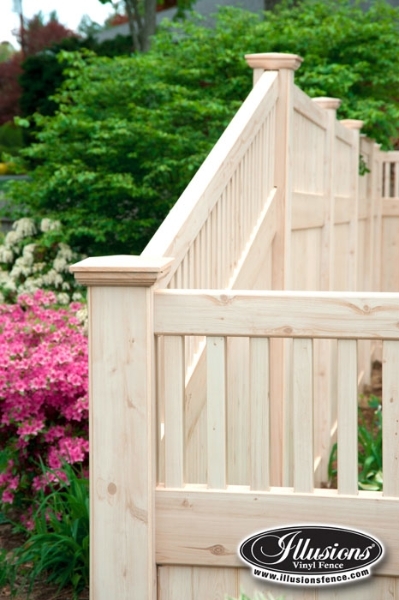 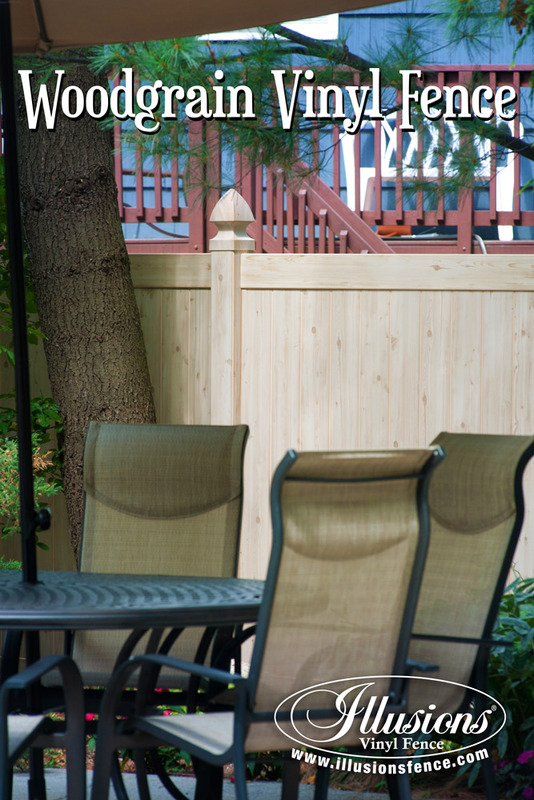 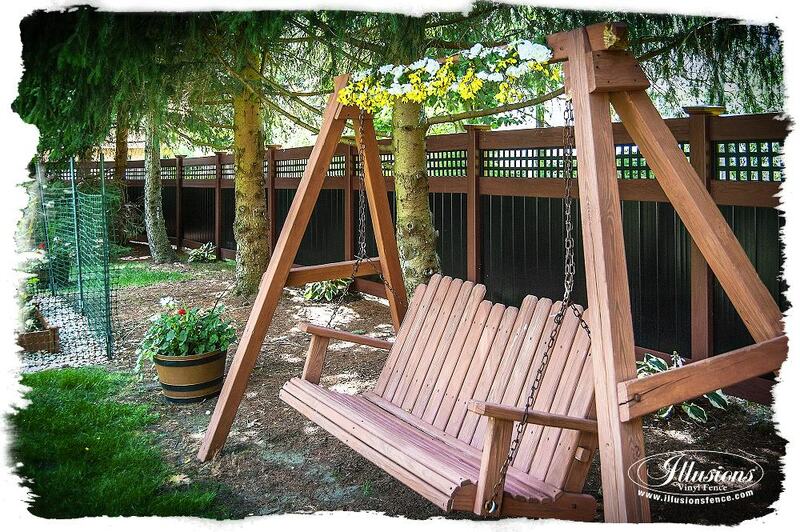 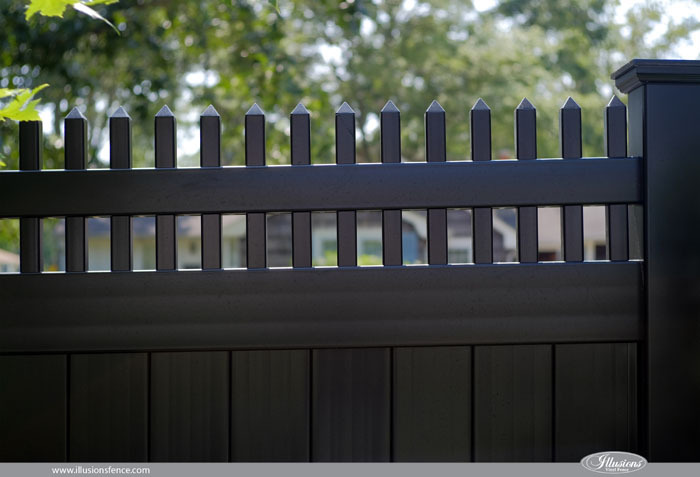 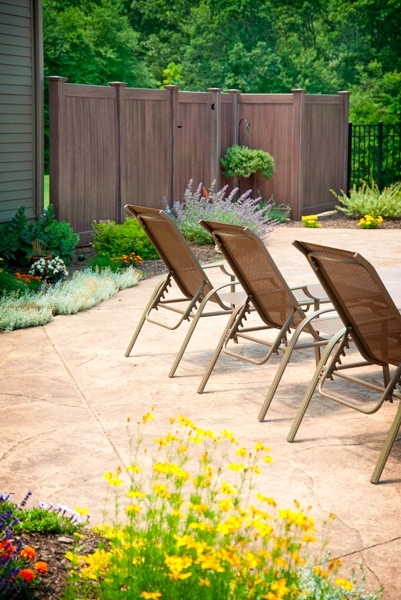 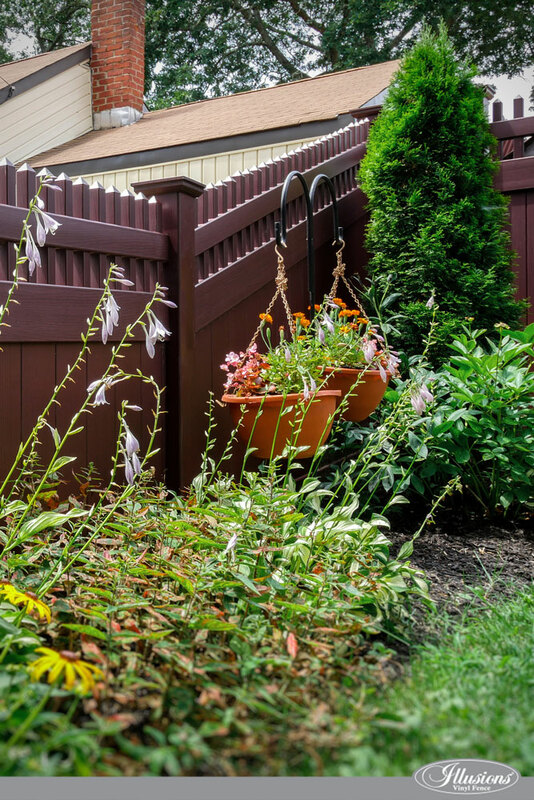 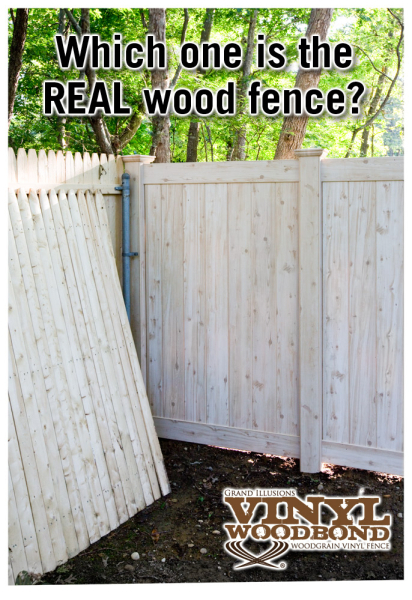 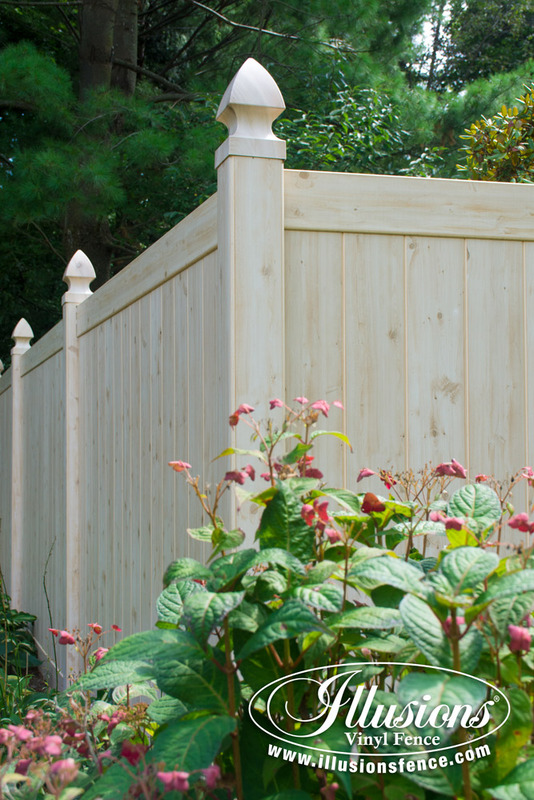 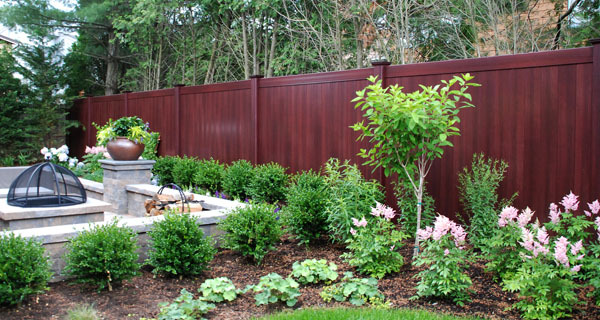 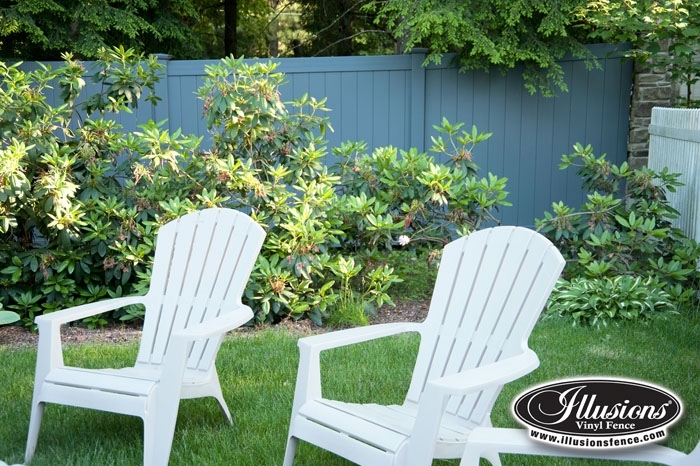 Many consumers are looking for the look of a painted wood fence without the maintenance. 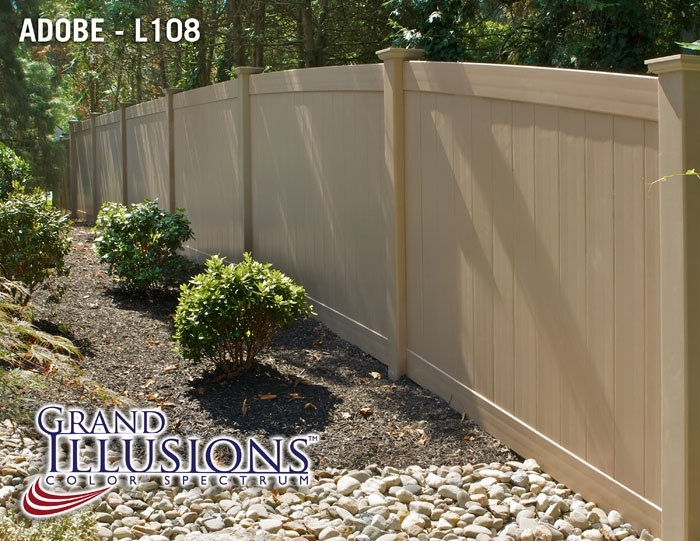 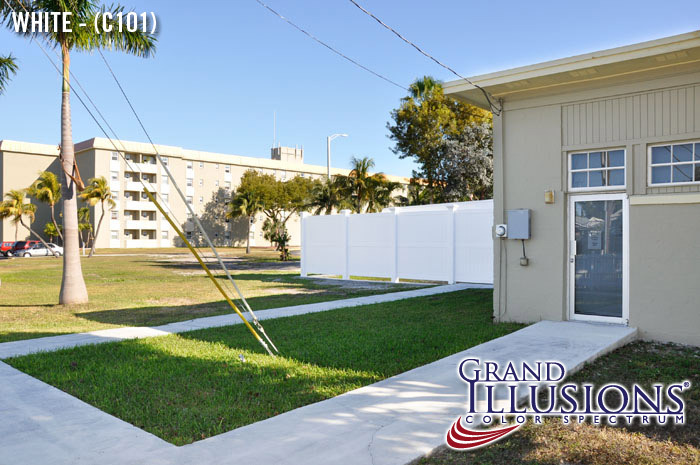 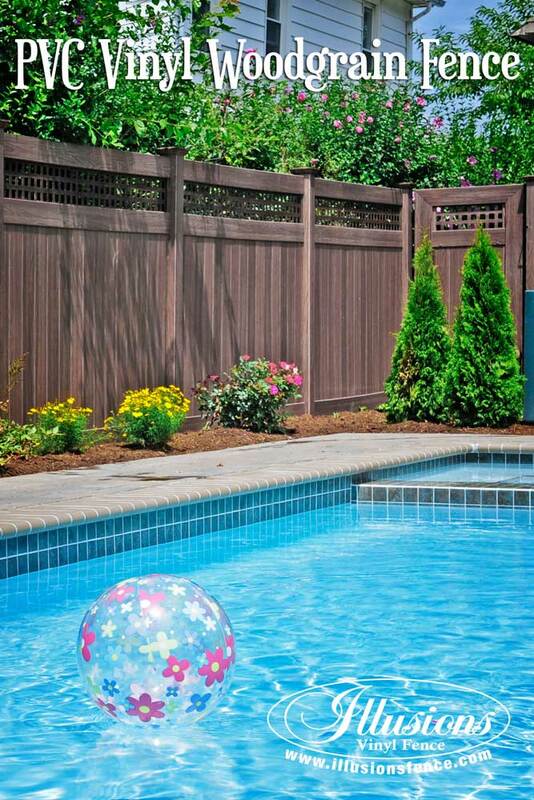 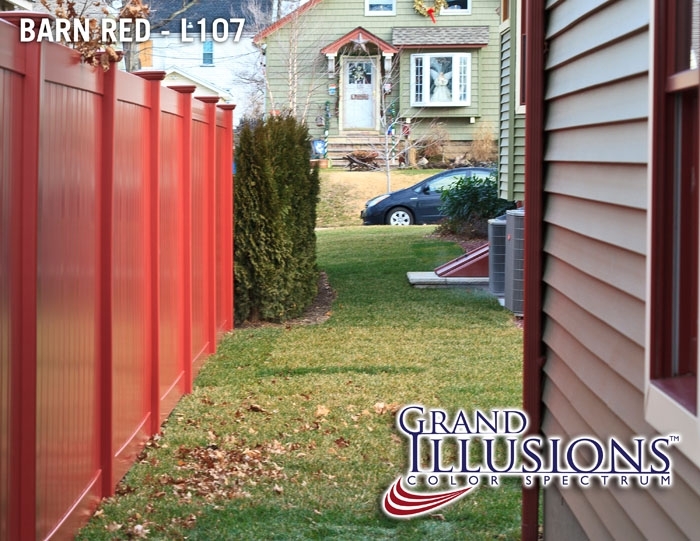 Grand Illusions Color Spectrum color PVC vinyl fence products are the answer! 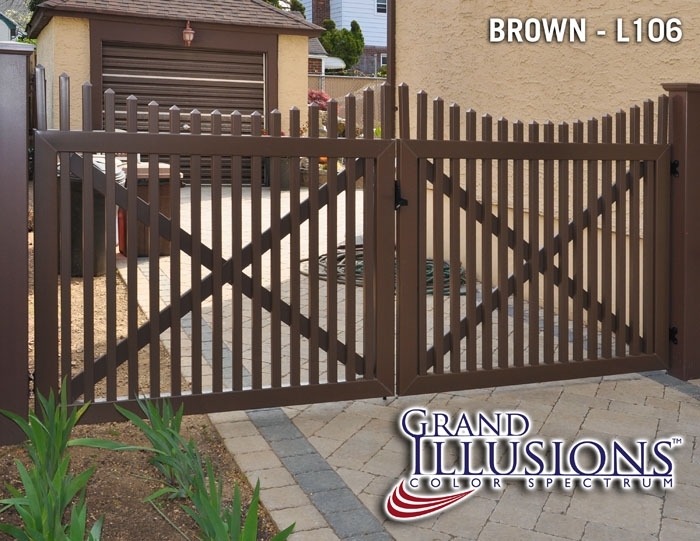 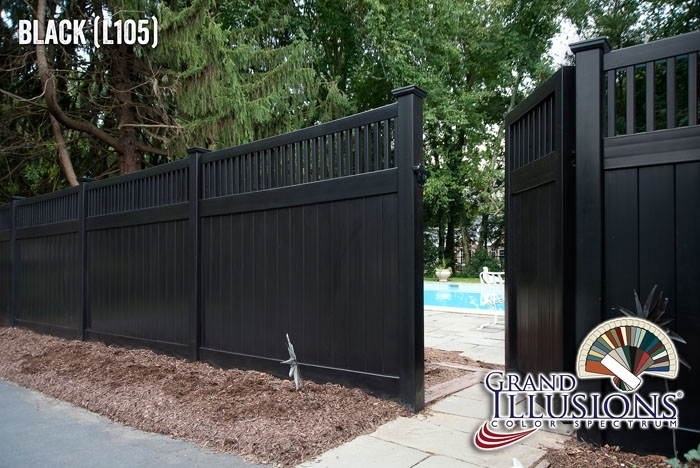 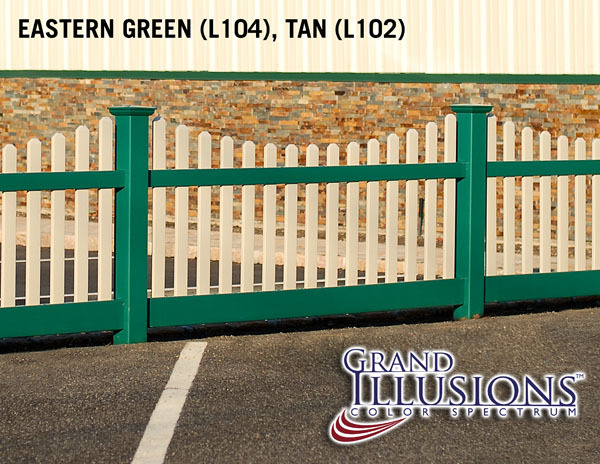 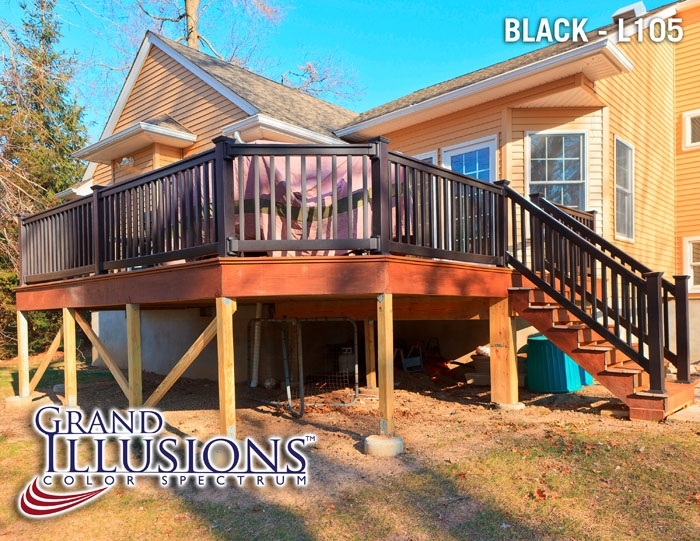 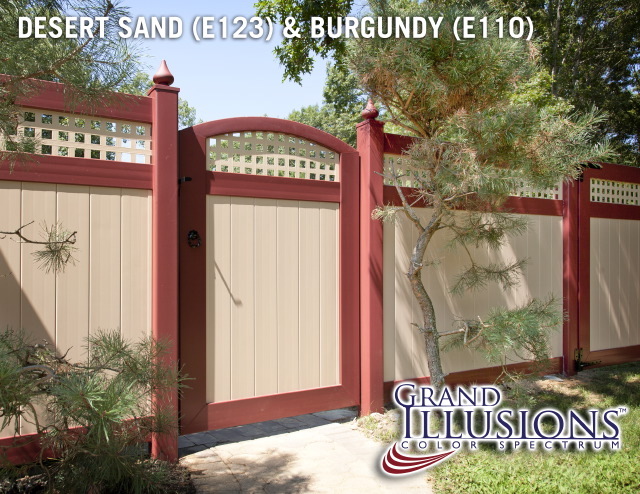 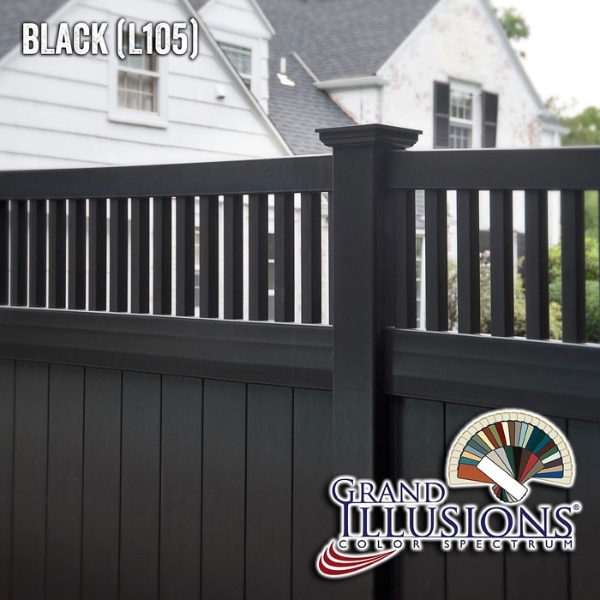 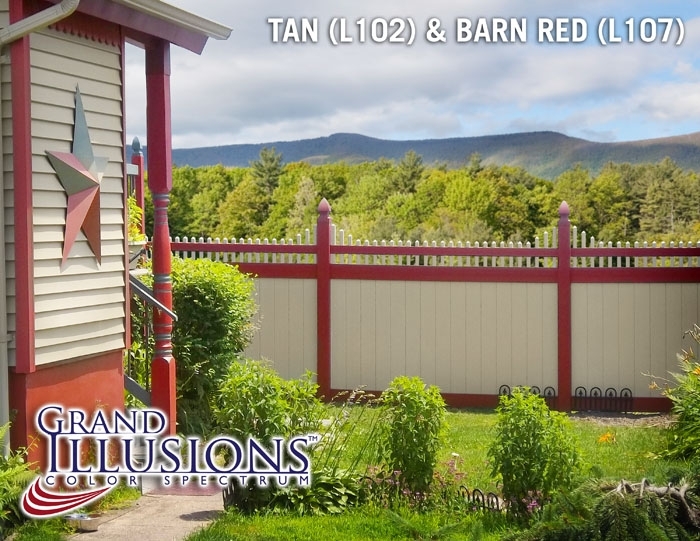 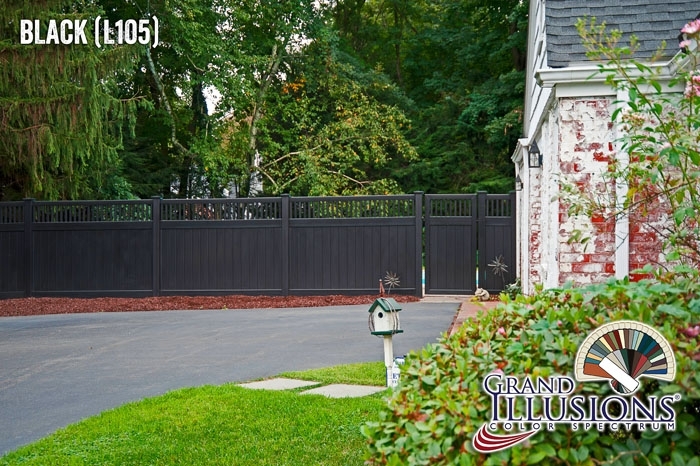 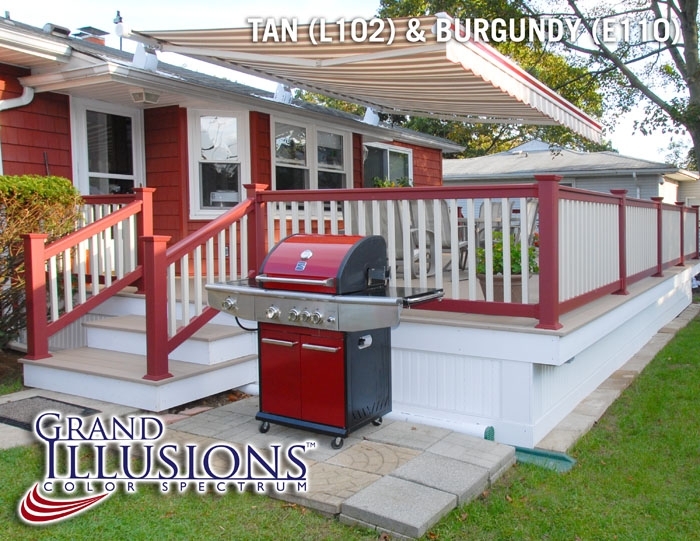 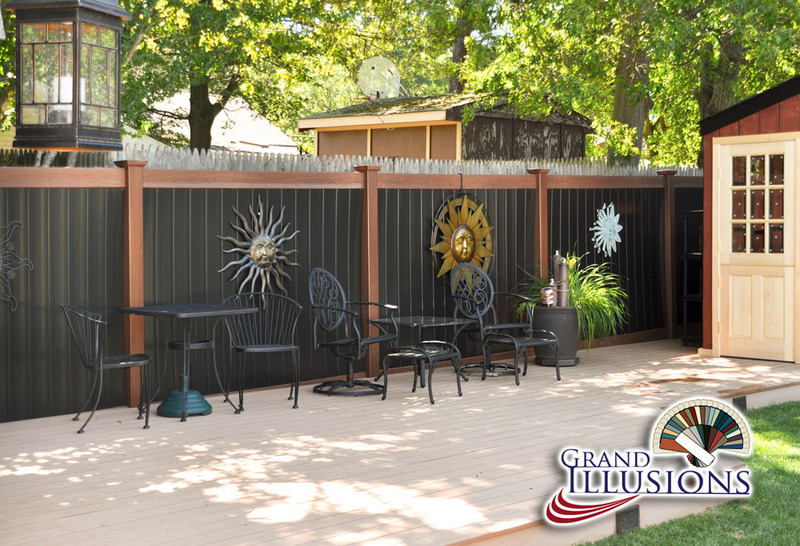 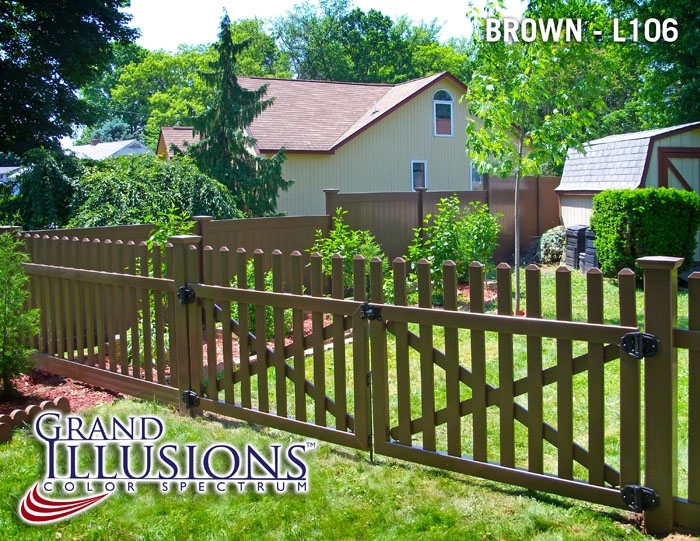 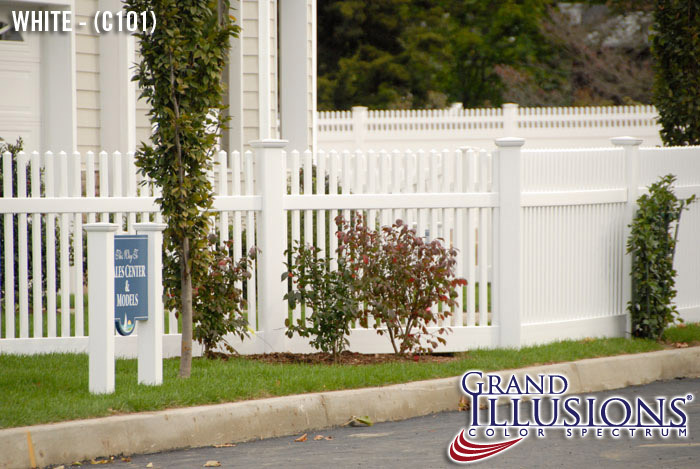 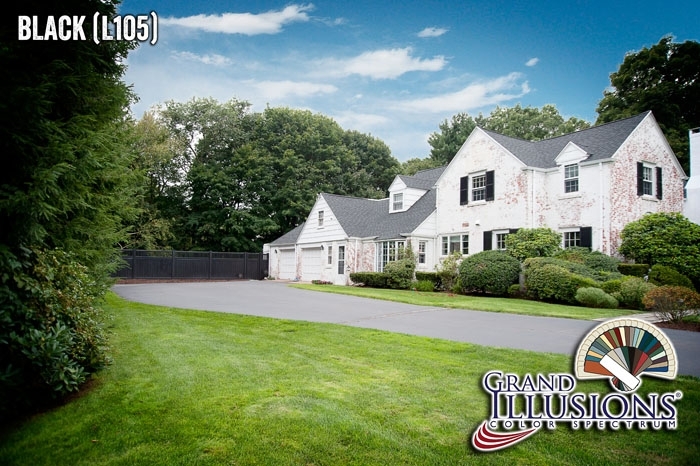 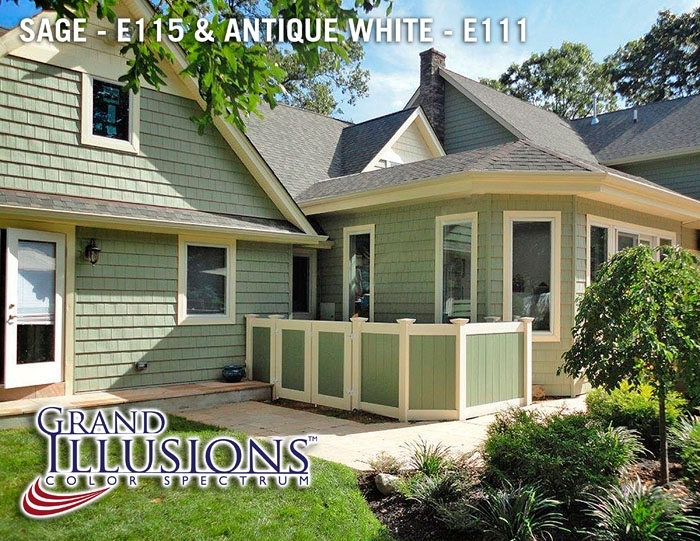 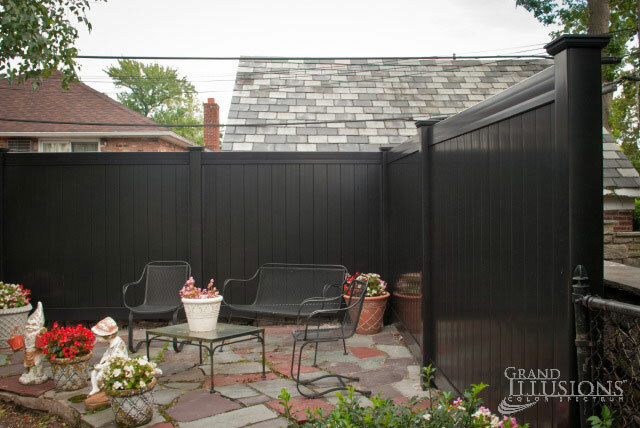 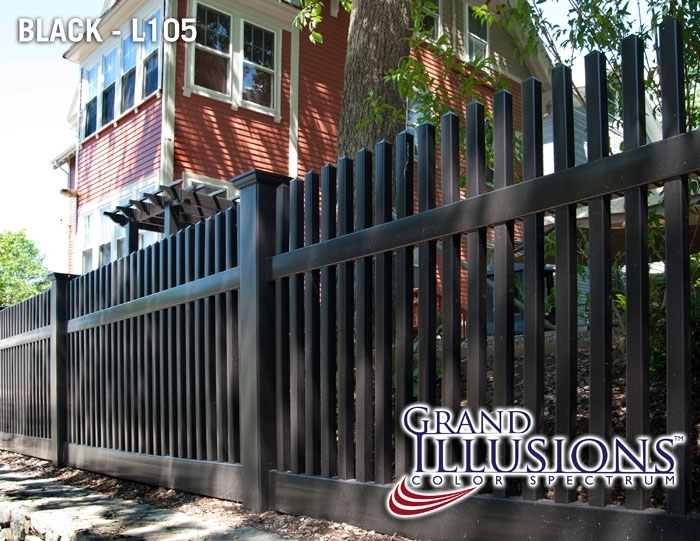 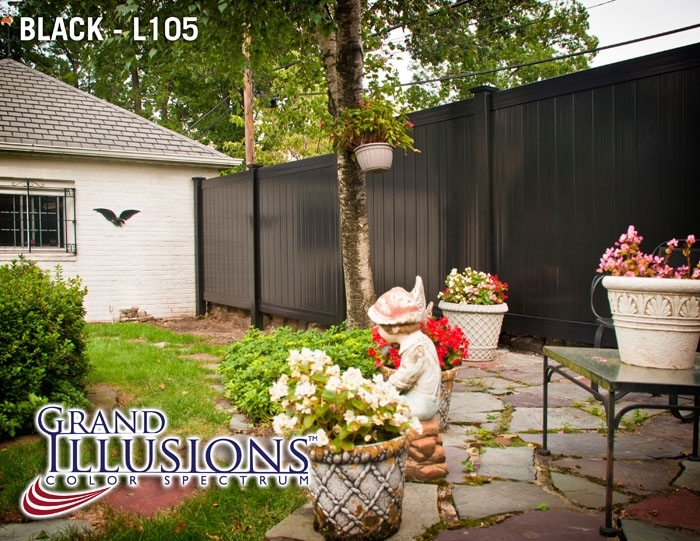 Grand Illusions Vinyl WoodBond represents the 5 PVC vinyl wood grain fence colors from Illusions Vinyl Fence. 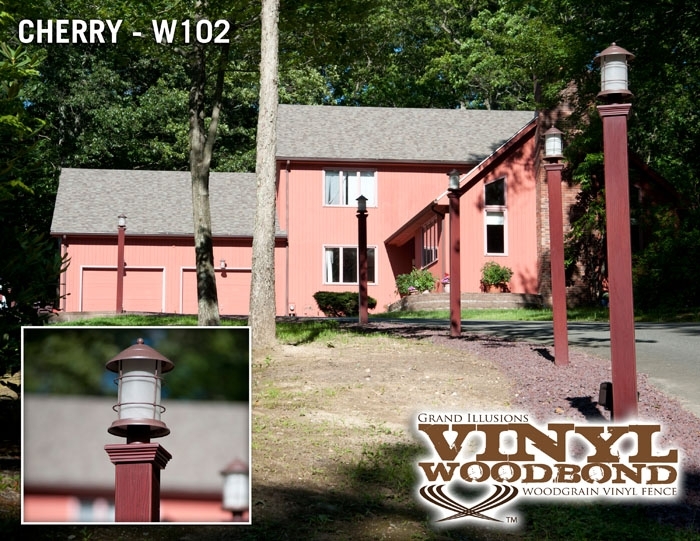 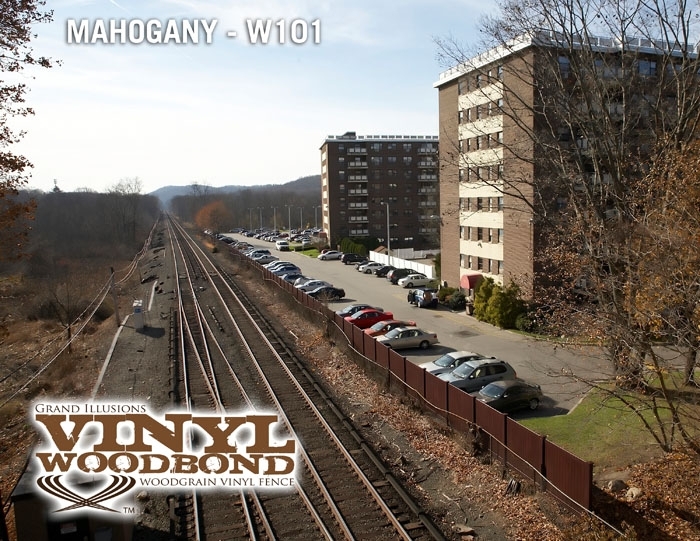 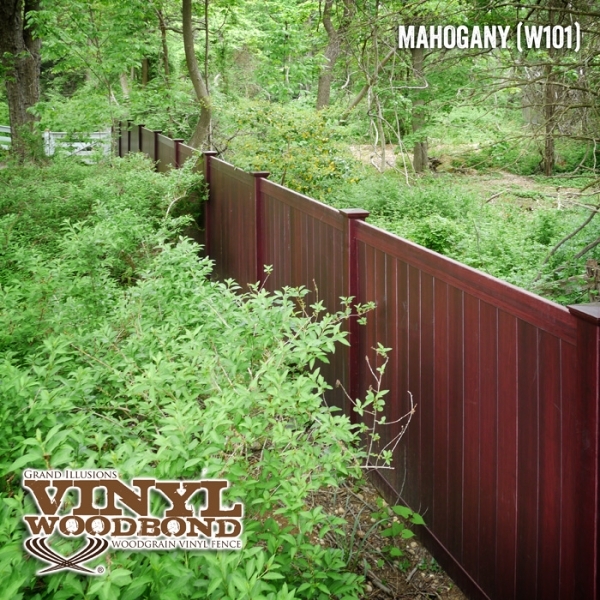 Mahogany (W101), Cherry (W102), Walnut (W103), Rosewood (W104), and Eastern White Cedar (W105). 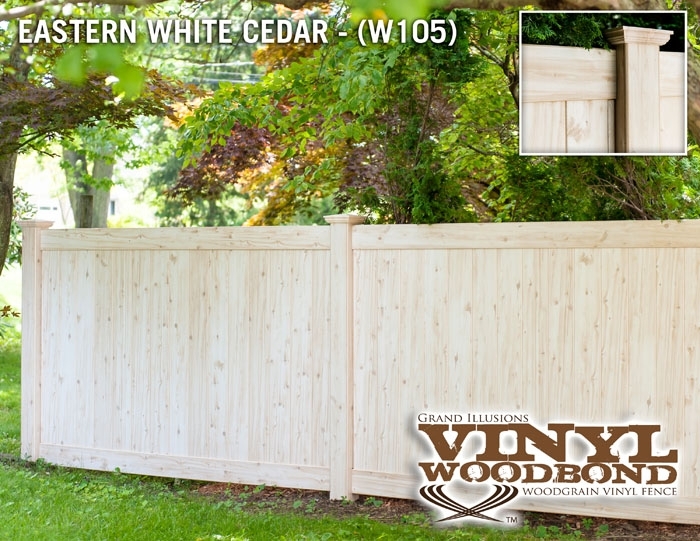 These PVC vinyl wood grains are so incredibly realistic that the Eastern White Cedar even has knots! 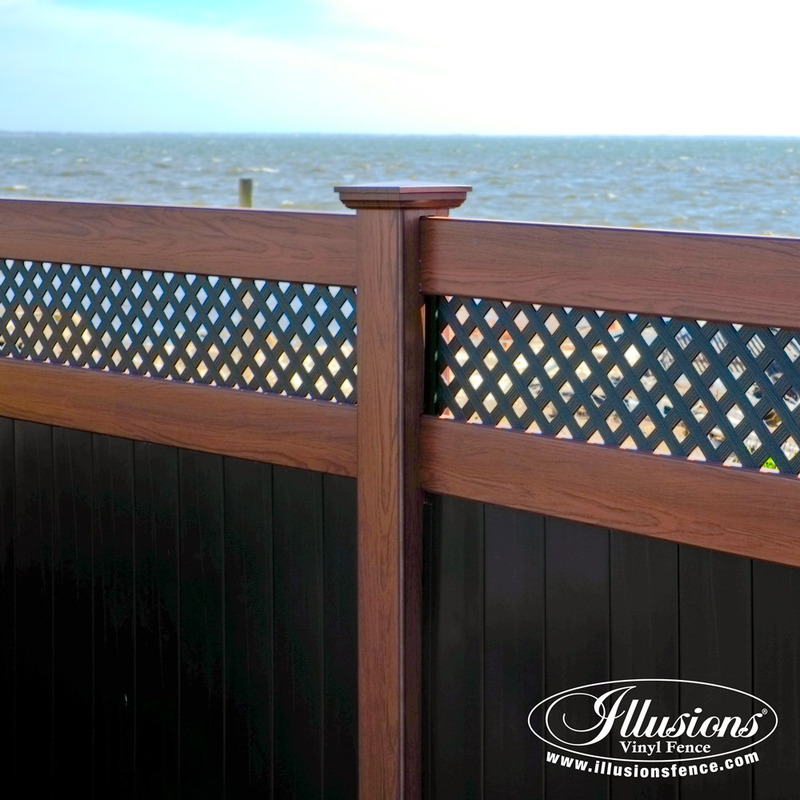 There is no more authentic looking PVC vinyl wood grain than Illusions. 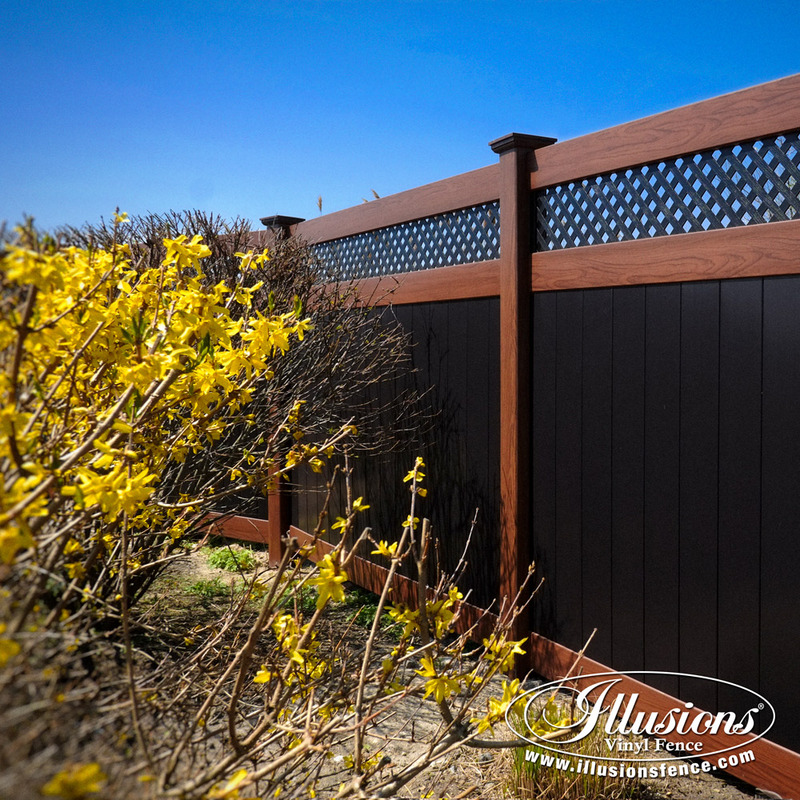 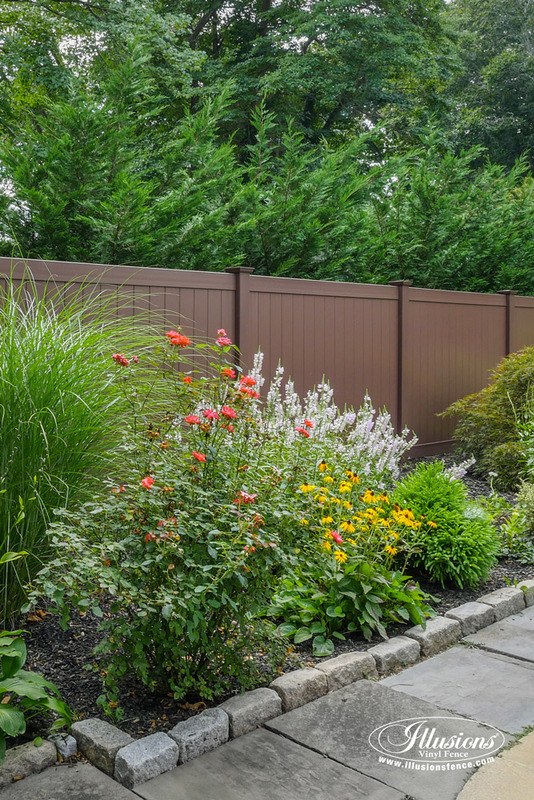 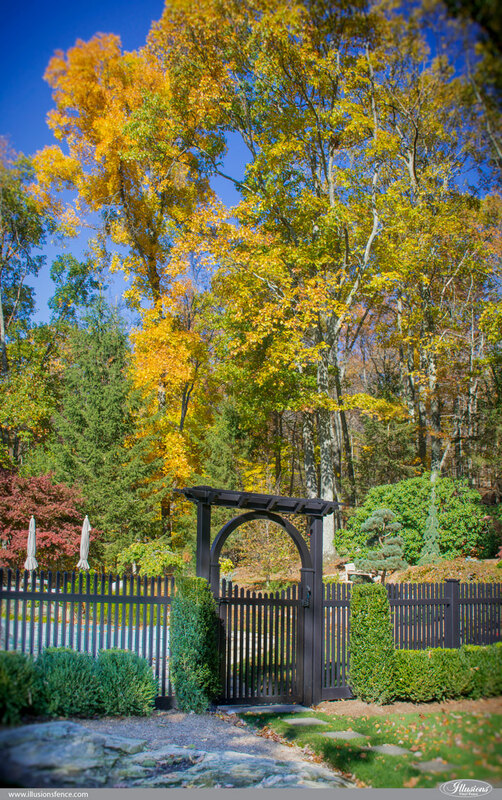 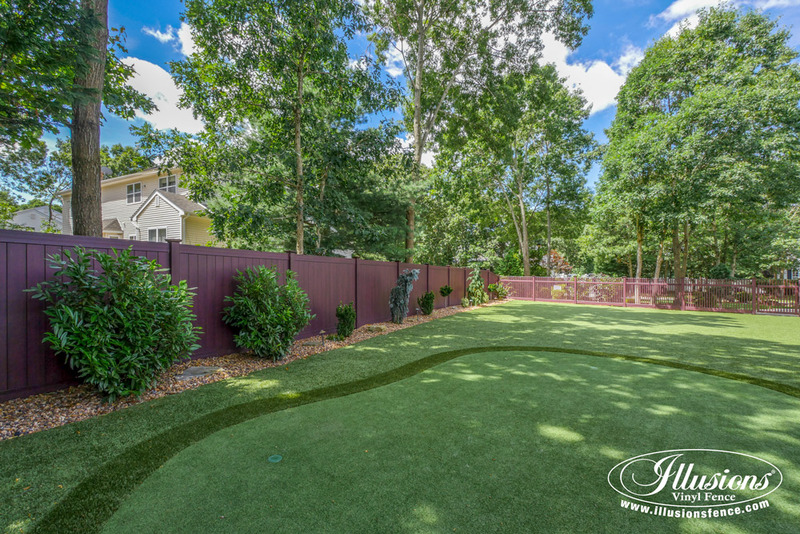 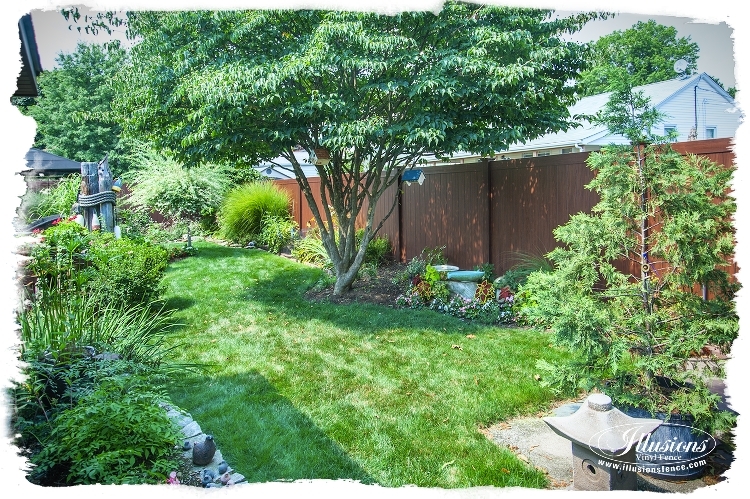 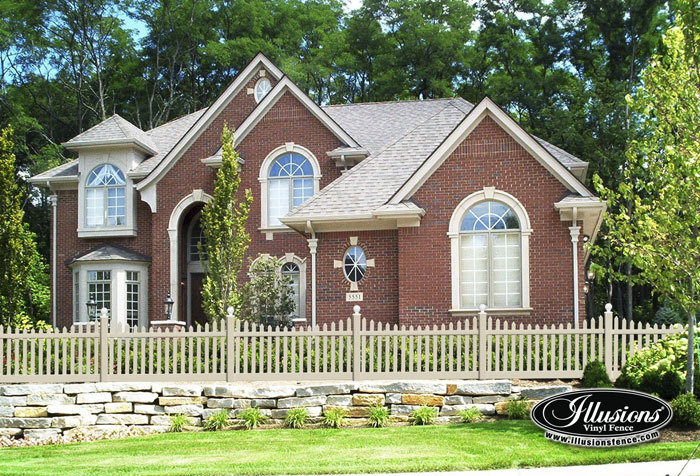 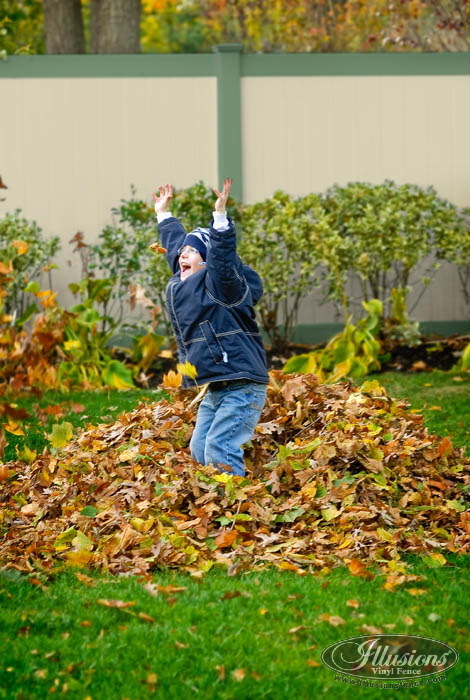 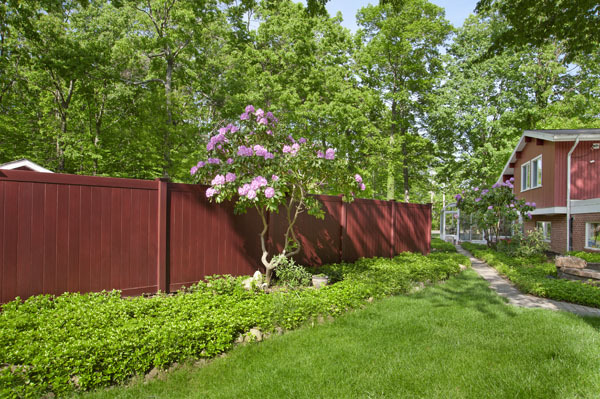 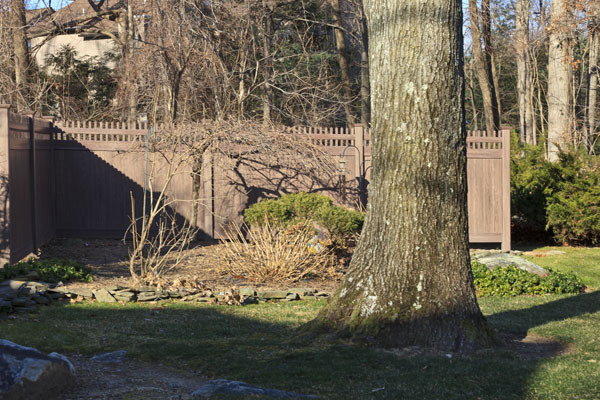 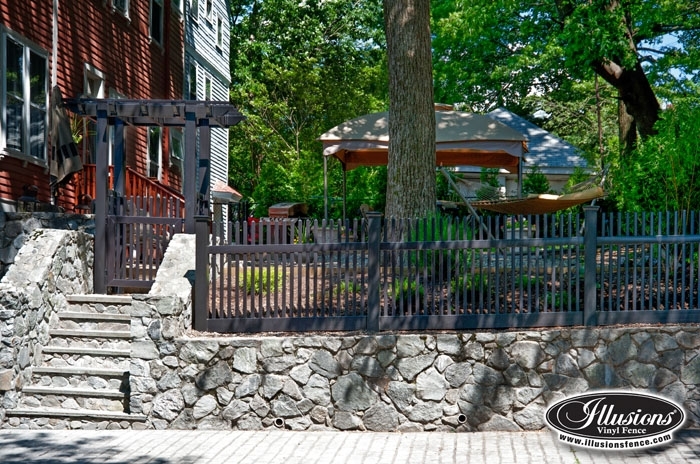 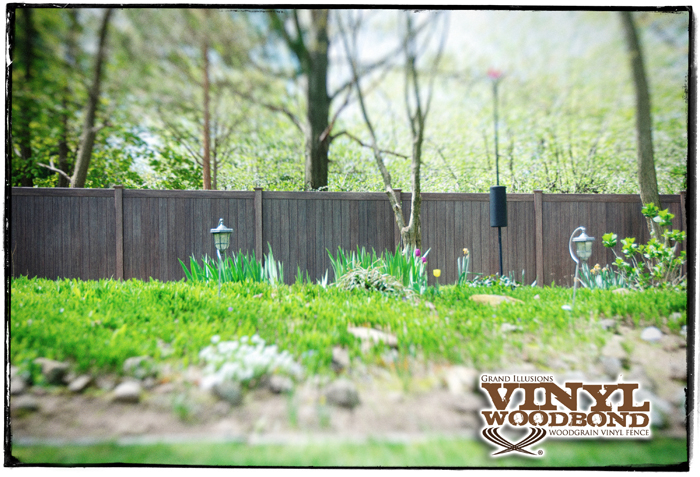 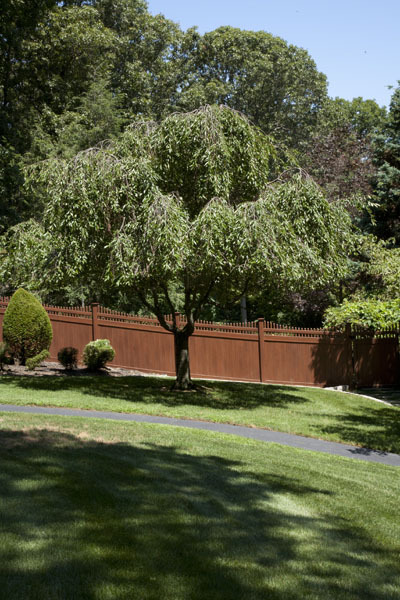 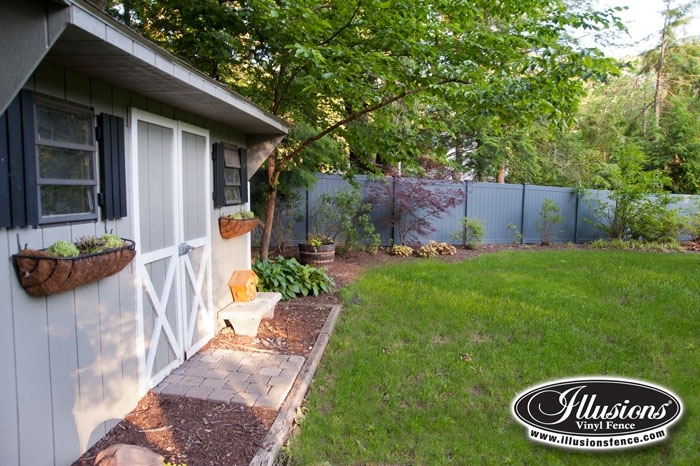 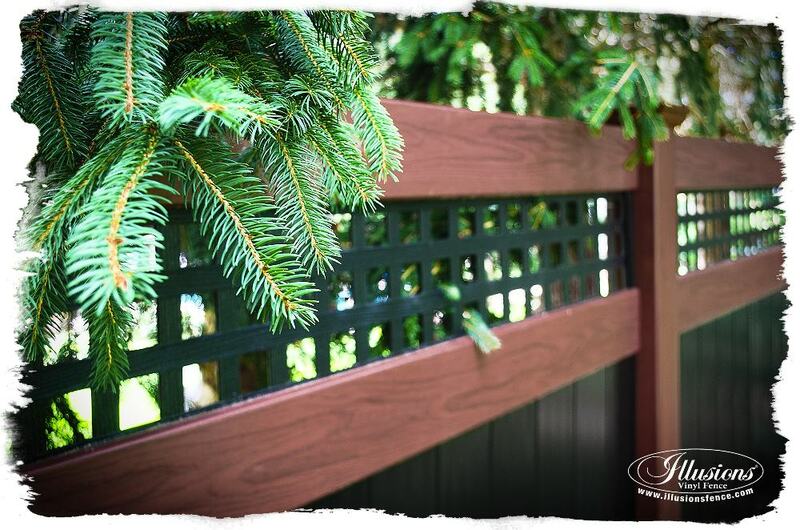 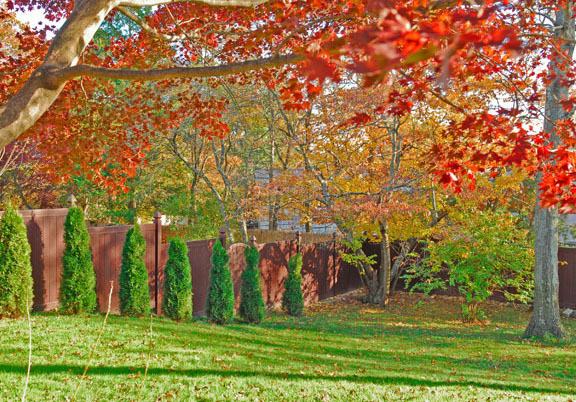 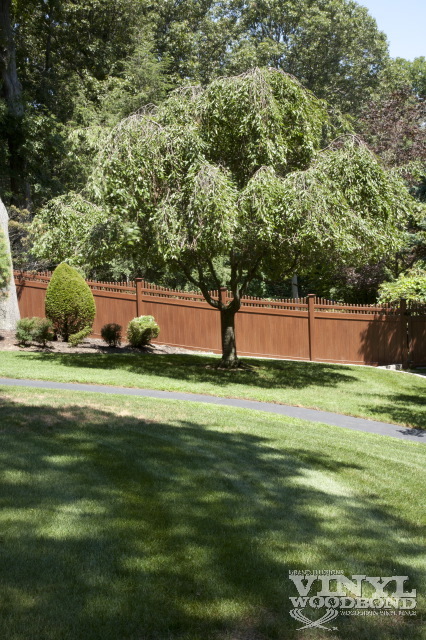 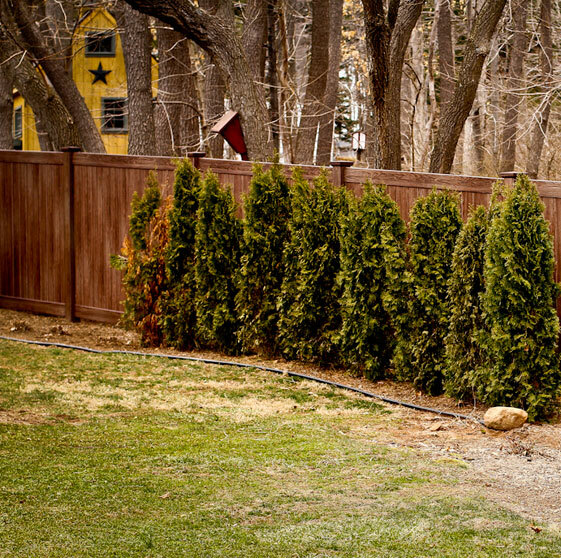 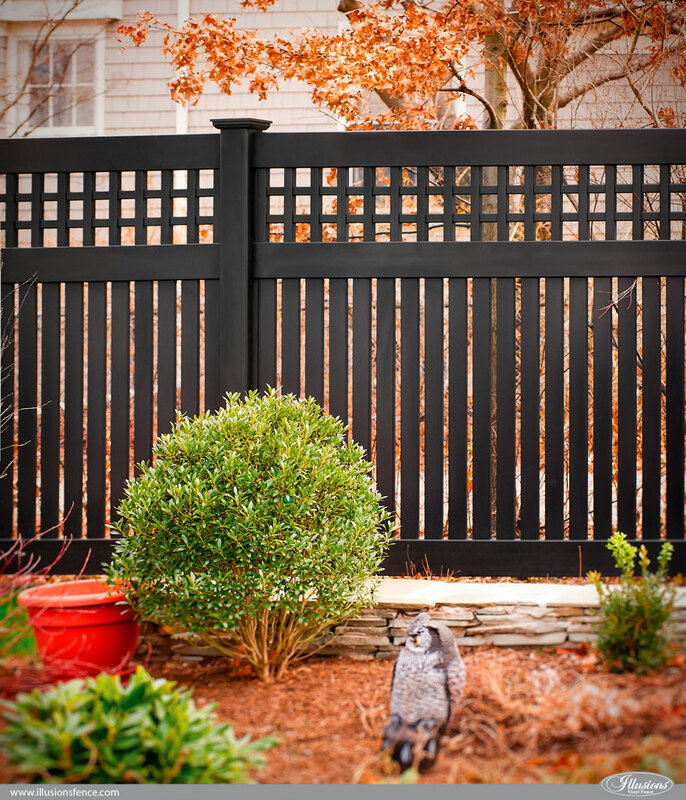 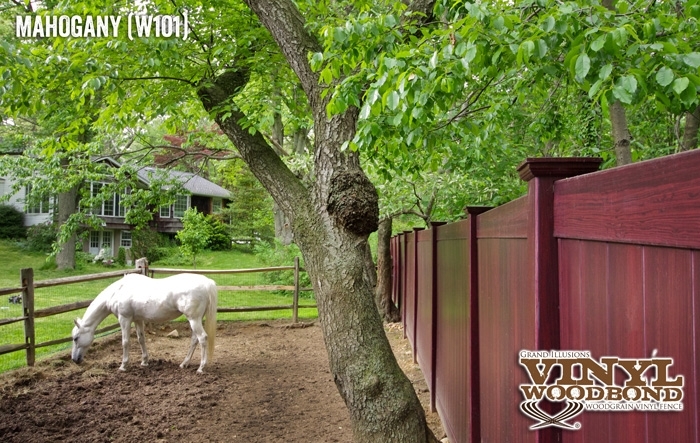 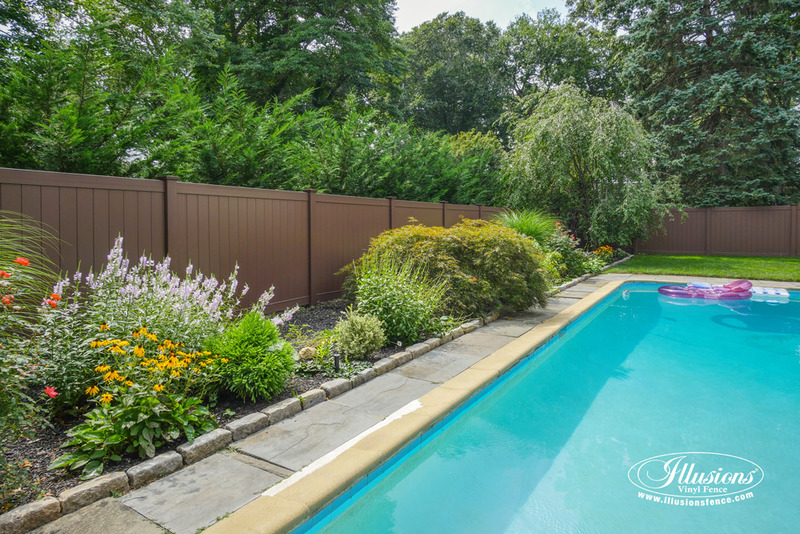 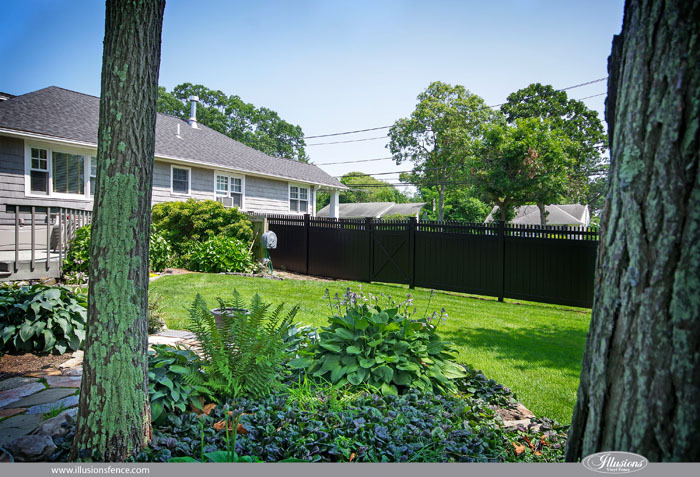 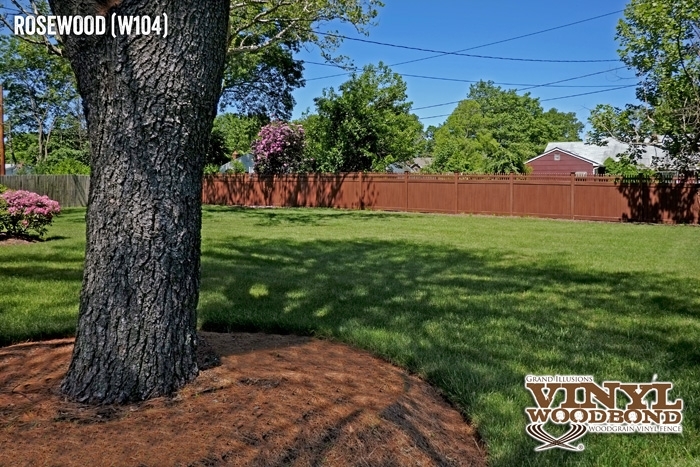 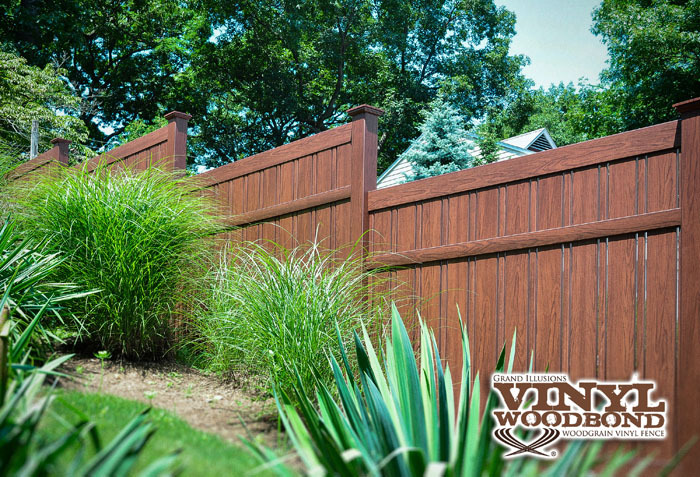 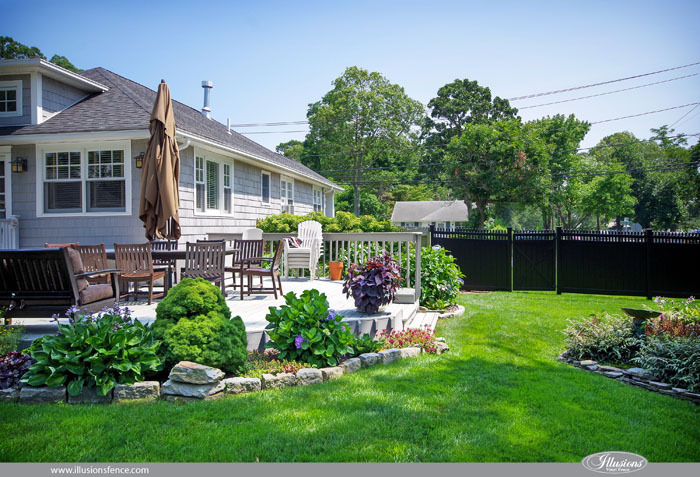 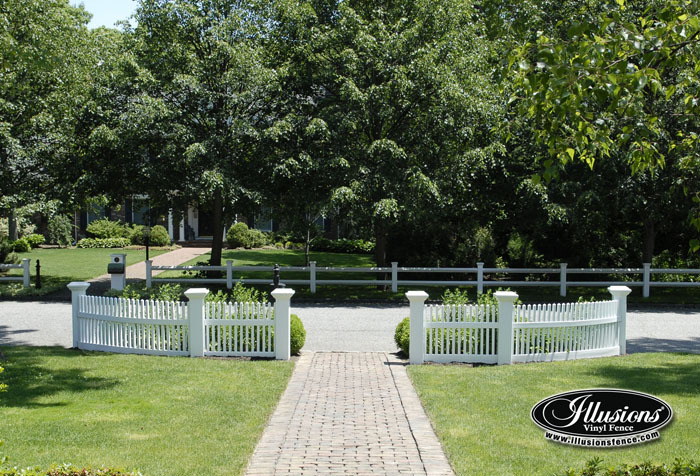 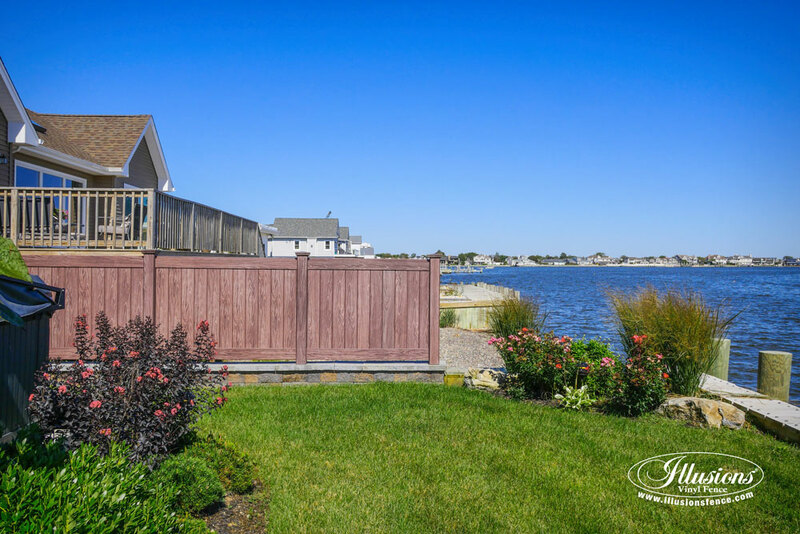 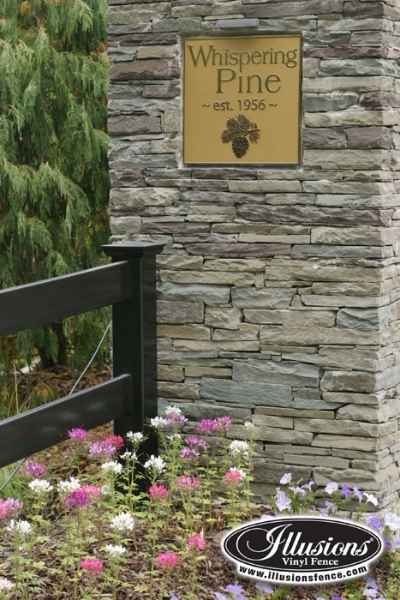 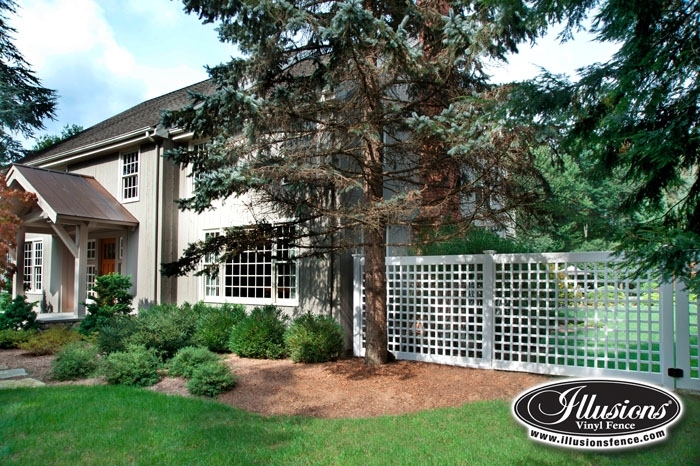 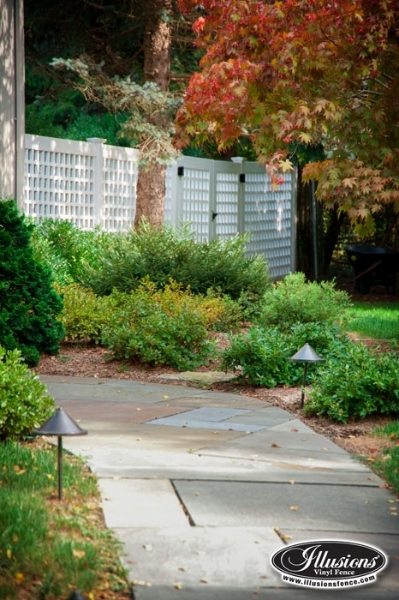 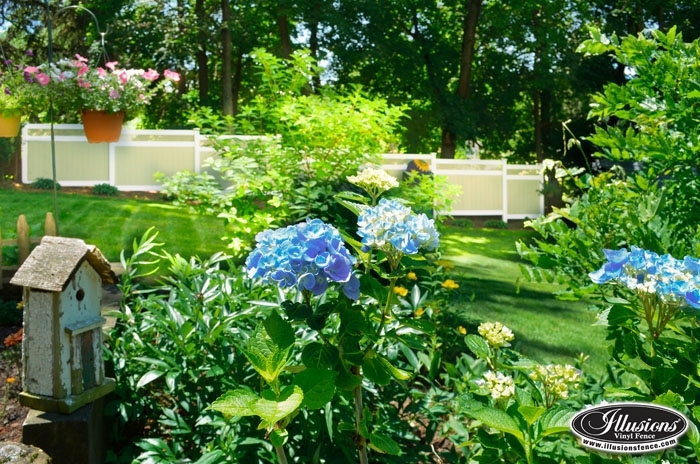 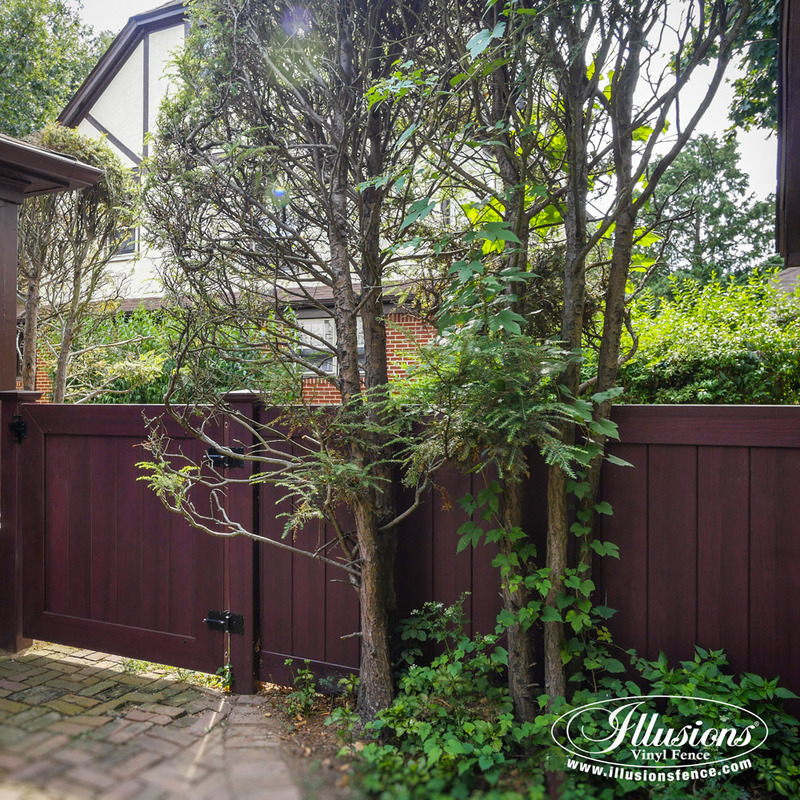 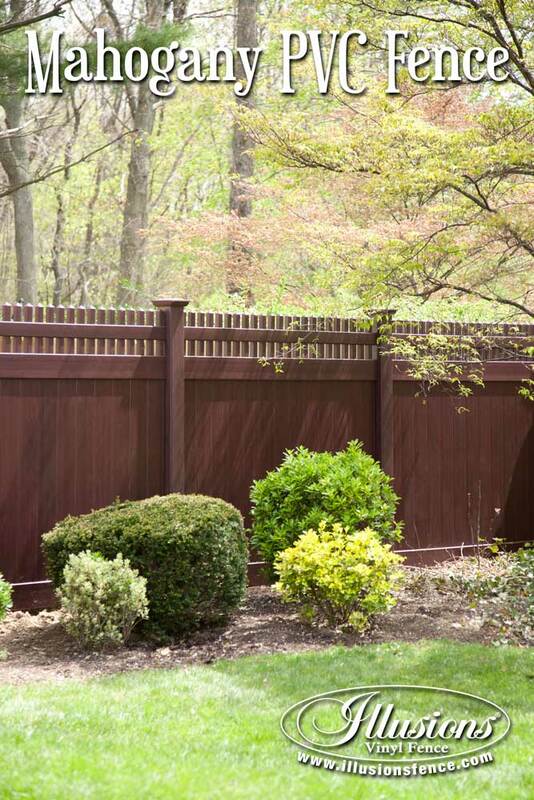 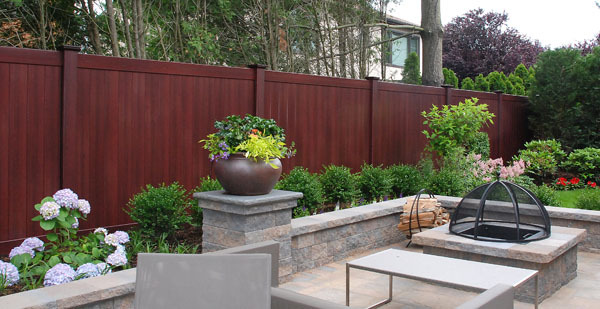 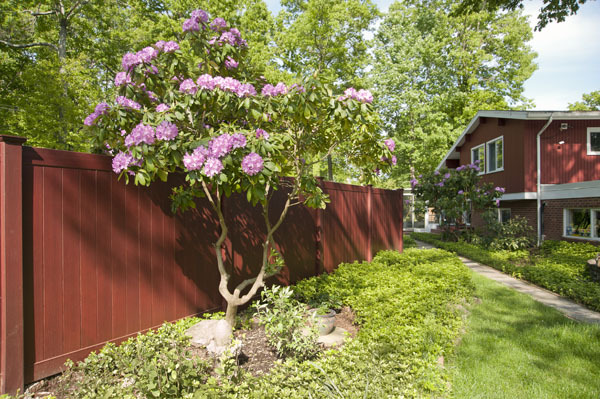 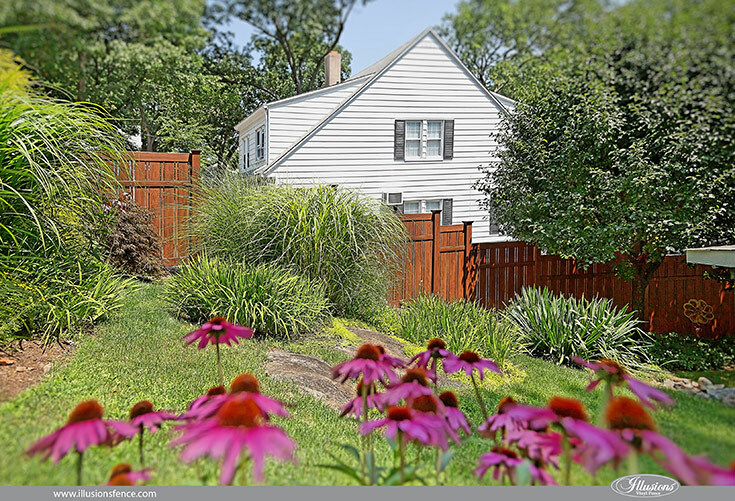 These are perfect year round fences that blend in with the background through all of the seasons. 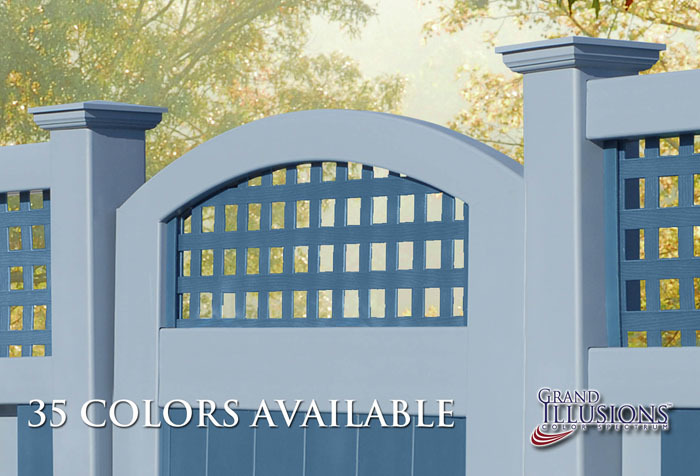 You can even Mix ‘n’ Match them with the Grand Illusions Color Spectrum. 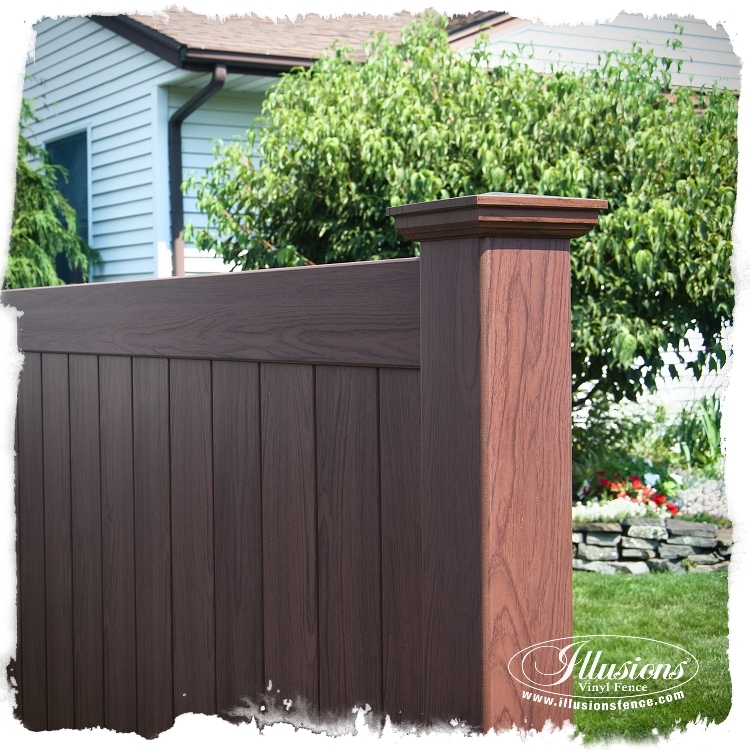 This makes for some incredible looking fences! 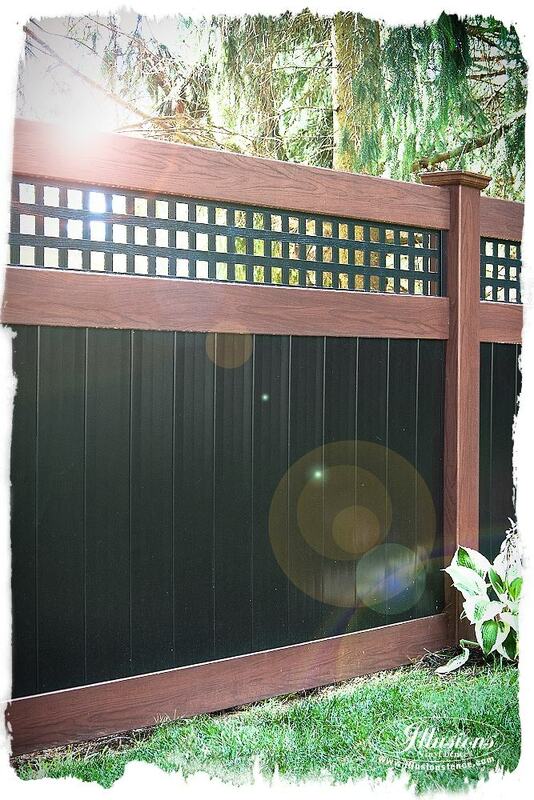 Check out some of the Black and Rosewood images below to see what we’re talking about. 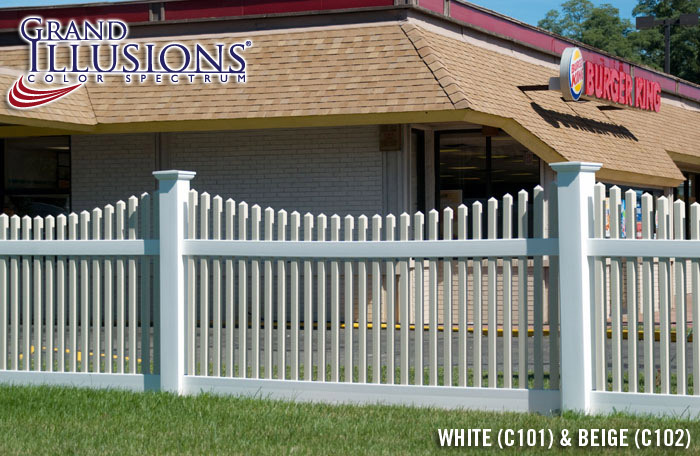 Illusions Vinyl Fence perfect for commercial applications too. 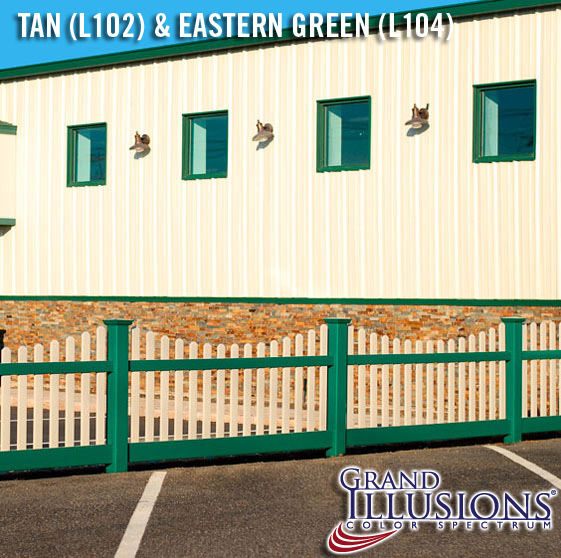 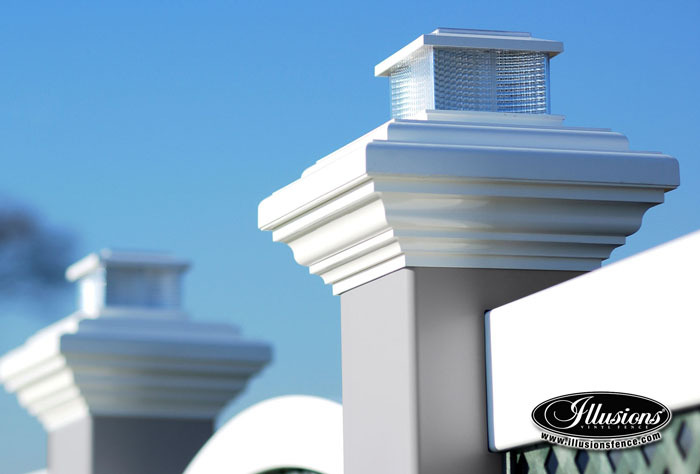 Between all of the amazing color choices that can be matched to a commercial property, it’s a perfect choice for many commercial and industrial locations. 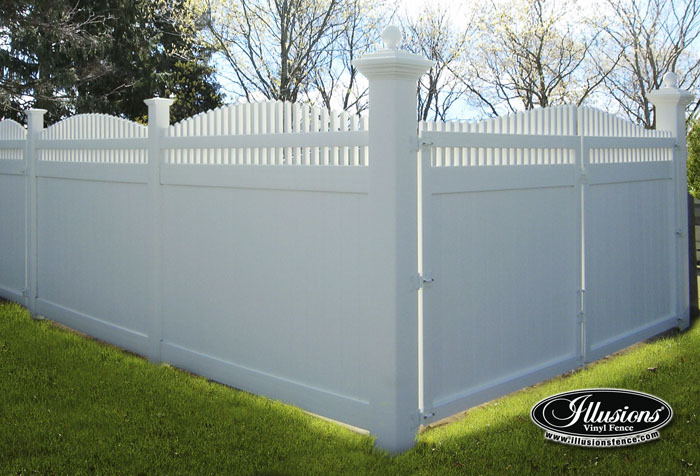 YES WE HAVE GOOD OLD FASHIONED WHITE VINYL FENCE! 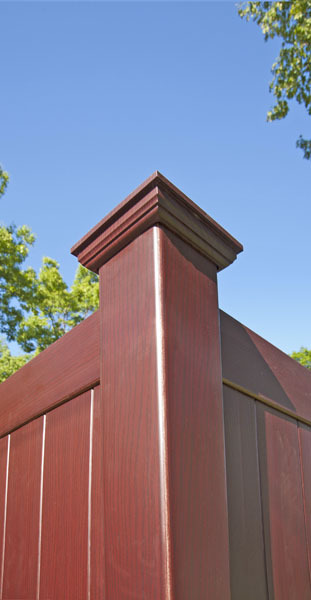 Just because we have all of these fun colors and wood grains doesn’t mean we’ve forgotten where we came from. 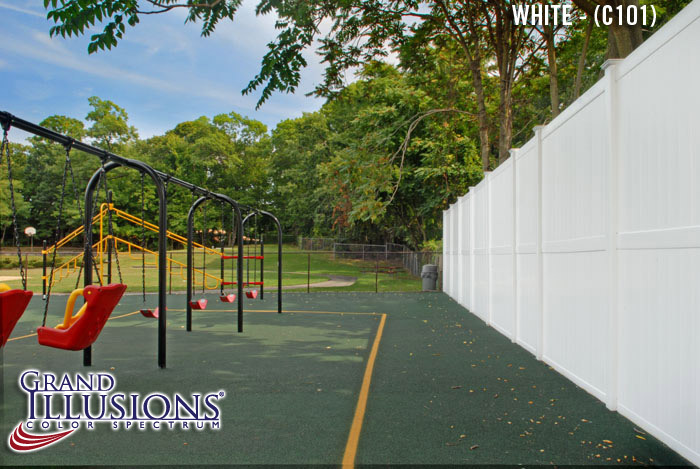 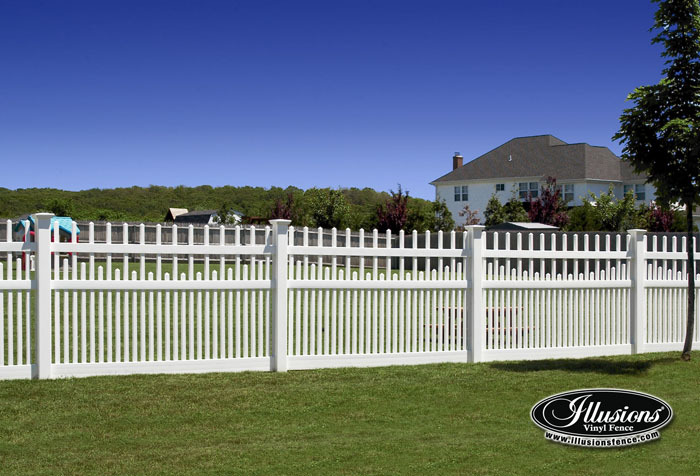 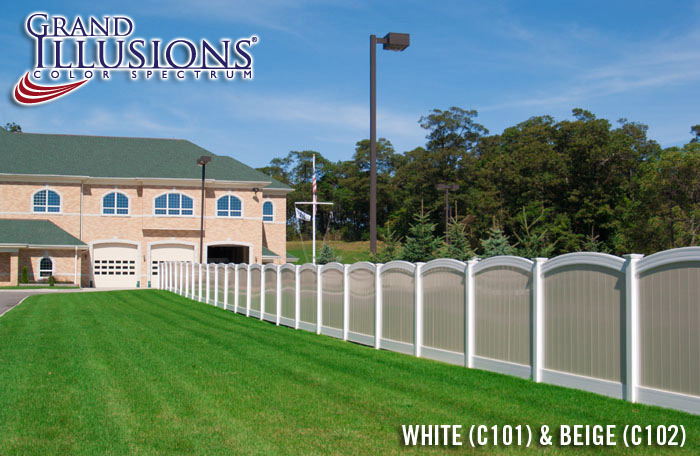 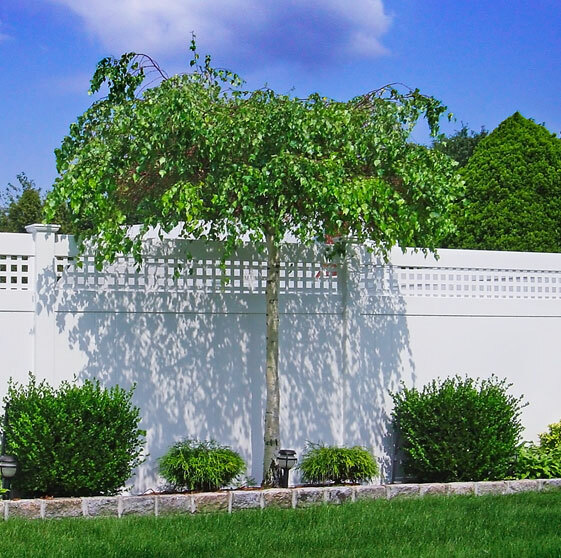 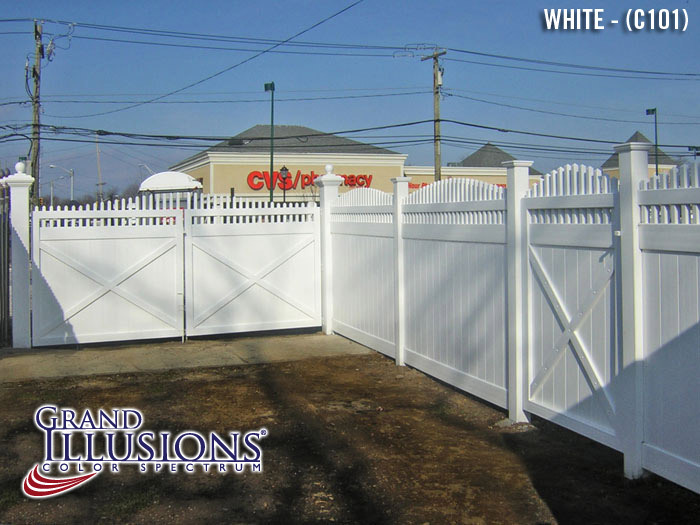 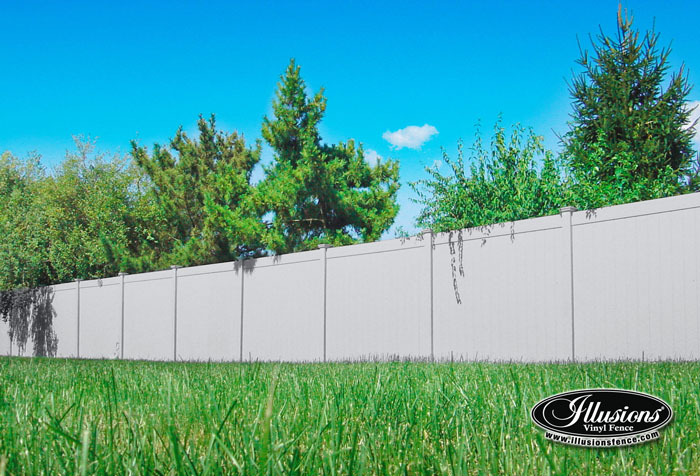 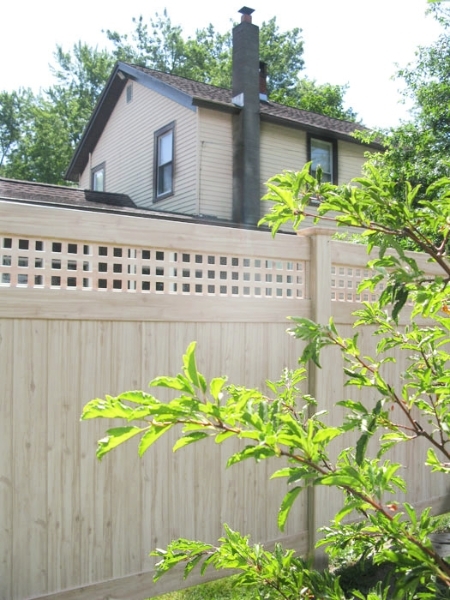 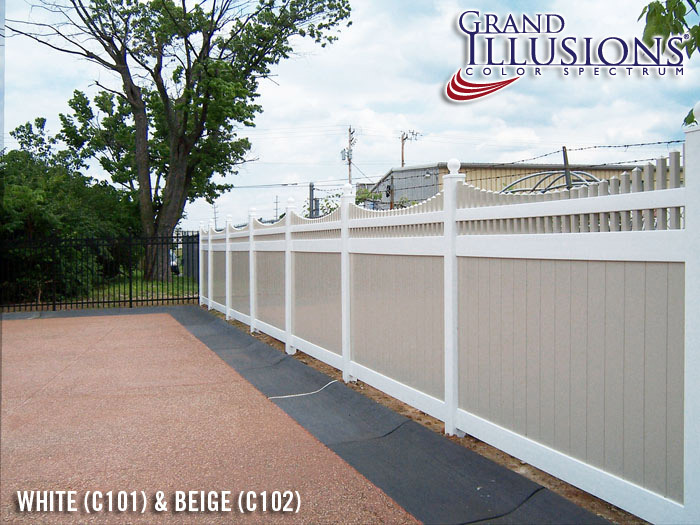 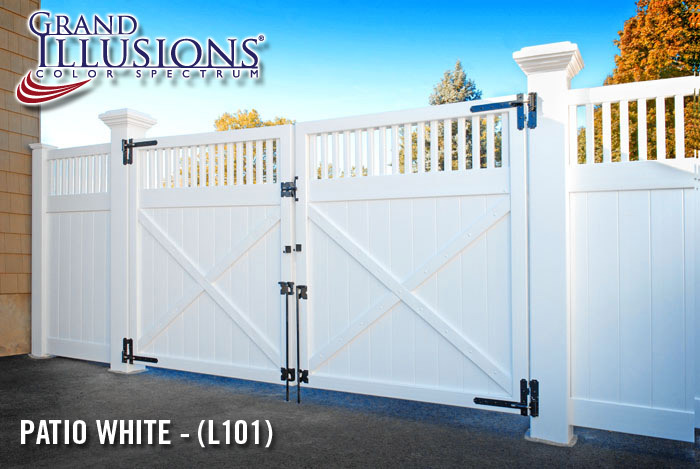 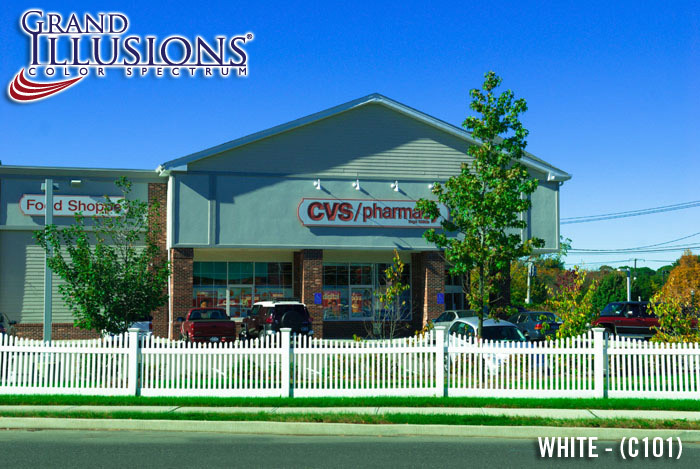 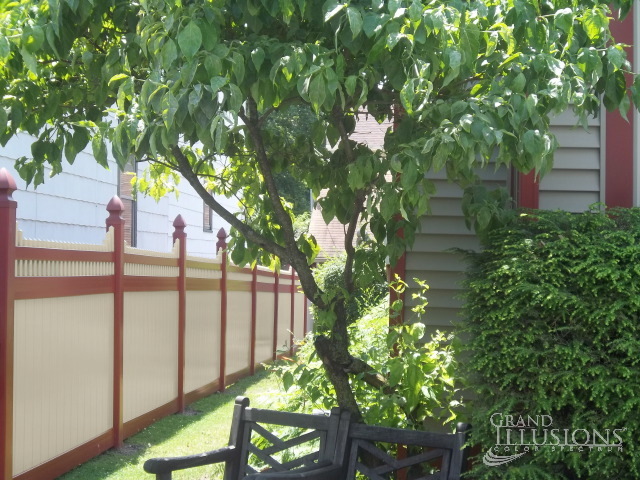 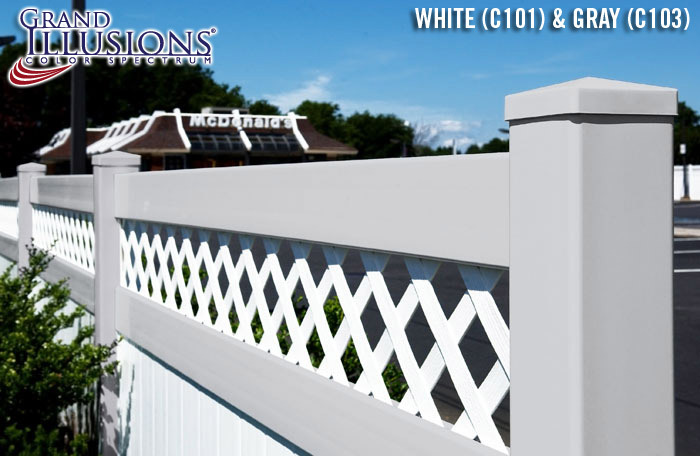 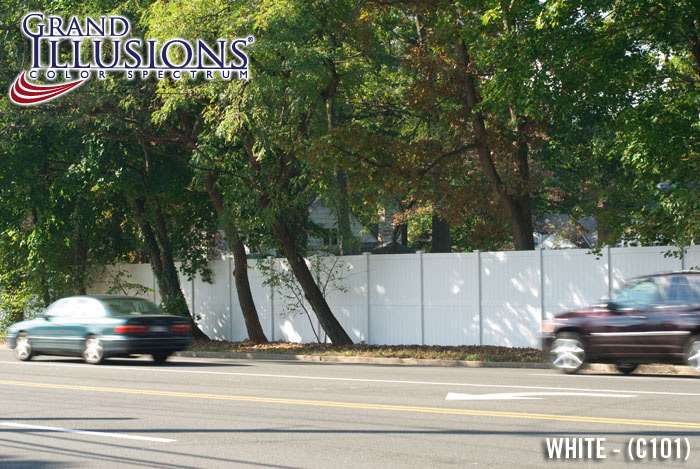 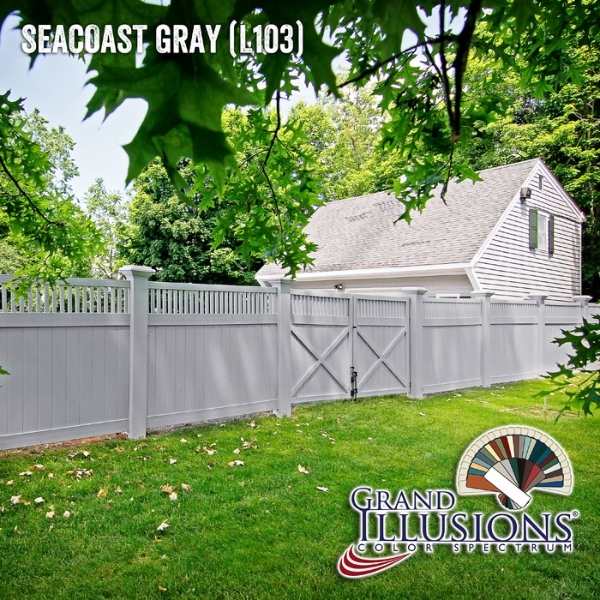 Illusions Vinyl Fence is one of the largest producers of white vinyl fence in the country. 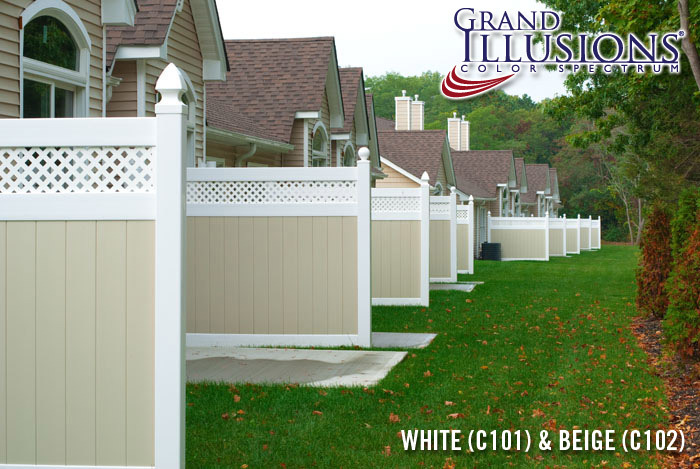 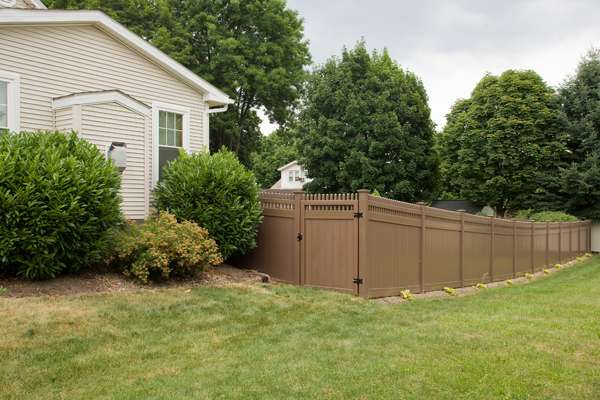 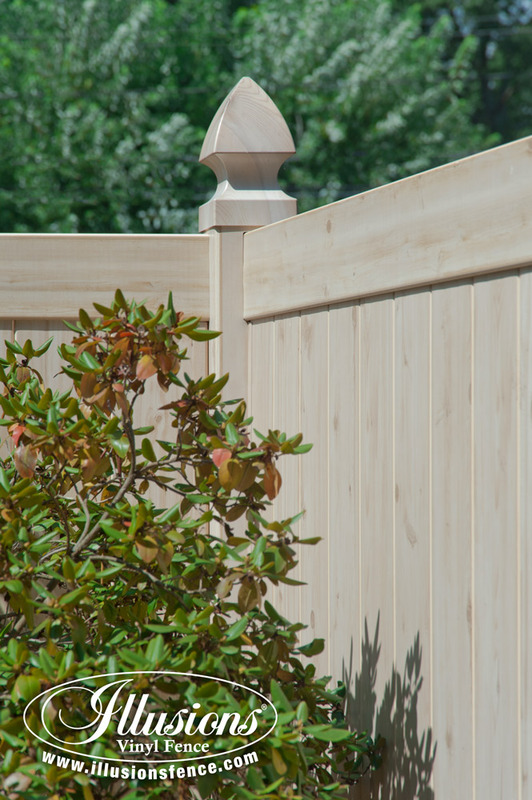 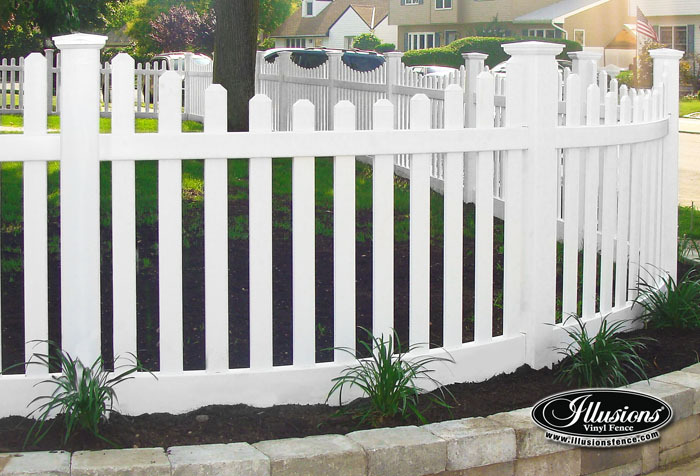 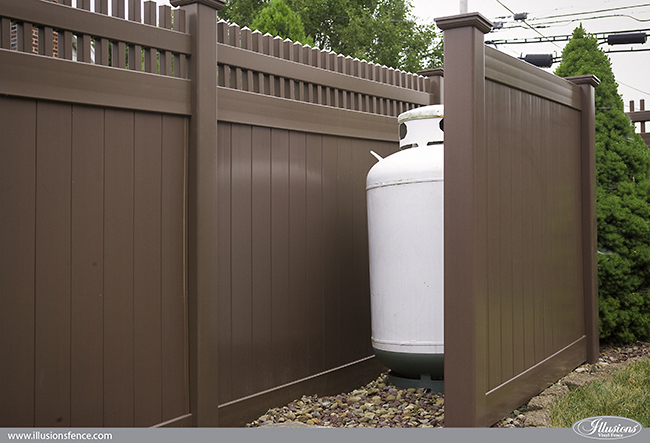 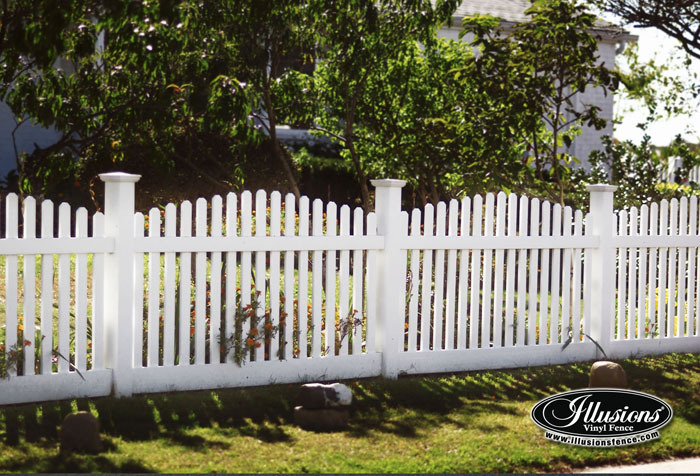 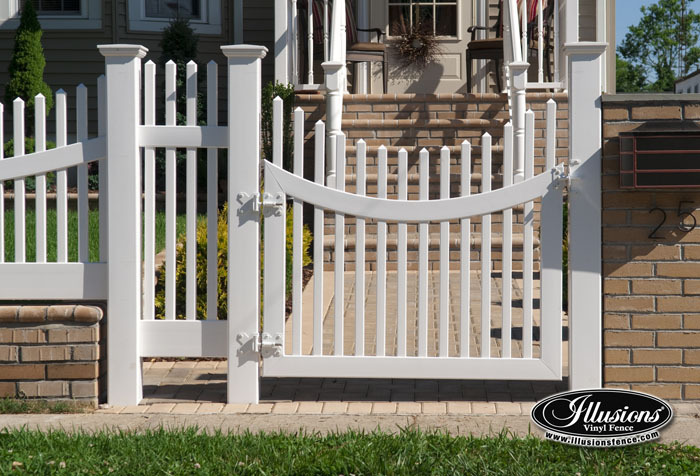 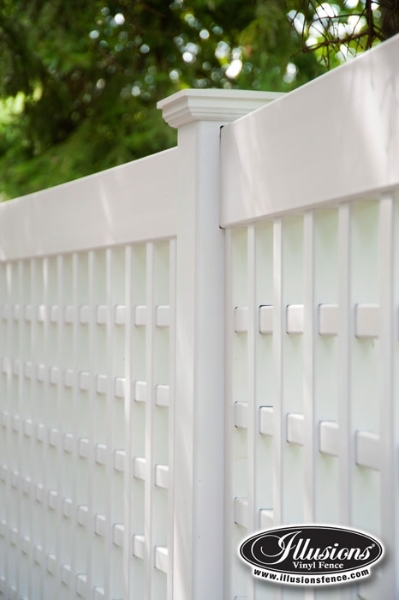 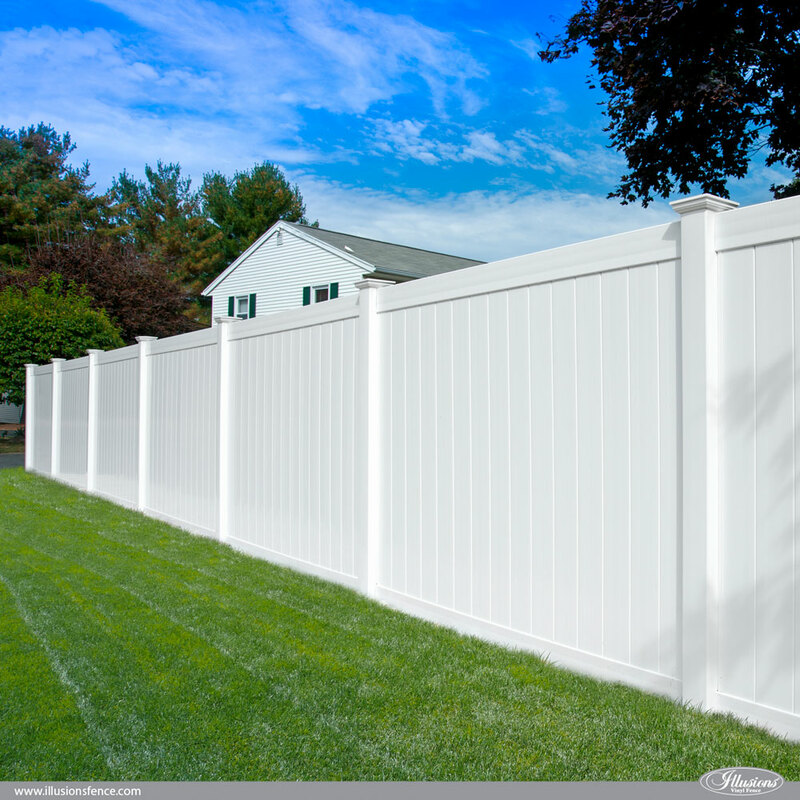 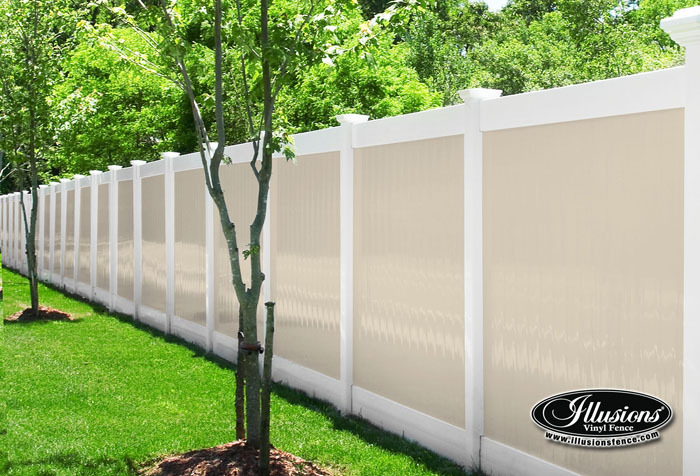 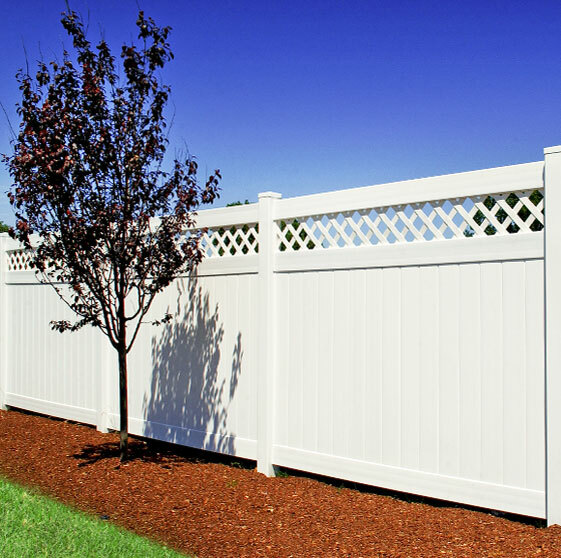 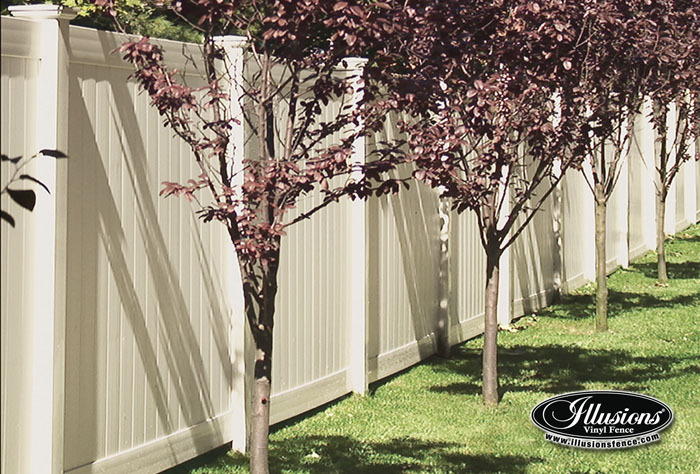 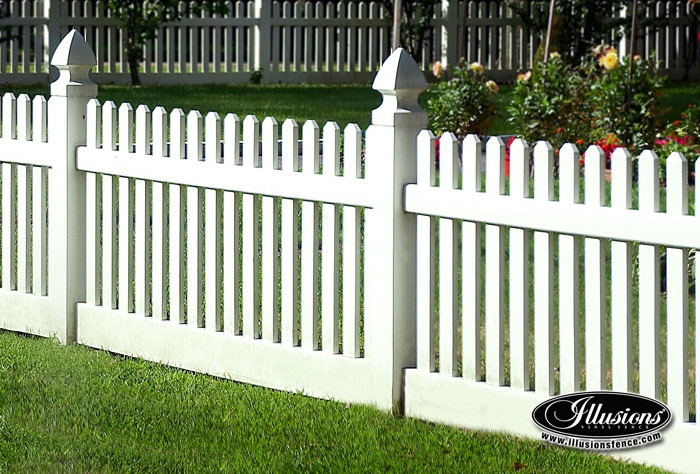 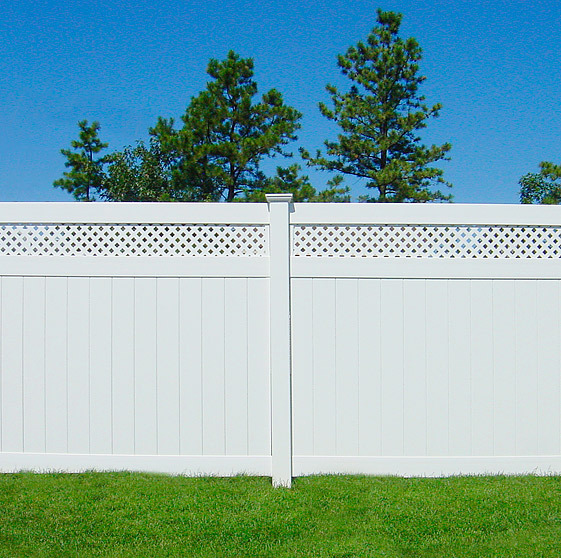 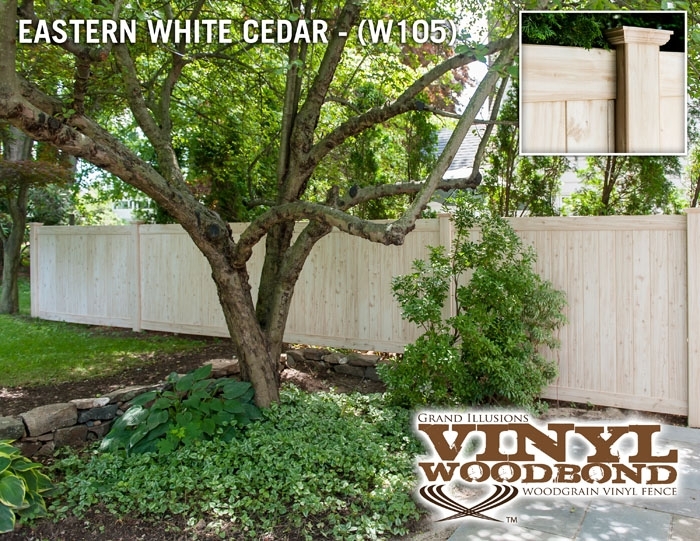 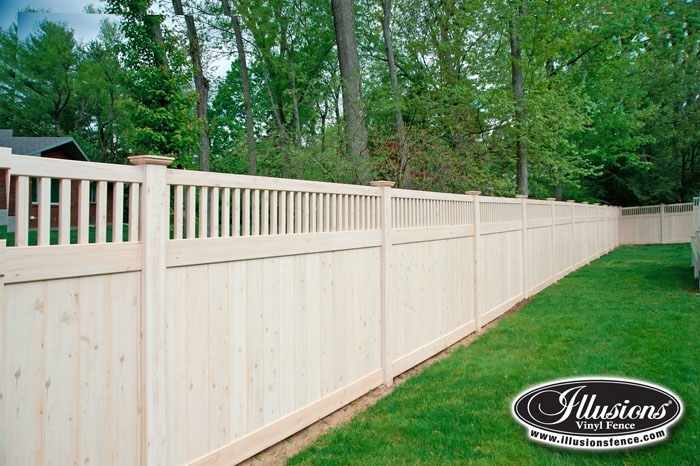 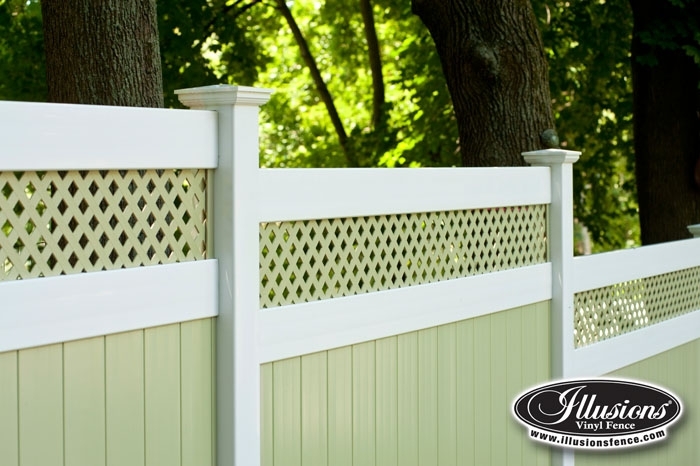 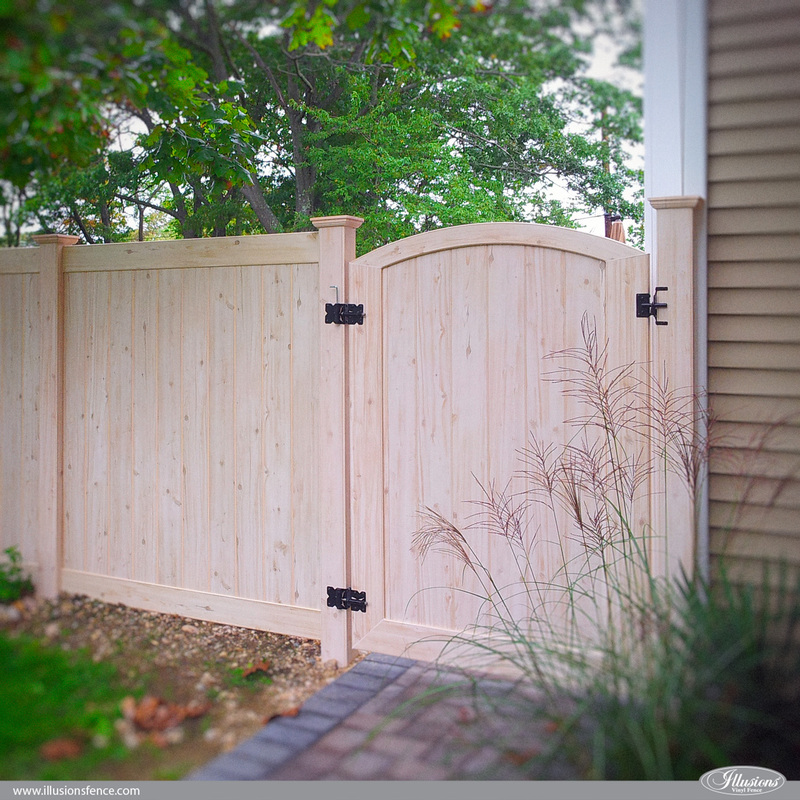 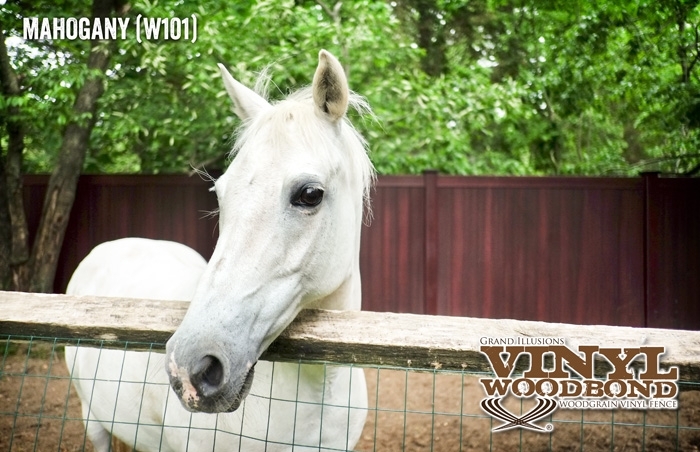 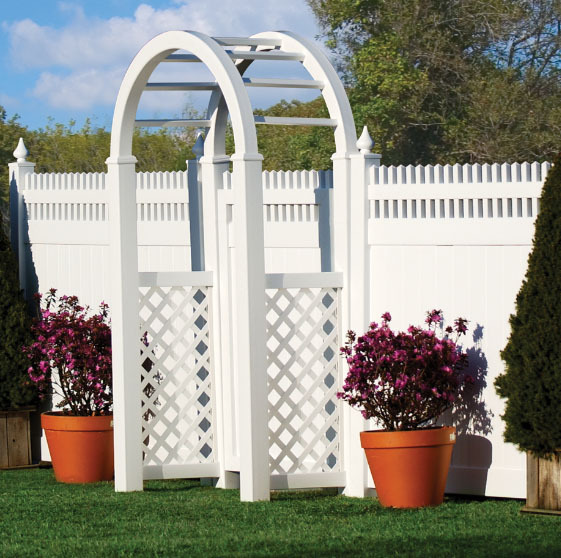 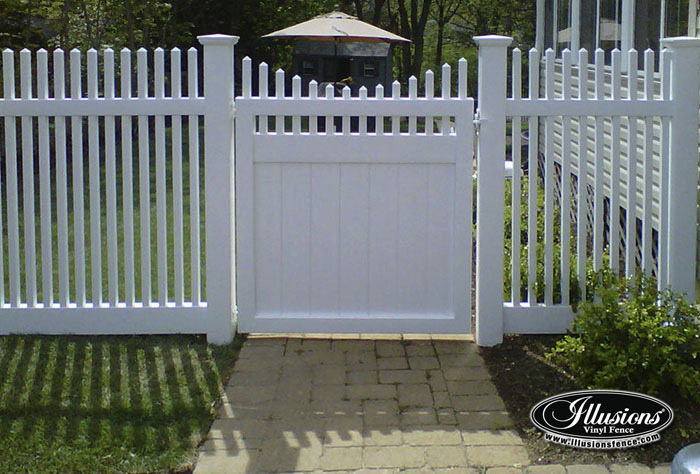 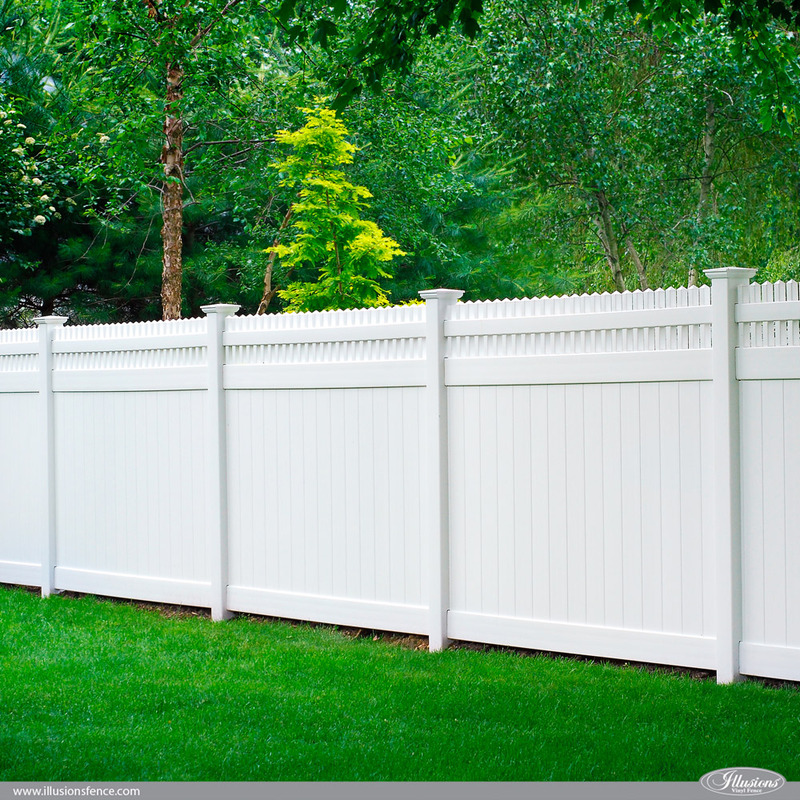 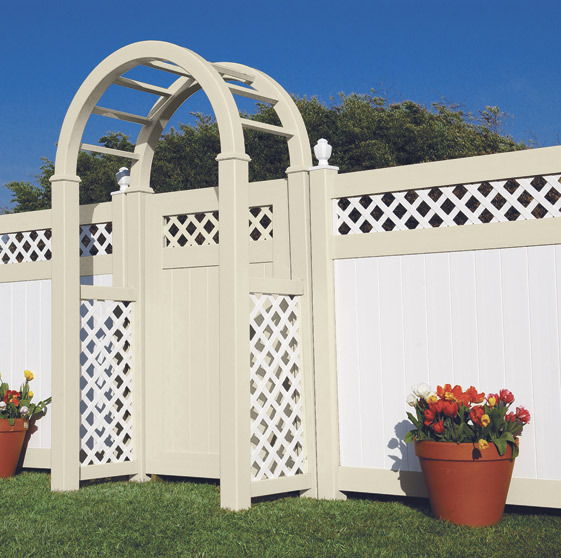 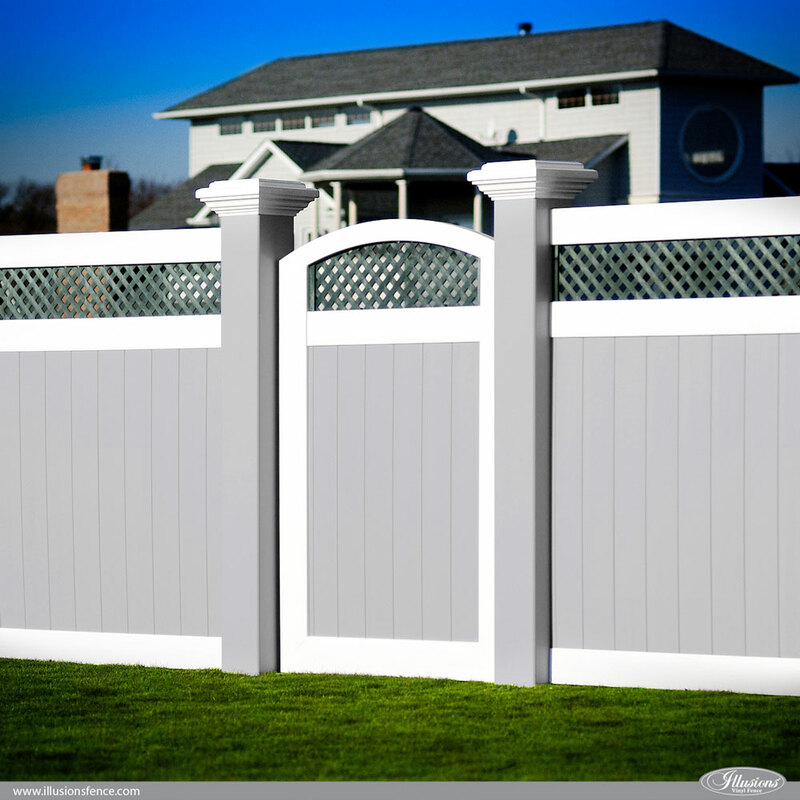 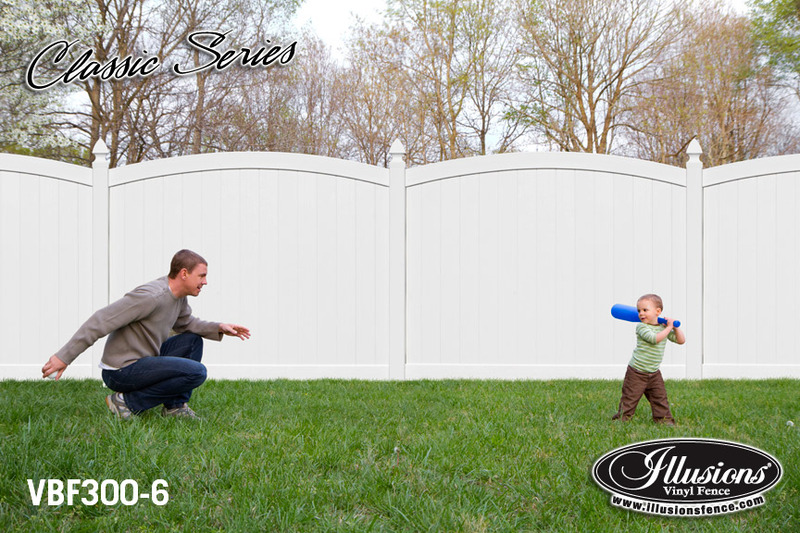 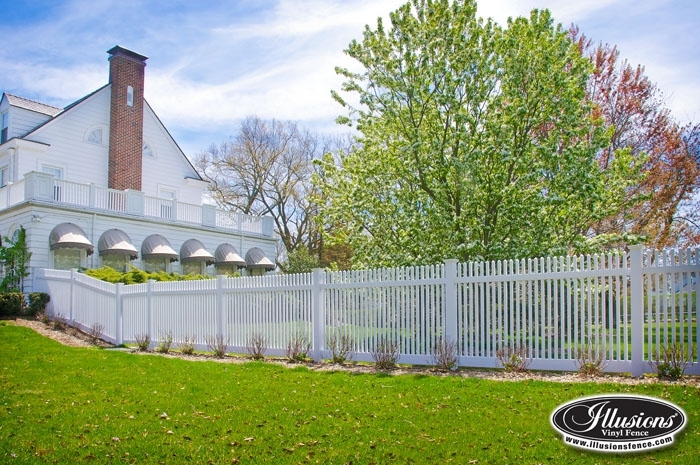 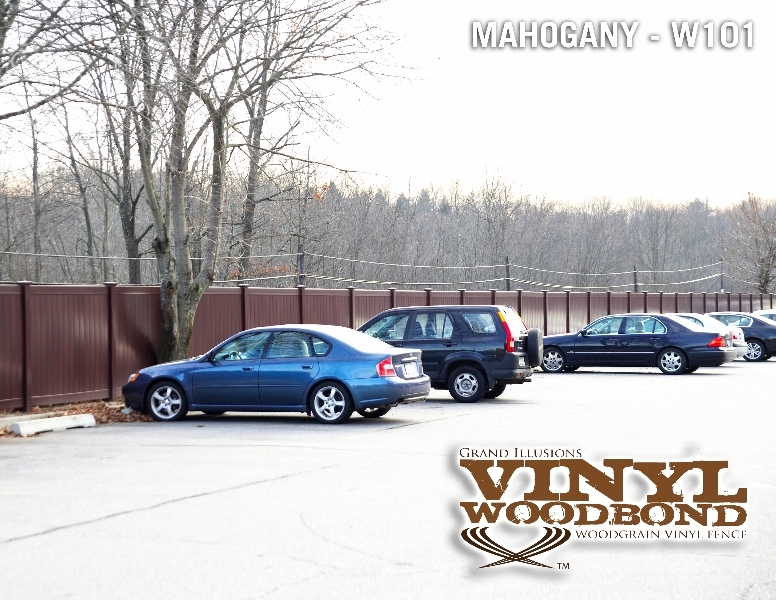 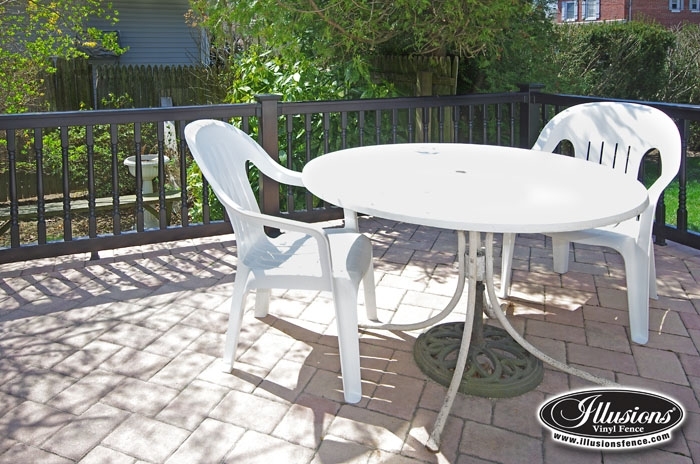 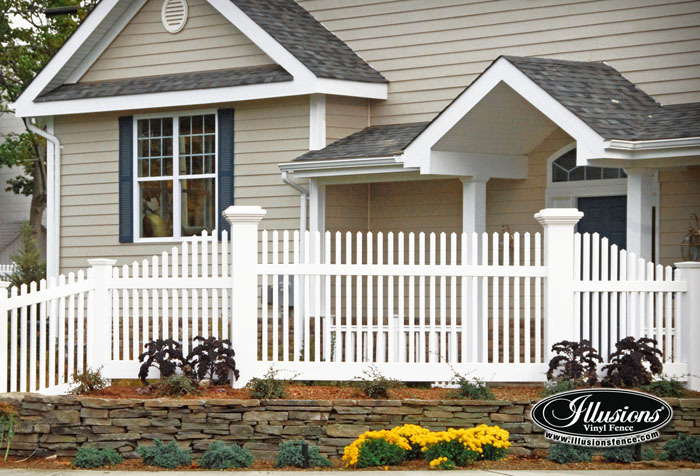 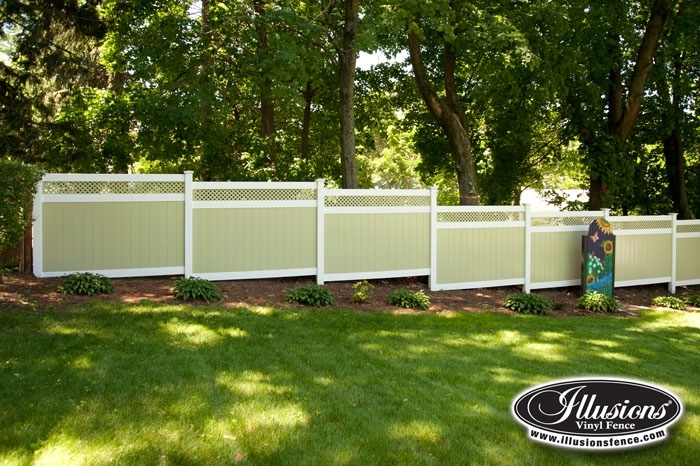 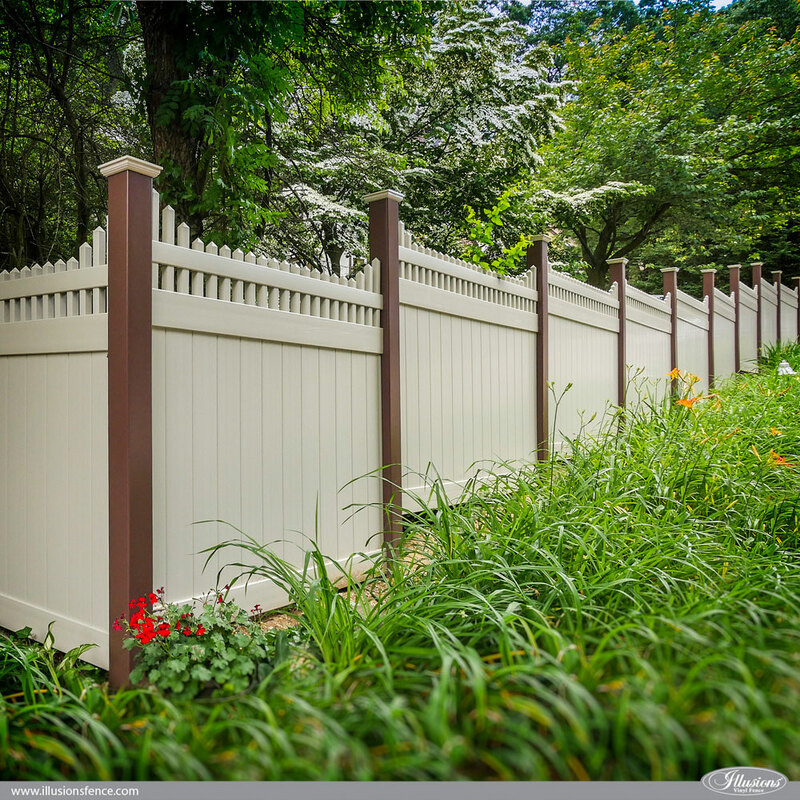 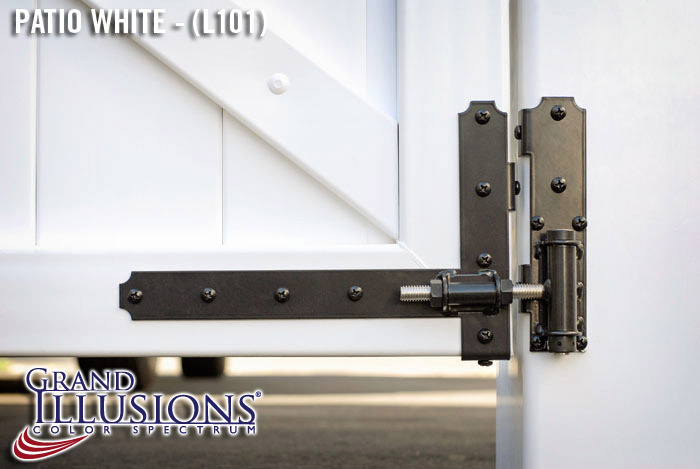 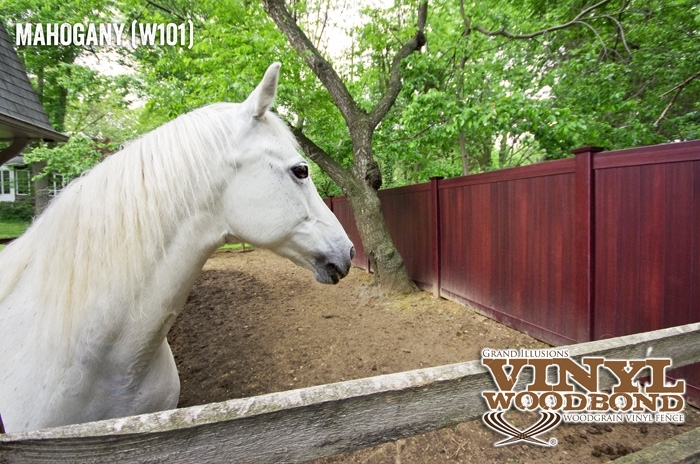 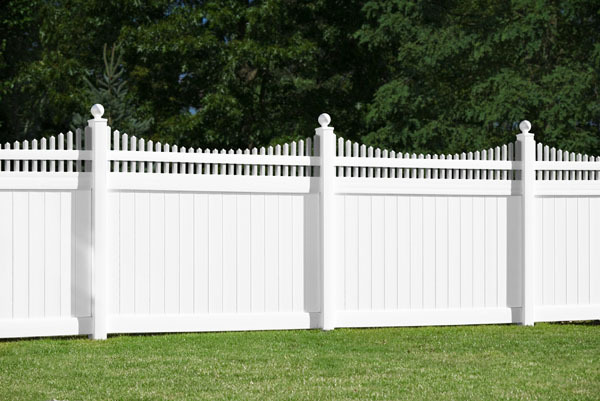 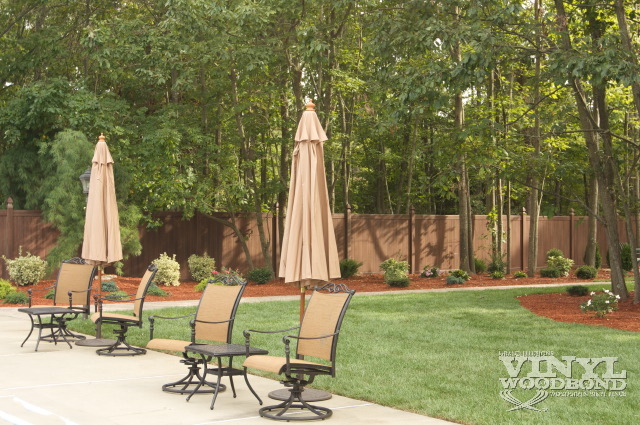 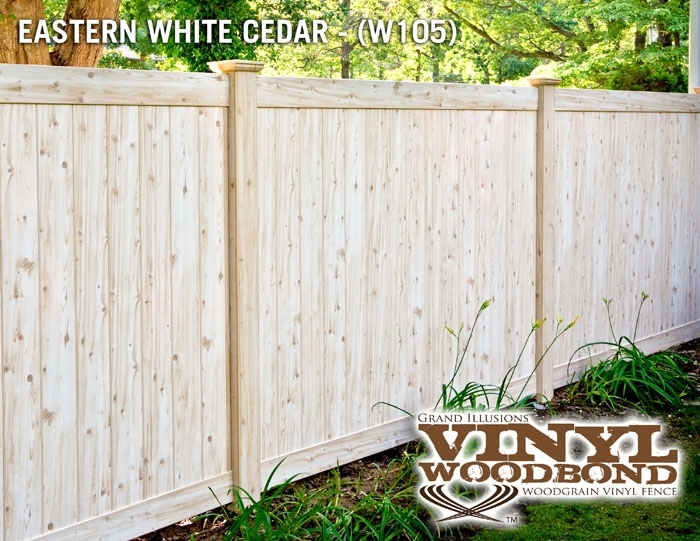 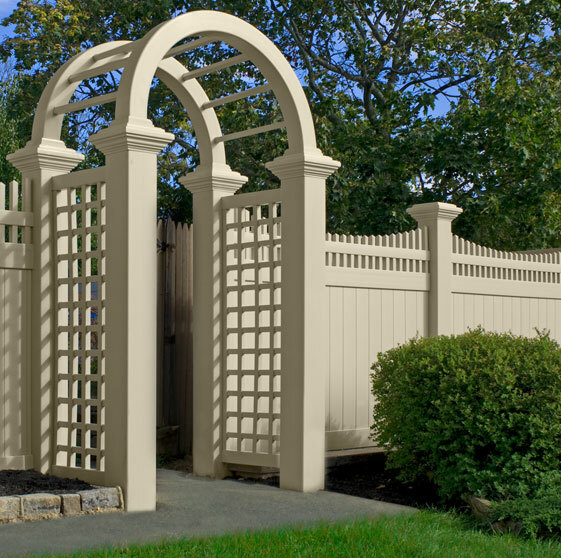 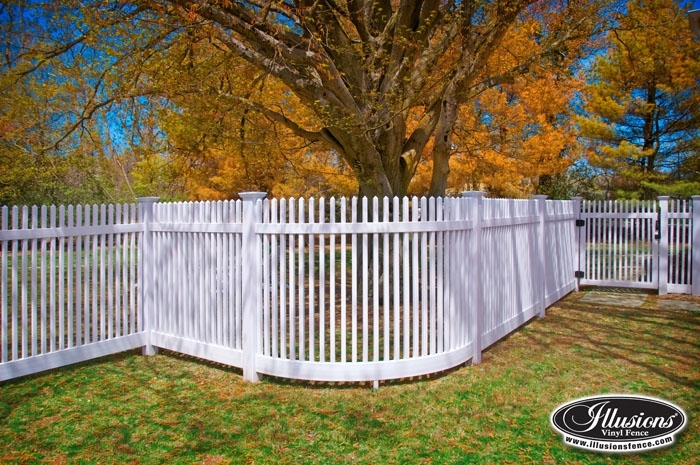 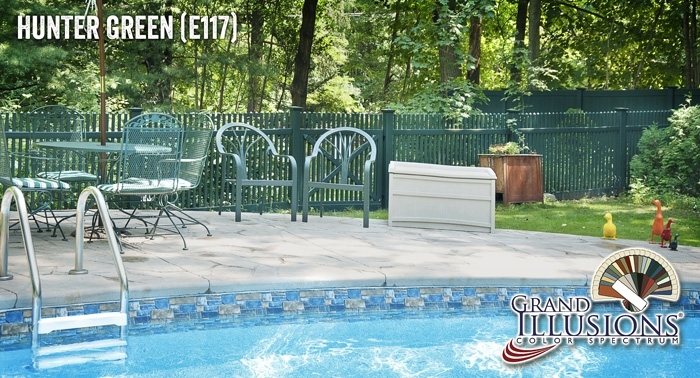 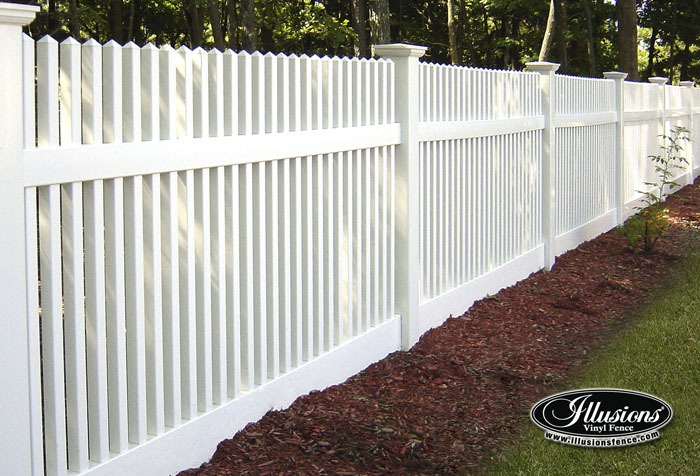 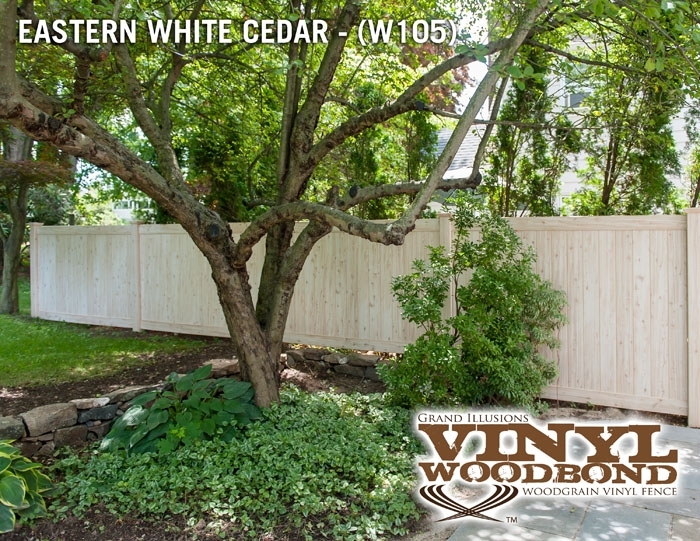 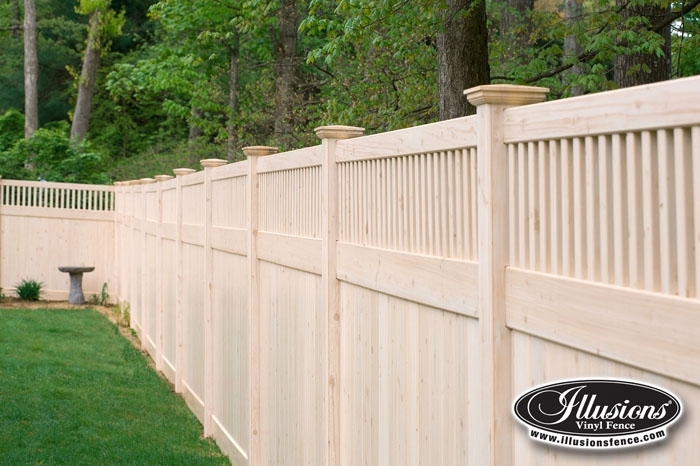 The Classic Series represents your standard white, gray, and beige PVC low maintenance vinyl fence. 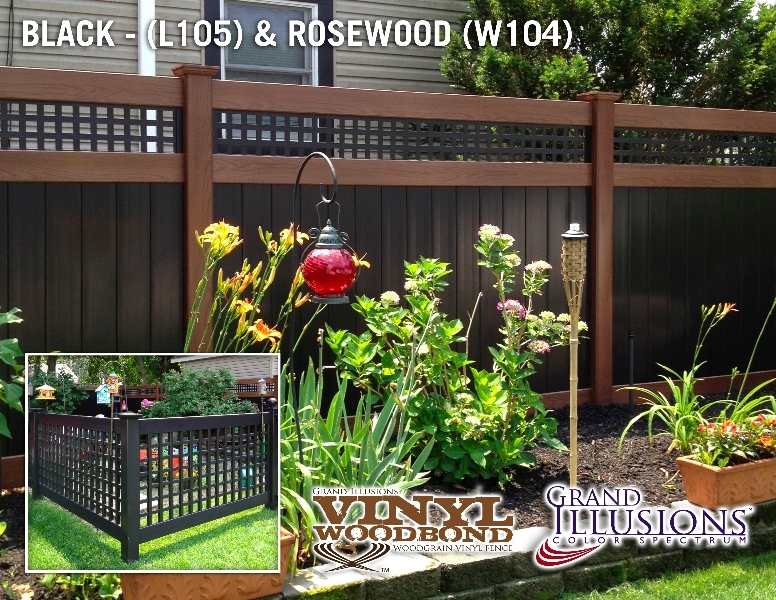 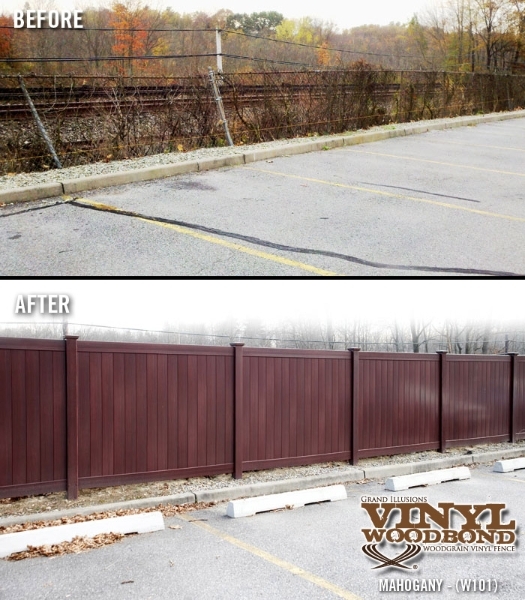 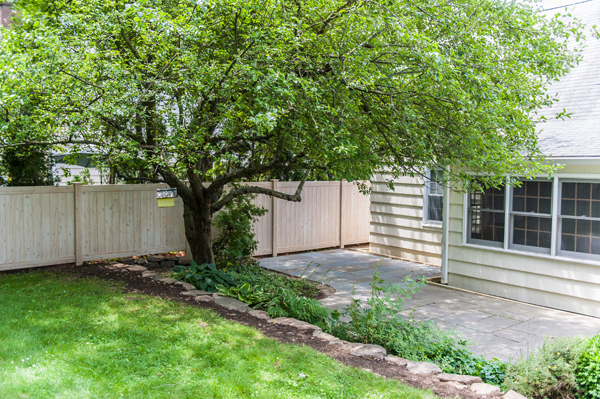 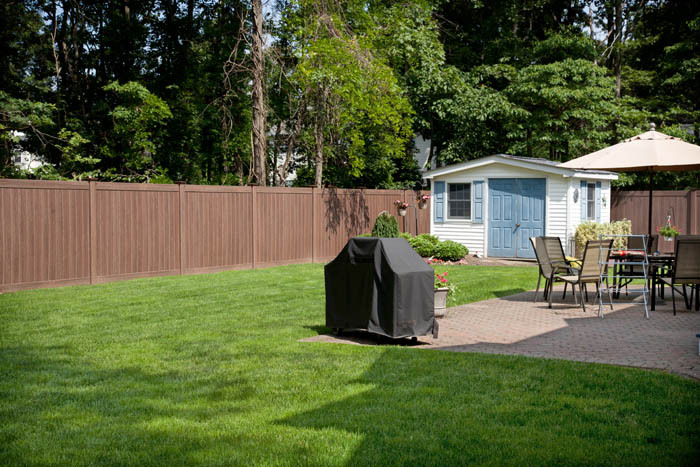 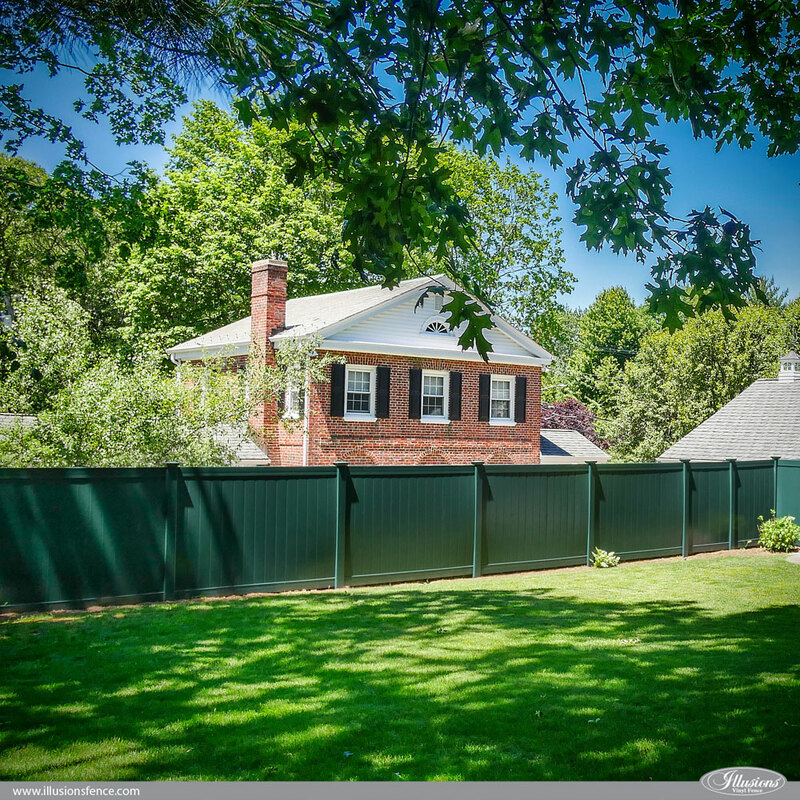 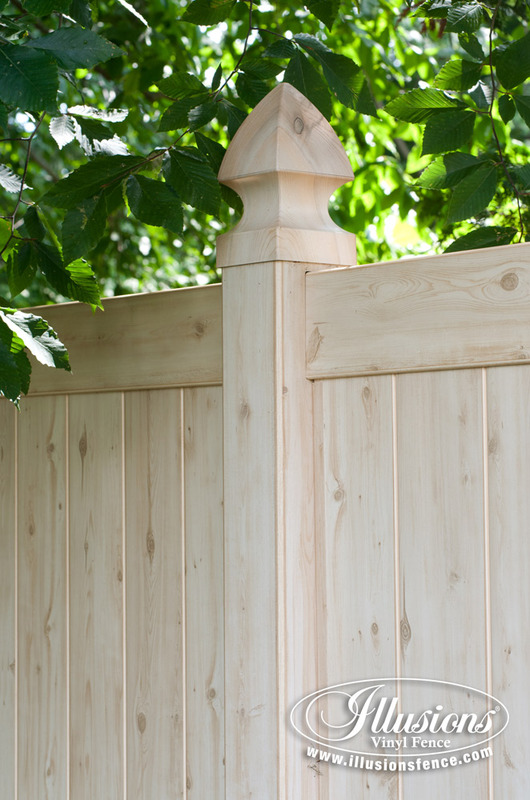 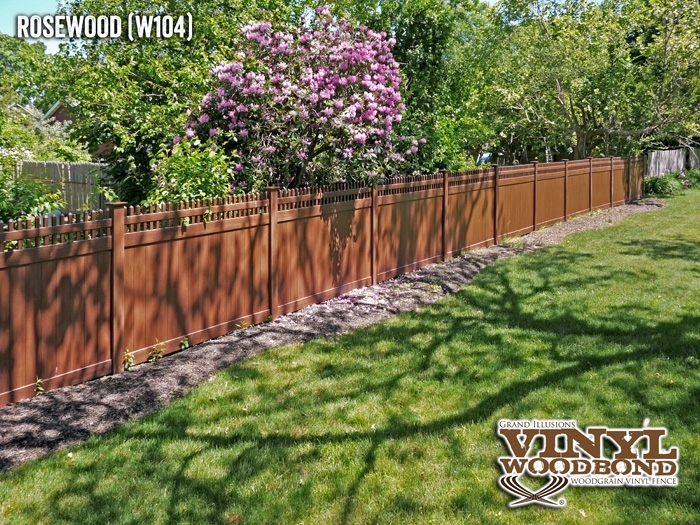 Yes, there is a gloss to it, but anyone looking to purchase classic vinyl fence knows that. 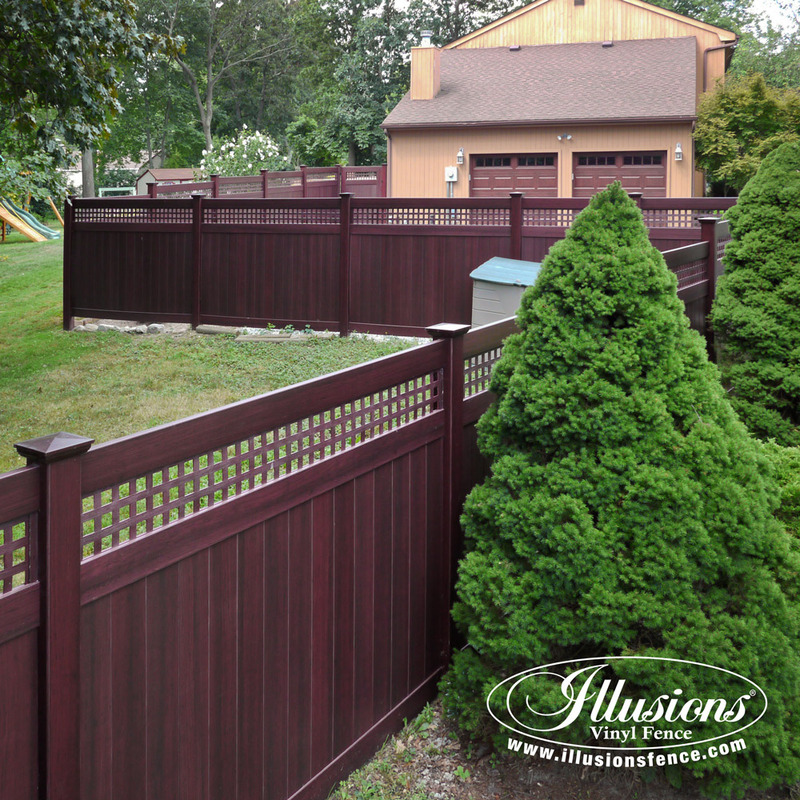 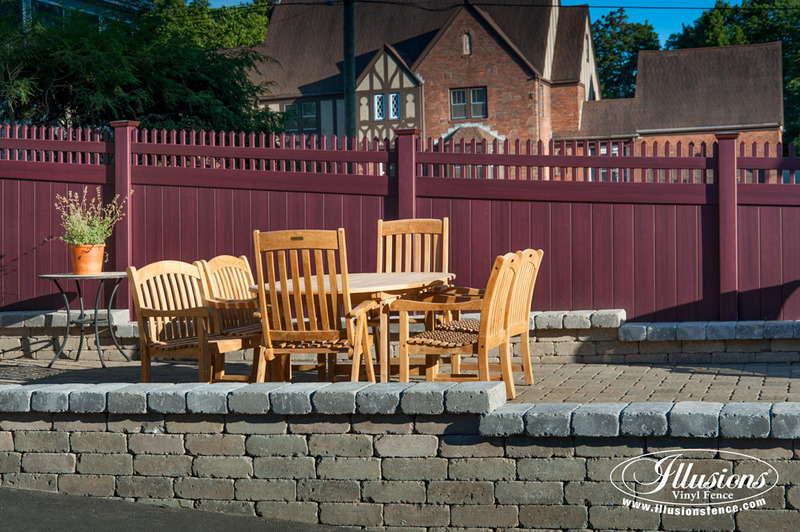 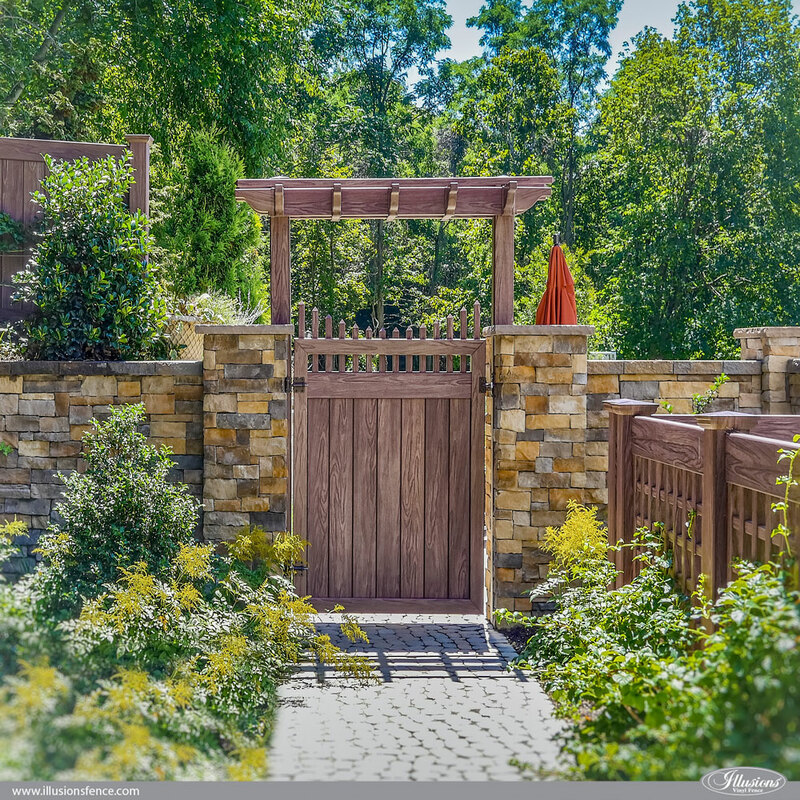 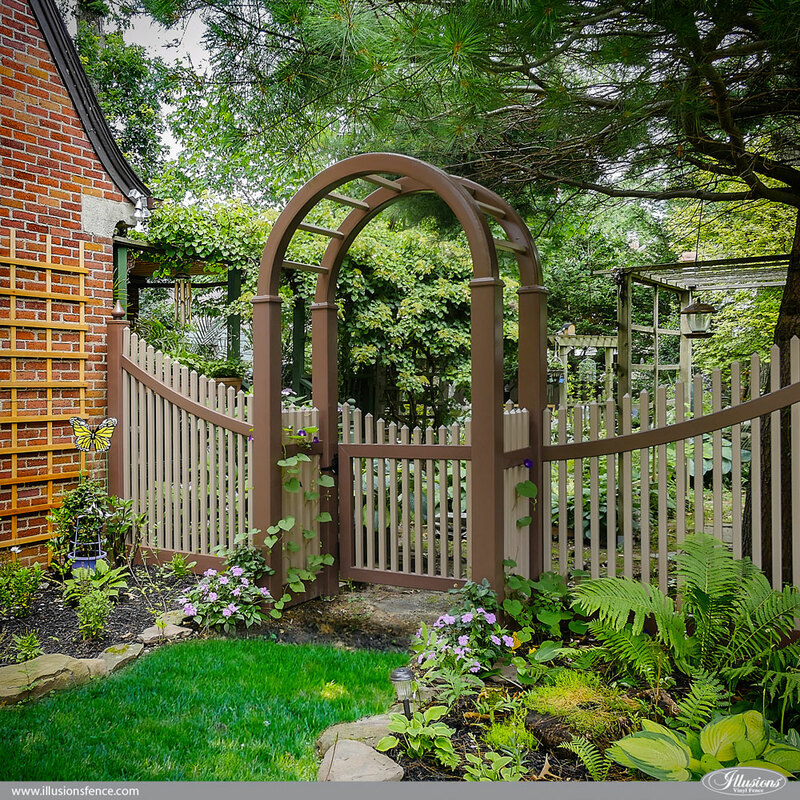 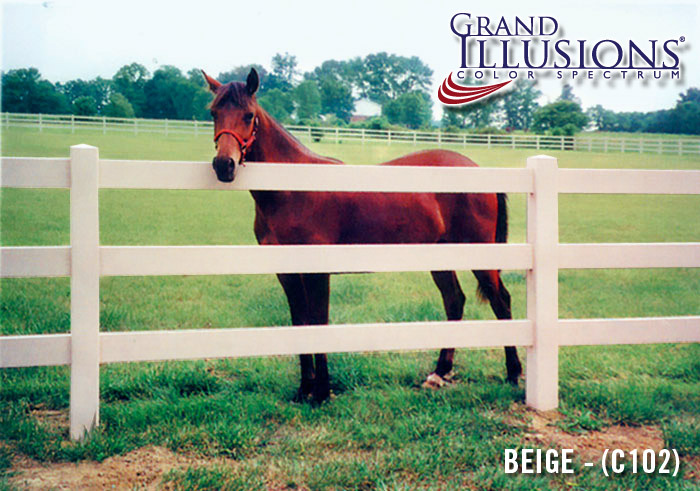 This fence is the bread and butter of the fence industry and Illusions is one of the best at it!